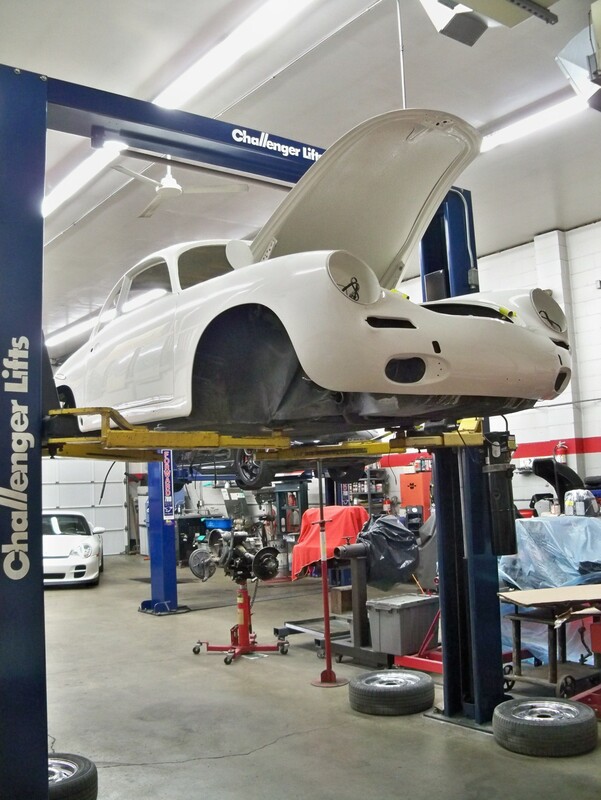 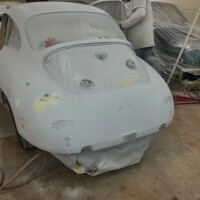 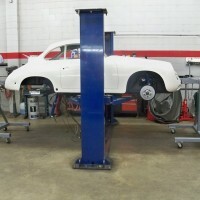 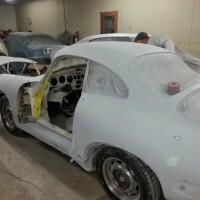 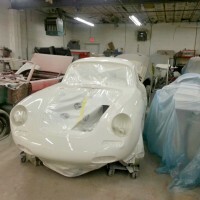 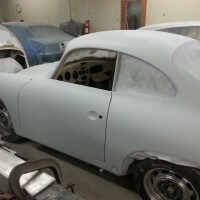 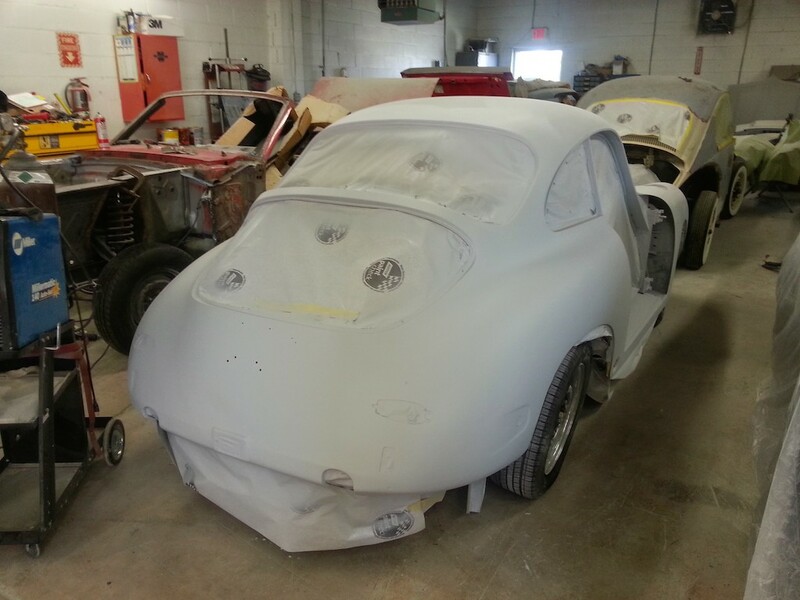 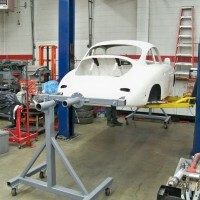 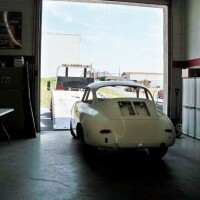 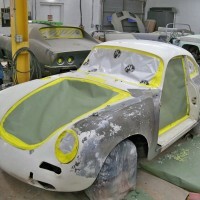 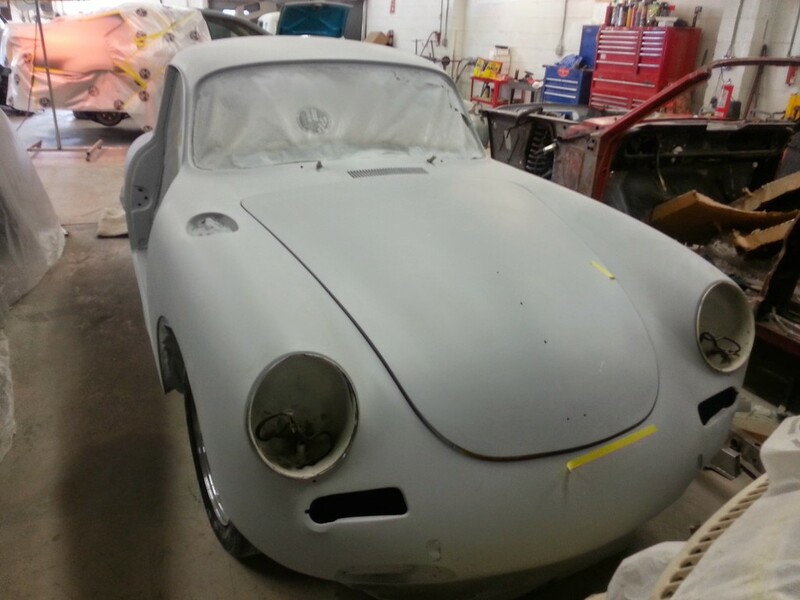 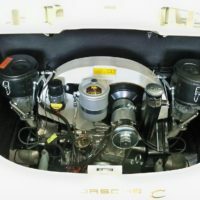 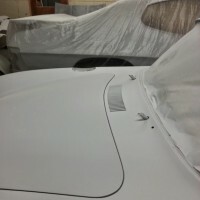 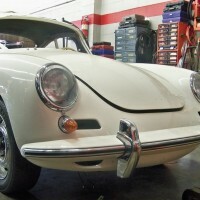 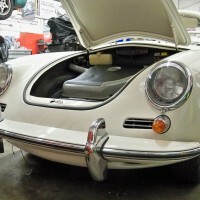 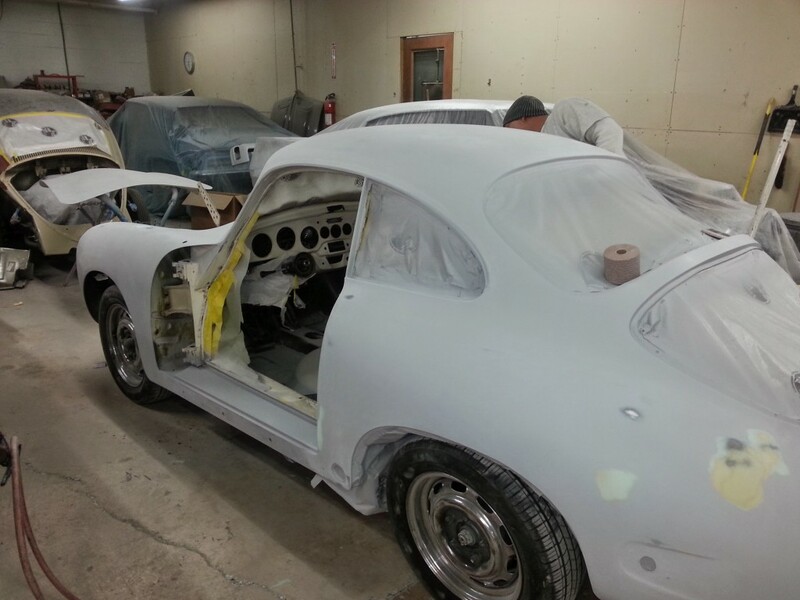 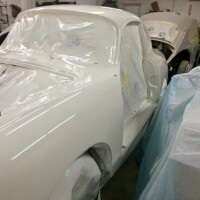 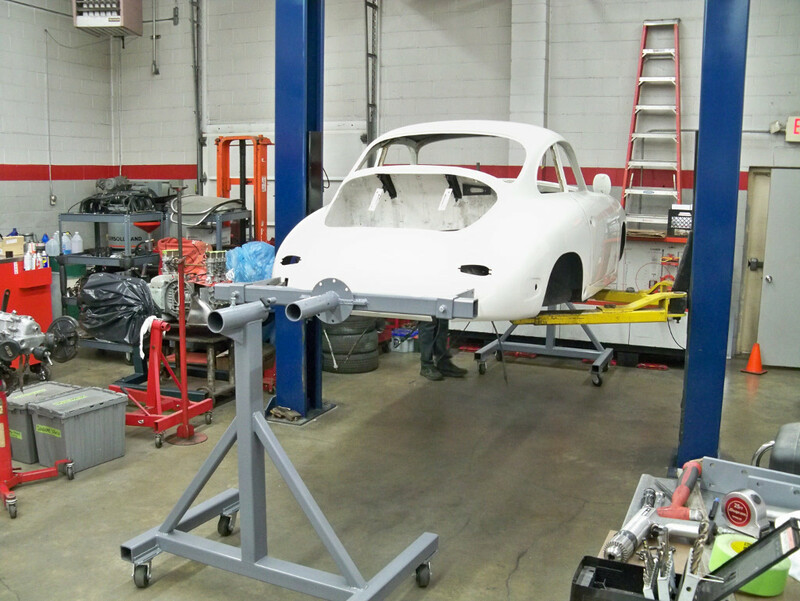 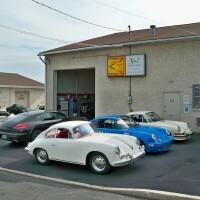 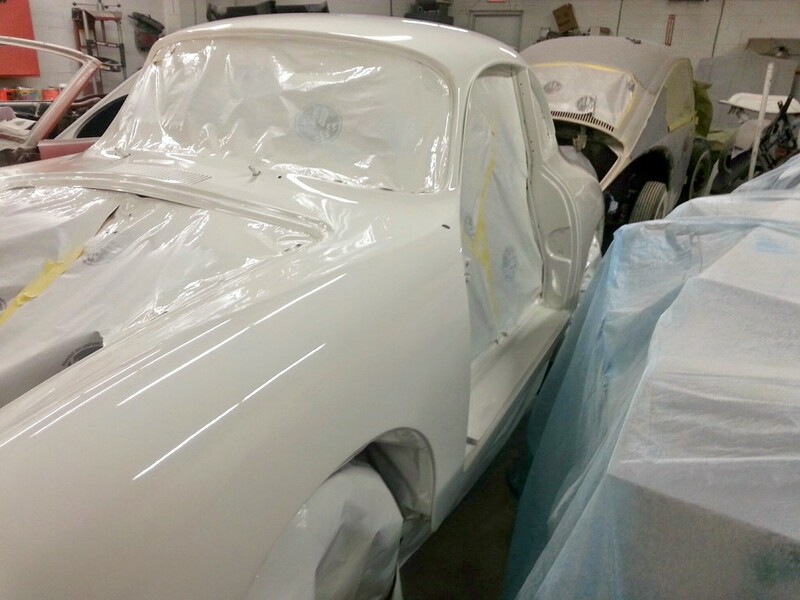 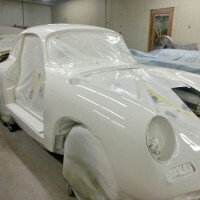 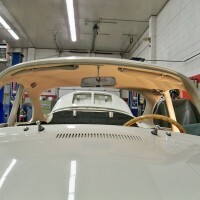 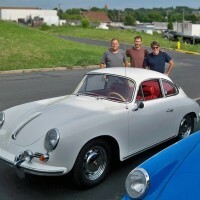 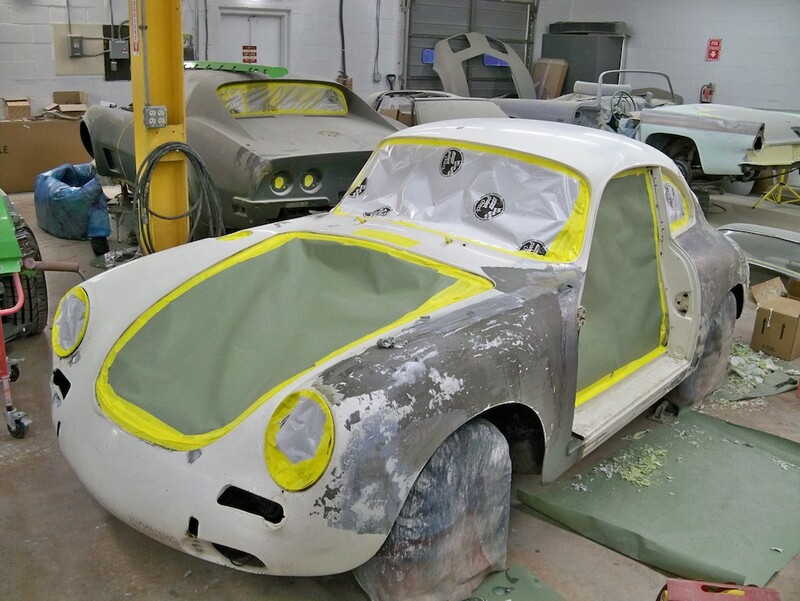 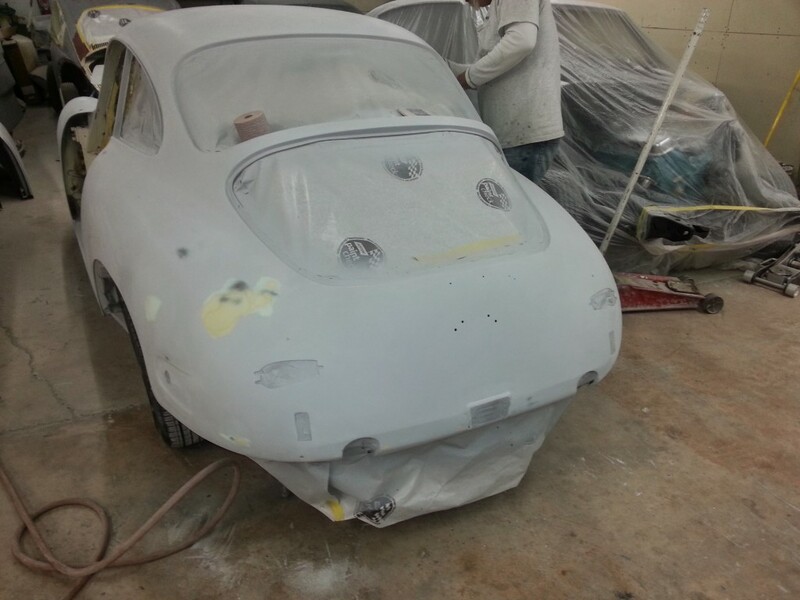 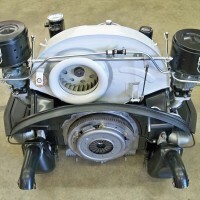 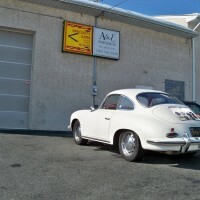 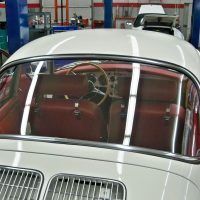 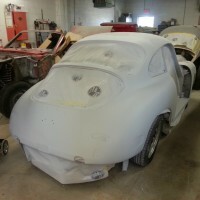 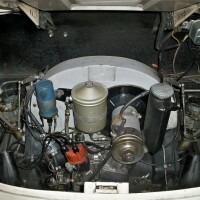 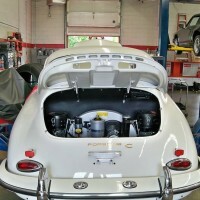 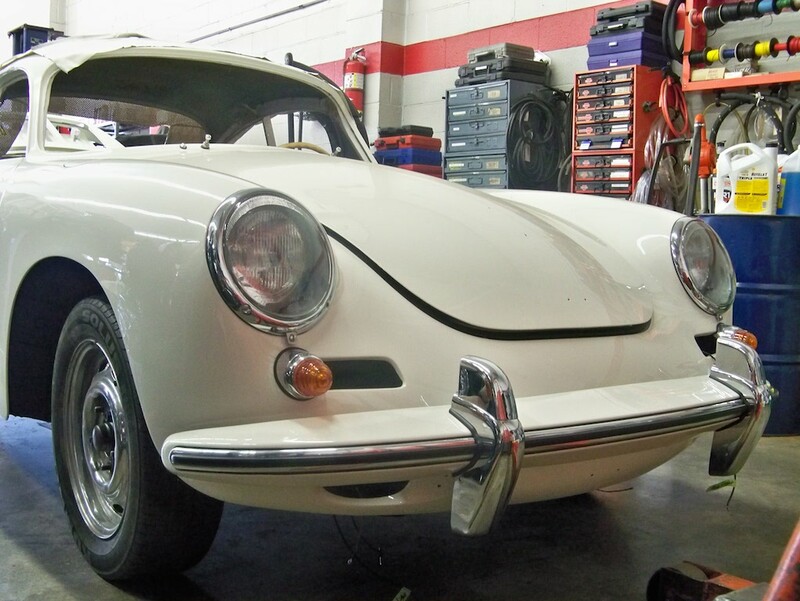 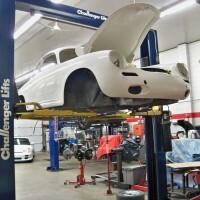 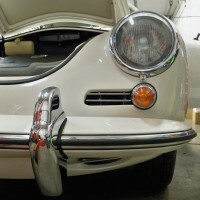 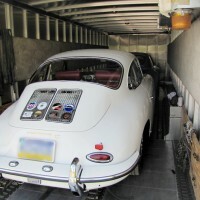 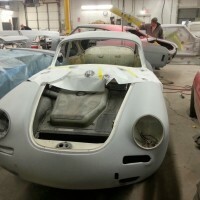 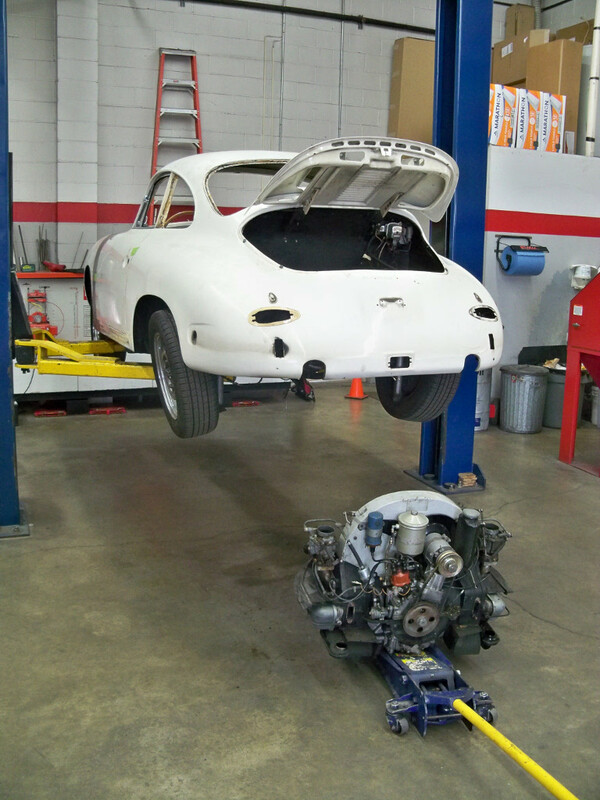 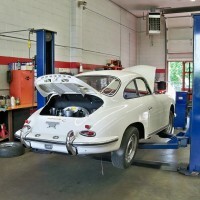 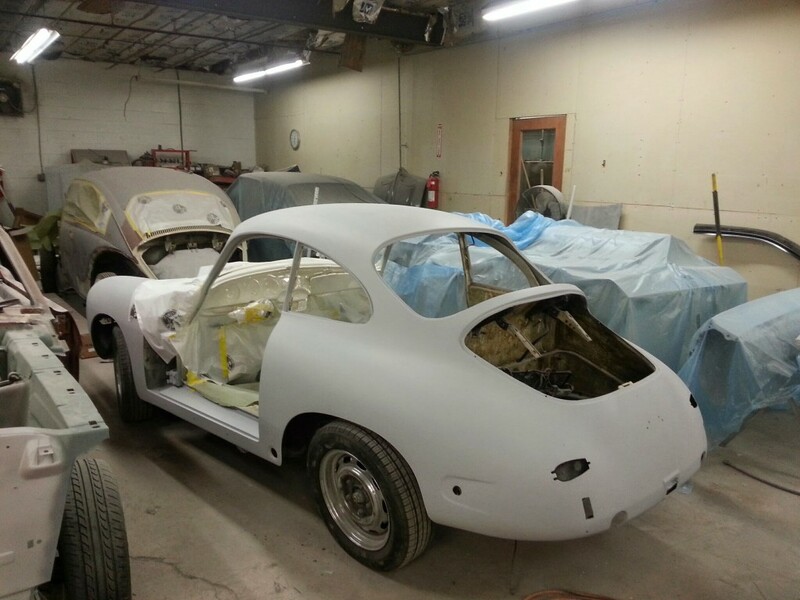 1964 356C Coupe Restoration » Specialty Cars Service Center, Inc. 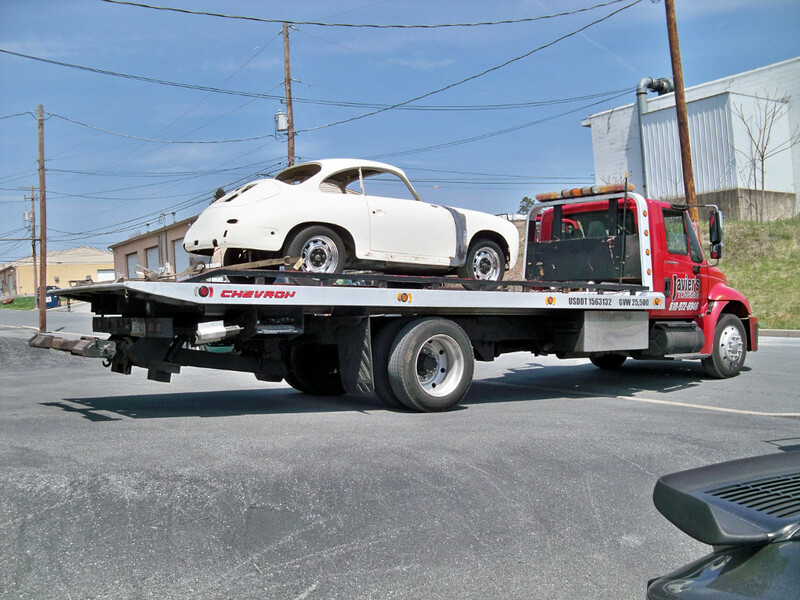 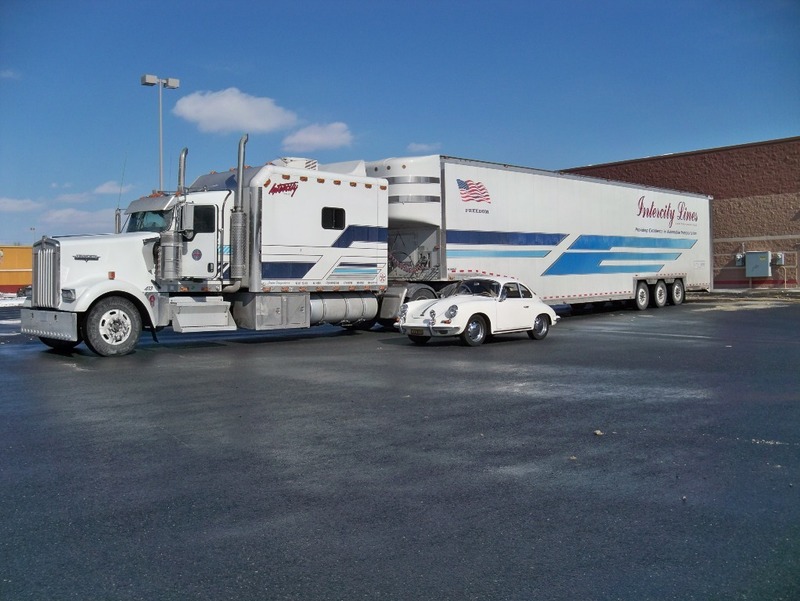 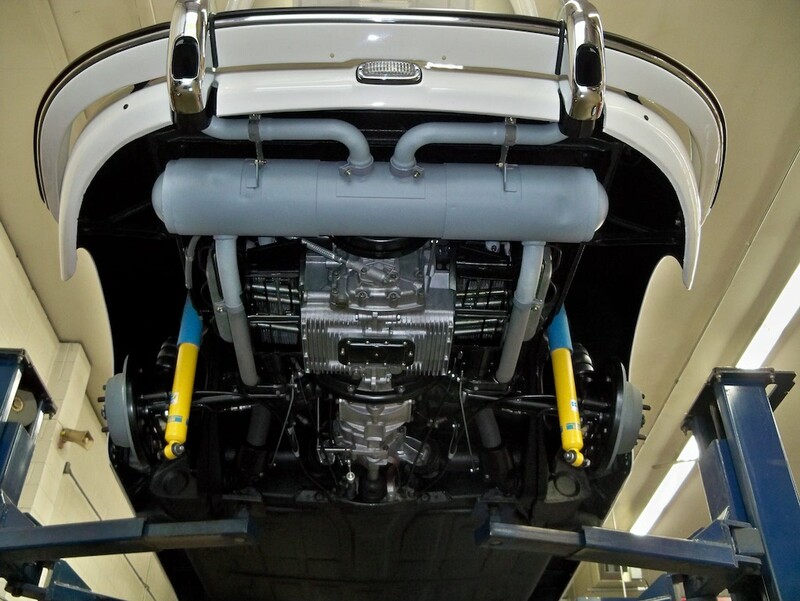 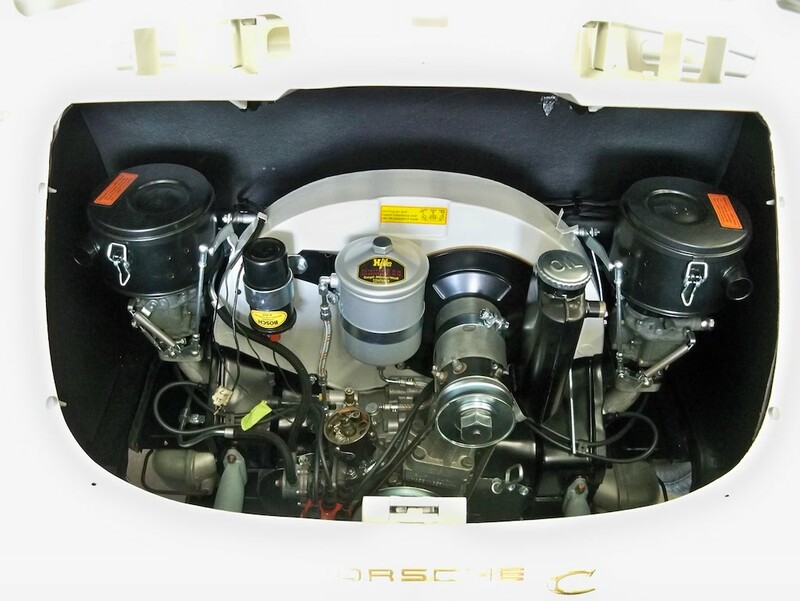 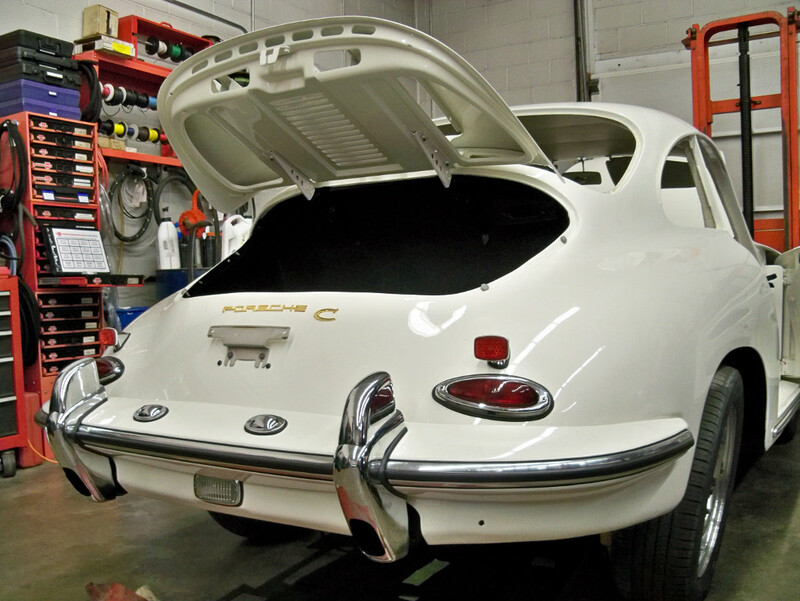 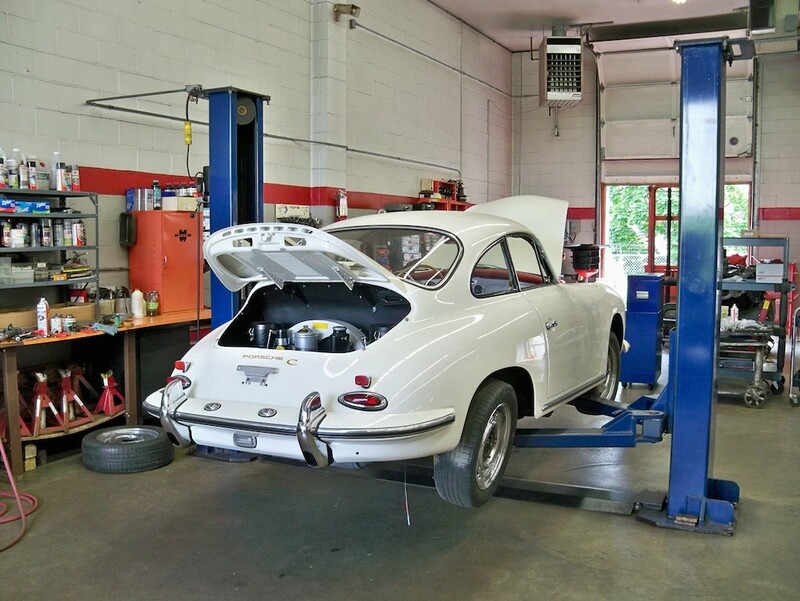 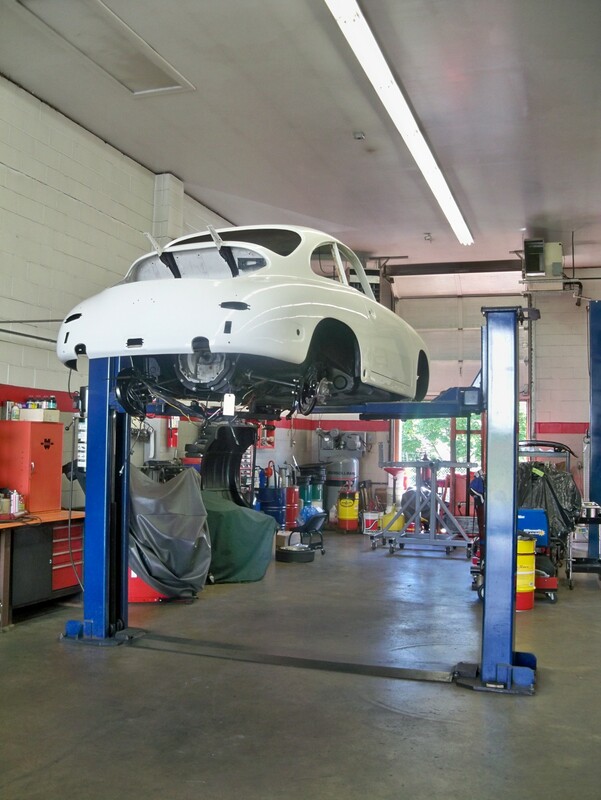 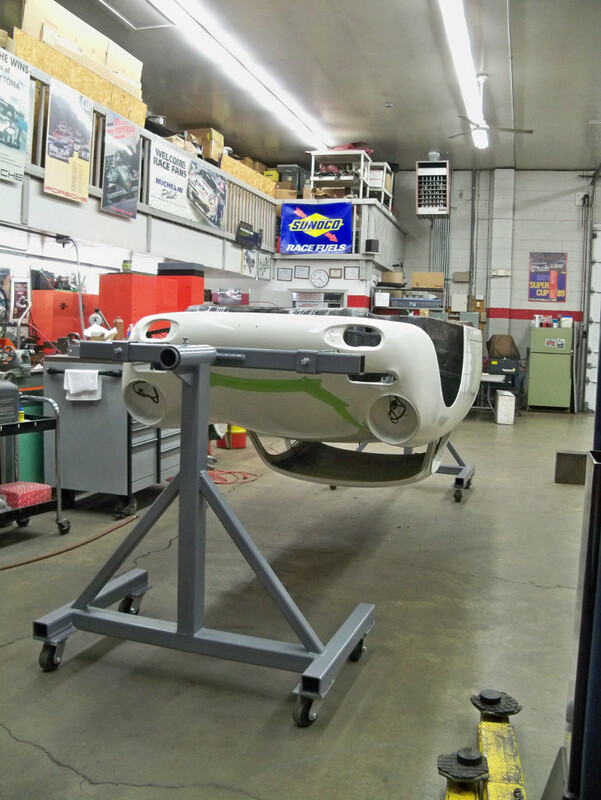 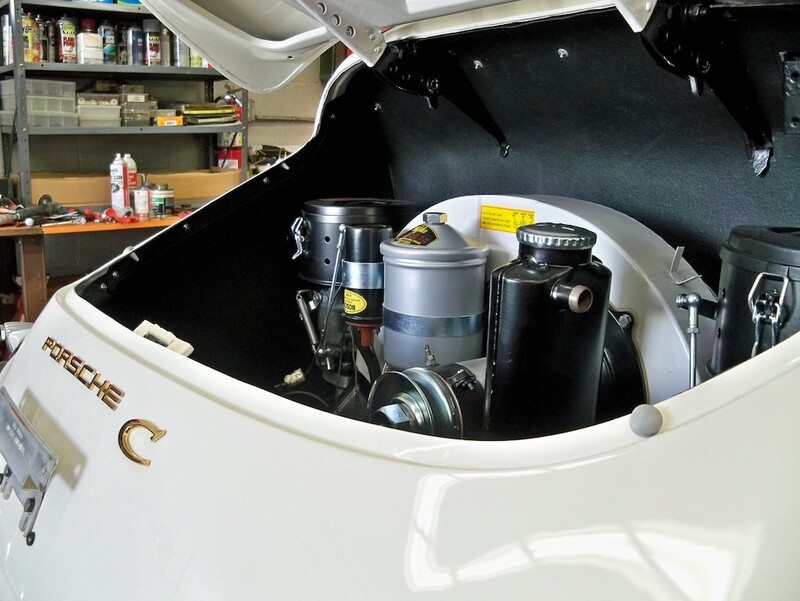 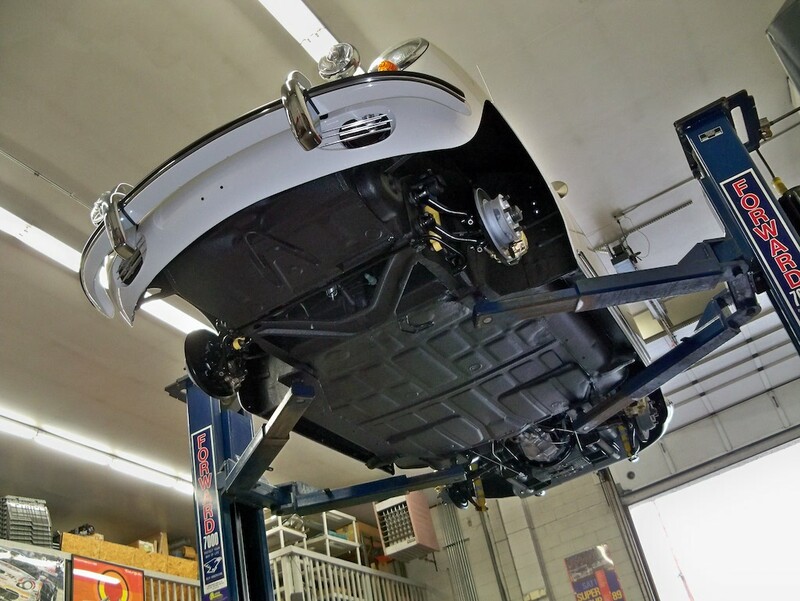 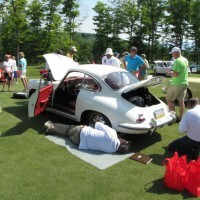 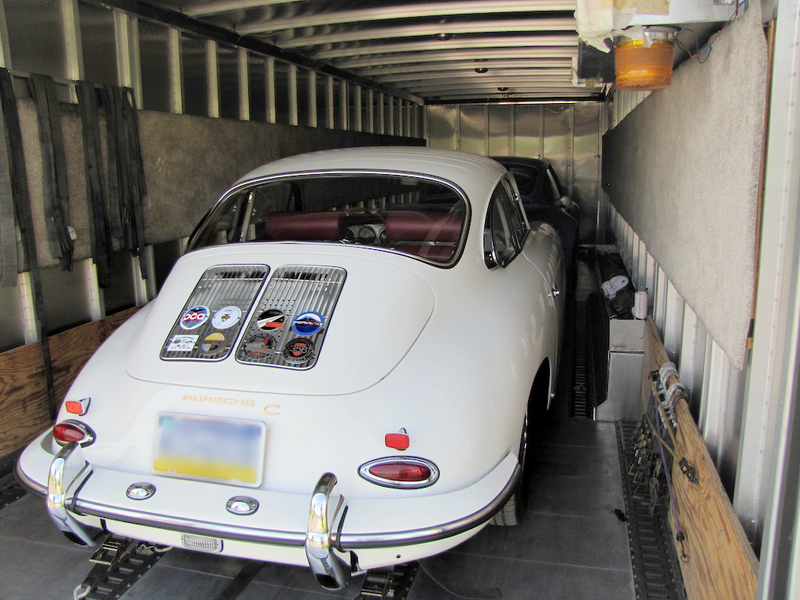 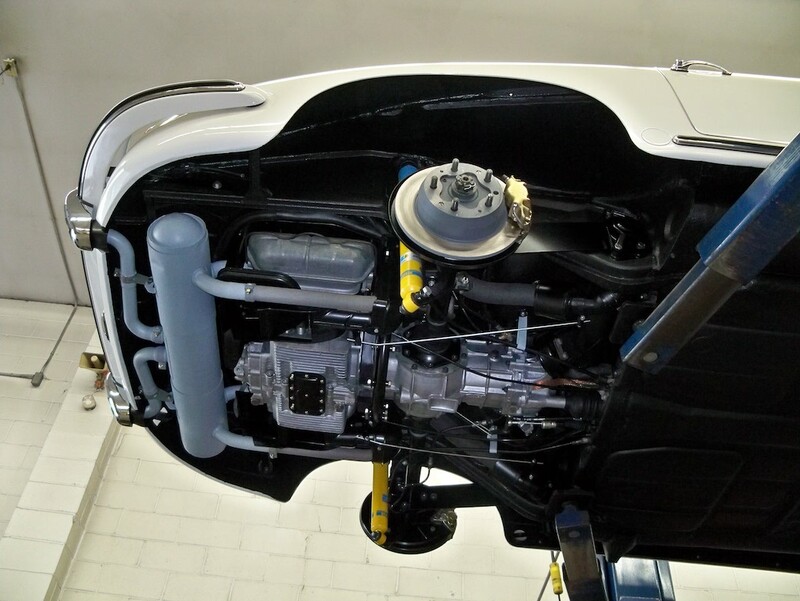 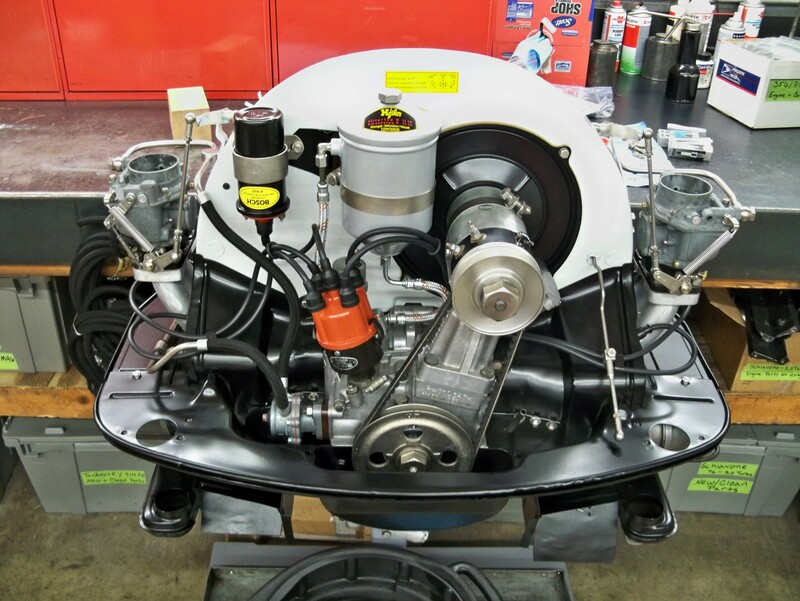 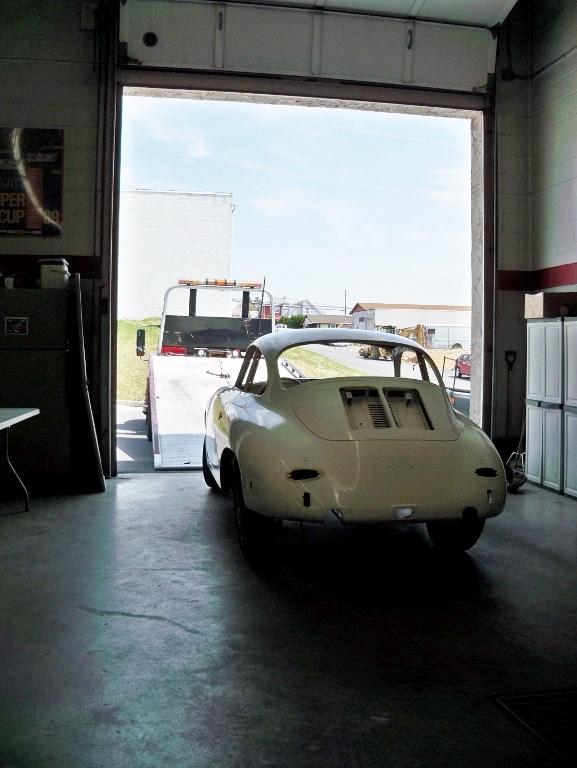 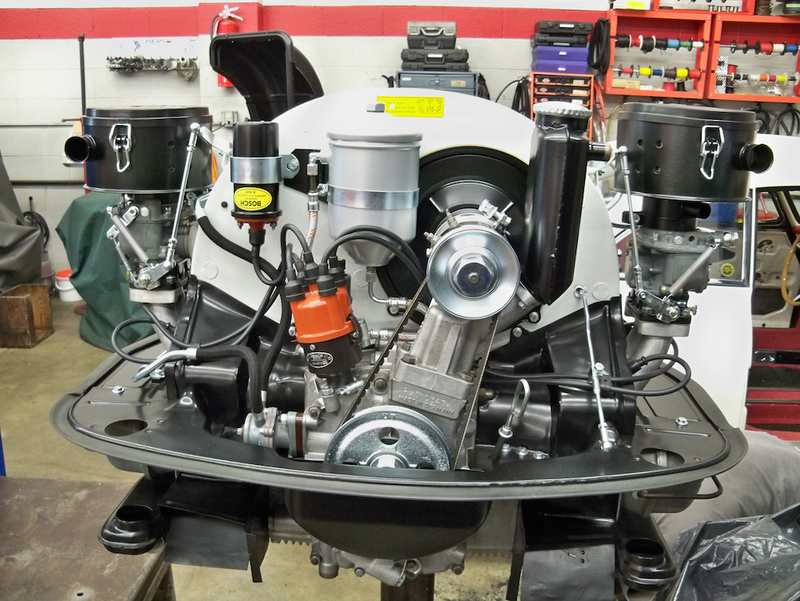 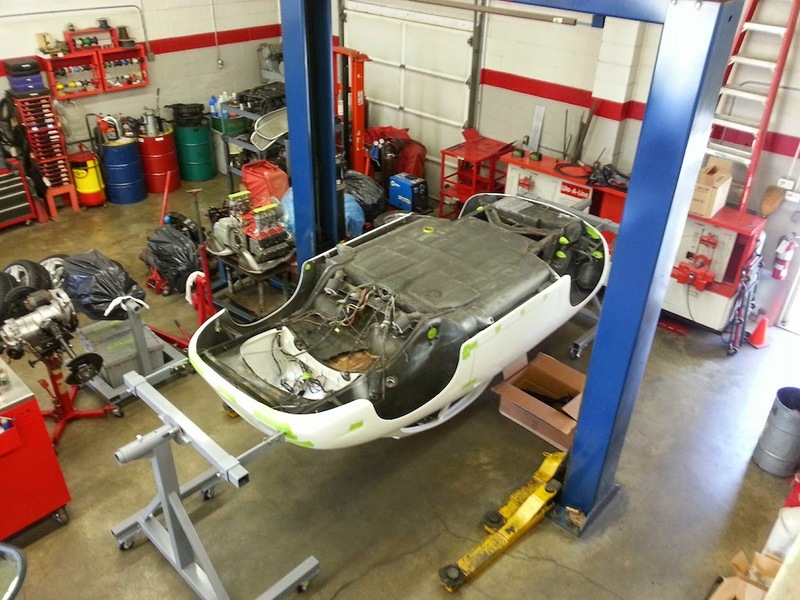 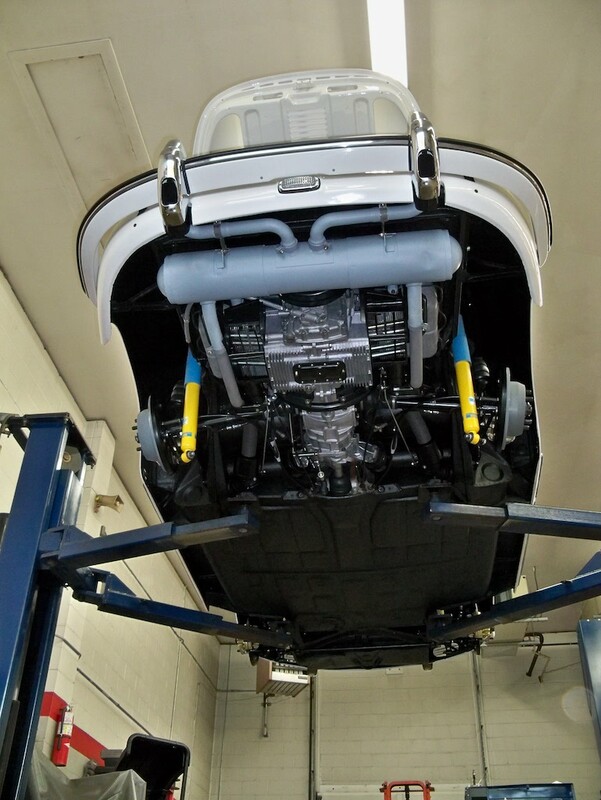 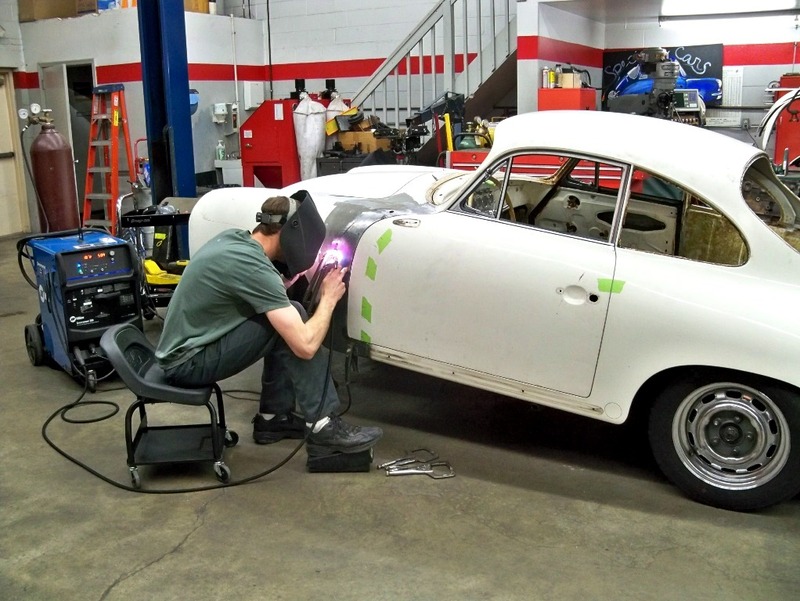 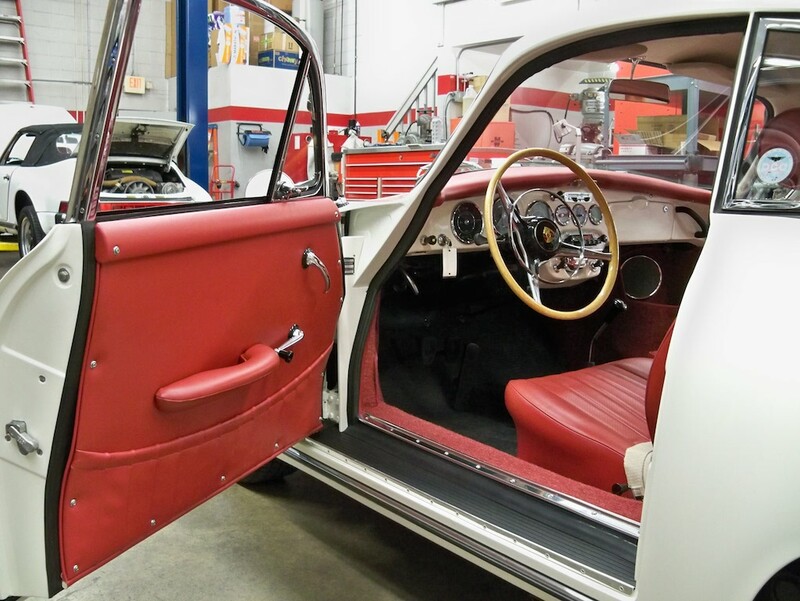 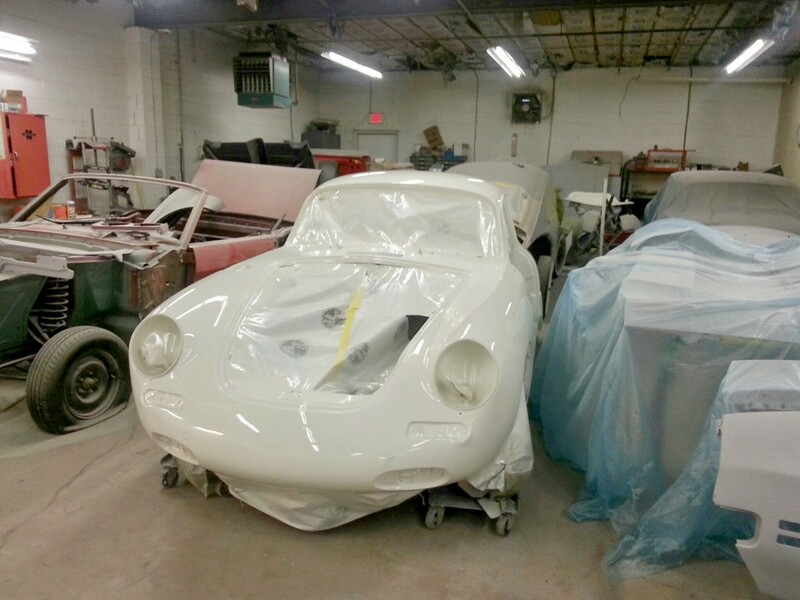 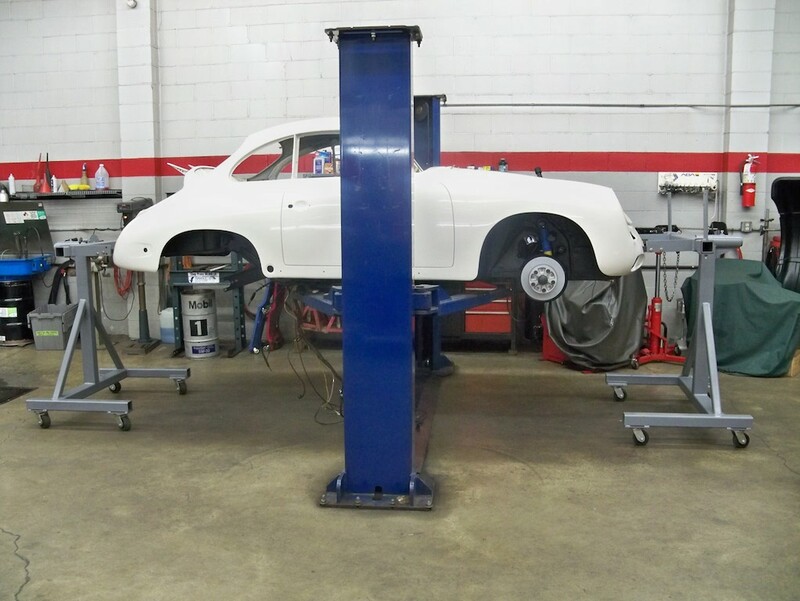 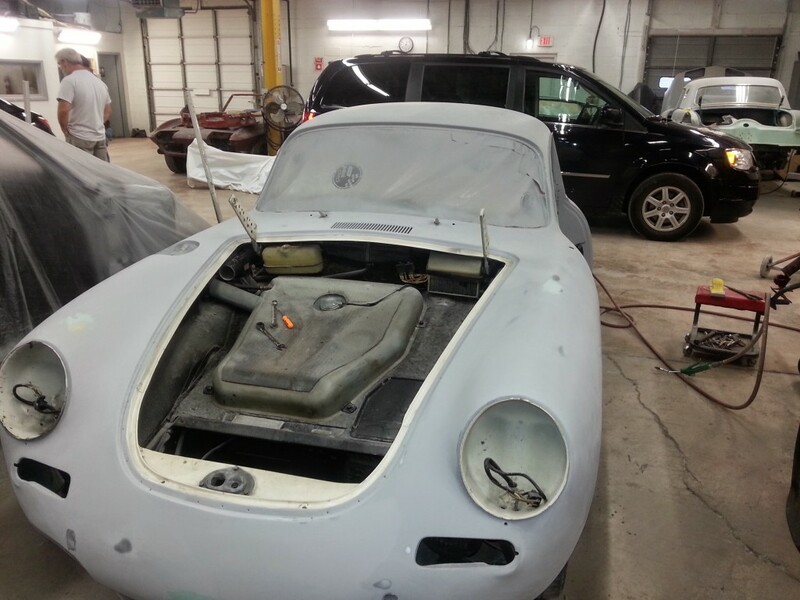 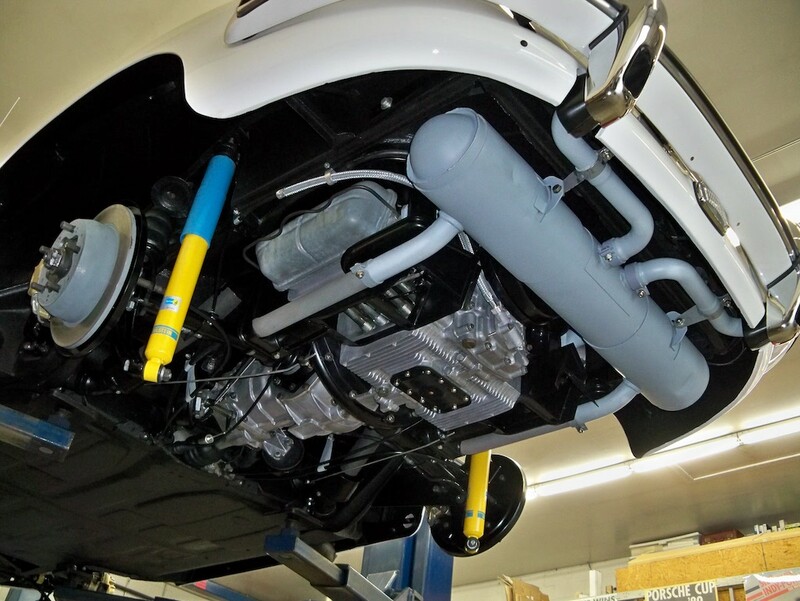 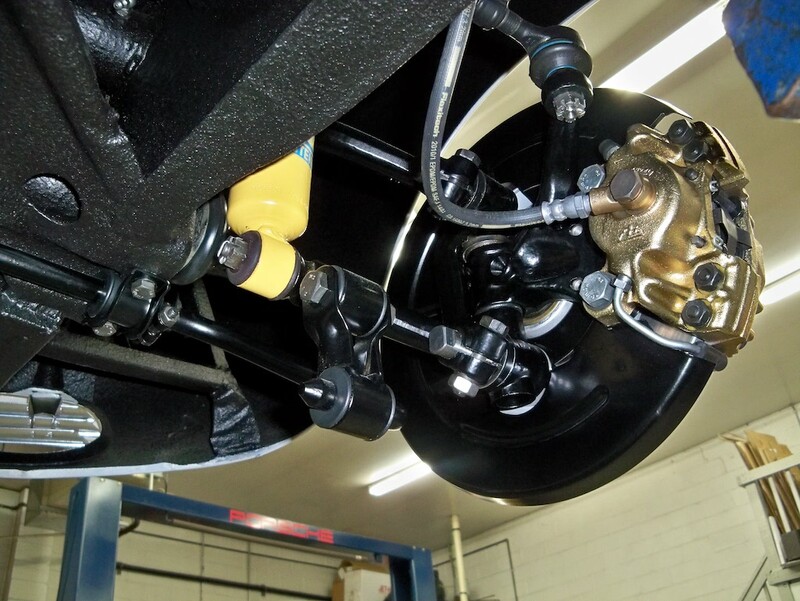 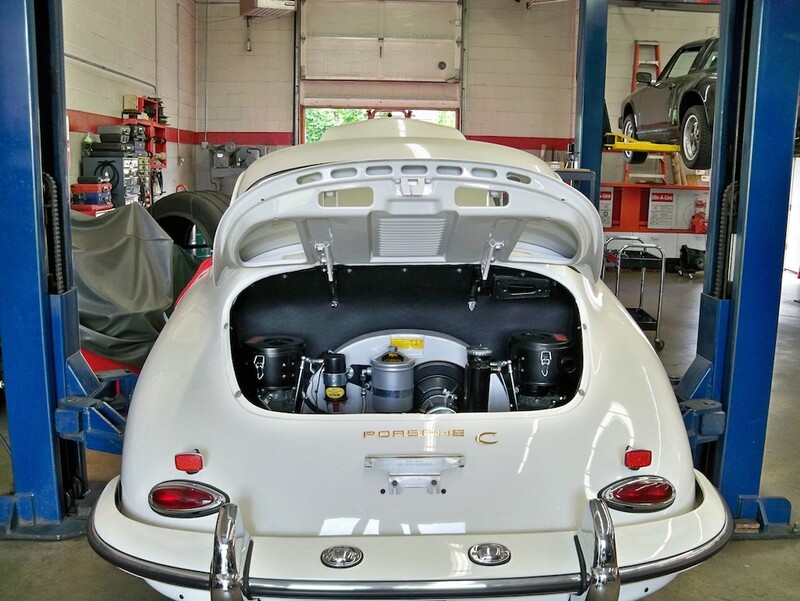 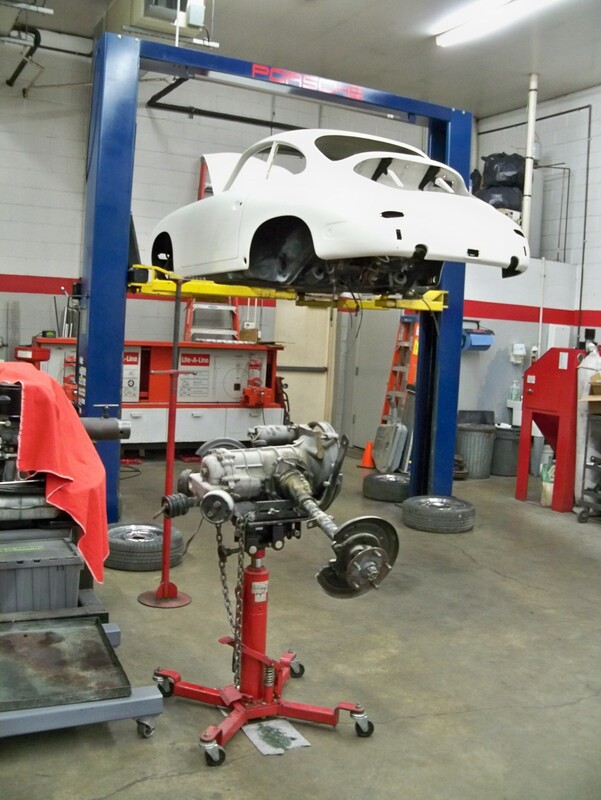 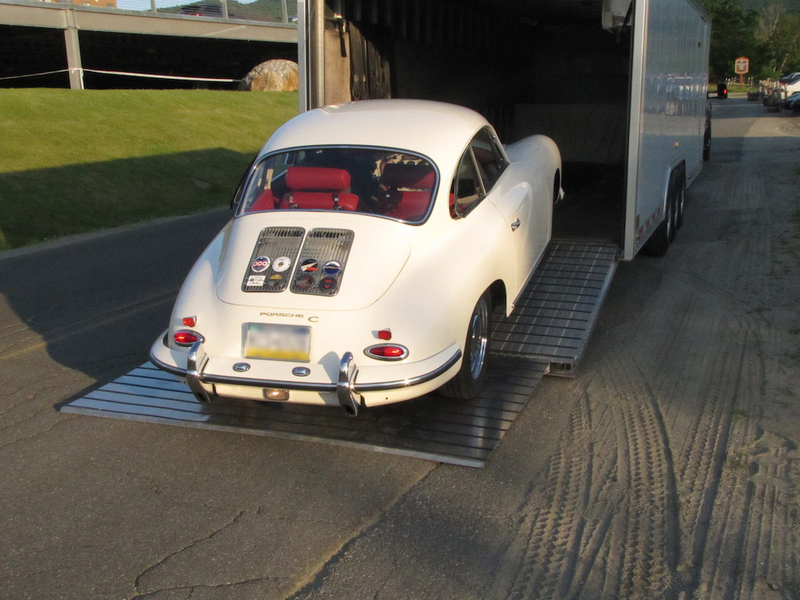 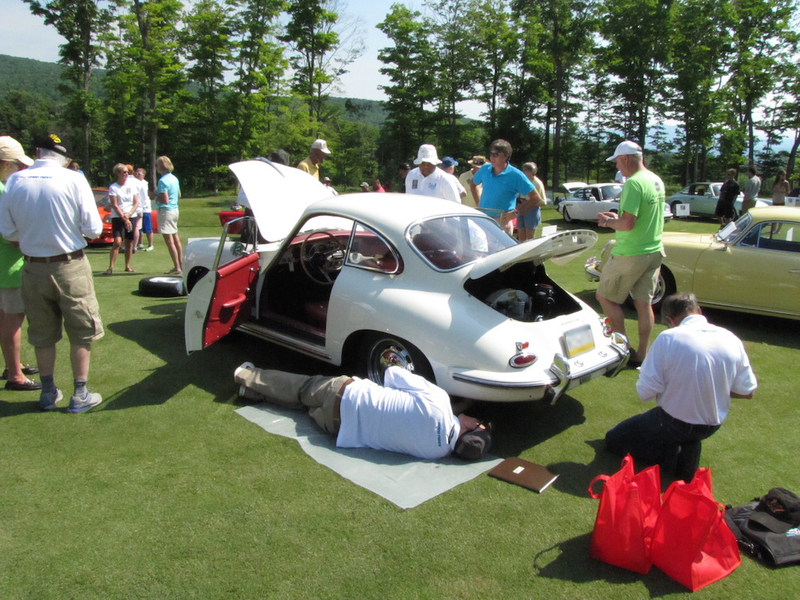 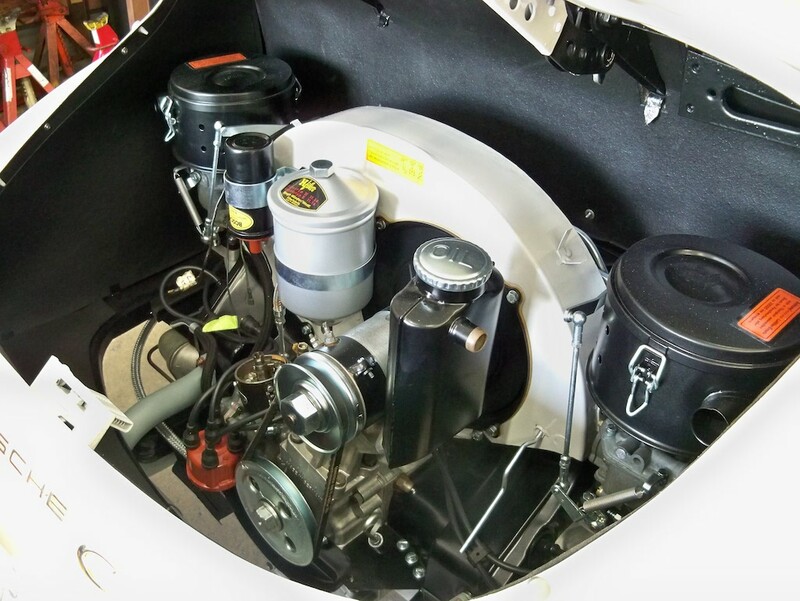 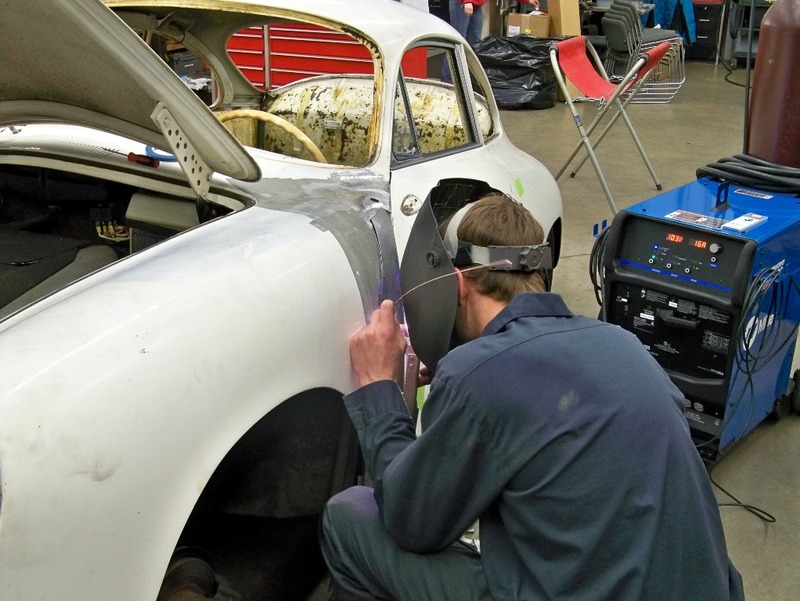 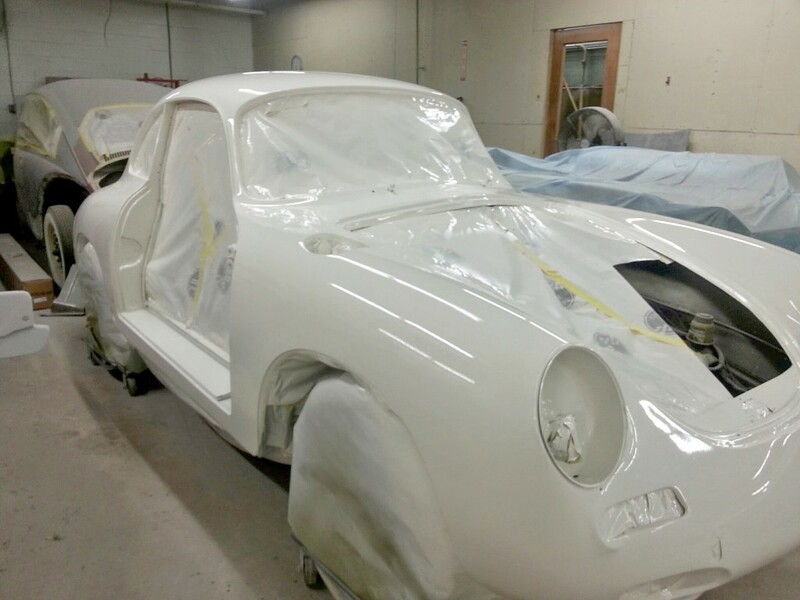 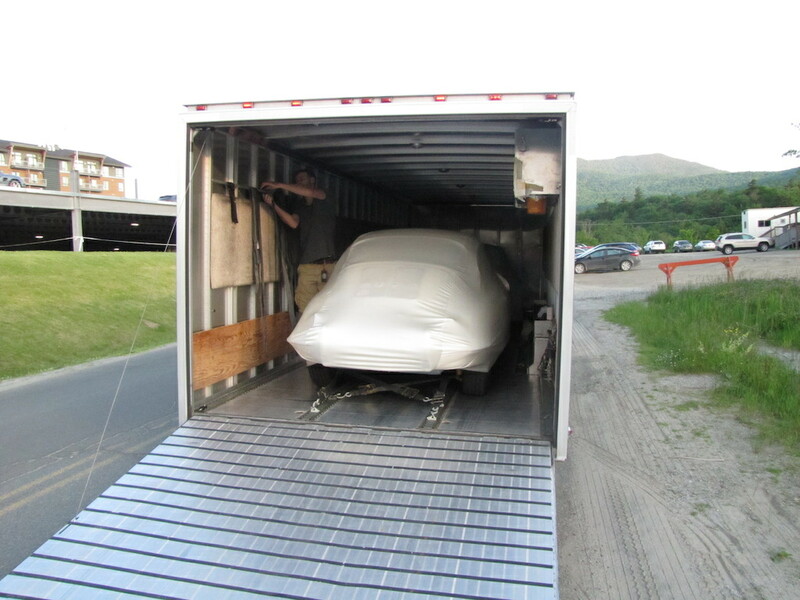 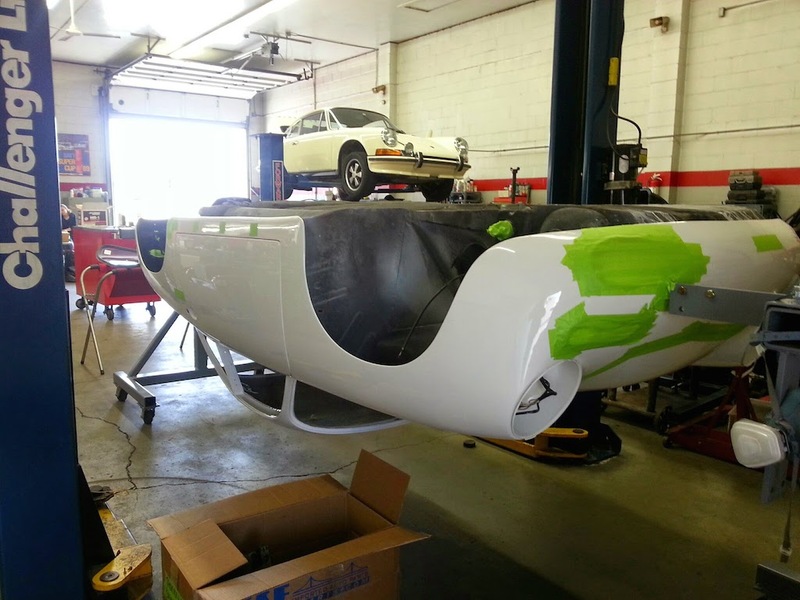 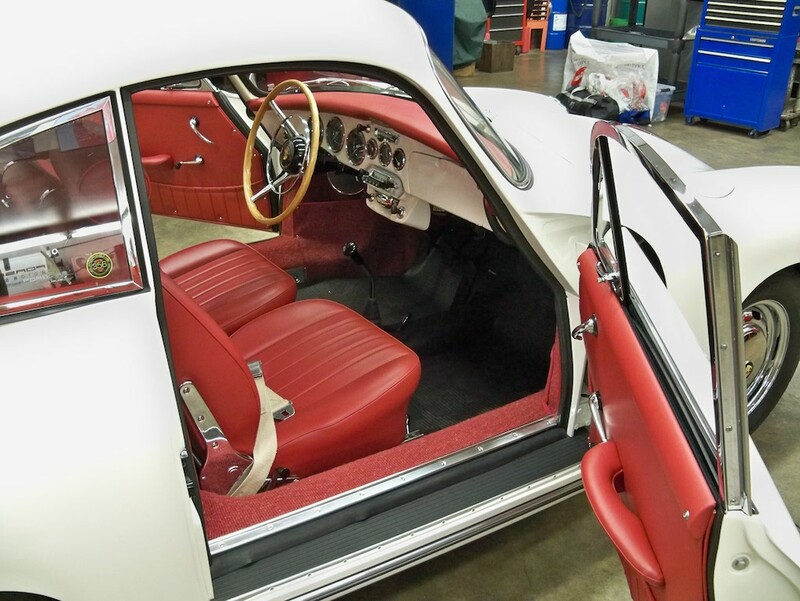 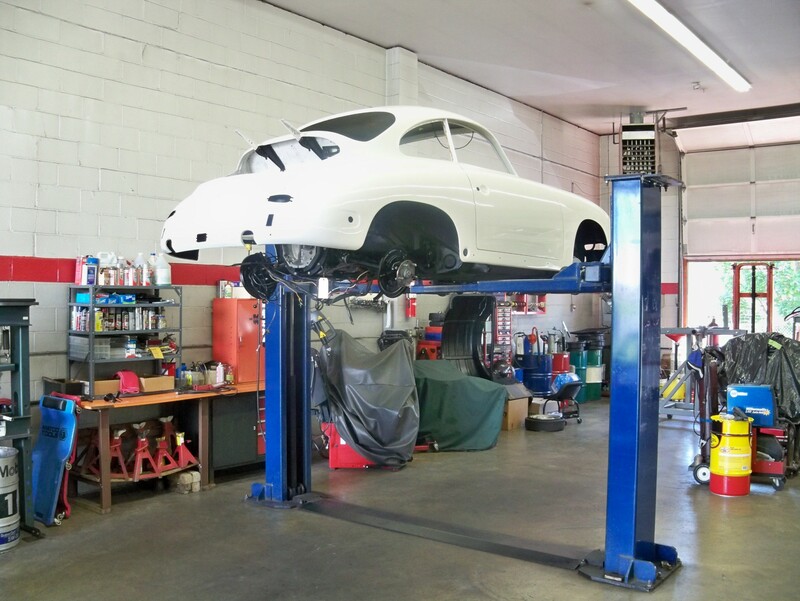 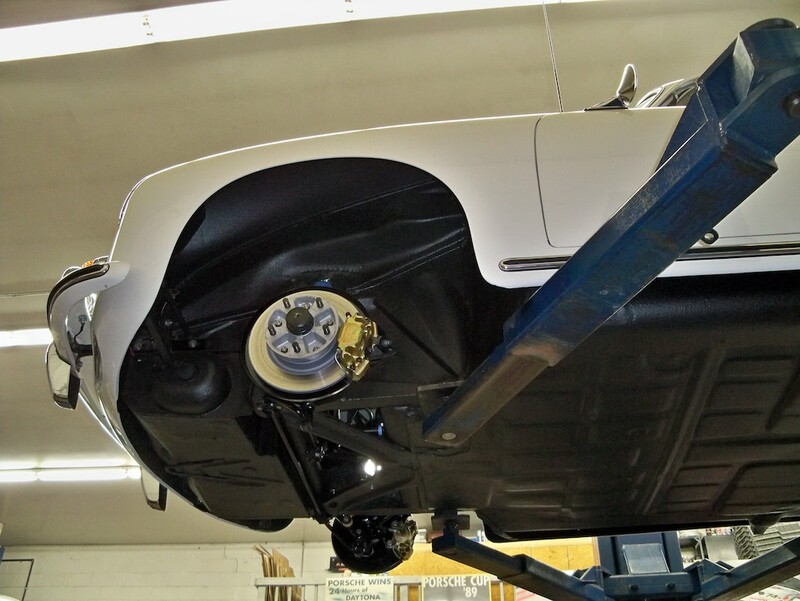 Specialty Cars went to North Carolina to perform a Pre-Purchase Inspection on this 1964 356C Coupe in early 2014. 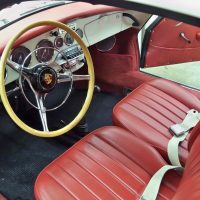 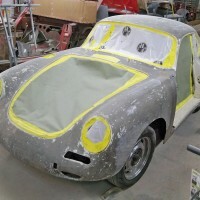 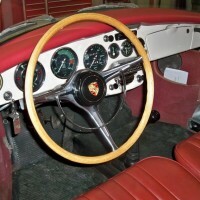 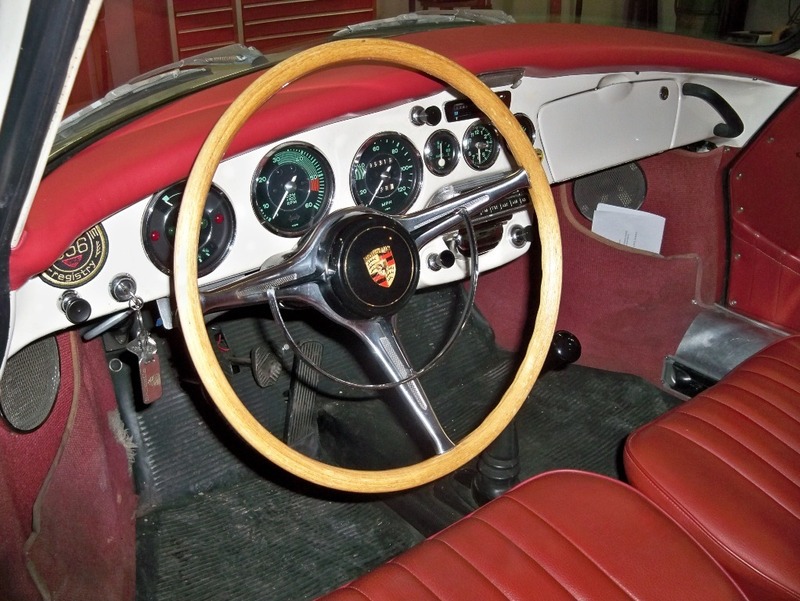 At the time of the pre-purchase, this 356 was a two-owner car; complete, original and unrestored with about 40% of its original paint and 395,320 original miles. 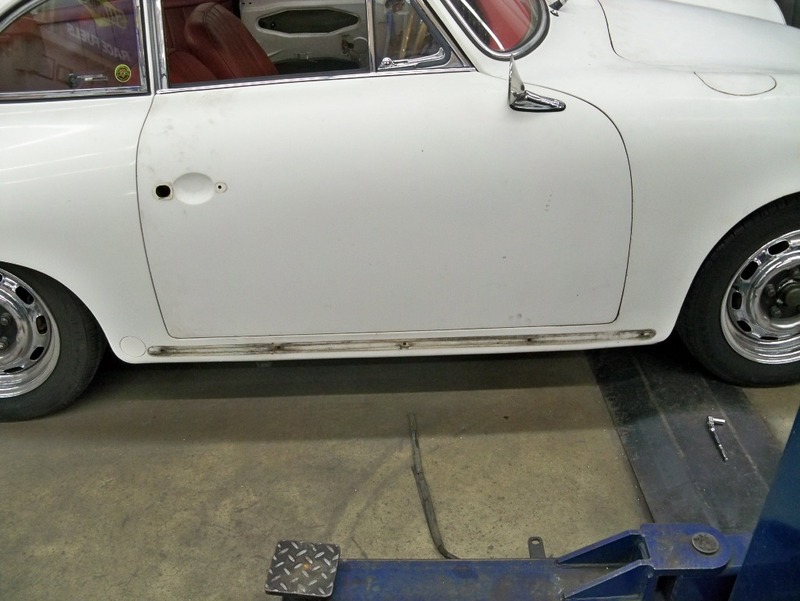 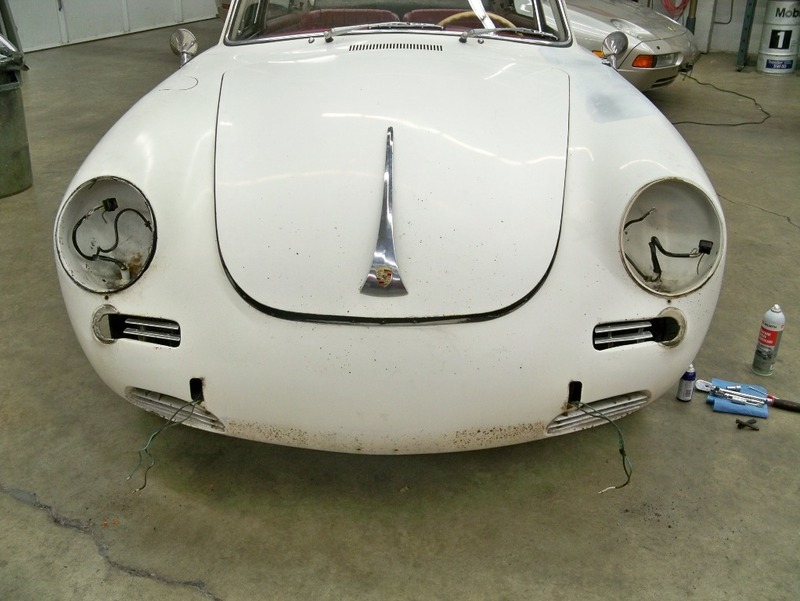 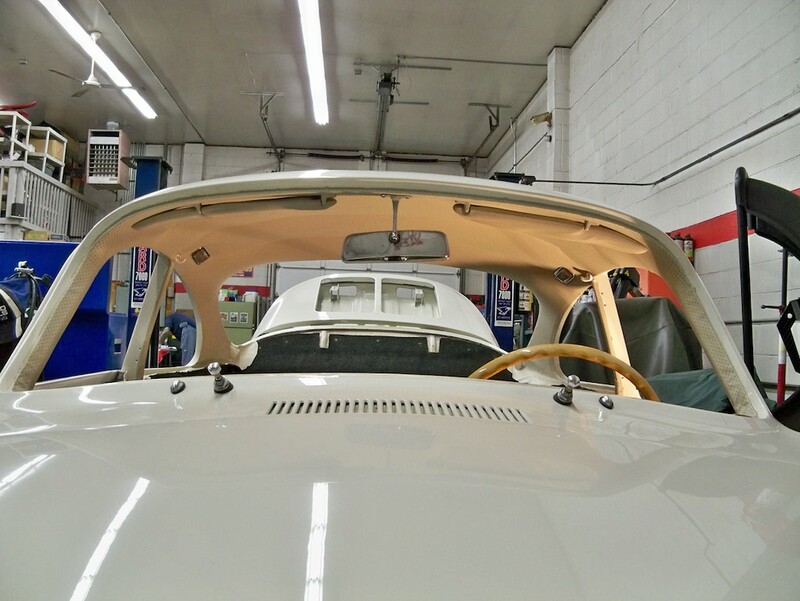 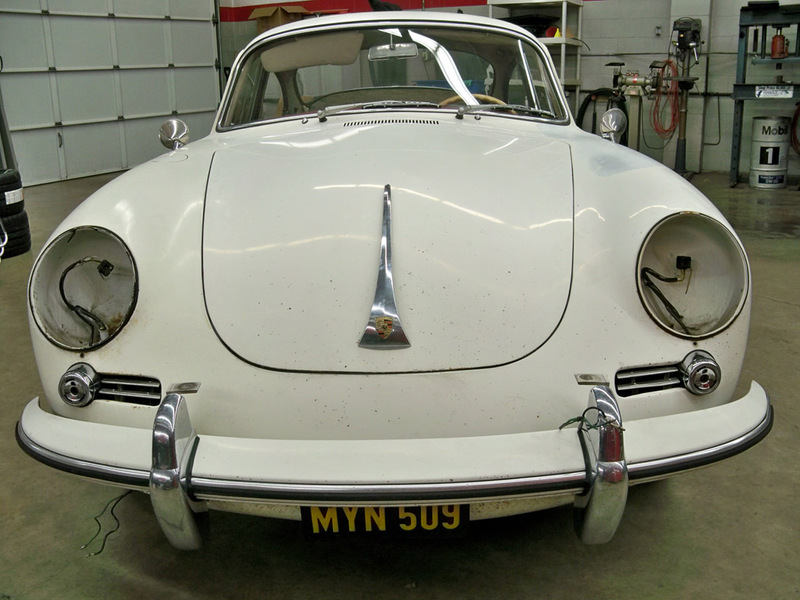 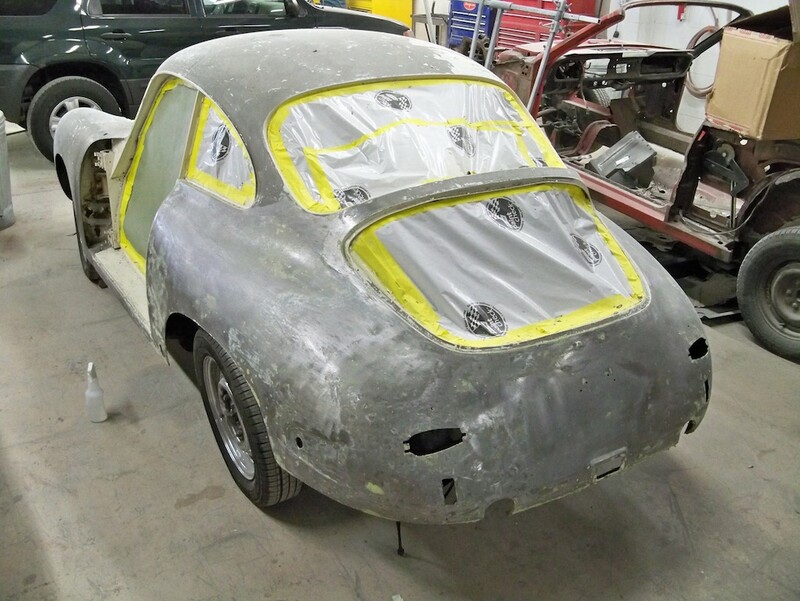 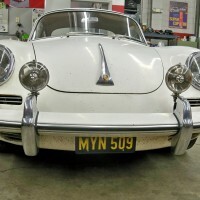 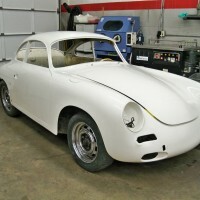 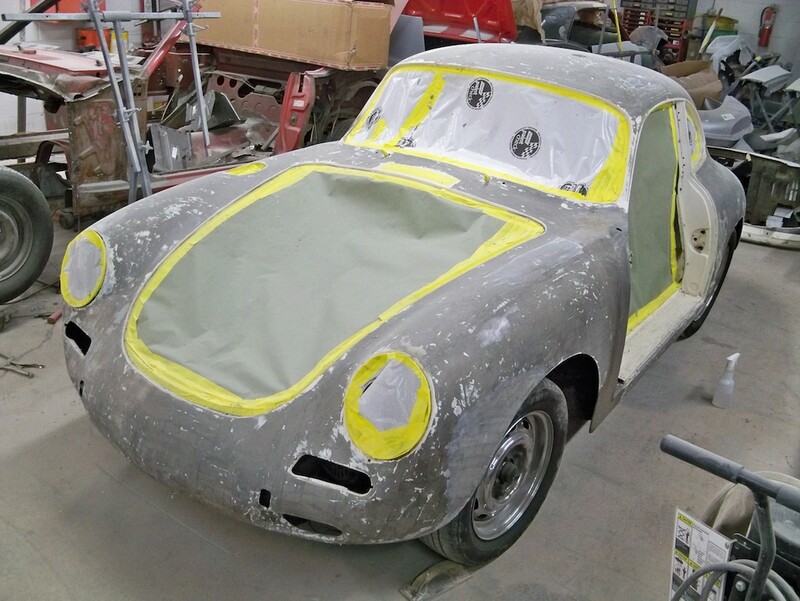 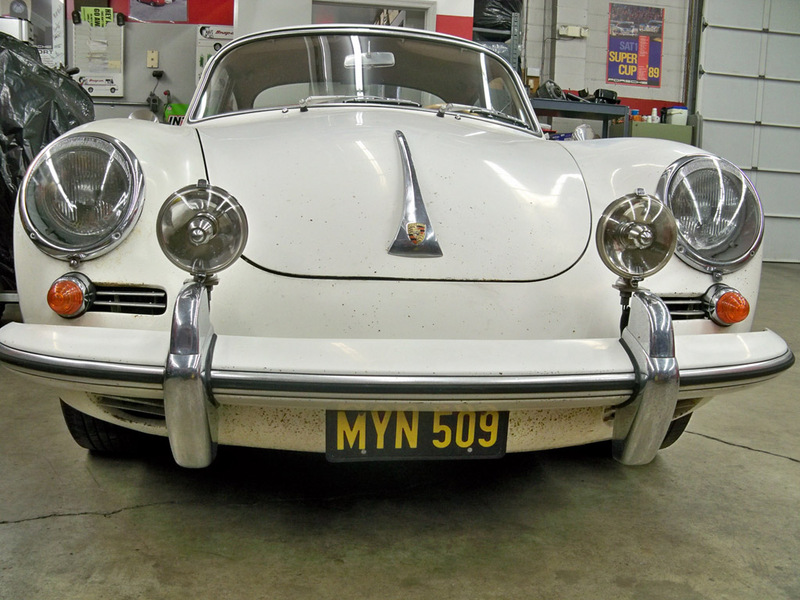 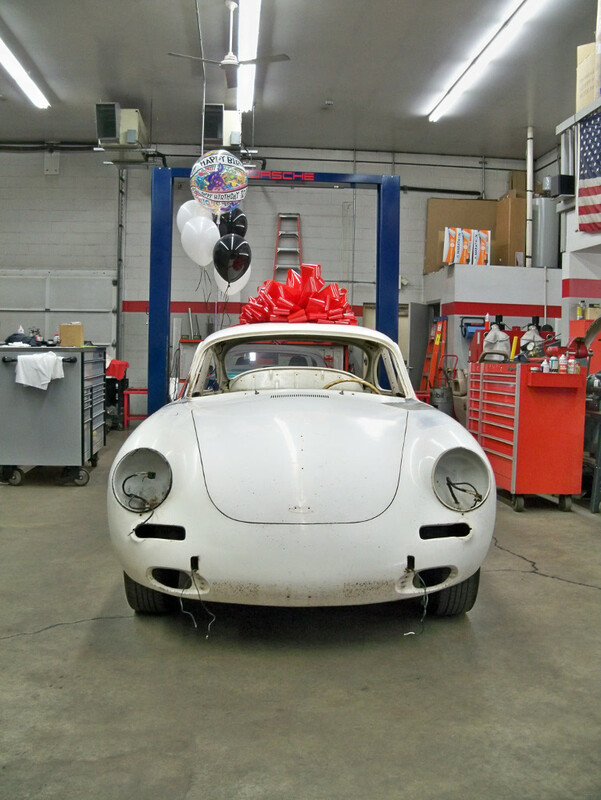 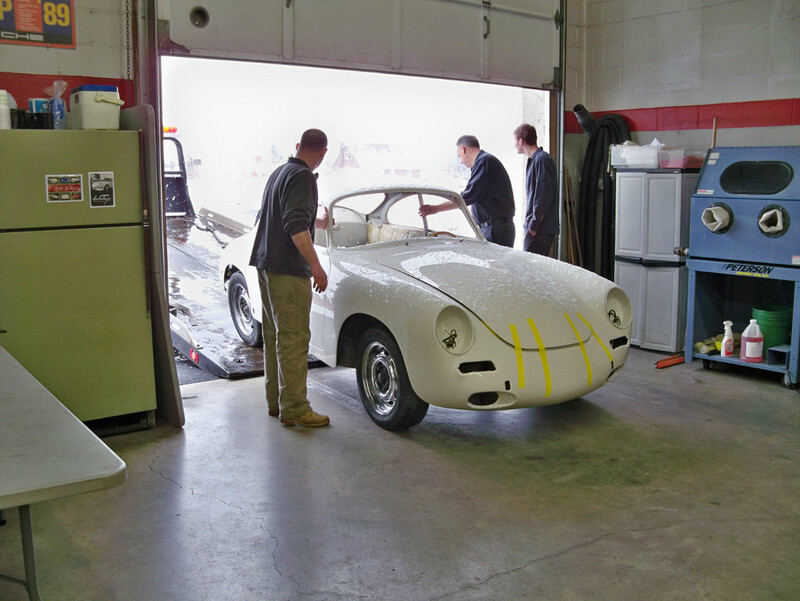 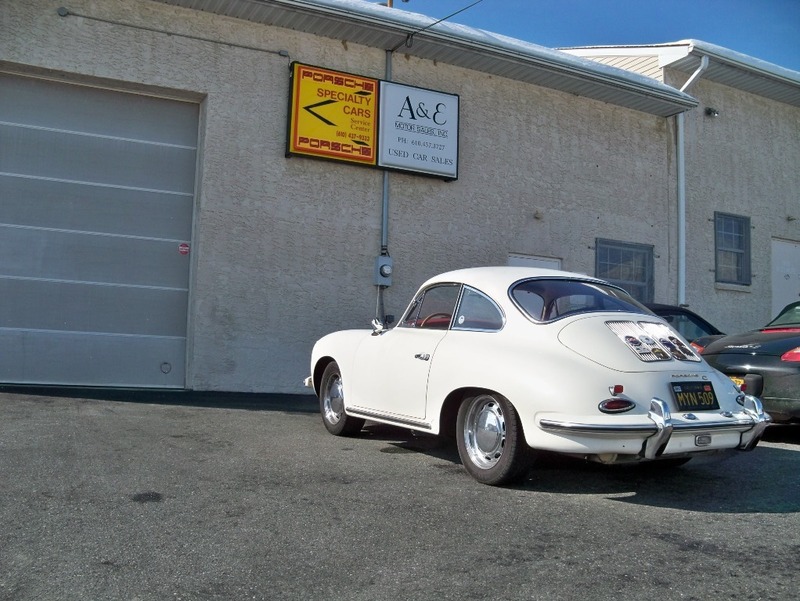 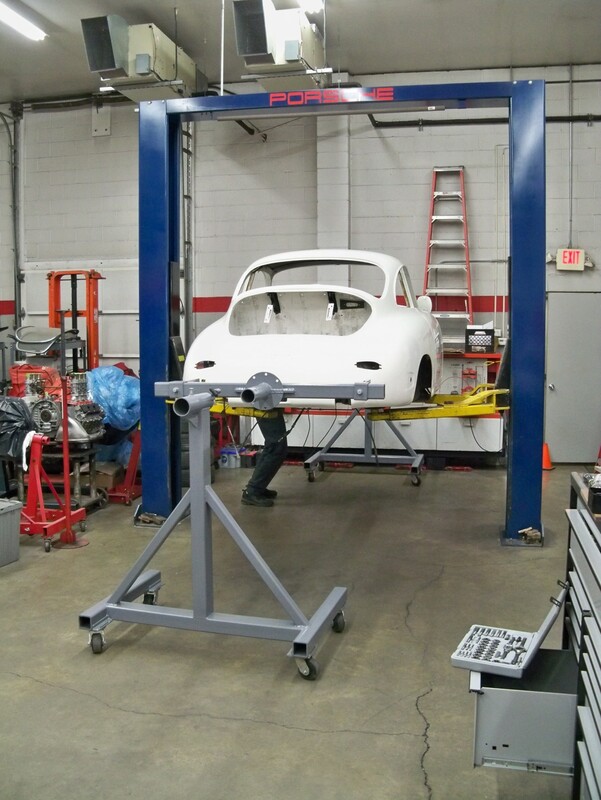 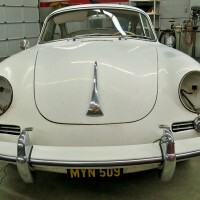 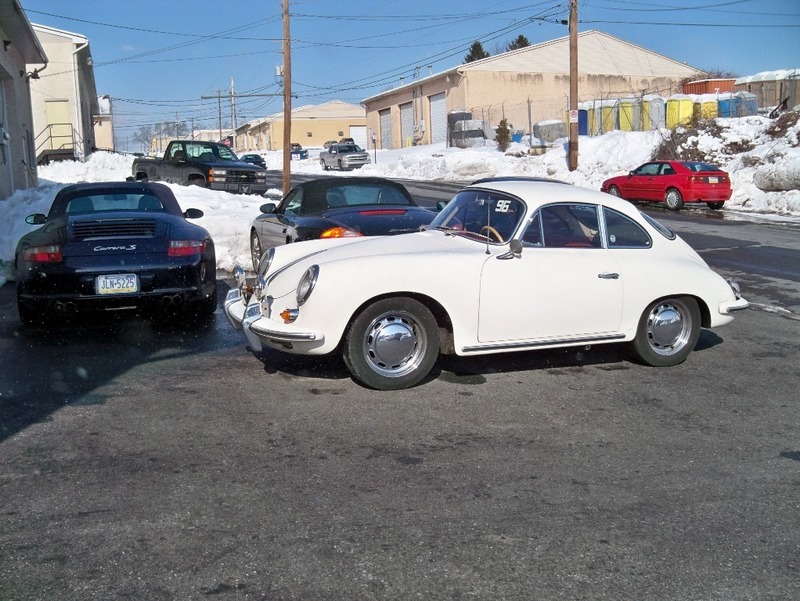 After thorough inspection, this car was found to be a well-maintained, original numbers-matching example of a non-restored (survivor) 356 from 1964. 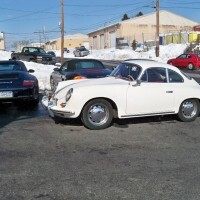 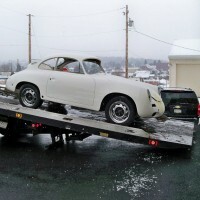 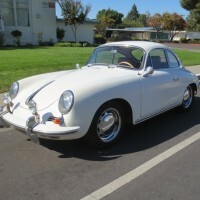 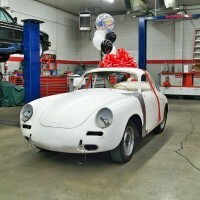 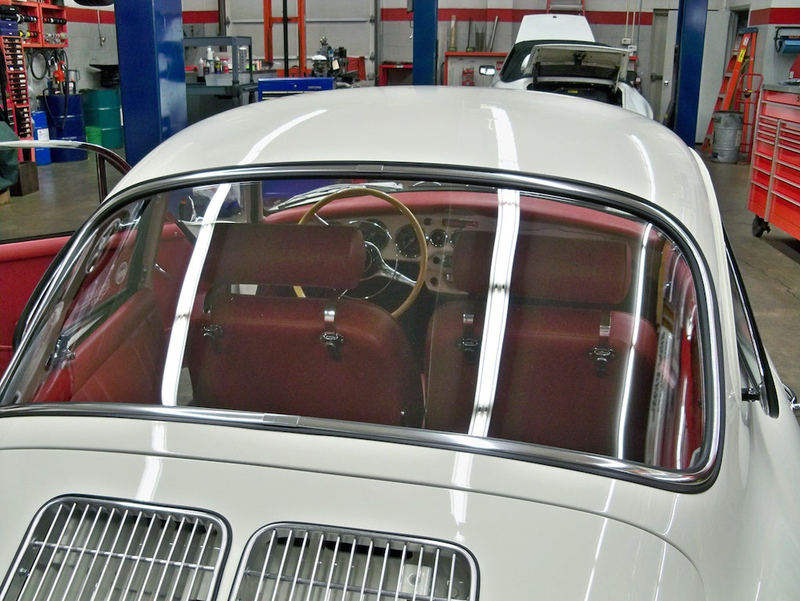 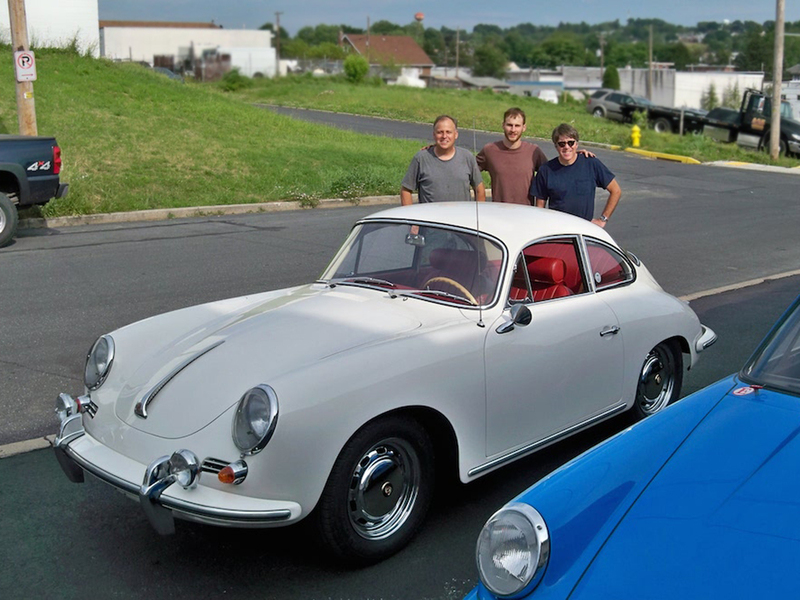 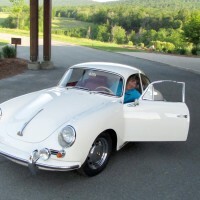 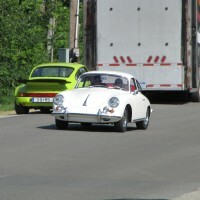 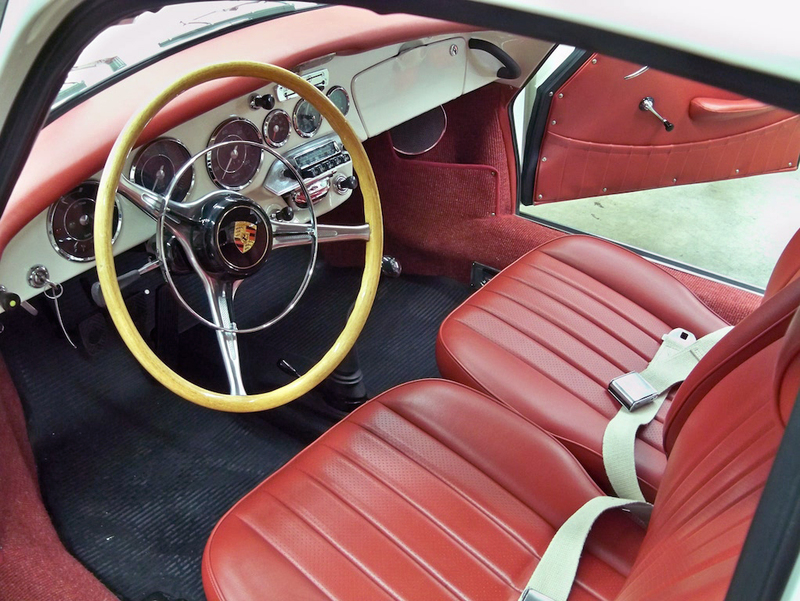 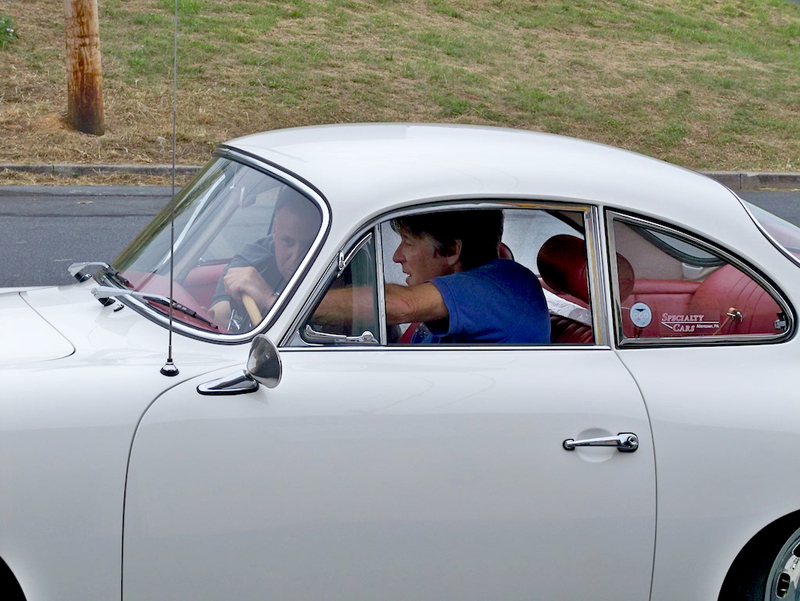 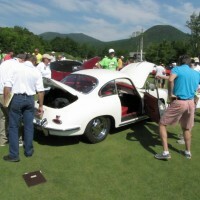 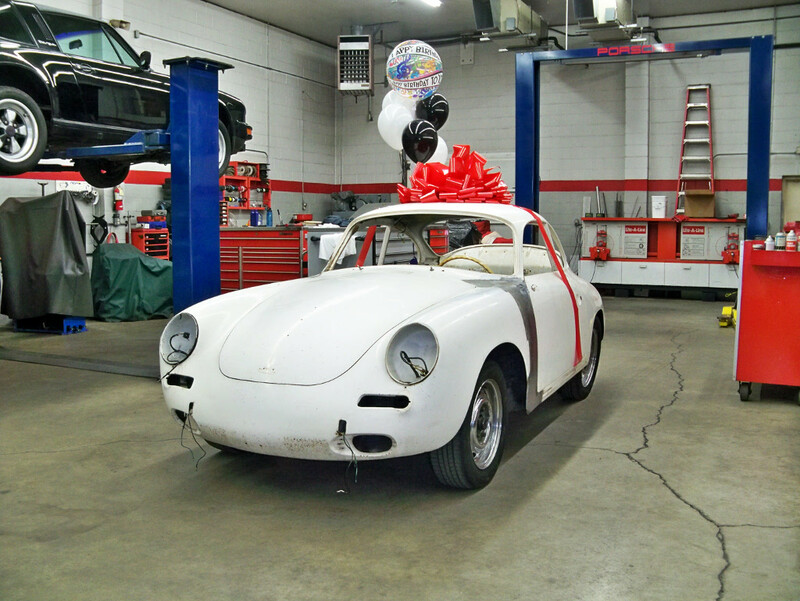 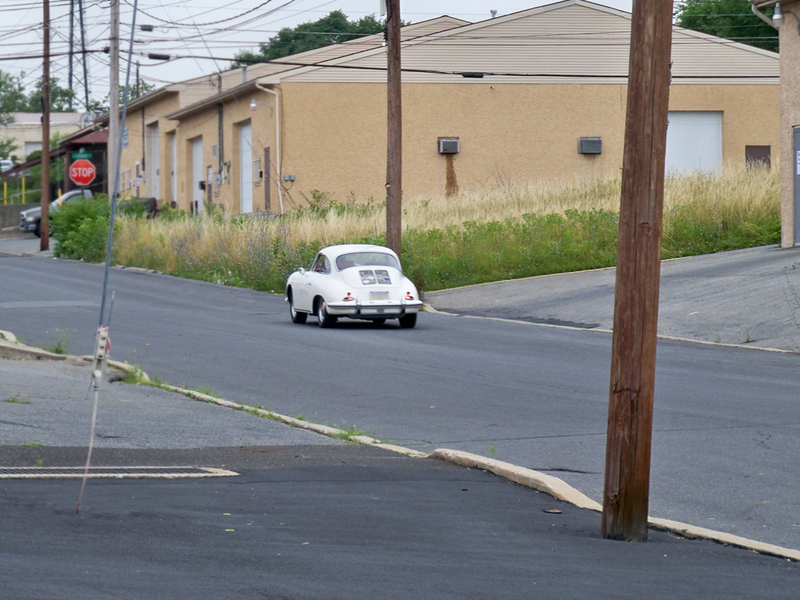 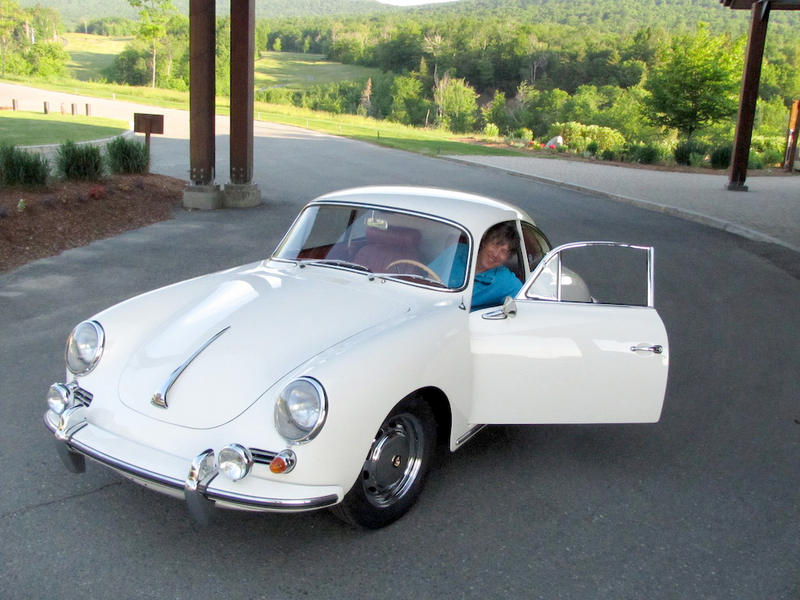 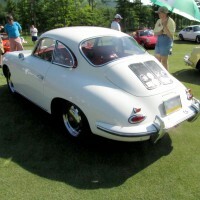 This early 356 C coupe left the factory on September 2, 1963 and was delivered to its’ first owner on September 4, 1963. 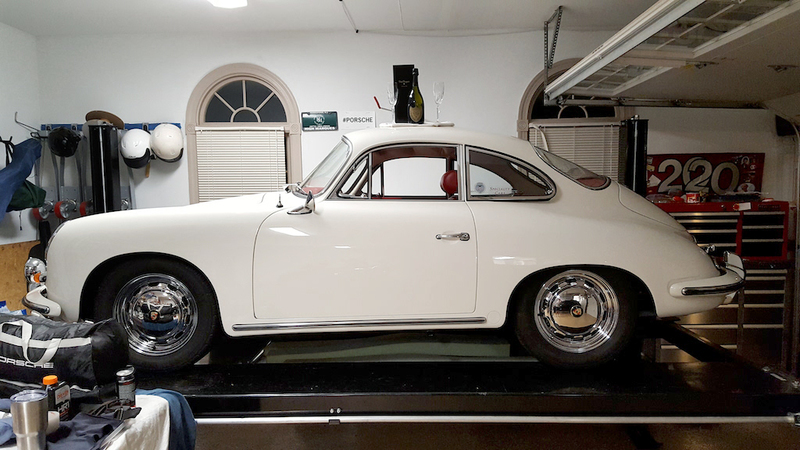 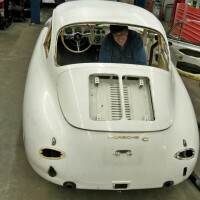 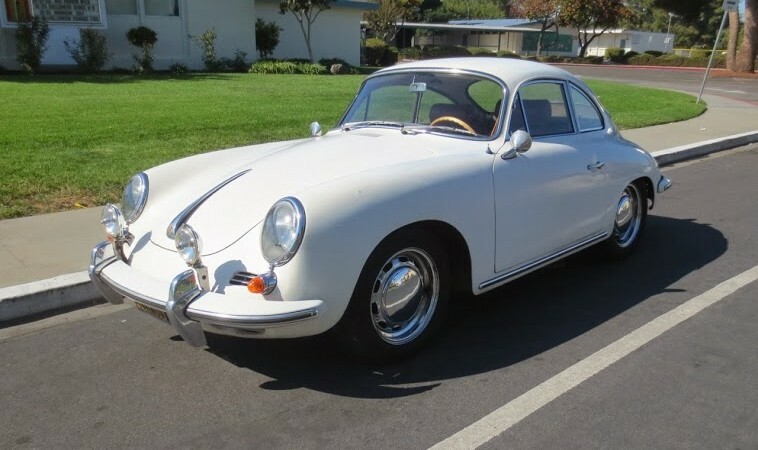 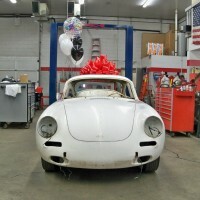 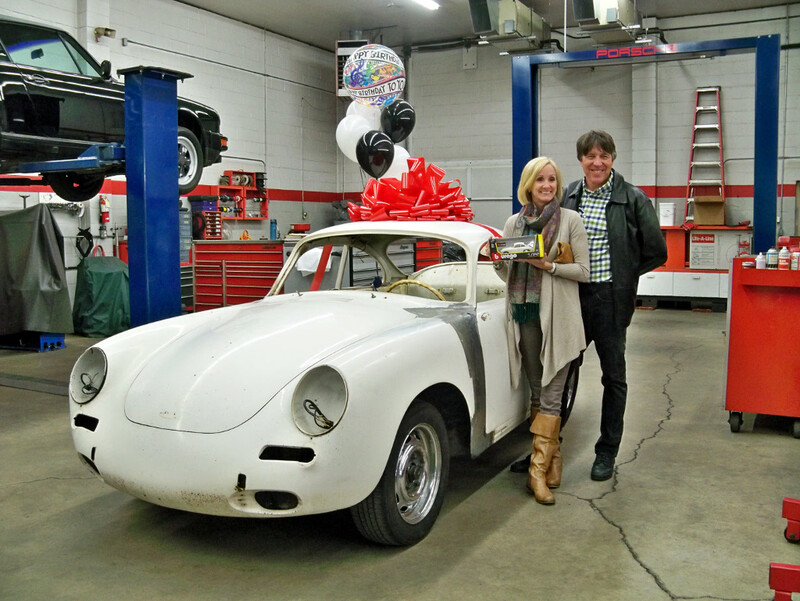 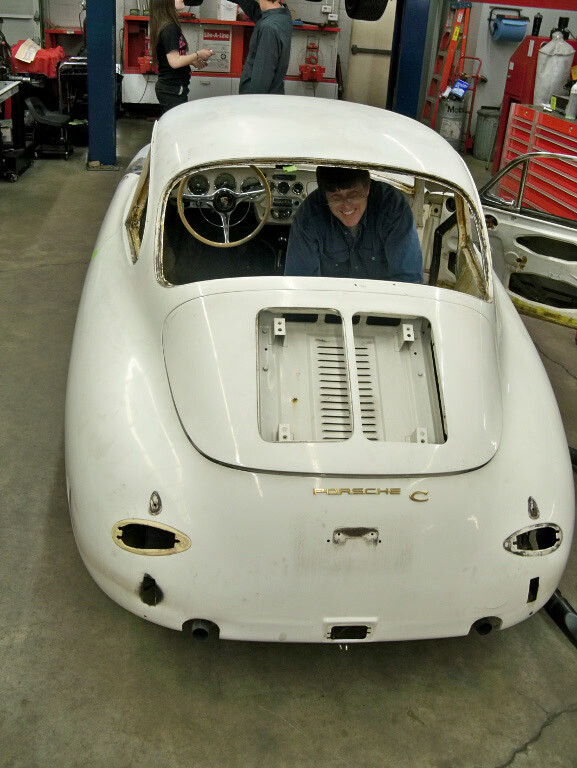 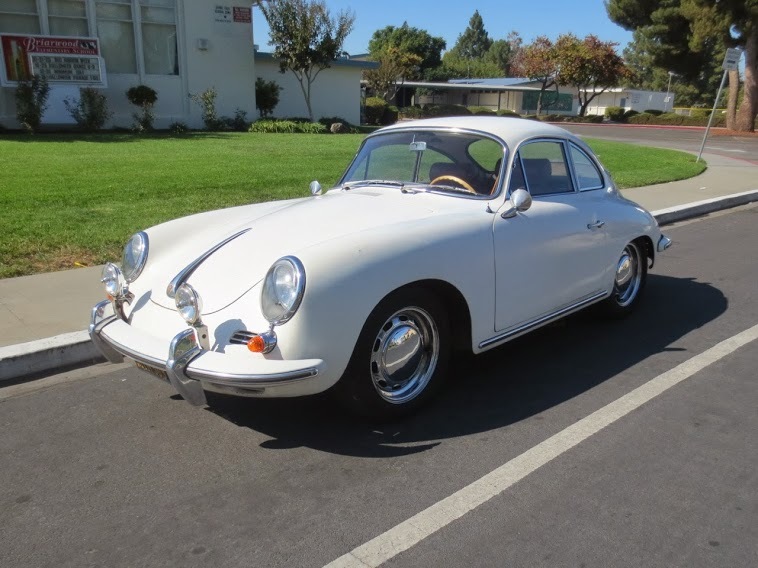 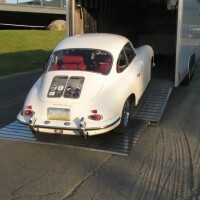 This is a US spec car, picked up at the Porsche factory and driven in Europe for the first 3,235 miles before being shipped to its’ new home in Palo Alto, California in January of 1964. 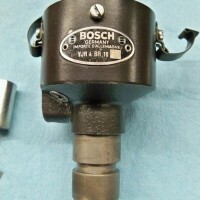 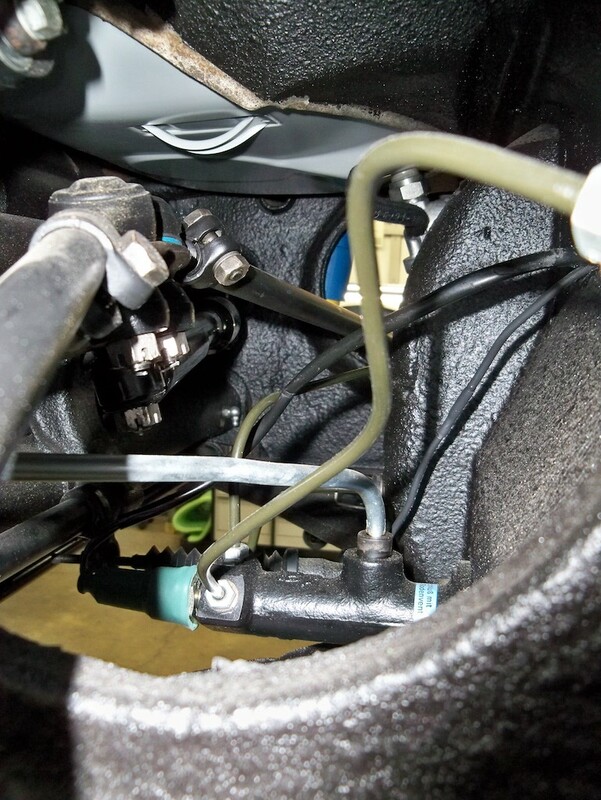 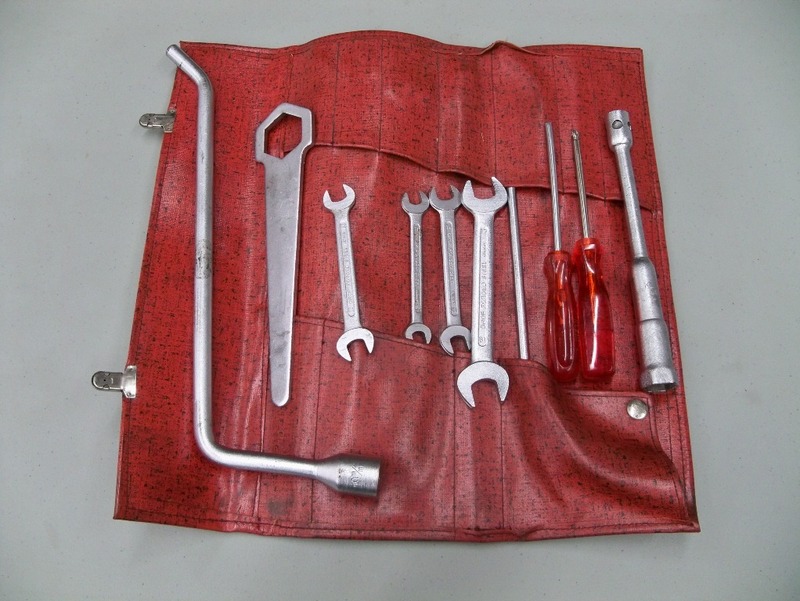 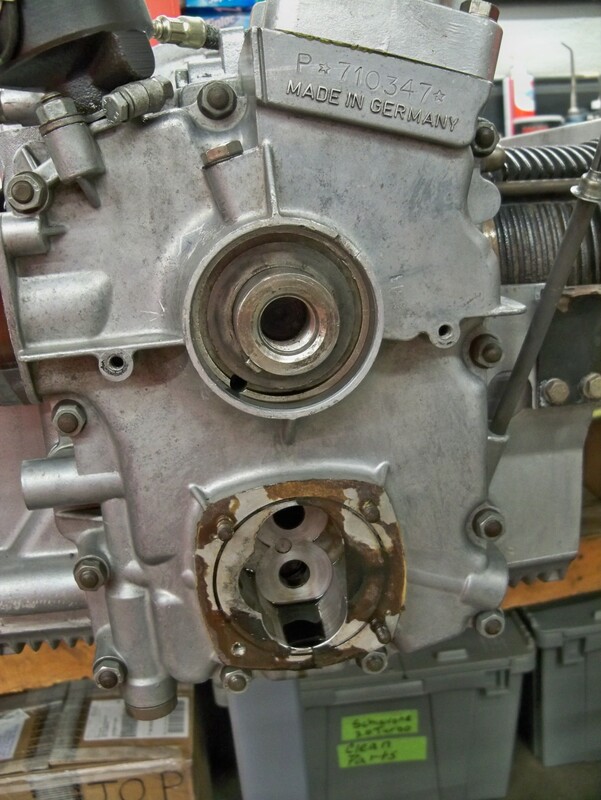 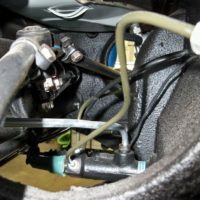 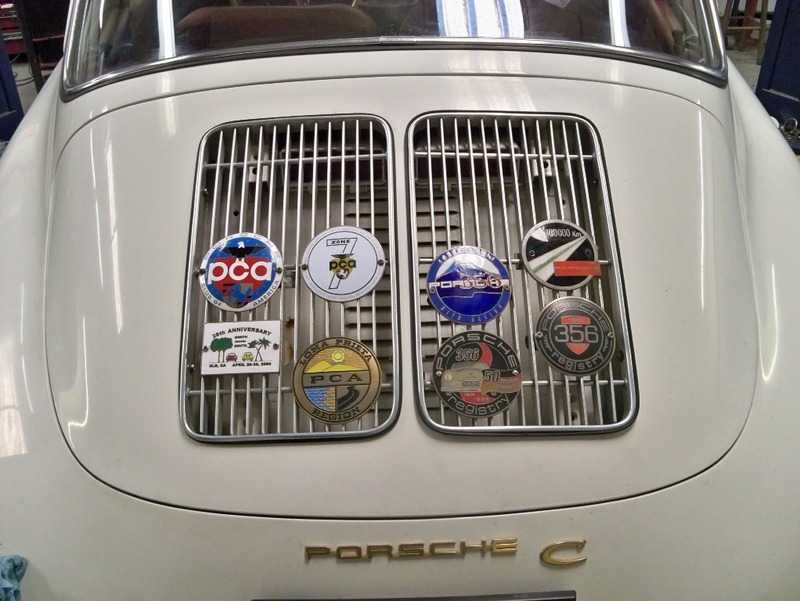 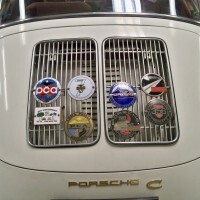 The original stamped Porsche “Service Book” and Kardex detail the first two thirds of service work being performed in Europe. 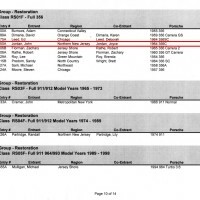 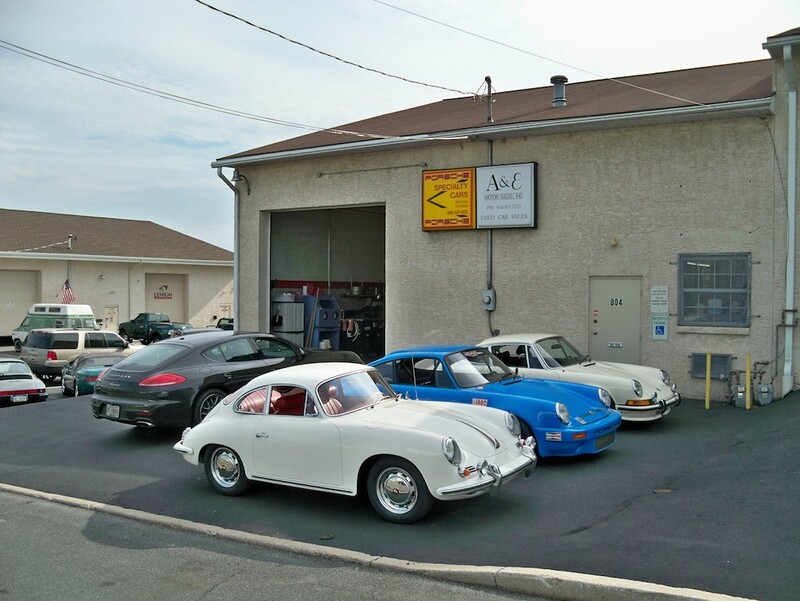 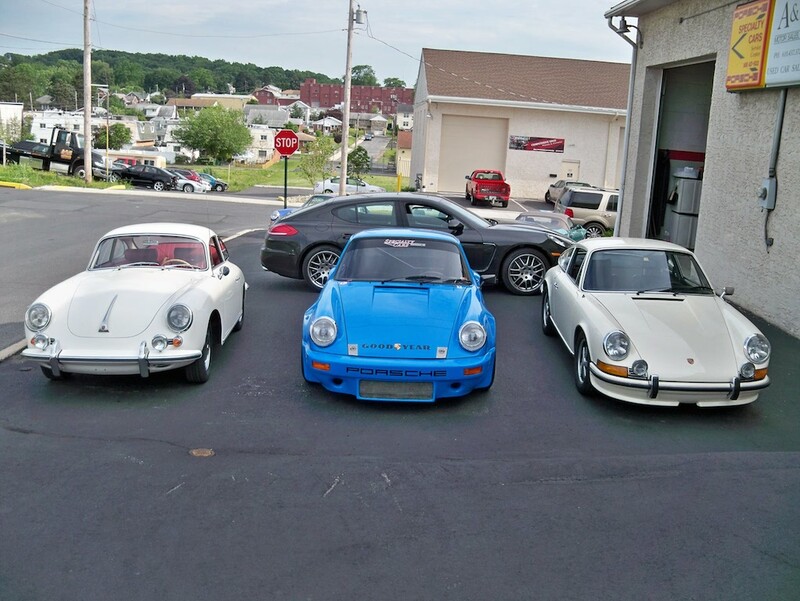 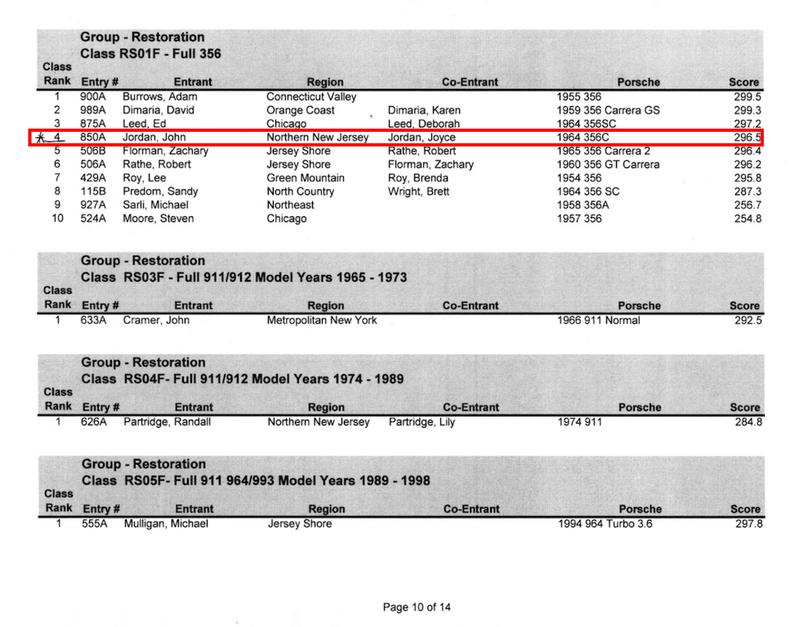 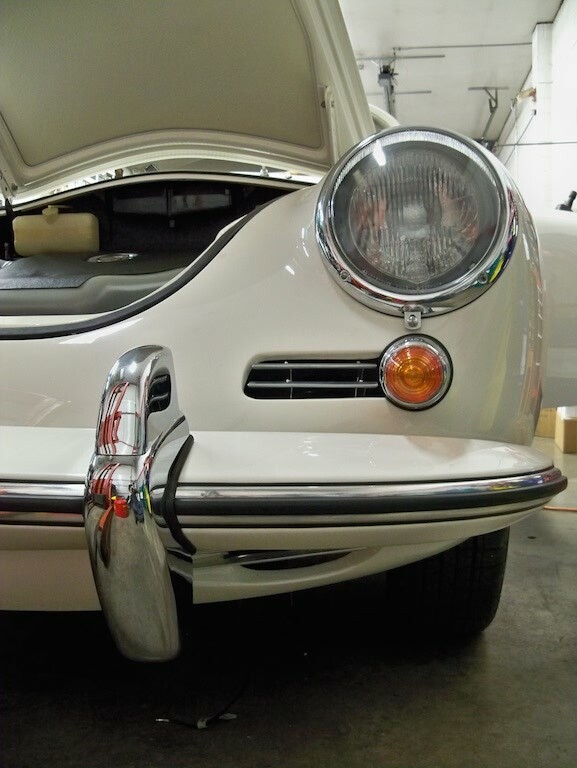 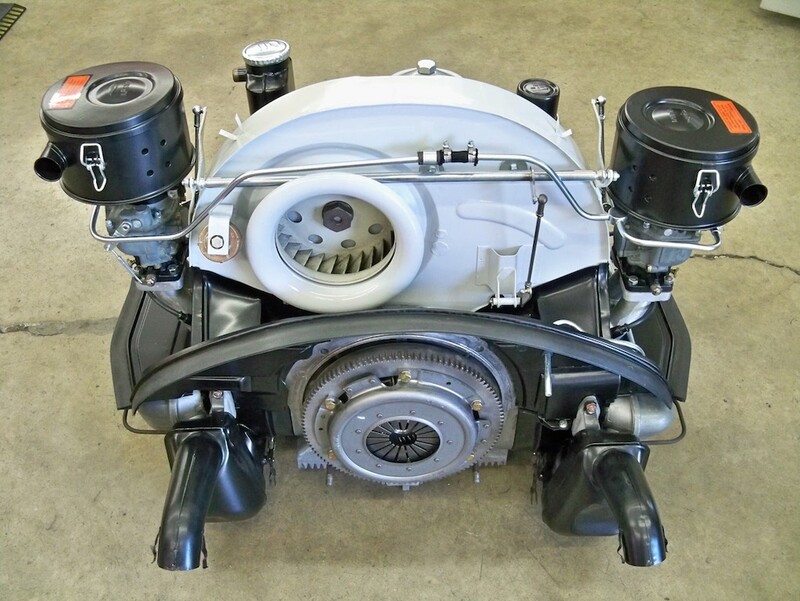 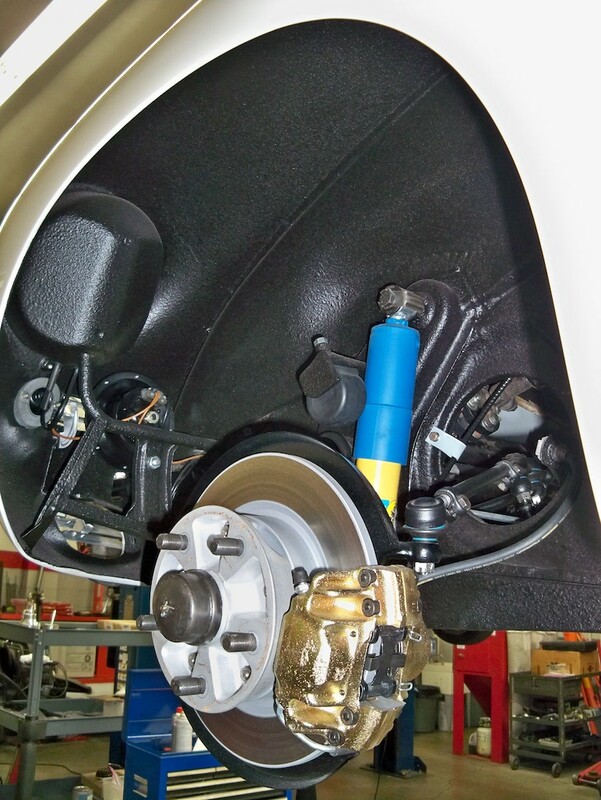 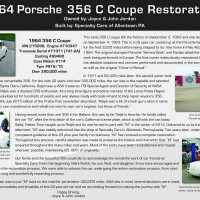 The first owner meticulously maintained this car, as evidenced by the detailed notations and services performed and documented in the two Porsche “Service Books”, as well as the original “Driver’s Manual”. 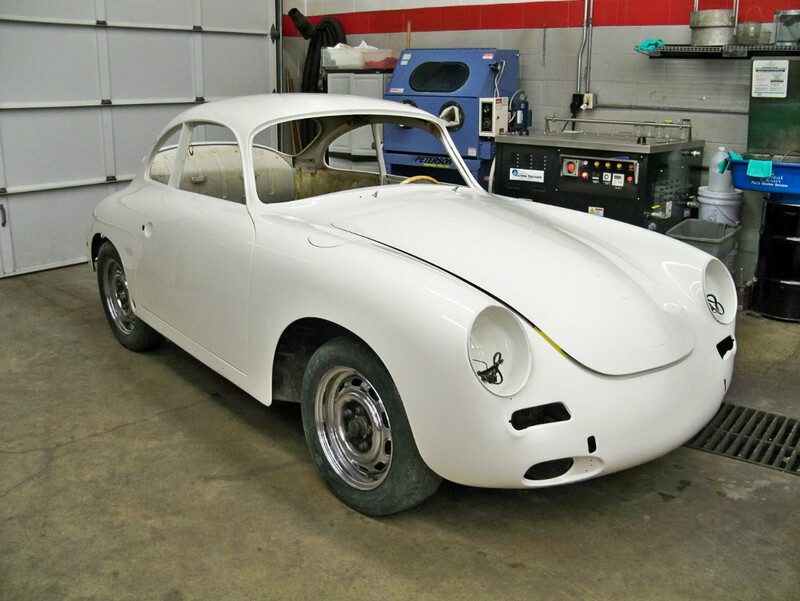 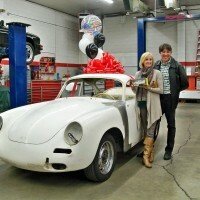 Having owned more than one 356 in his lifetime, this was by far Ralph’s favorite. 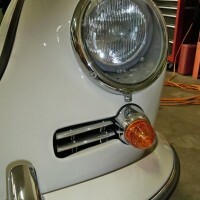 He fondly called the car “M”, after the first letter of the car’s California license plate, which is still with the car today. 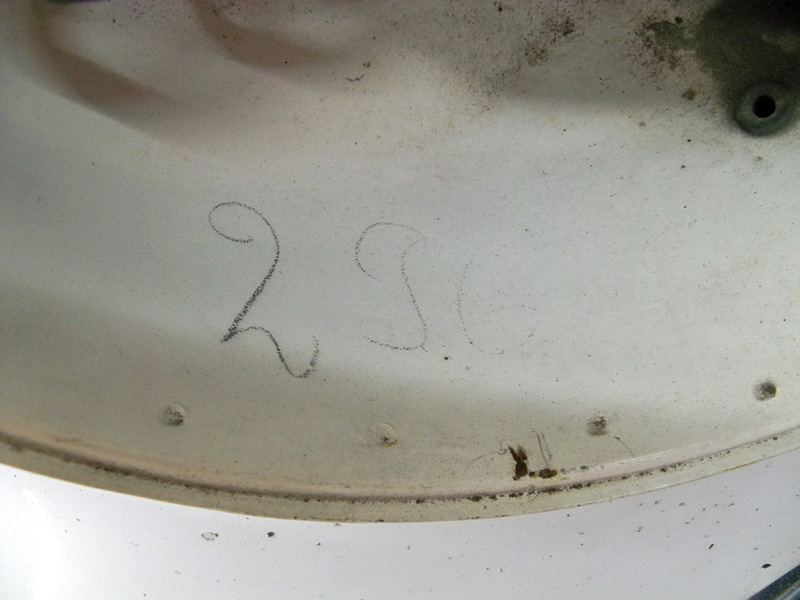 Sadly, Father Time caught up to Ralph and he was forced to part with “M” in the winter of 2014. 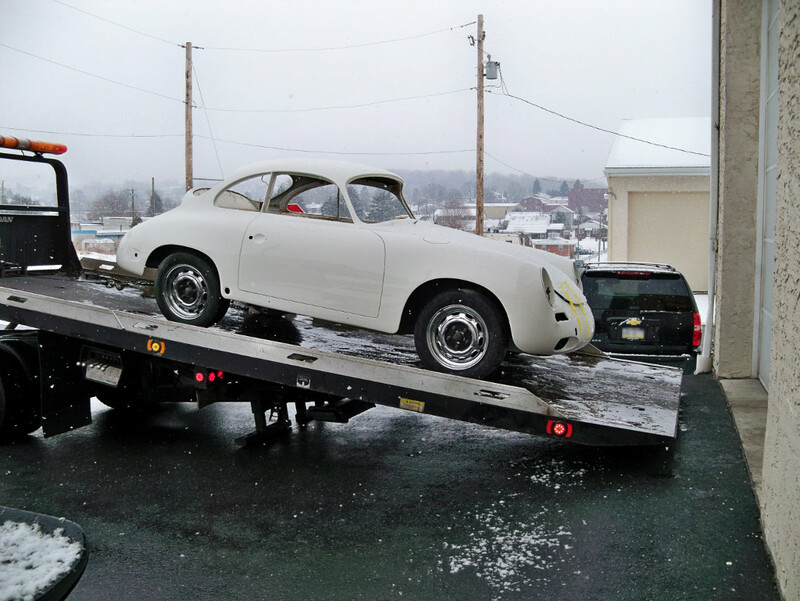 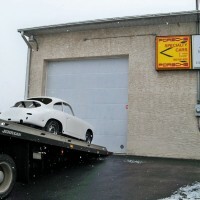 Delivered by trailer on a cold February afternoon, “M” was readily welcomed into our shop. 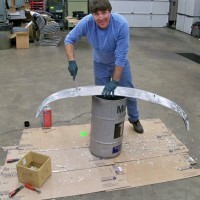 Two years later, “M” has received a complete restoration. 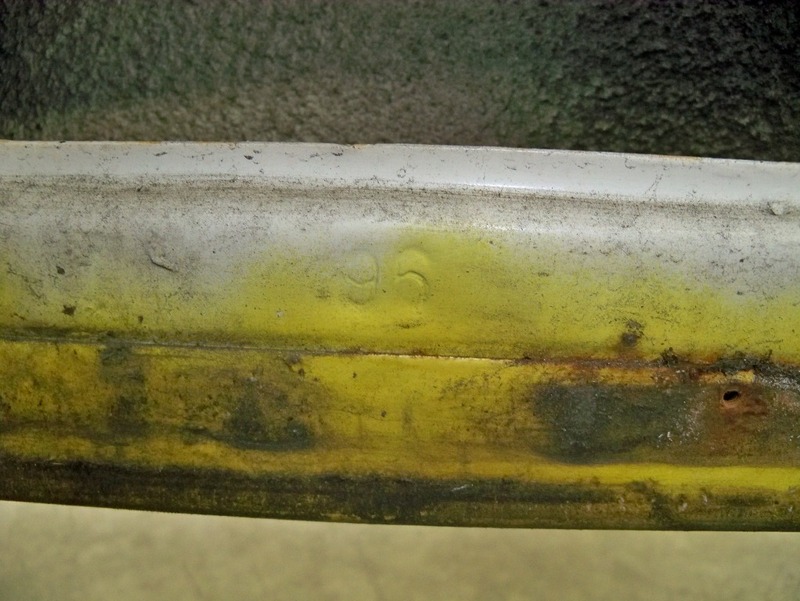 Throughout this process, careful attention was made to preserve the history and character that “M” had acquired throughout the many miles and years. 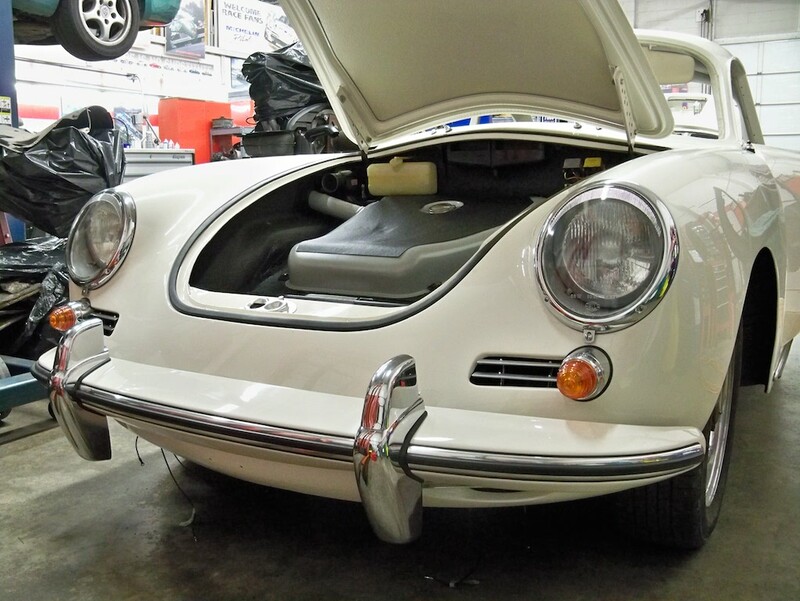 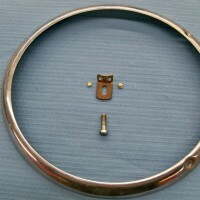 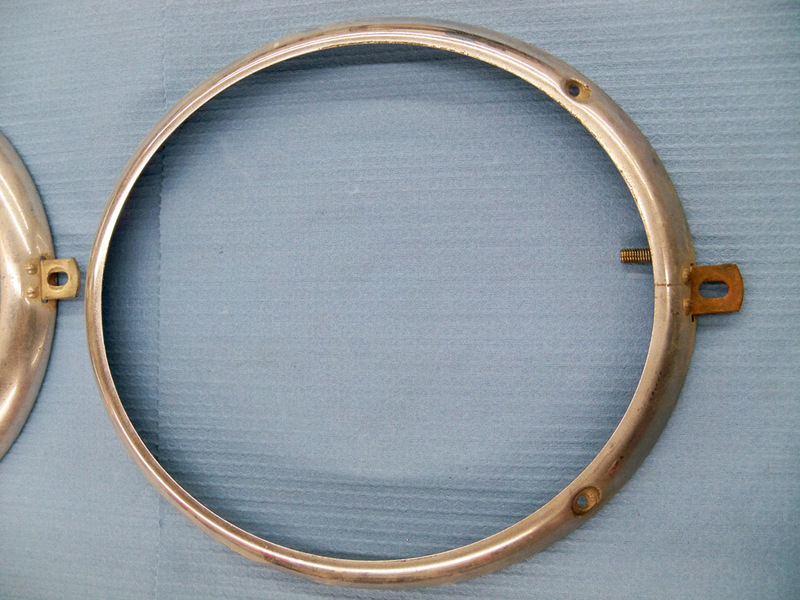 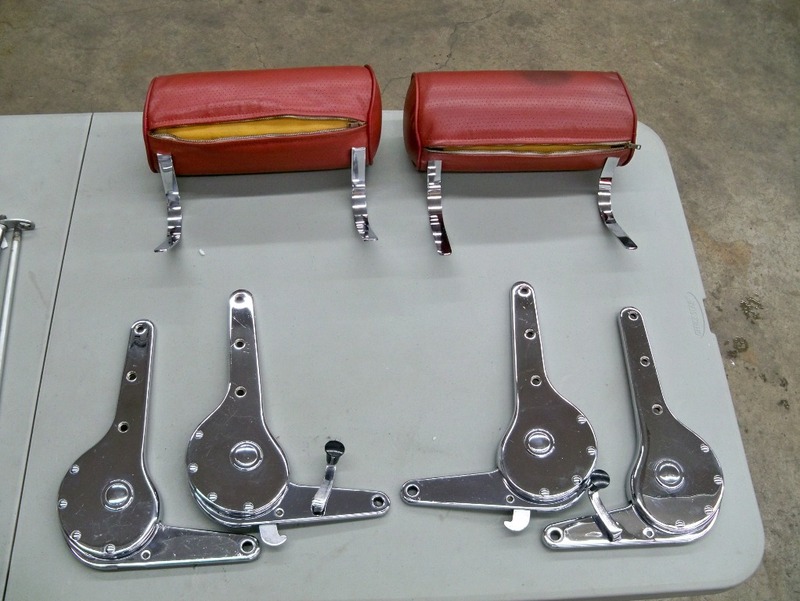 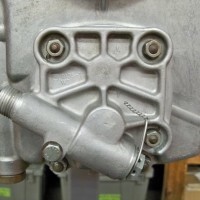 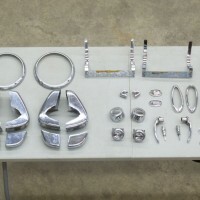 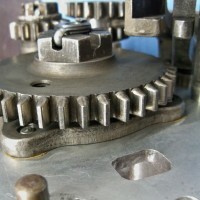 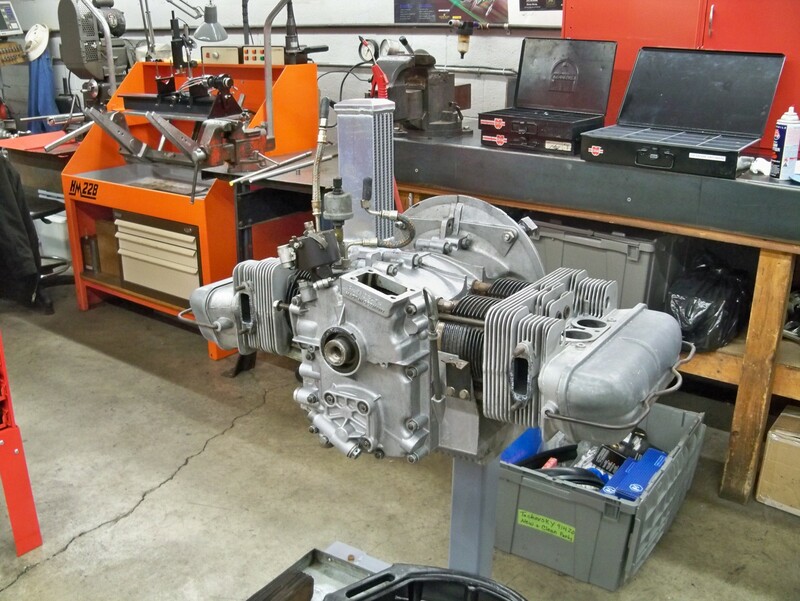 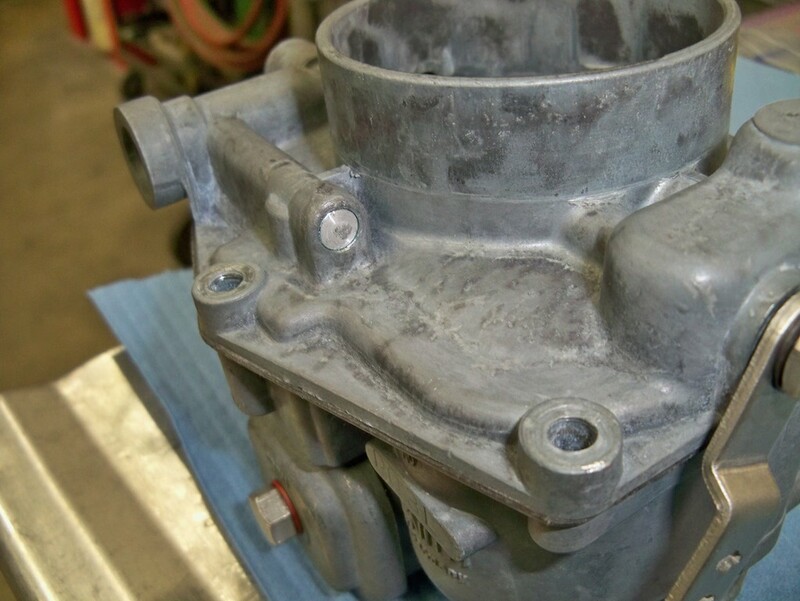 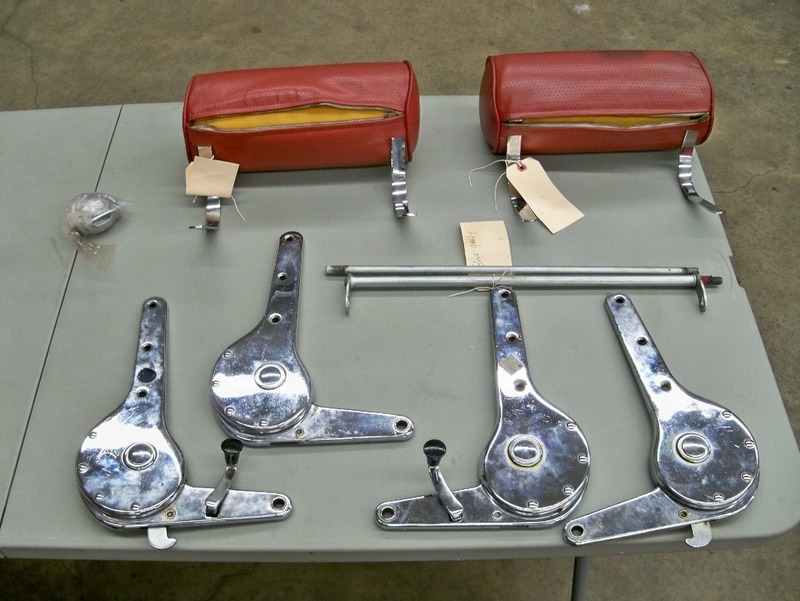 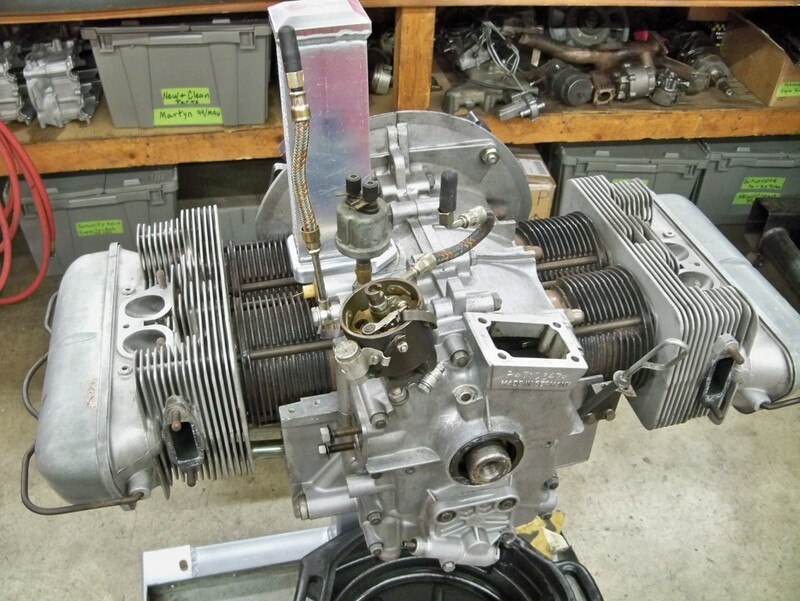 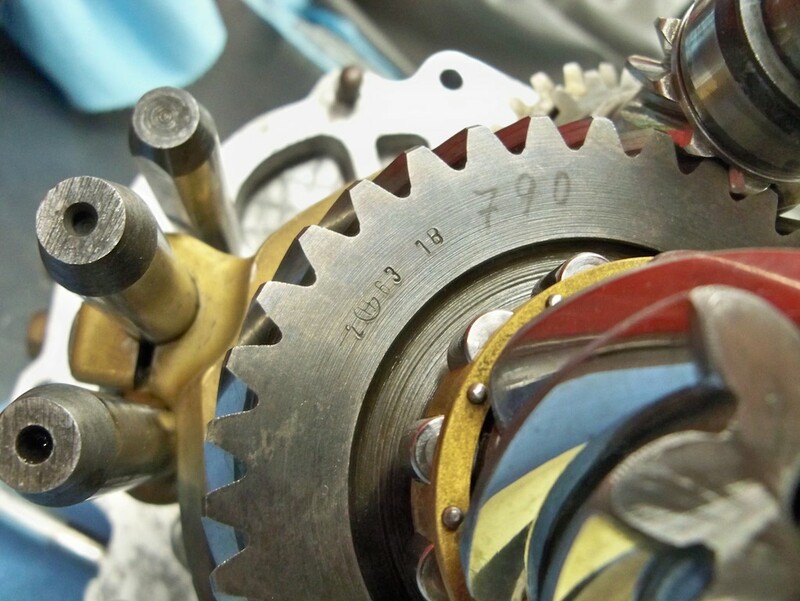 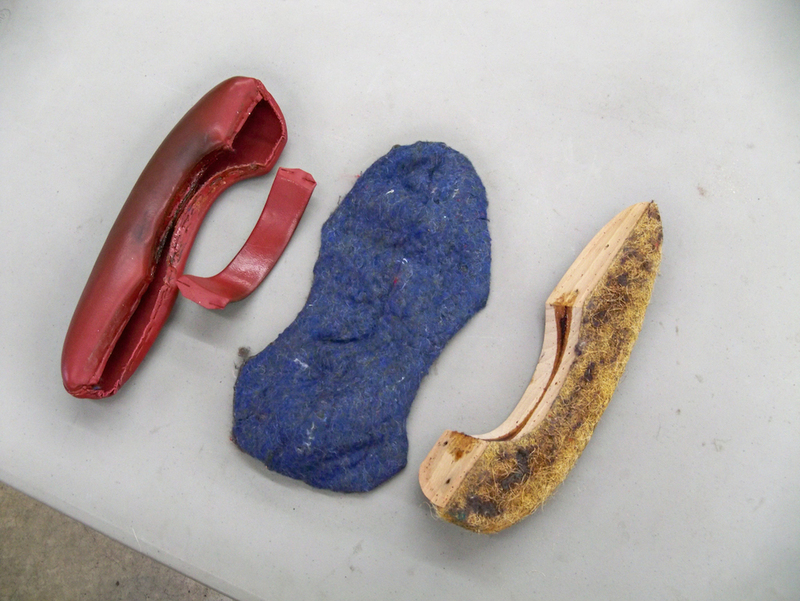 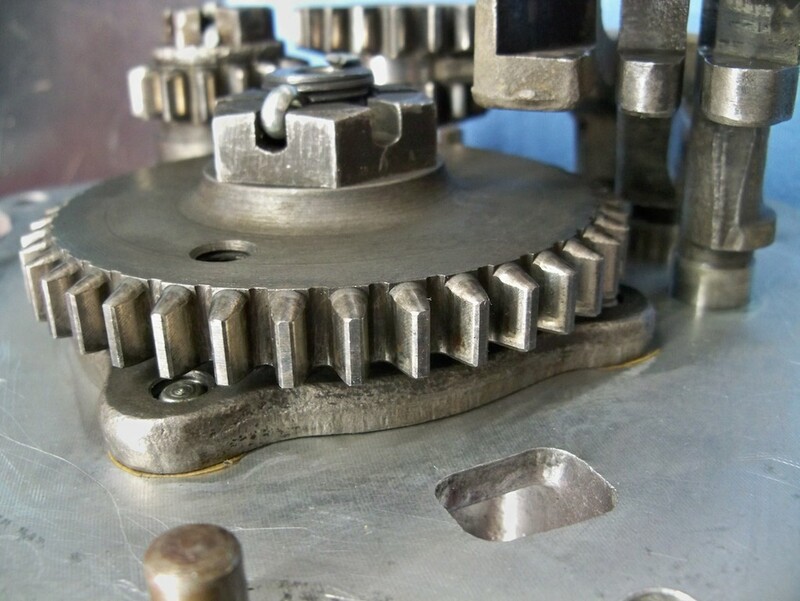 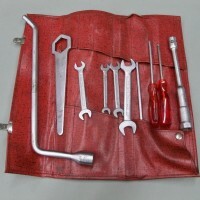 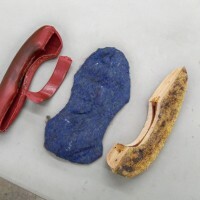 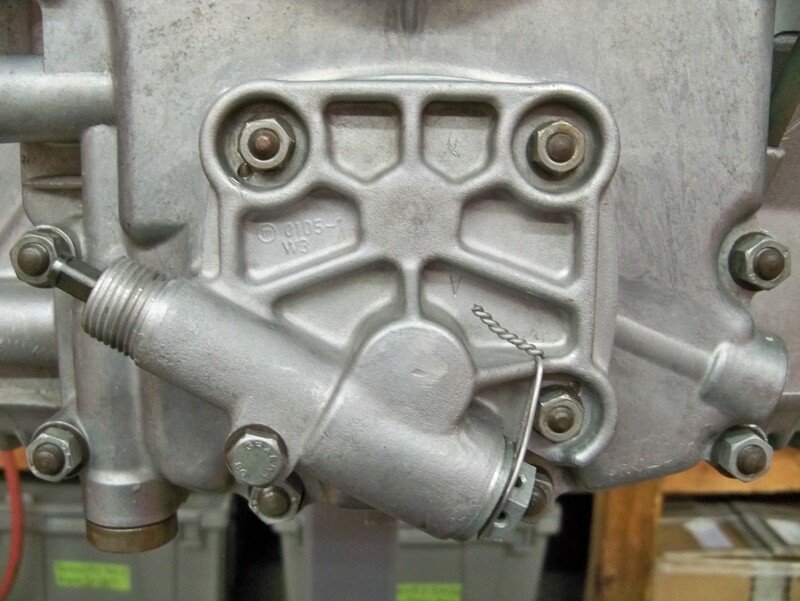 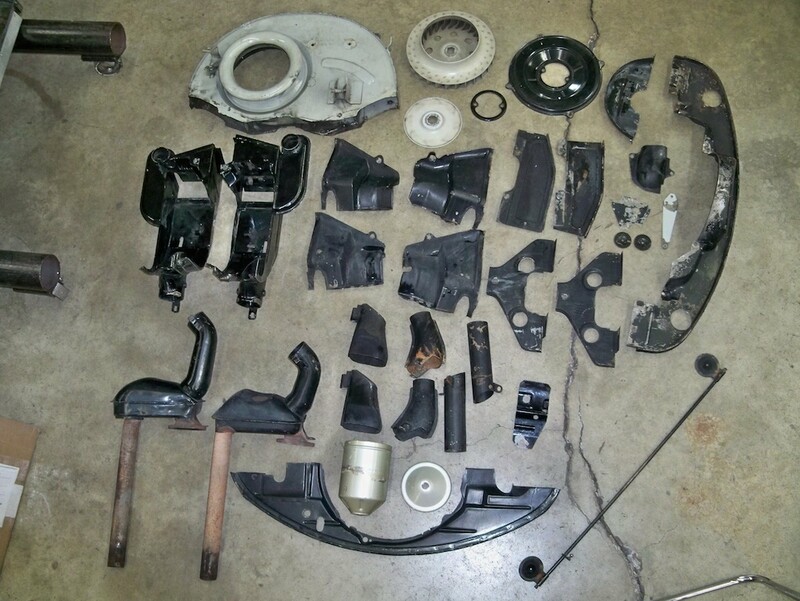 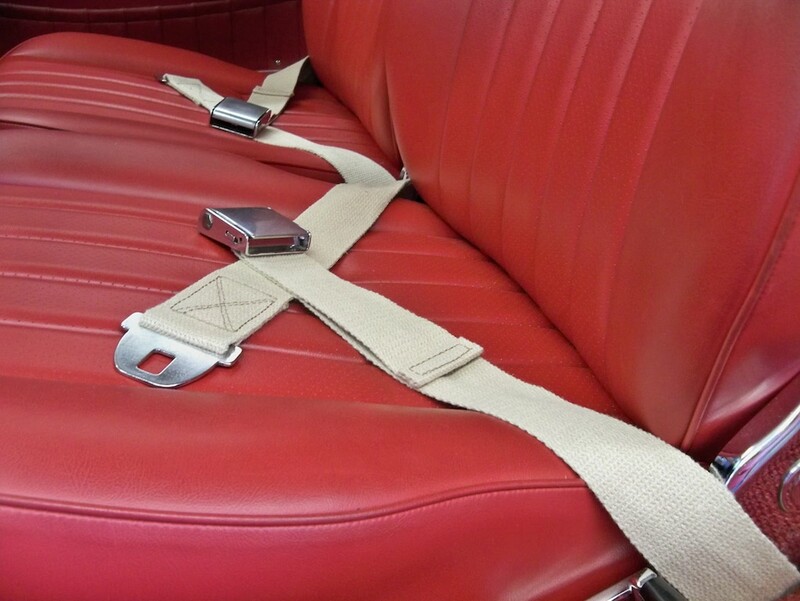 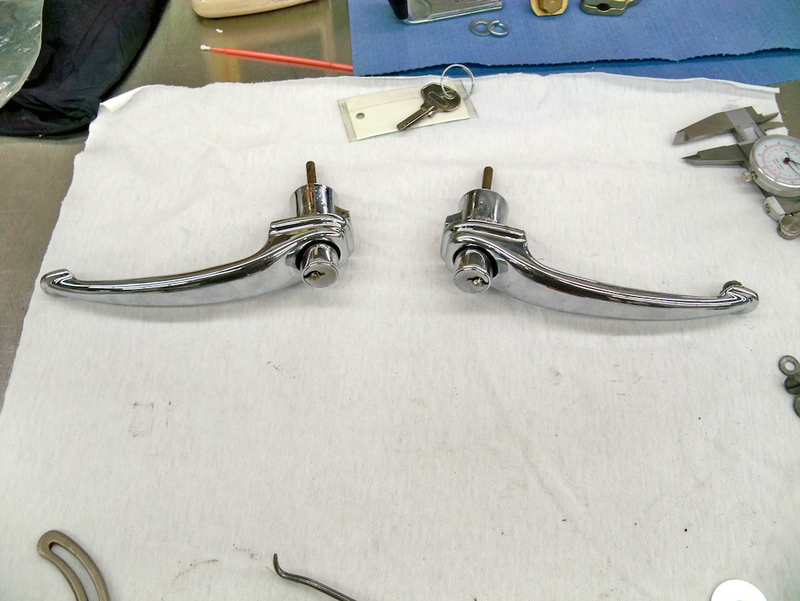 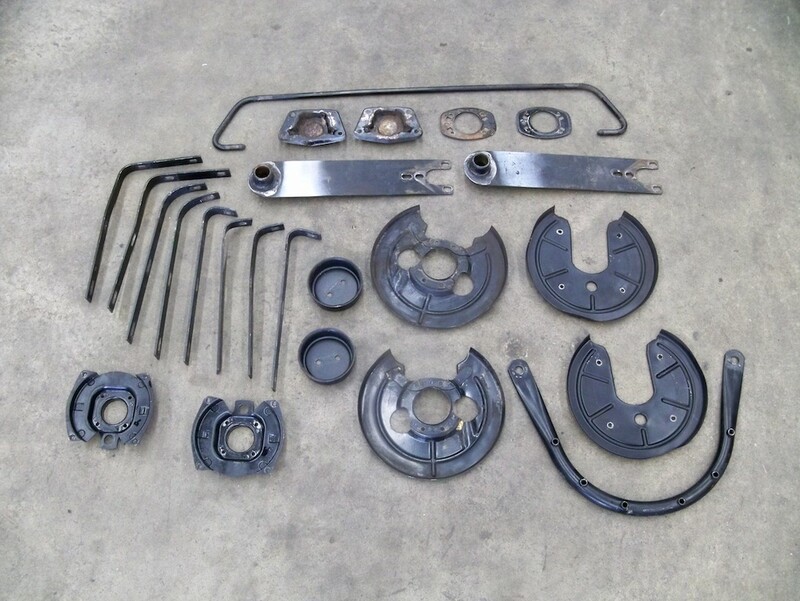 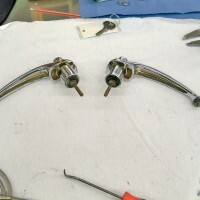 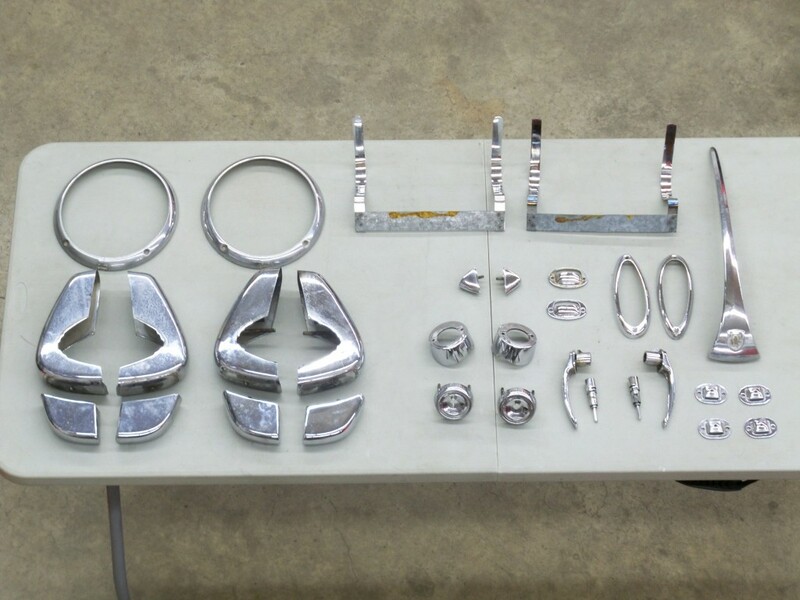 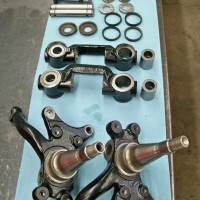 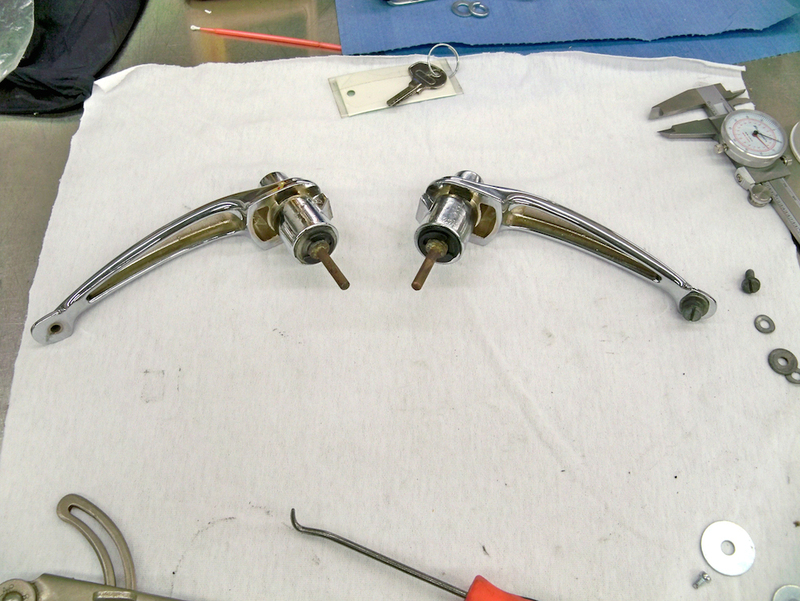 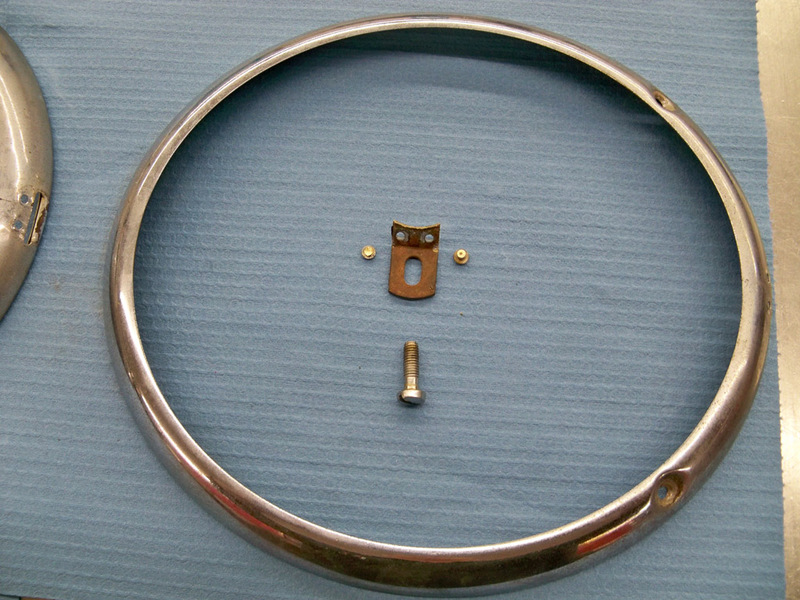 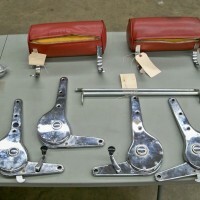 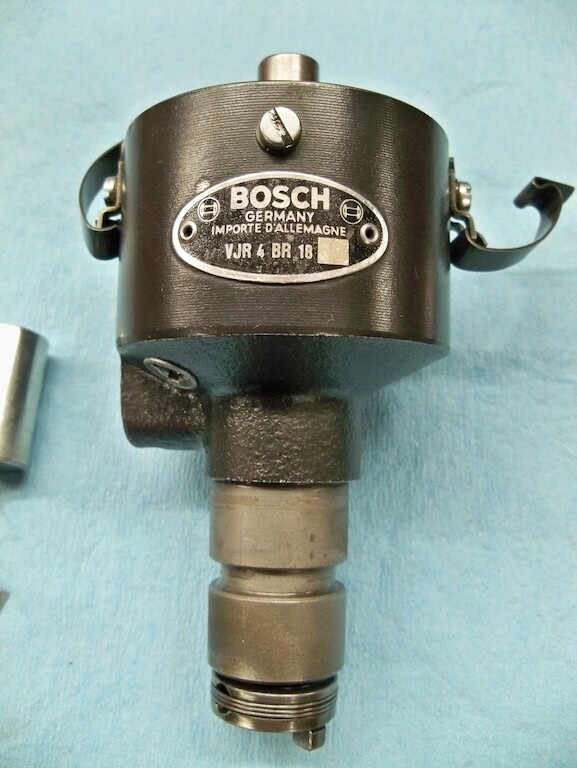 Most of the parts have been reconditioned and reused wherever possible, maintaining 85-90% of originality. 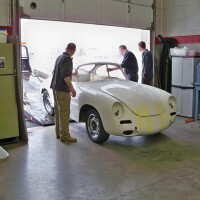 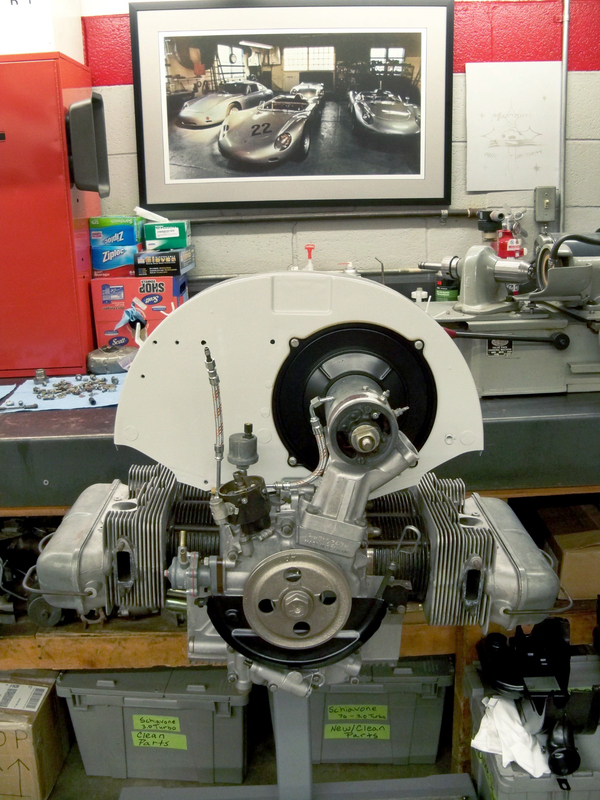 The intent of this restoration is to put “M” back on the road for yet another 400,000 miles. 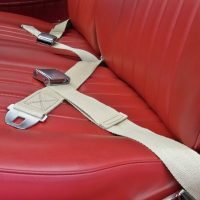 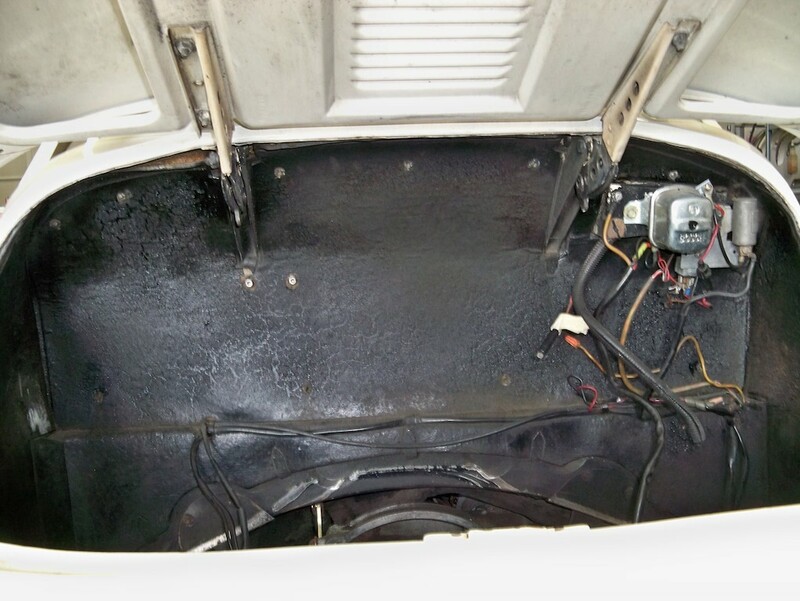 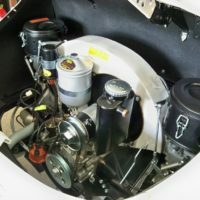 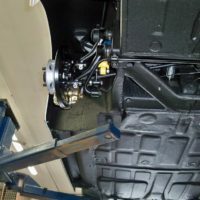 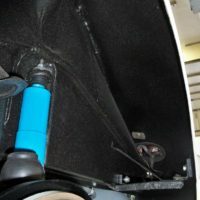 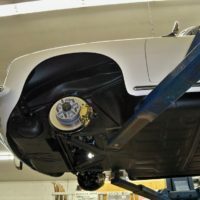 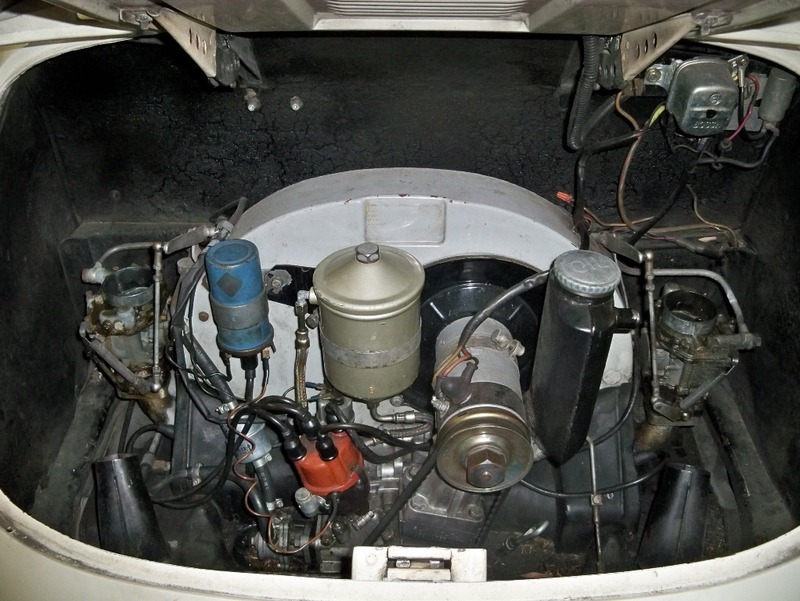 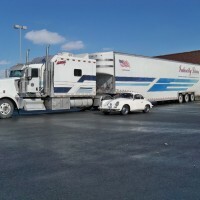 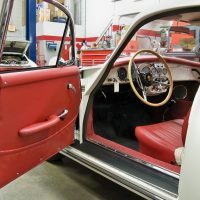 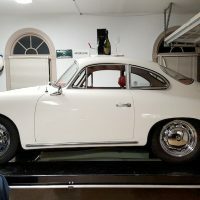 With this in mind, several decisions were made to improve the long-term survivability and drivability of this 52-year-old car and the new owners are looking forward to making this journey with “M”. 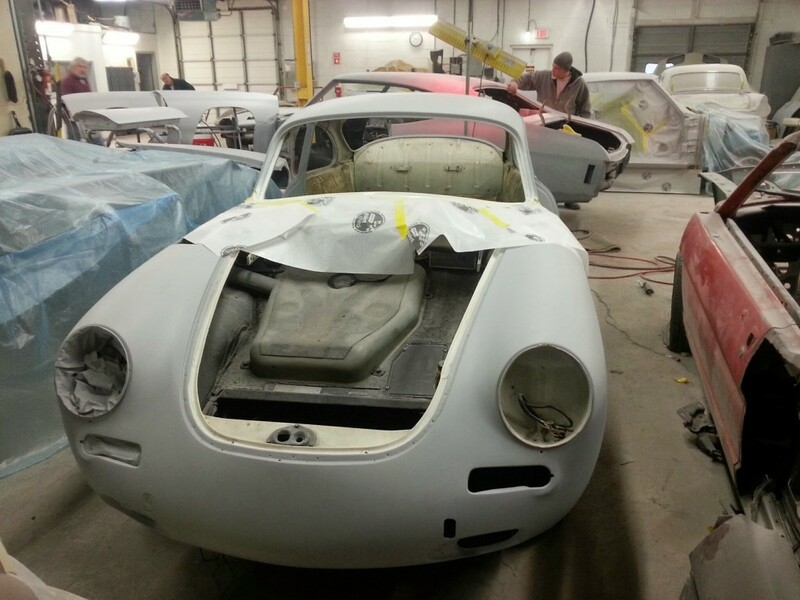 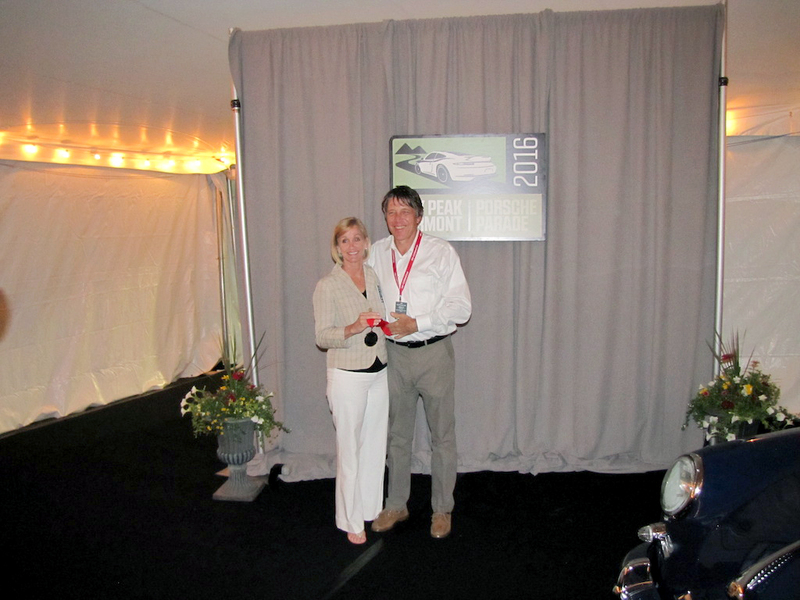 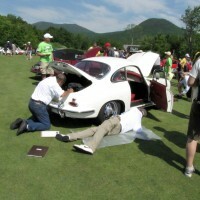 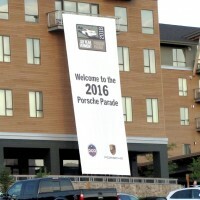 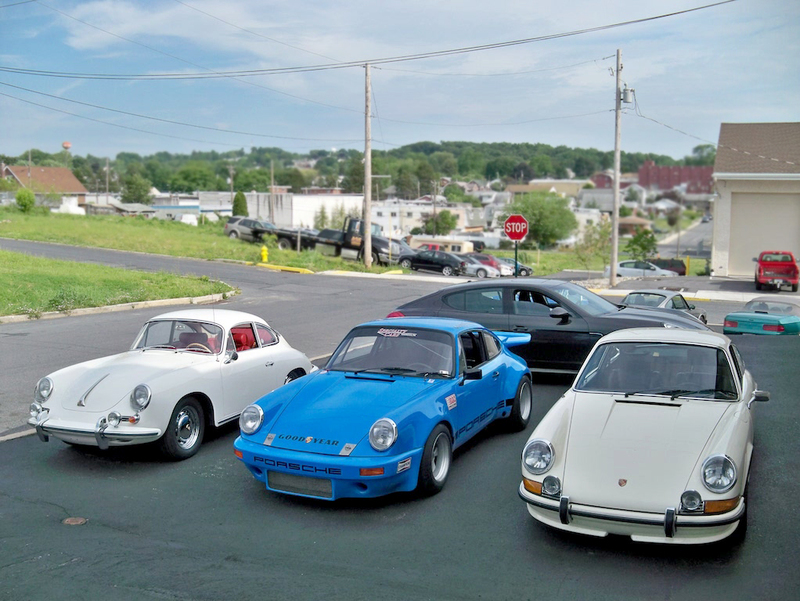 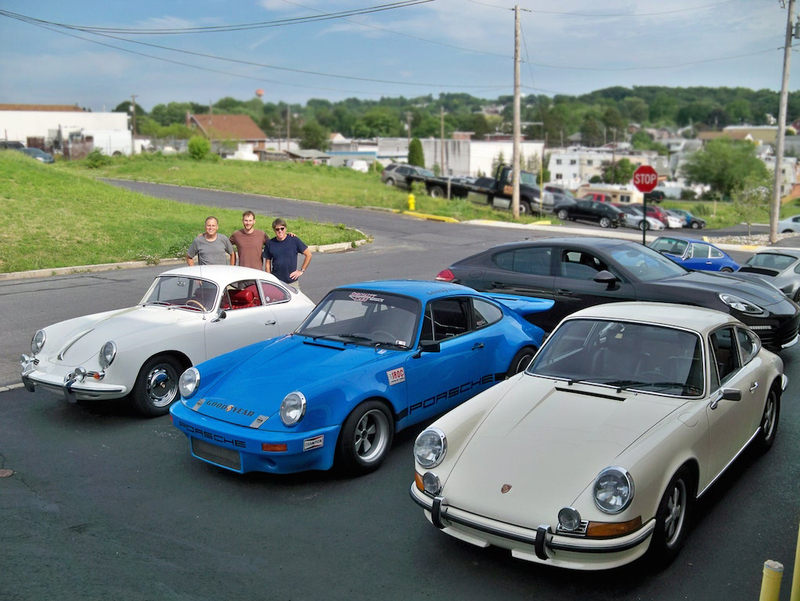 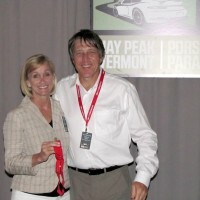 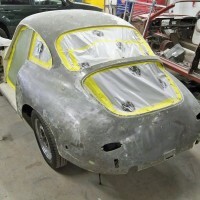 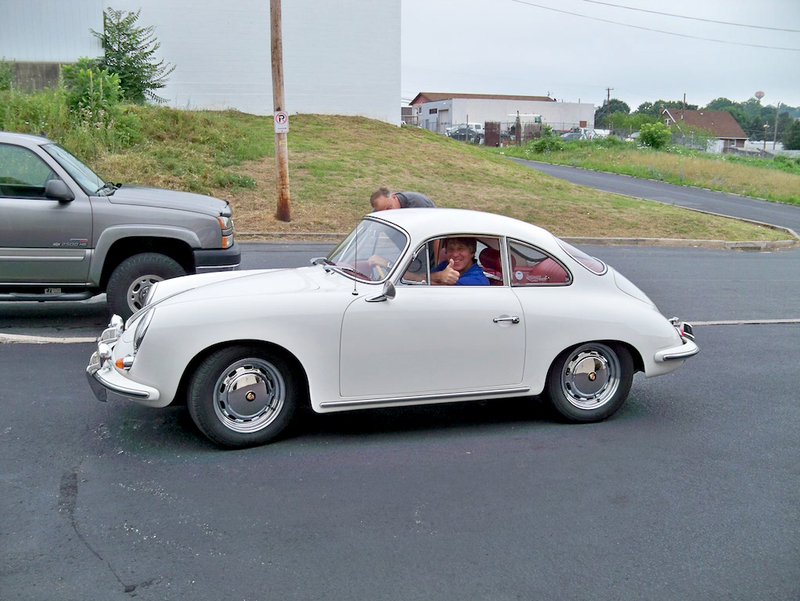 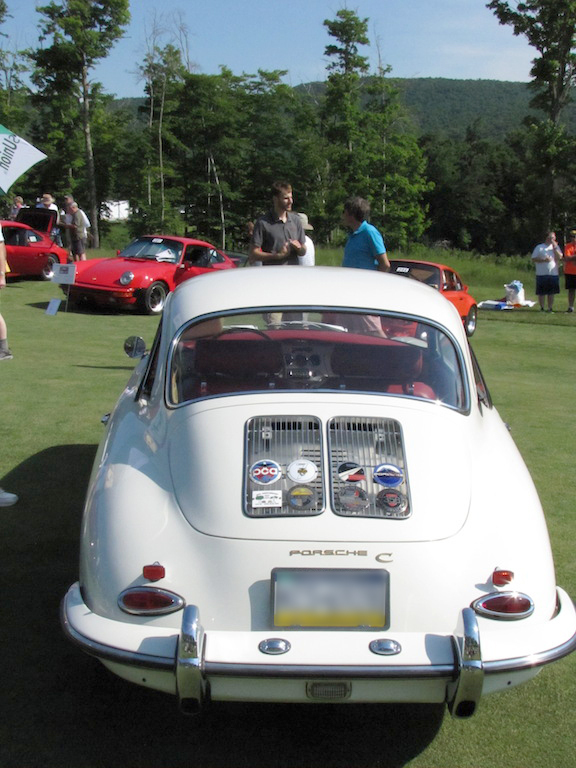 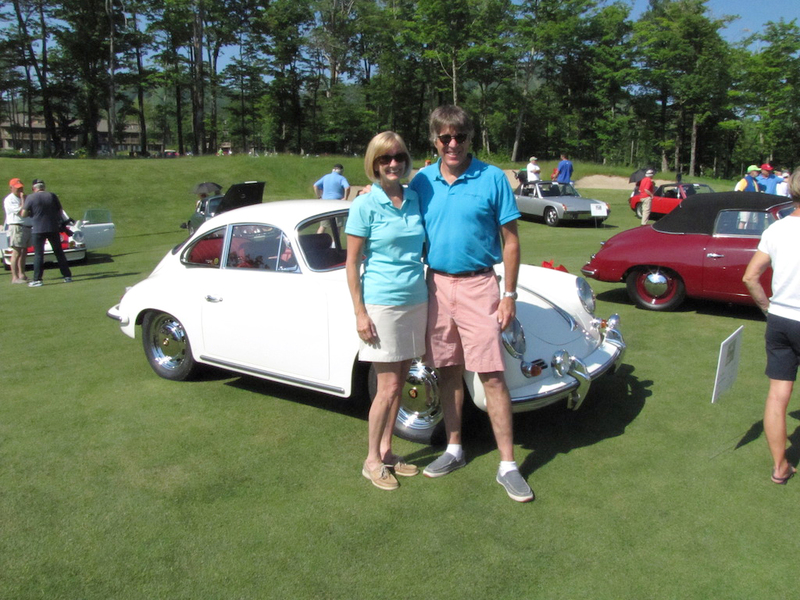 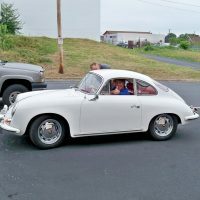 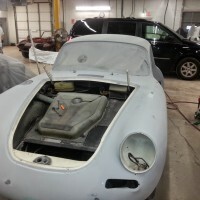 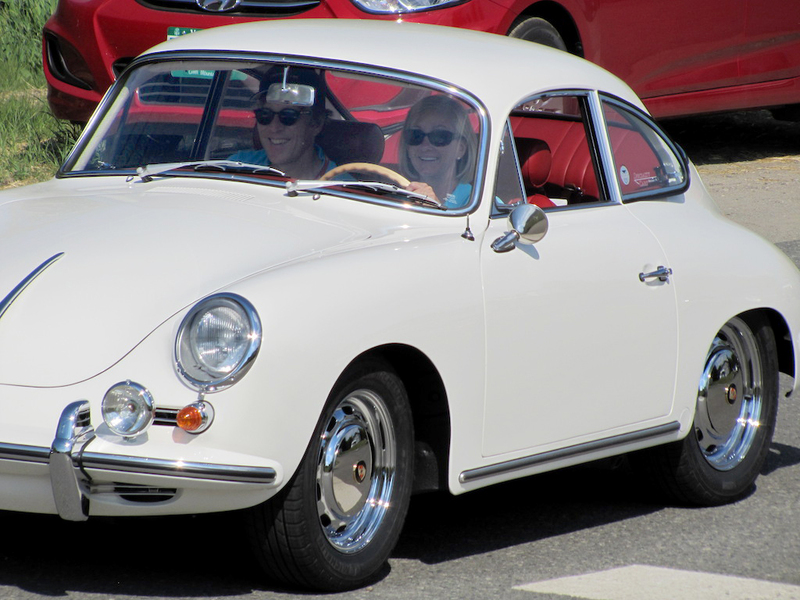 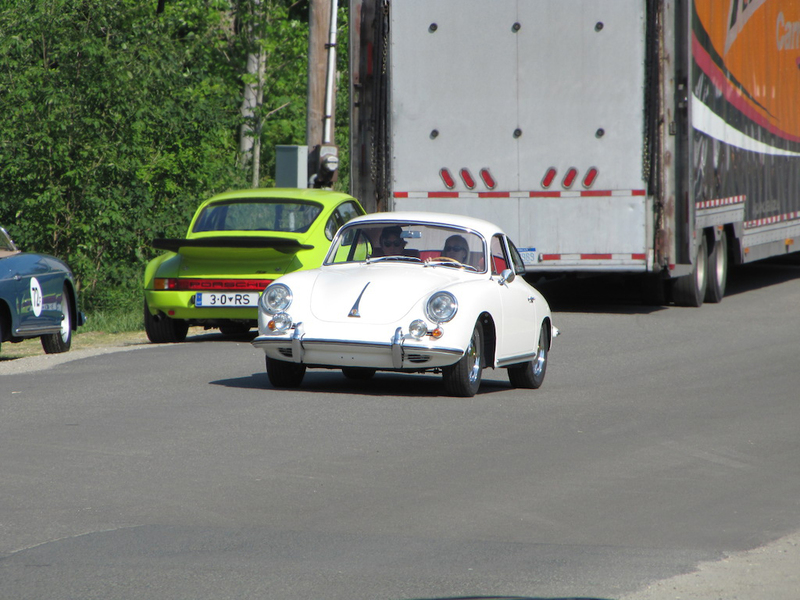 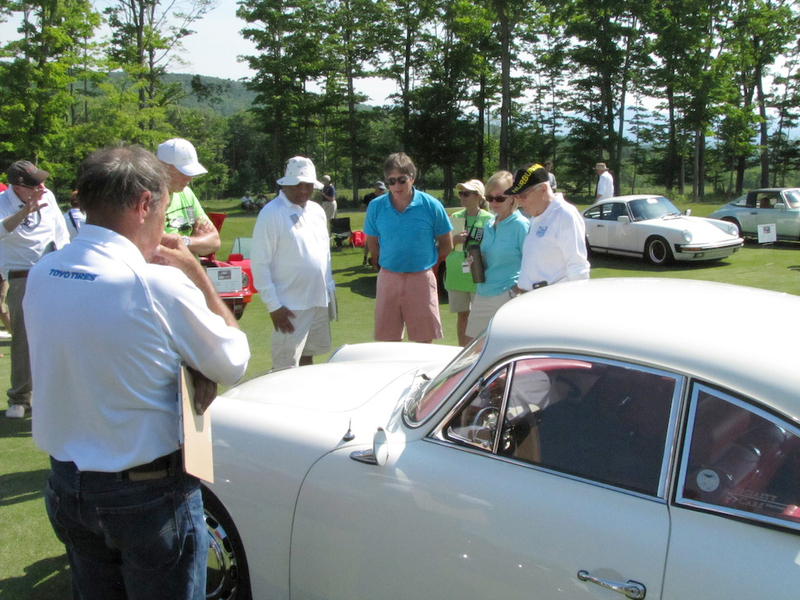 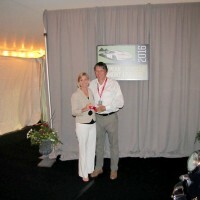 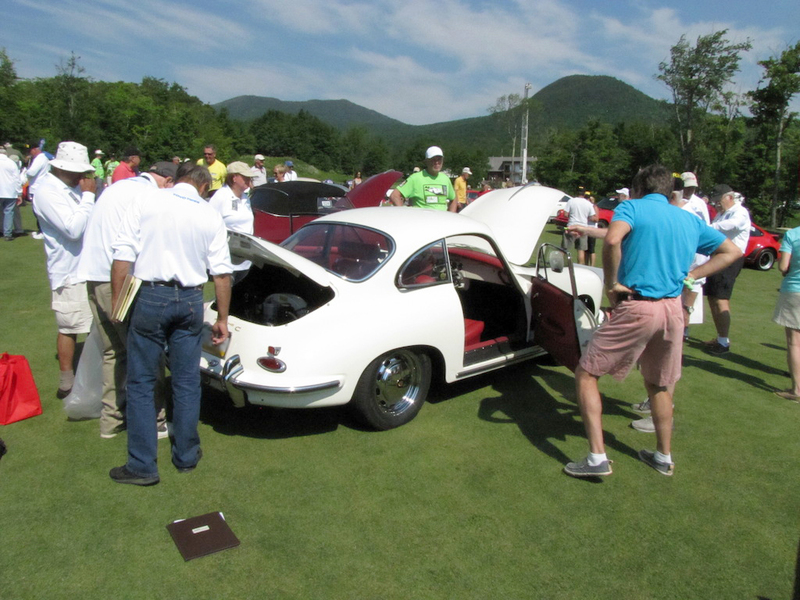 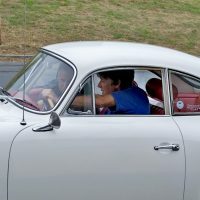 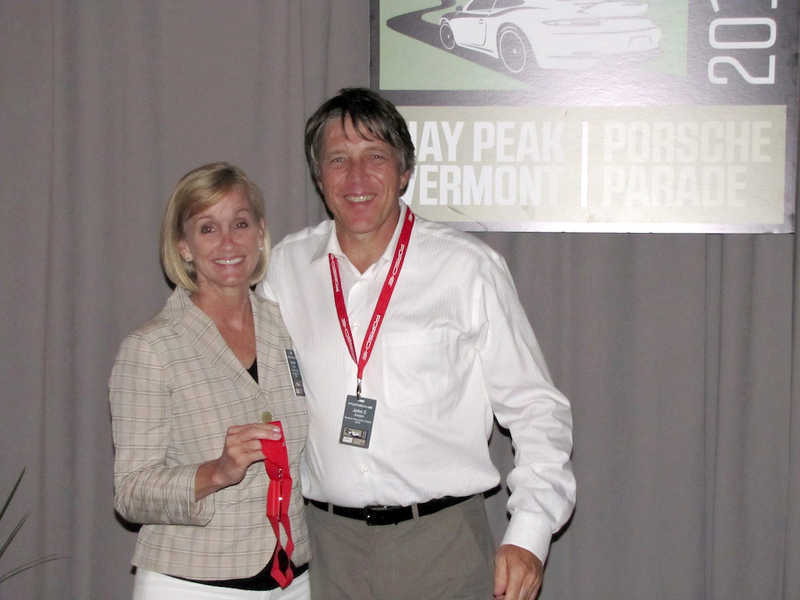 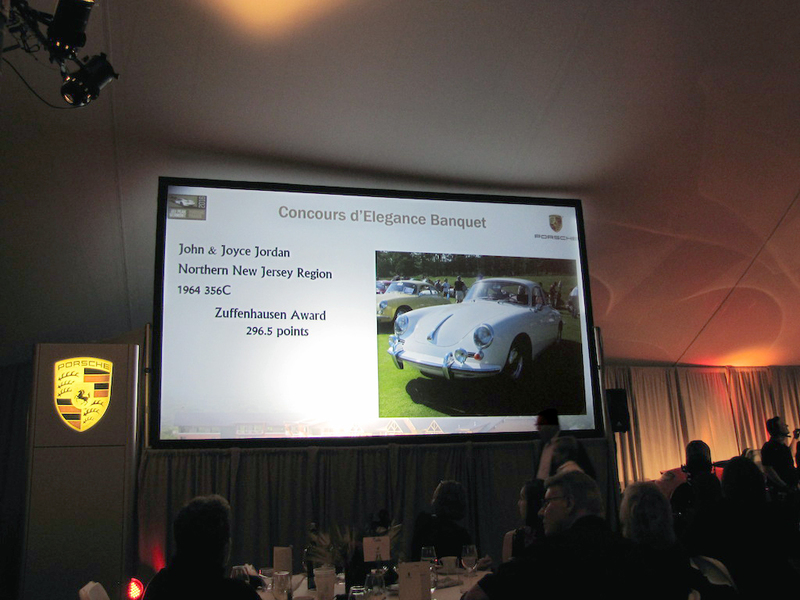 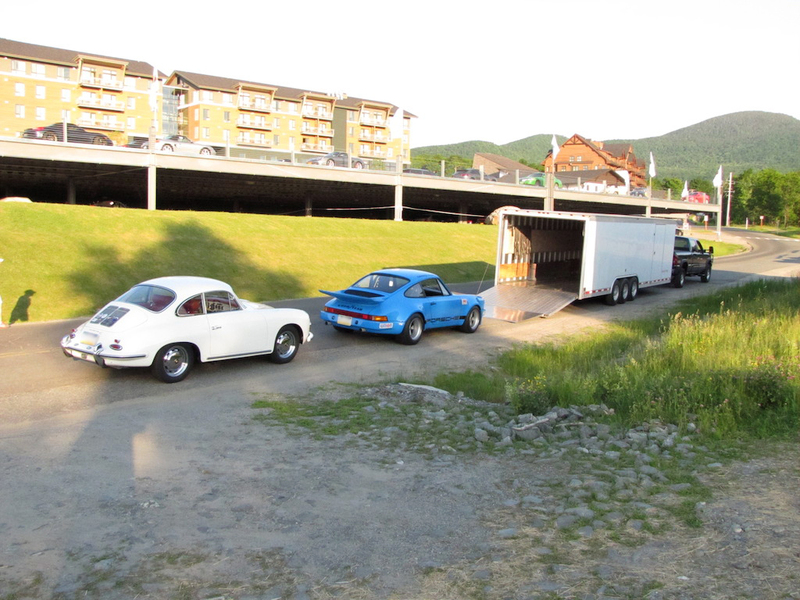 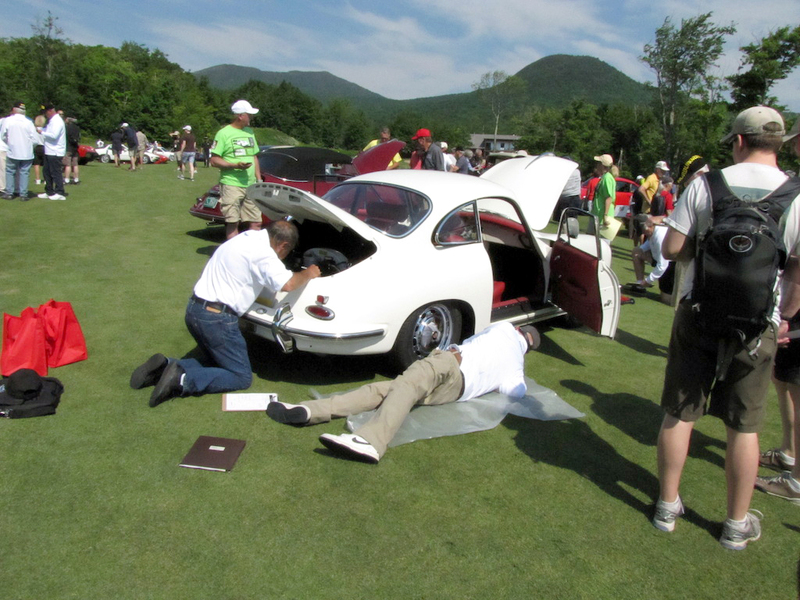 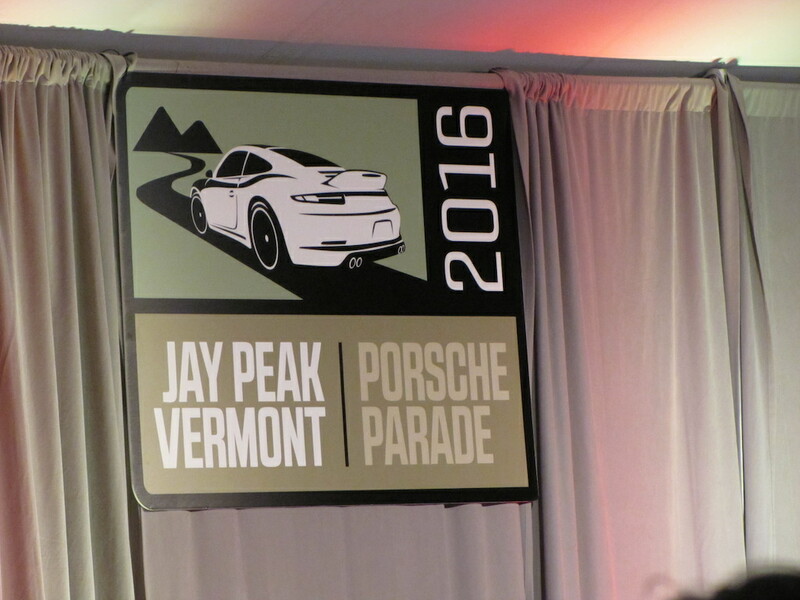 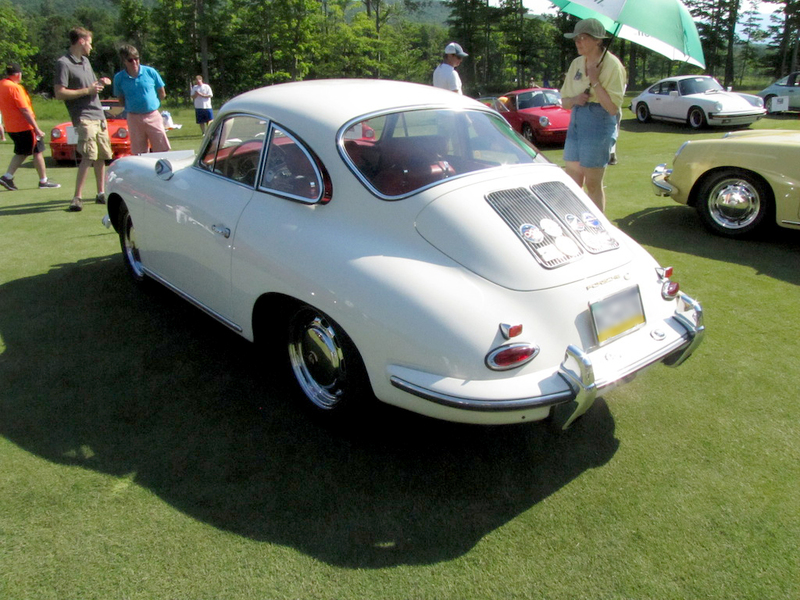 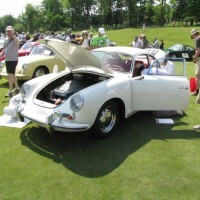 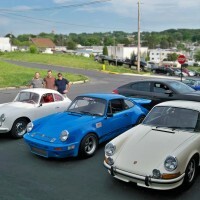 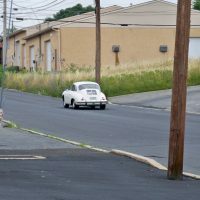 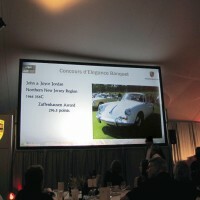 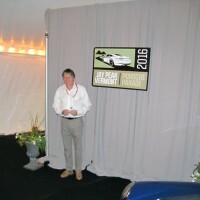 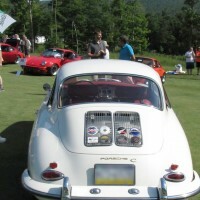 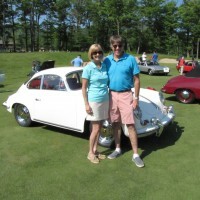 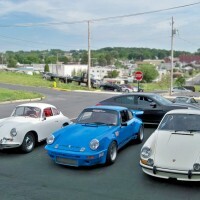 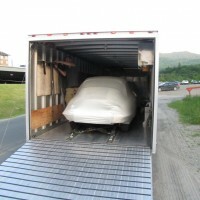 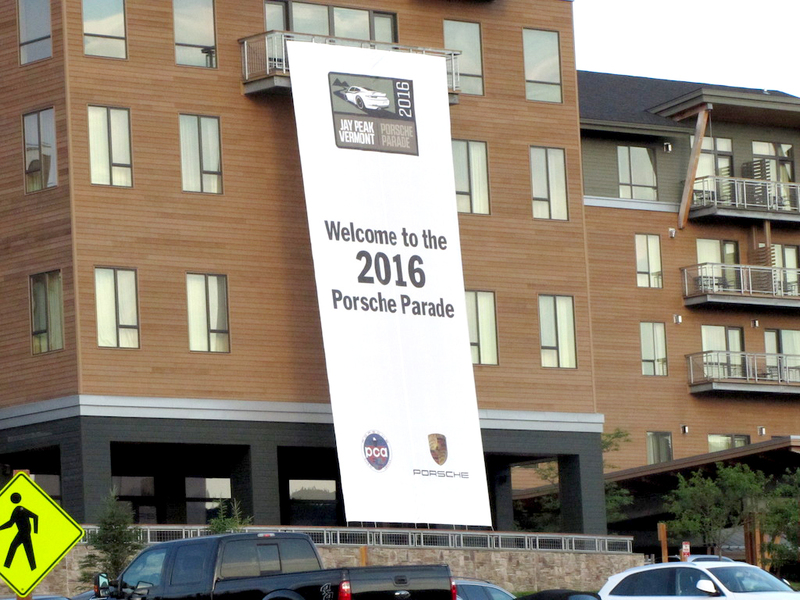 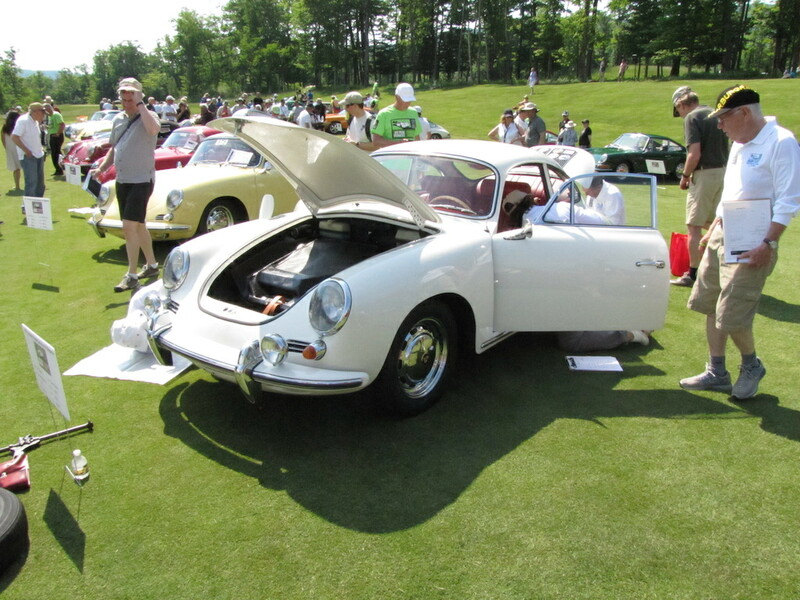 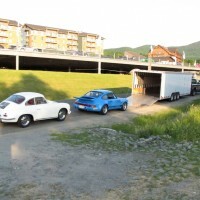 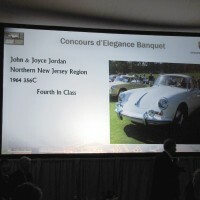 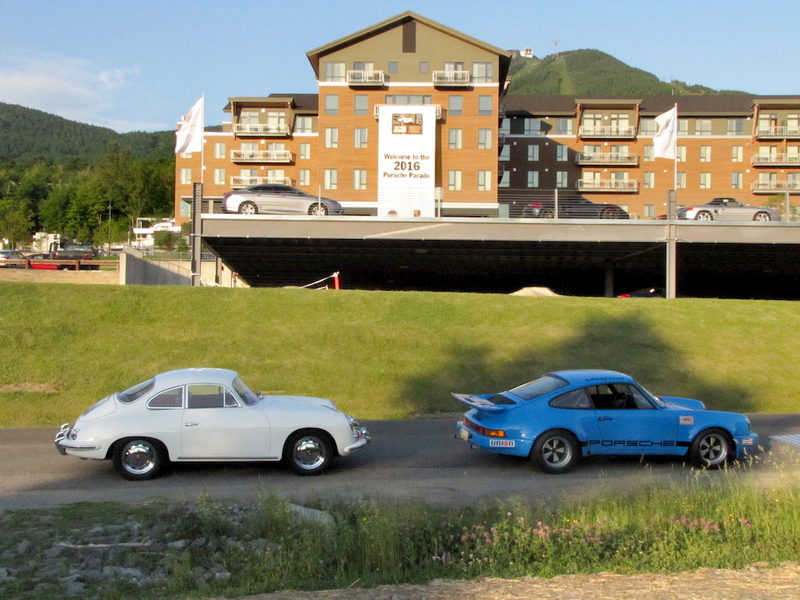 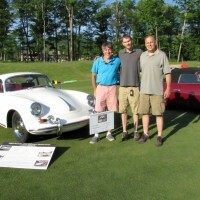 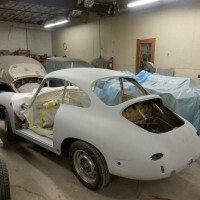 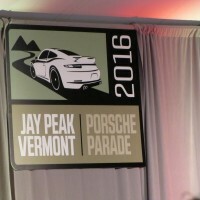 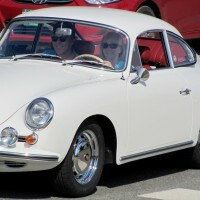 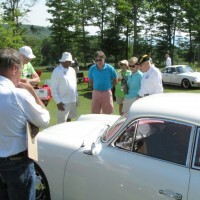 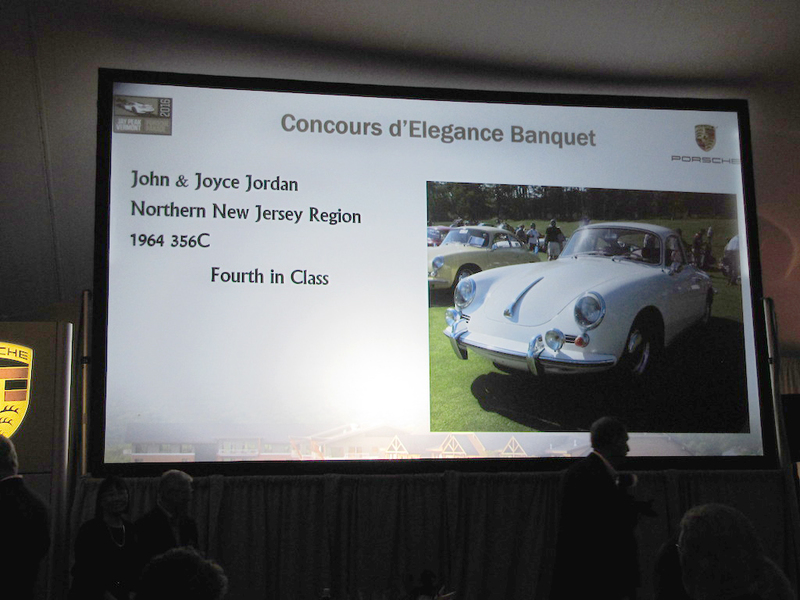 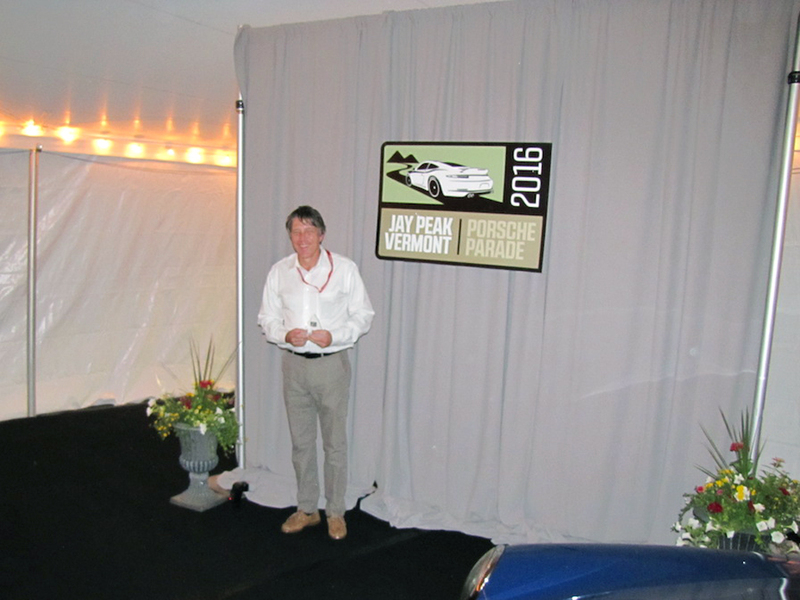 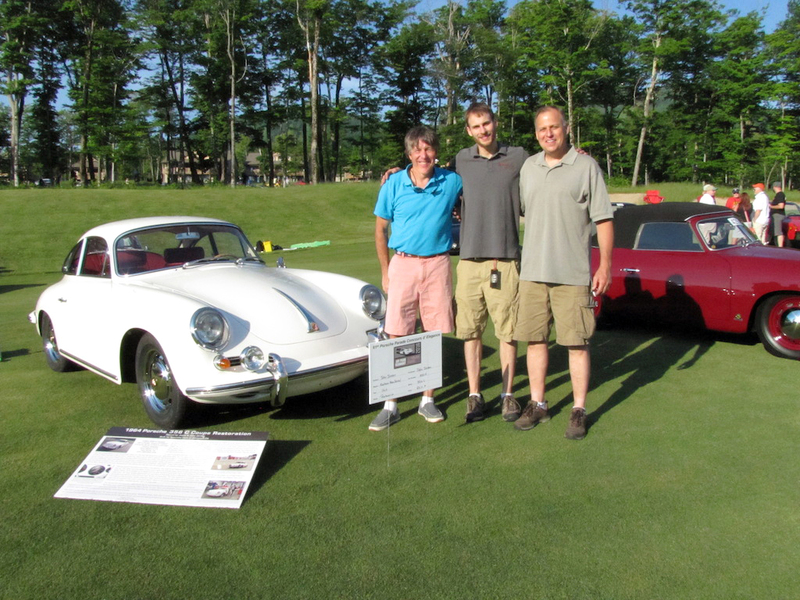 This restoration has since been completed and the car recently had its first debut in the 2016 61st Annual Porsche Parade in Jay Peak, Vermont, were it took an honorable 4th place. 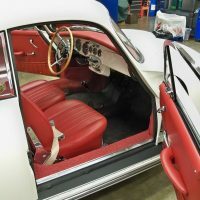 Check out pictures below. 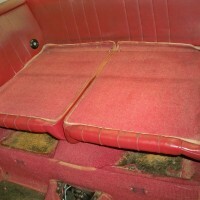 Original carpet and seat backs. 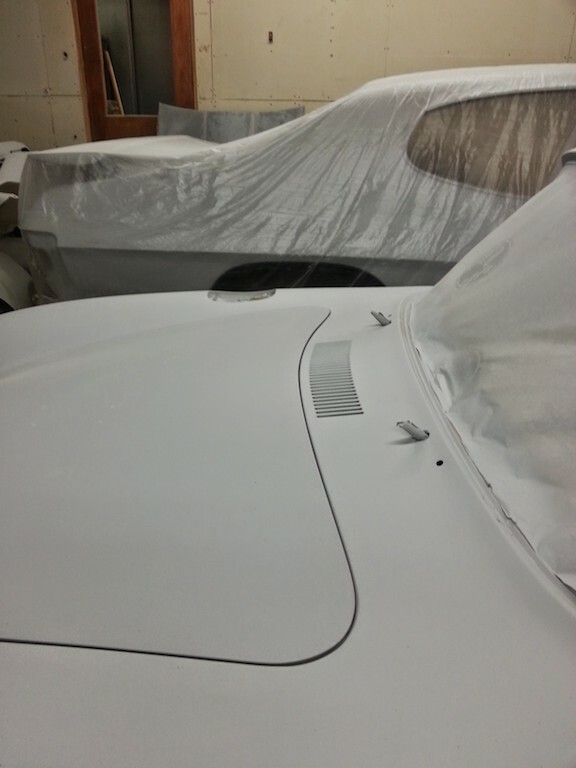 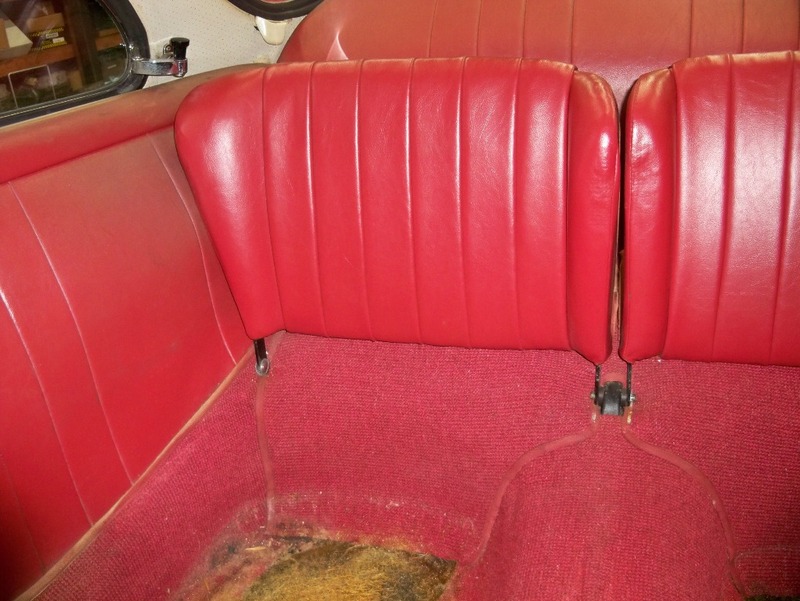 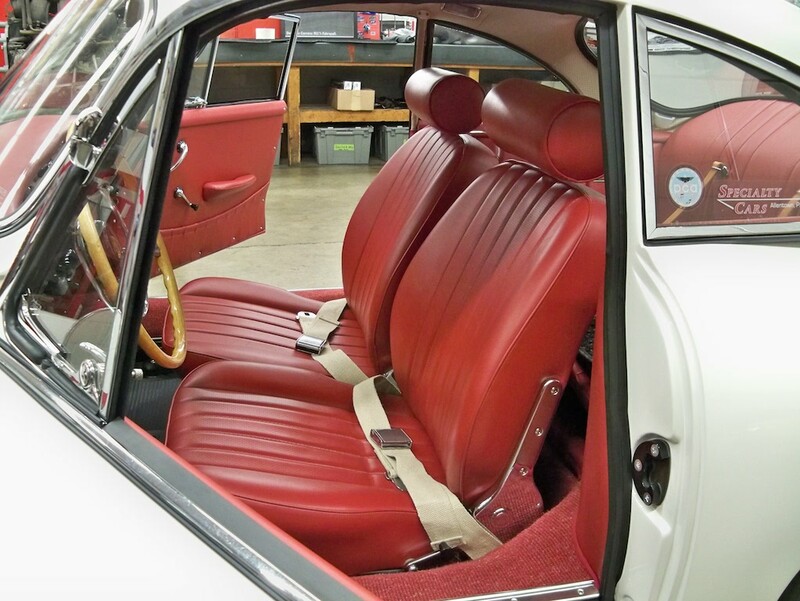 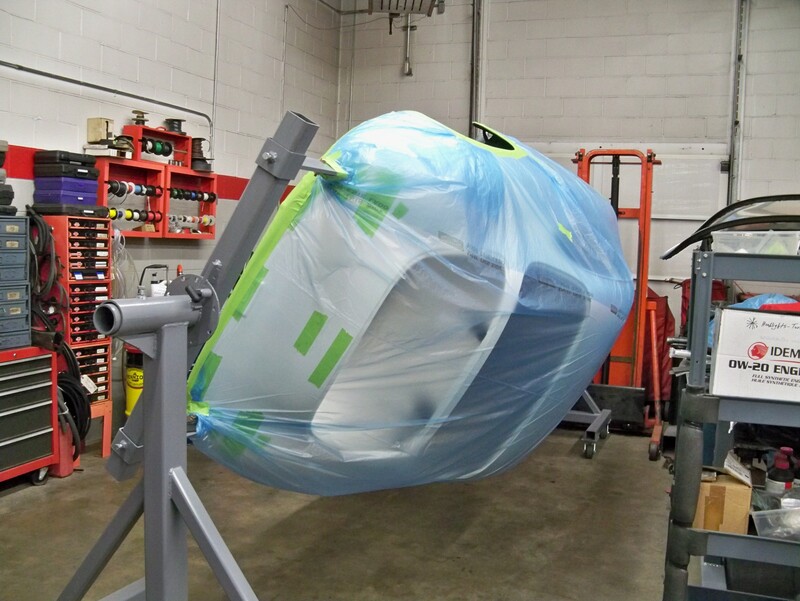 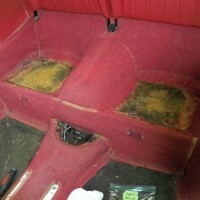 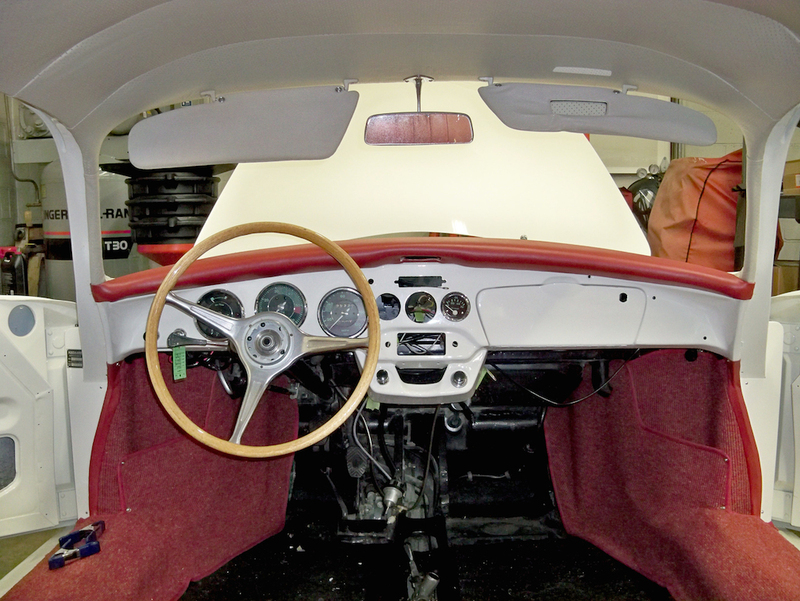 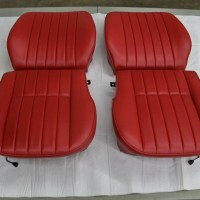 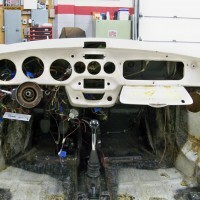 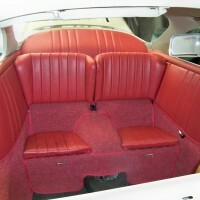 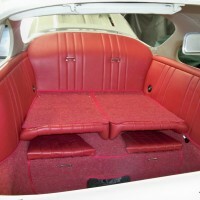 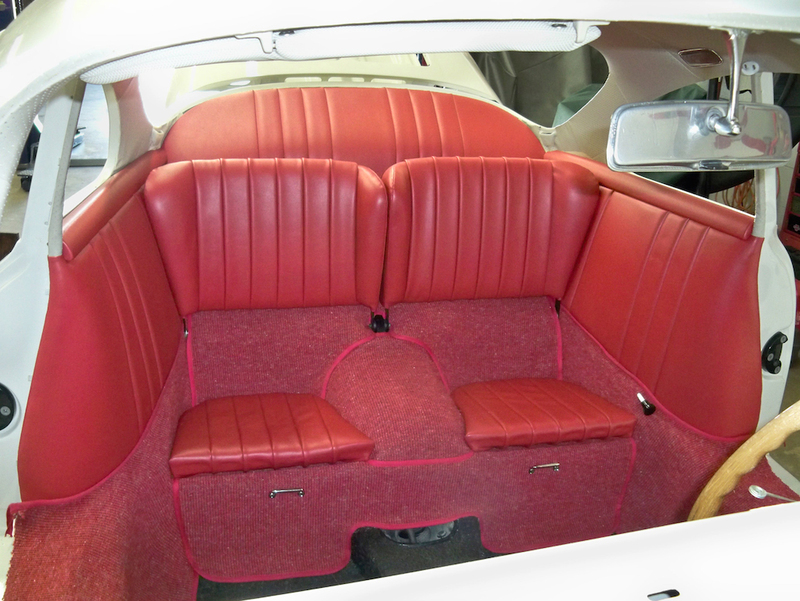 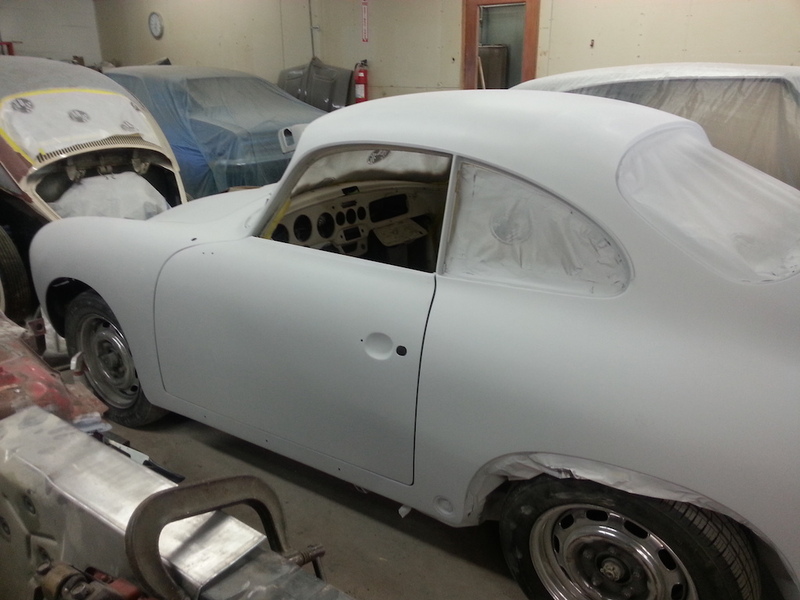 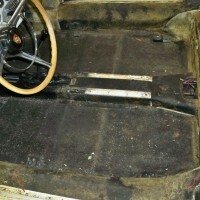 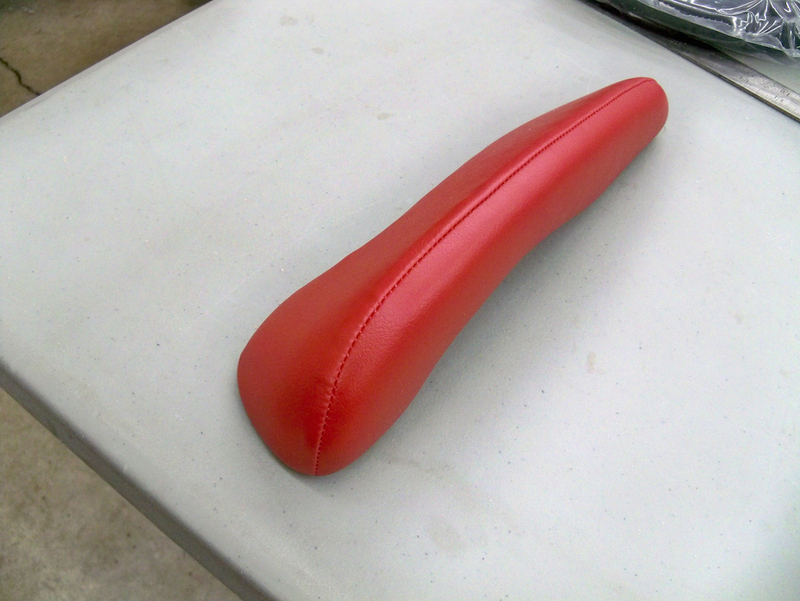 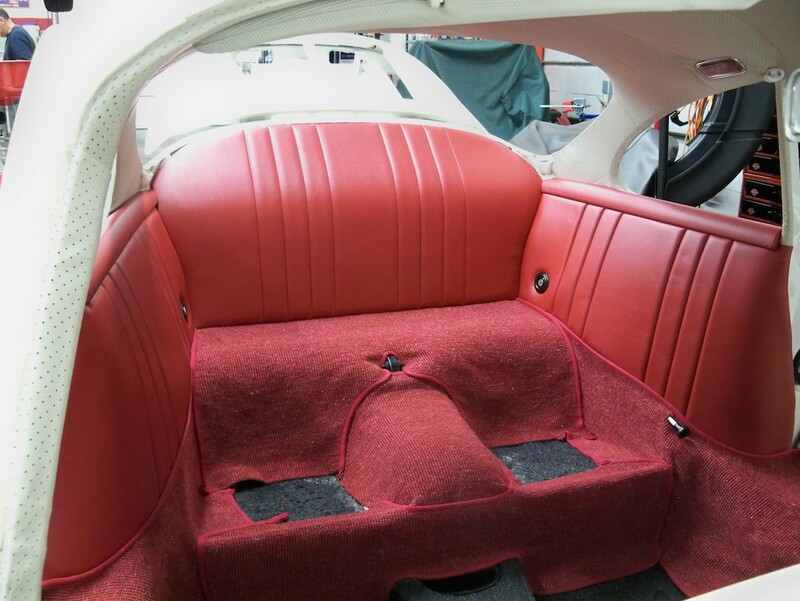 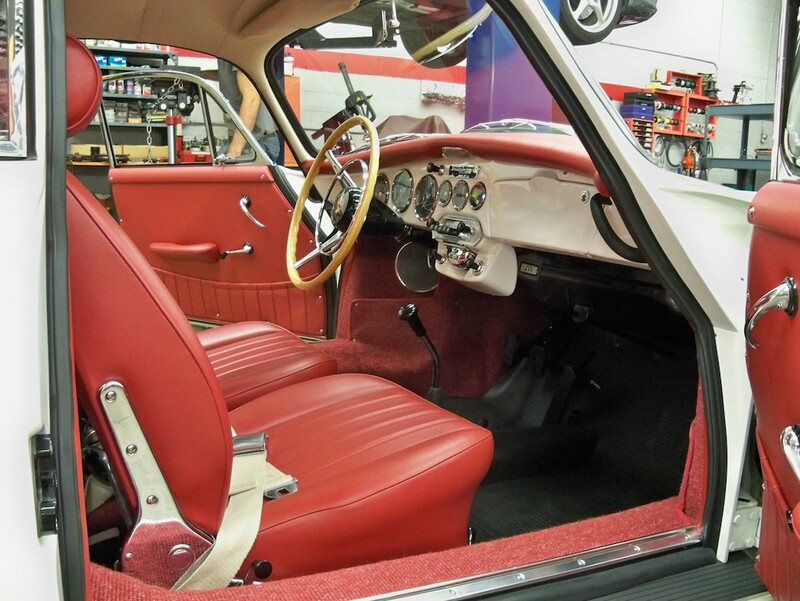 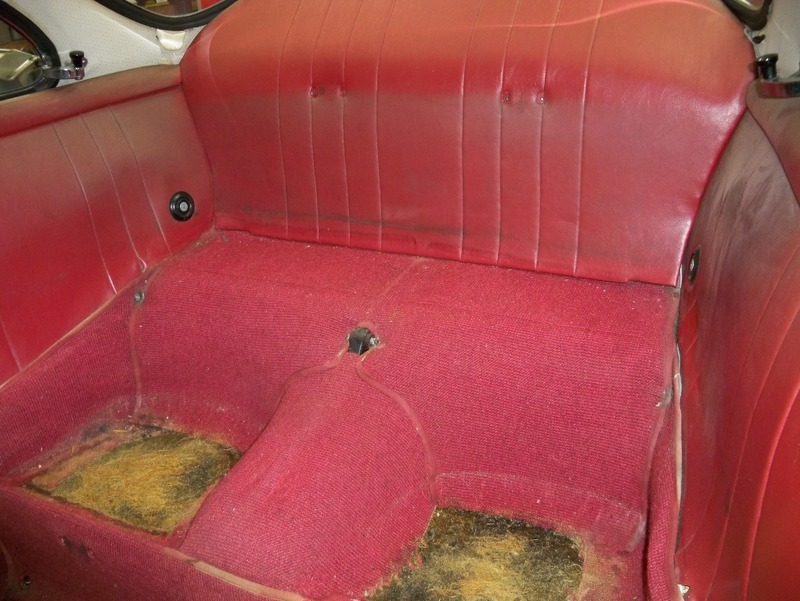 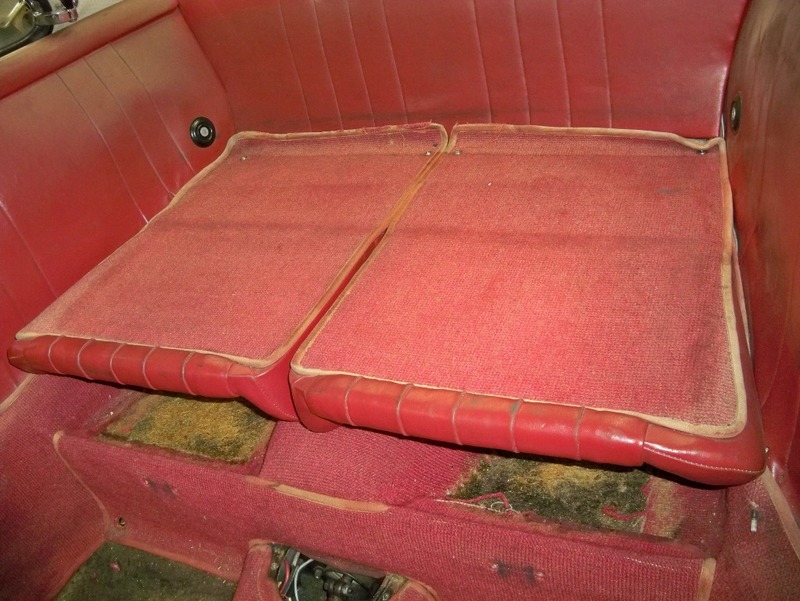 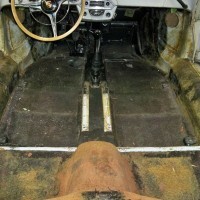 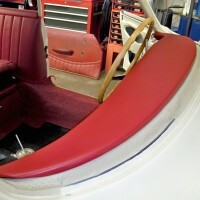 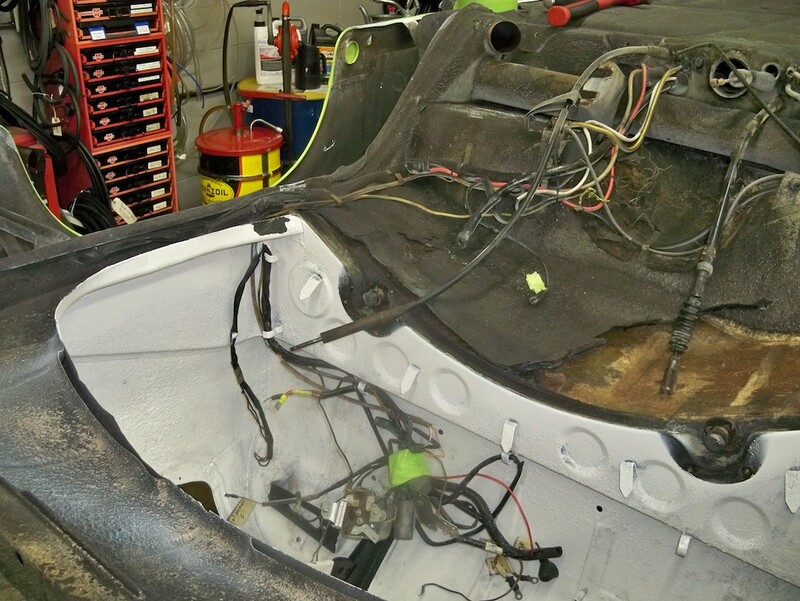 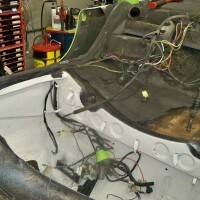 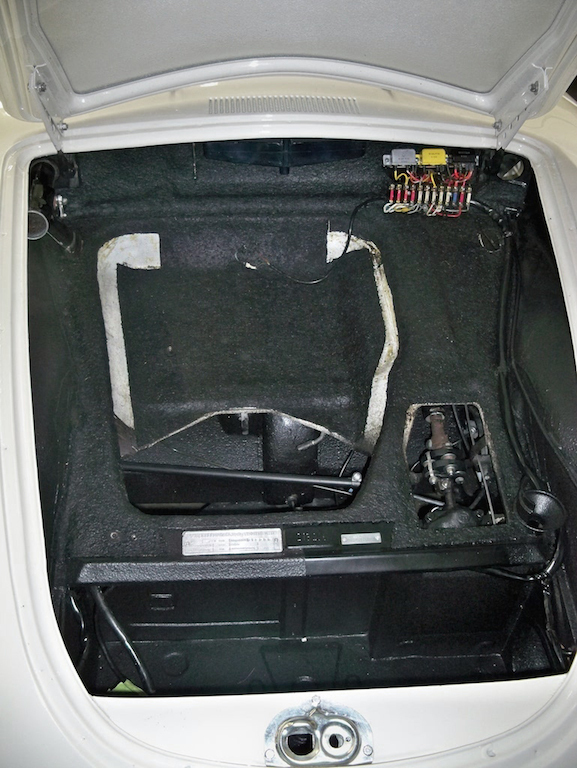 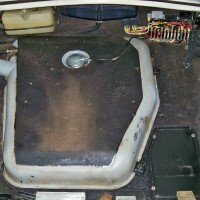 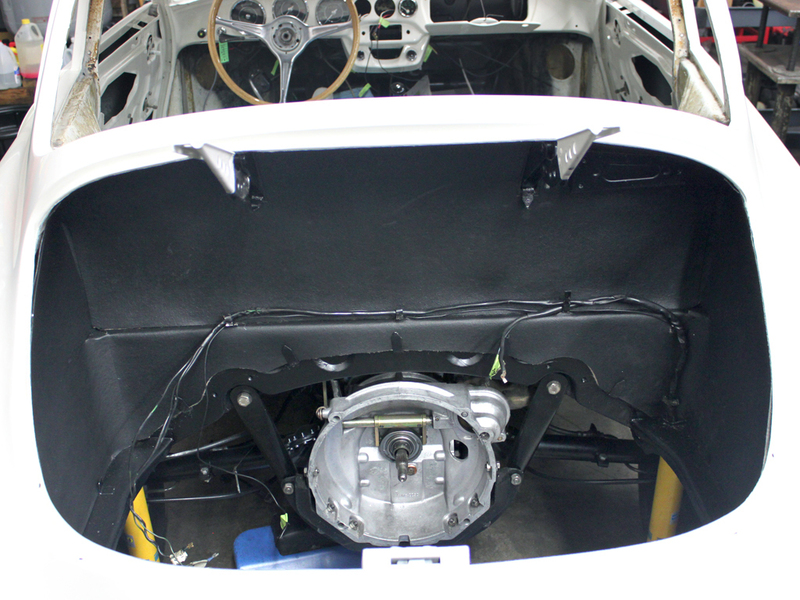 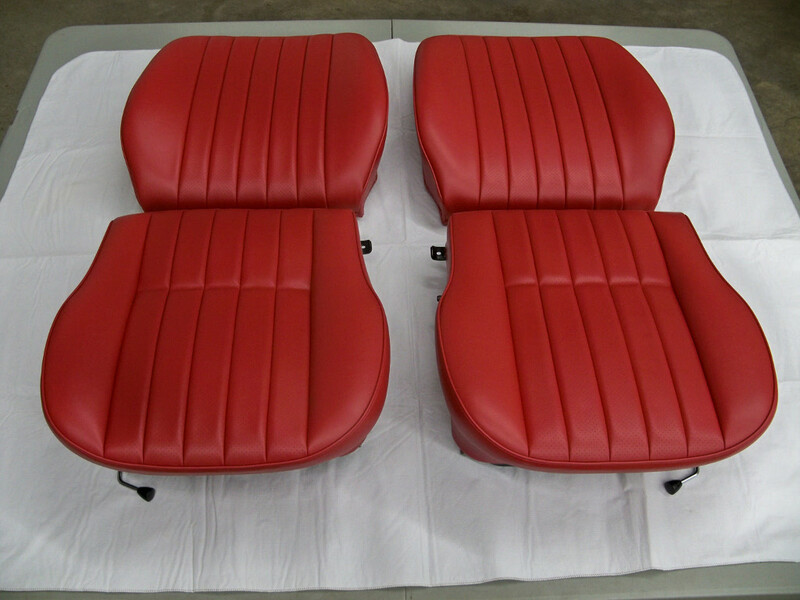 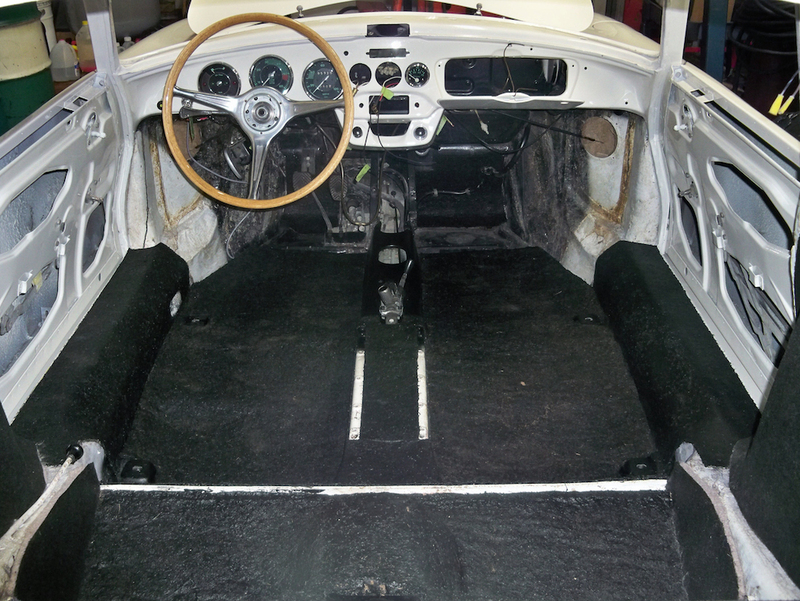 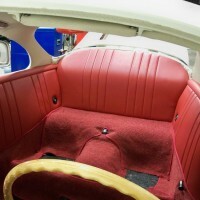 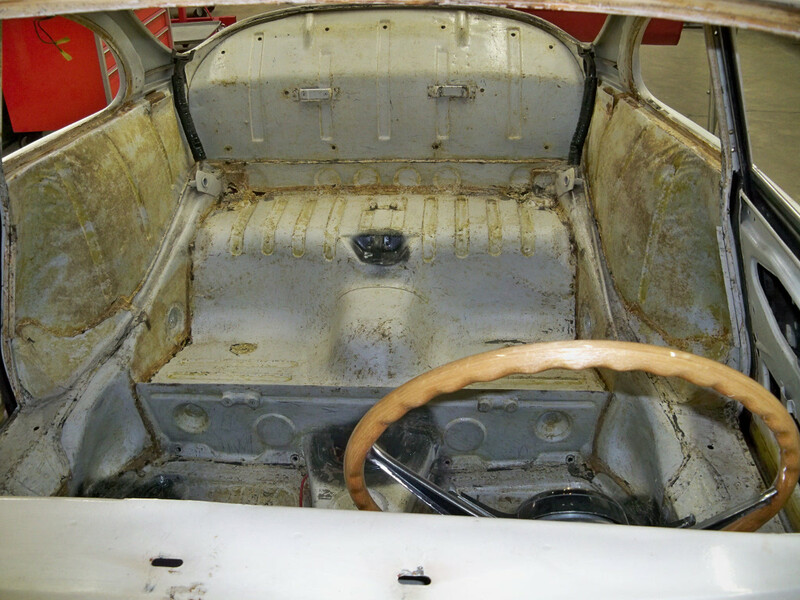 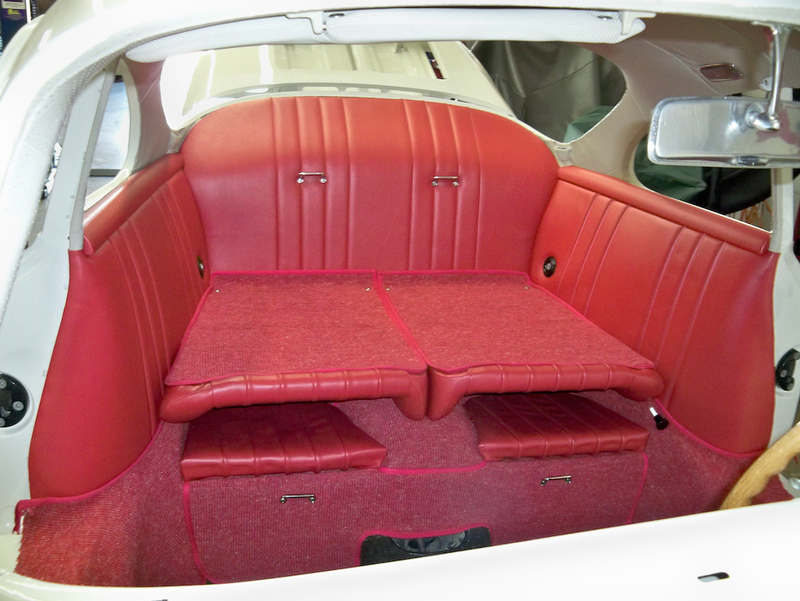 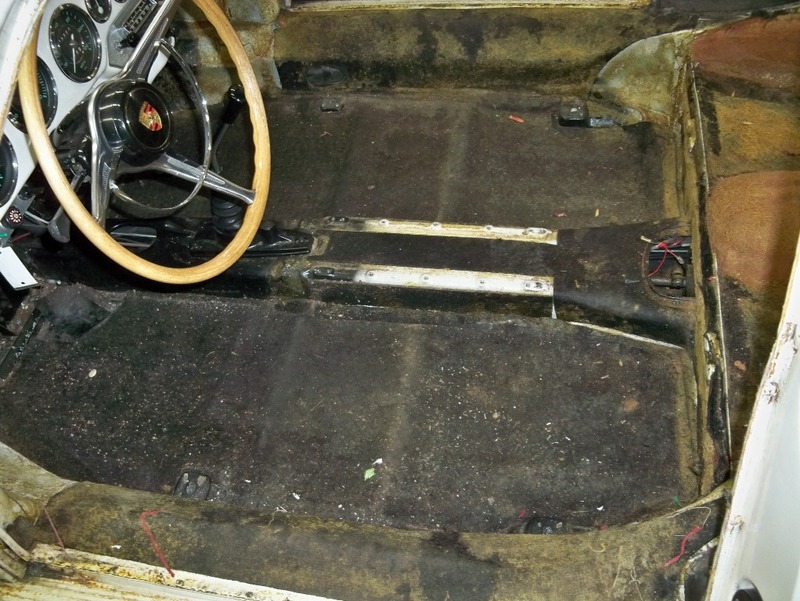 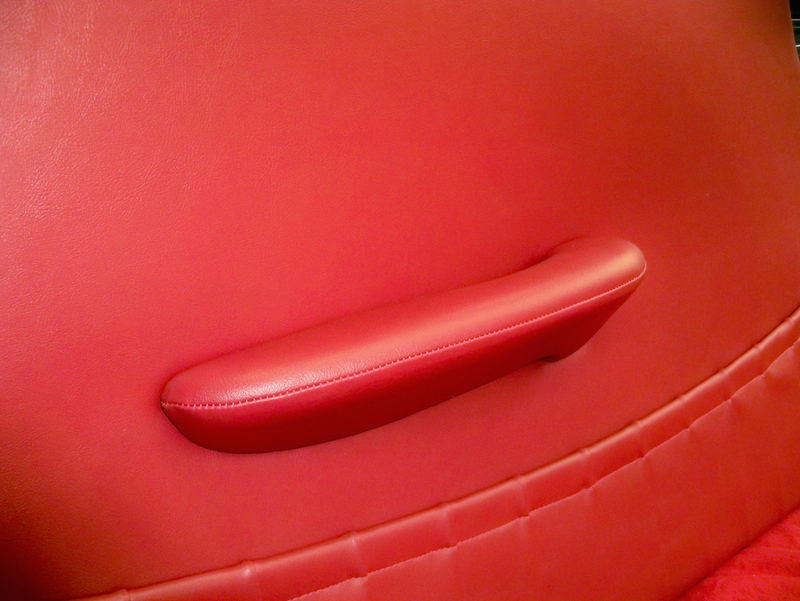 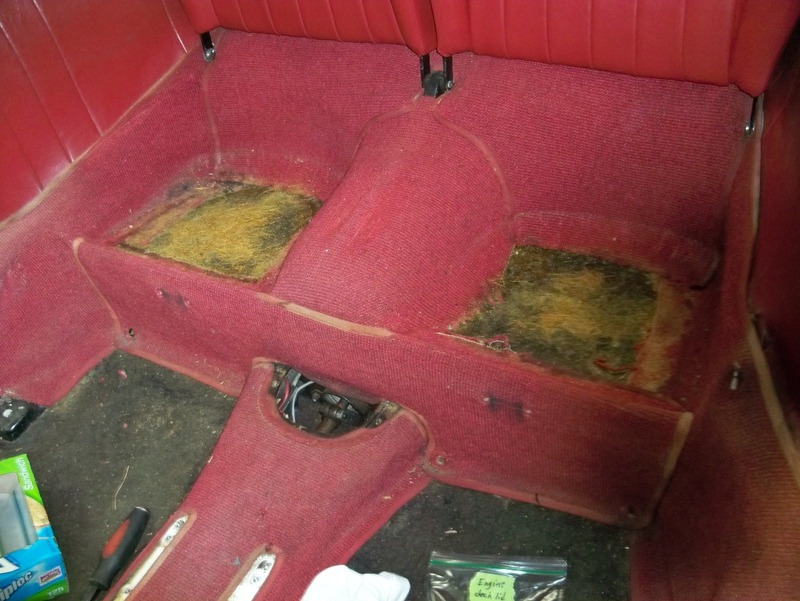 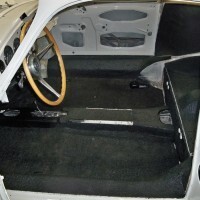 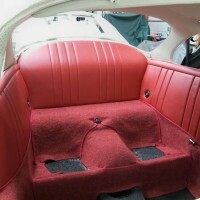 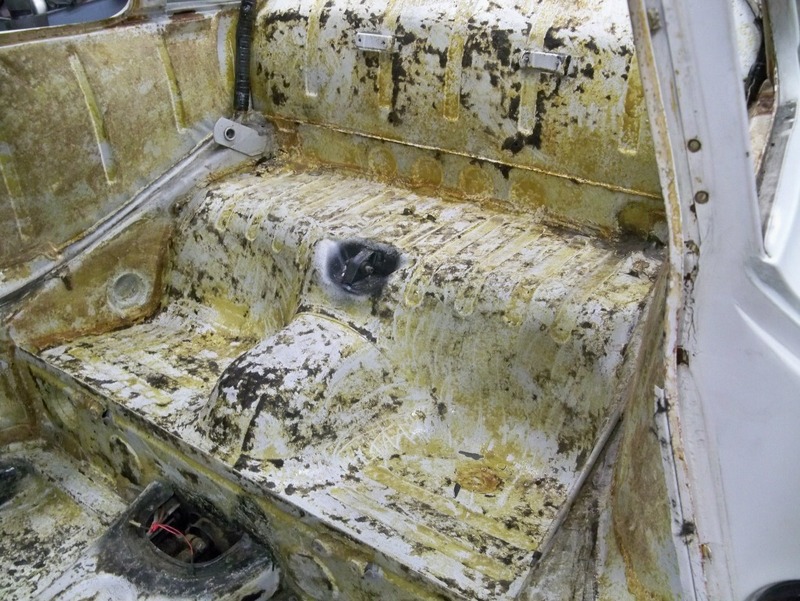 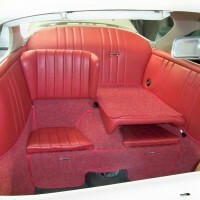 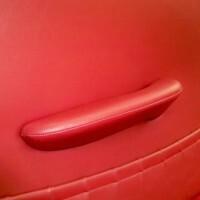 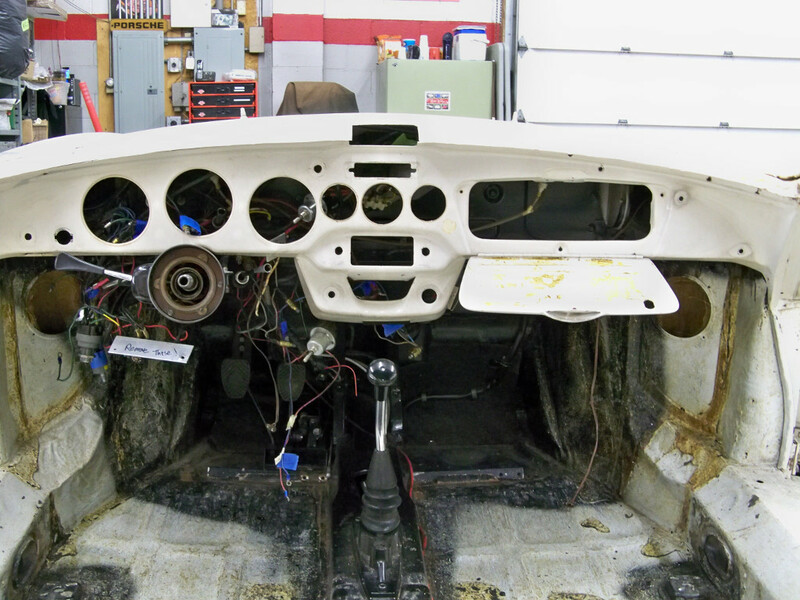 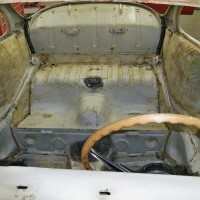 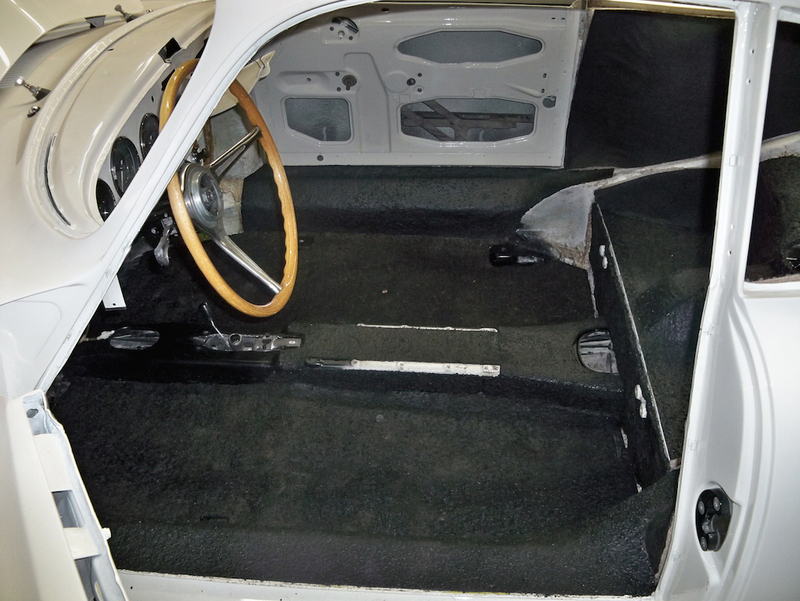 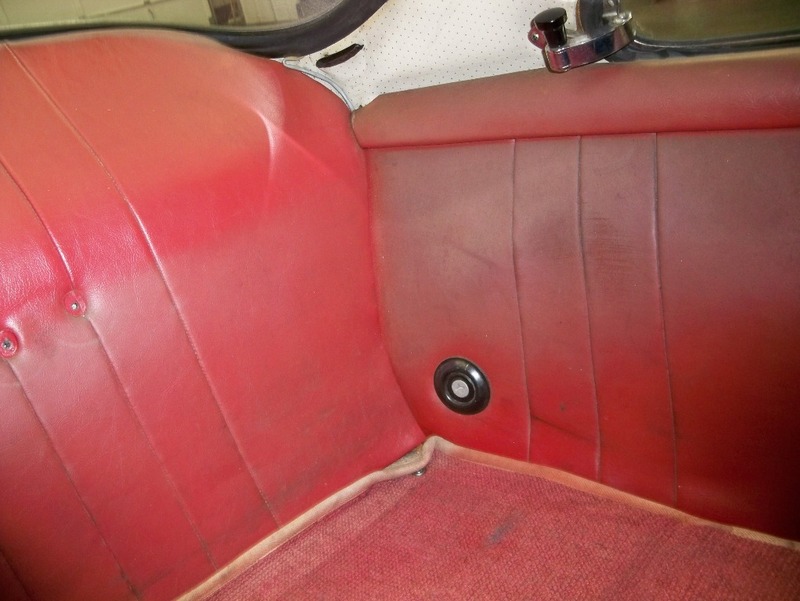 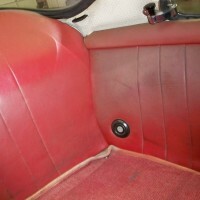 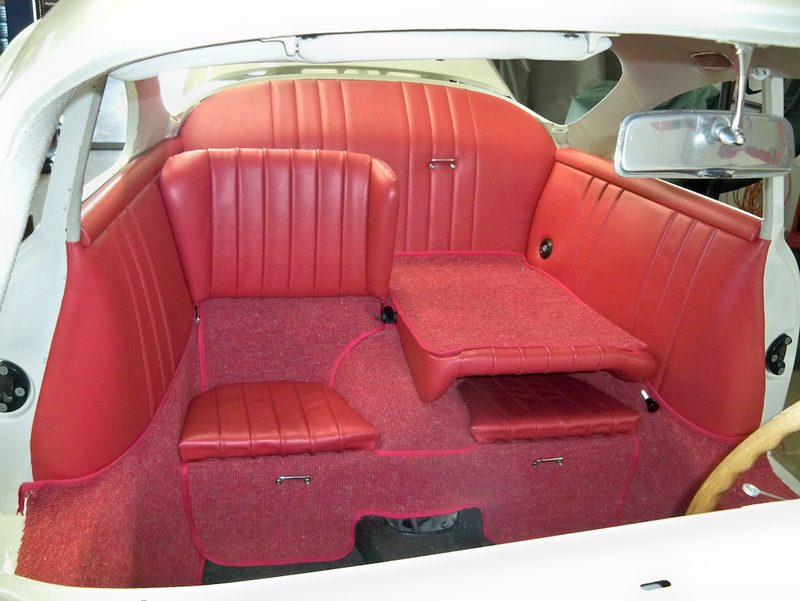 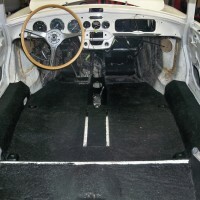 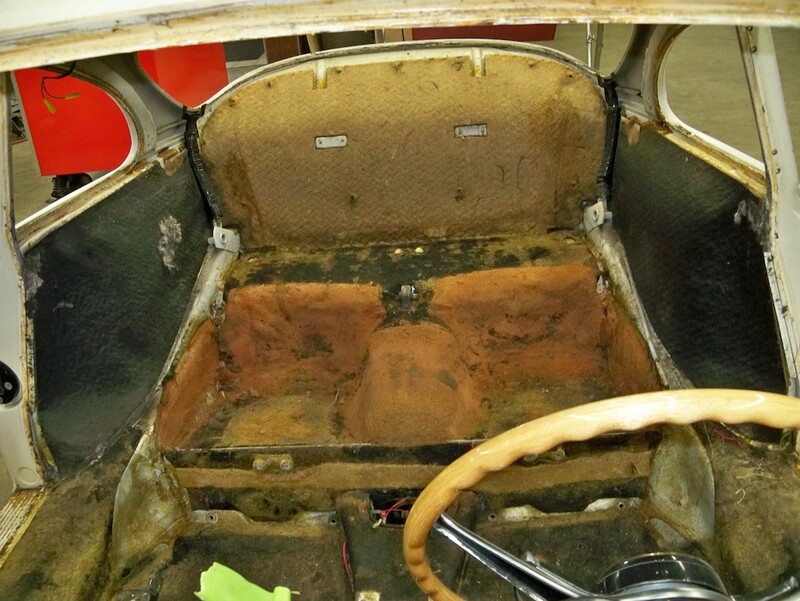 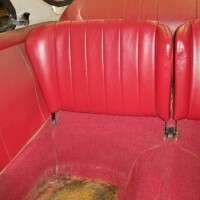 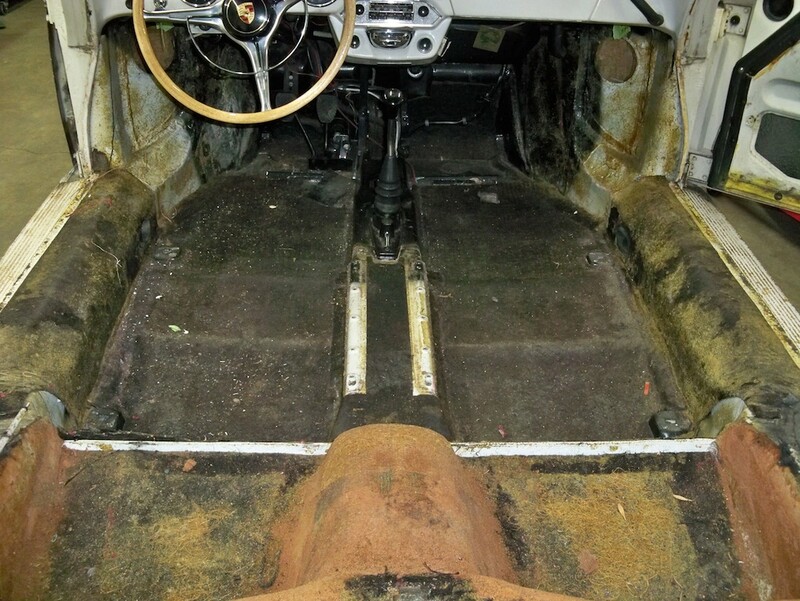 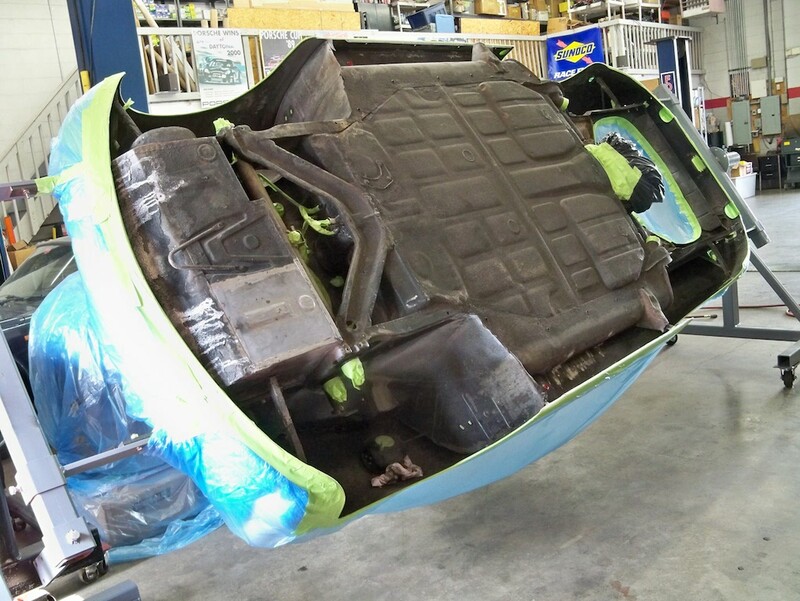 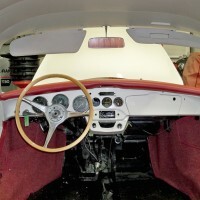 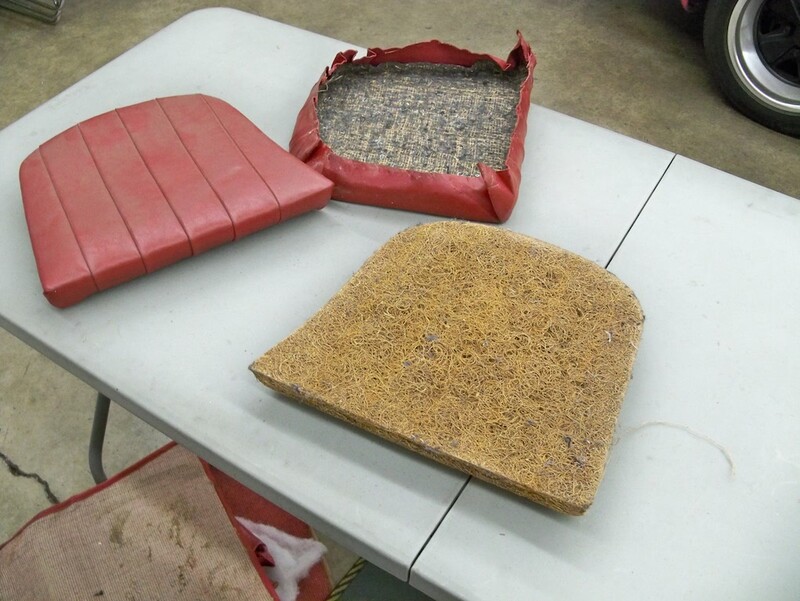 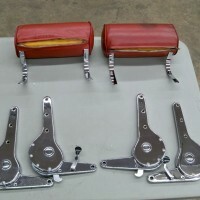 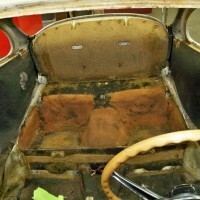 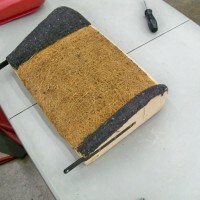 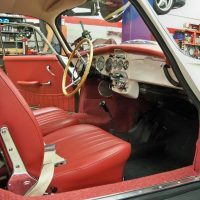 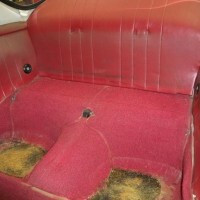 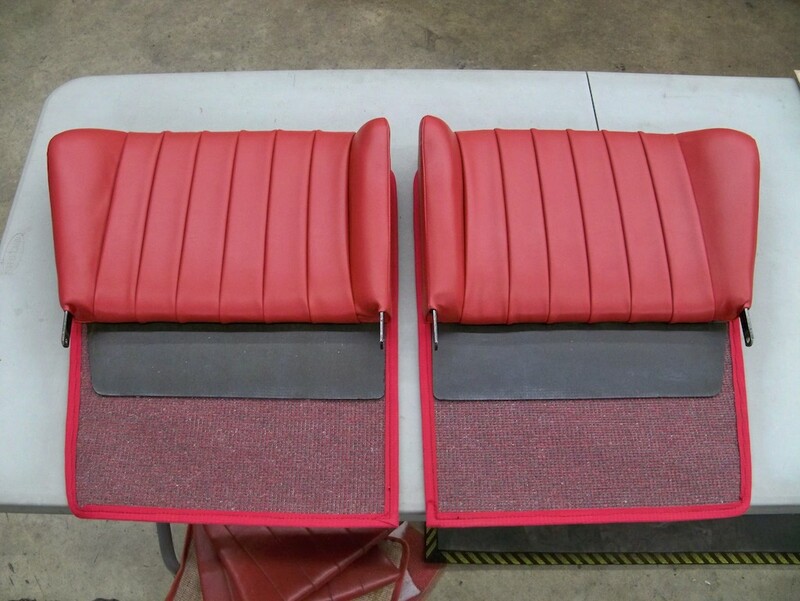 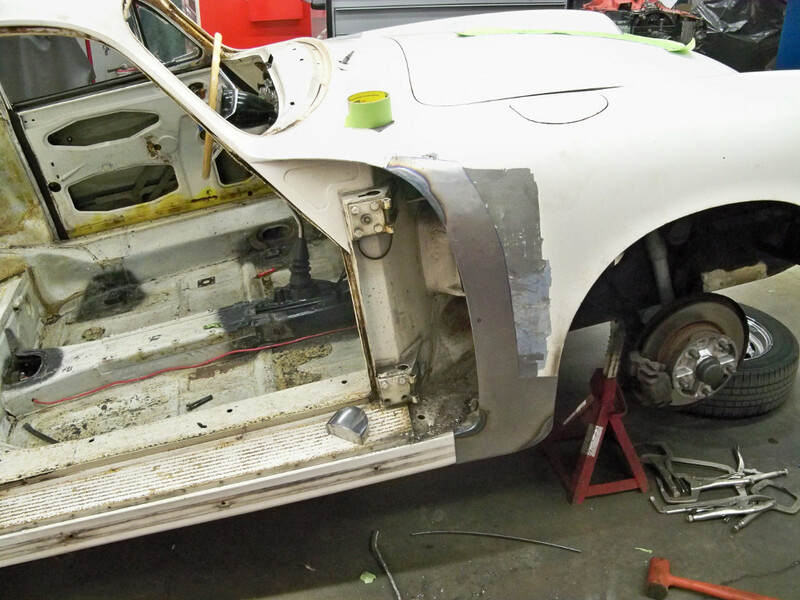 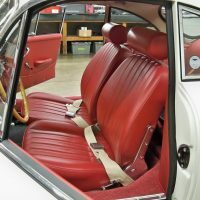 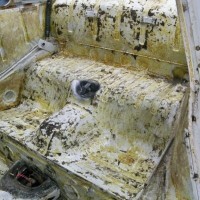 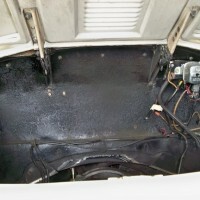 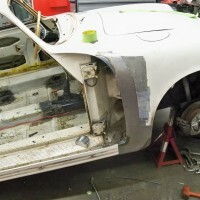 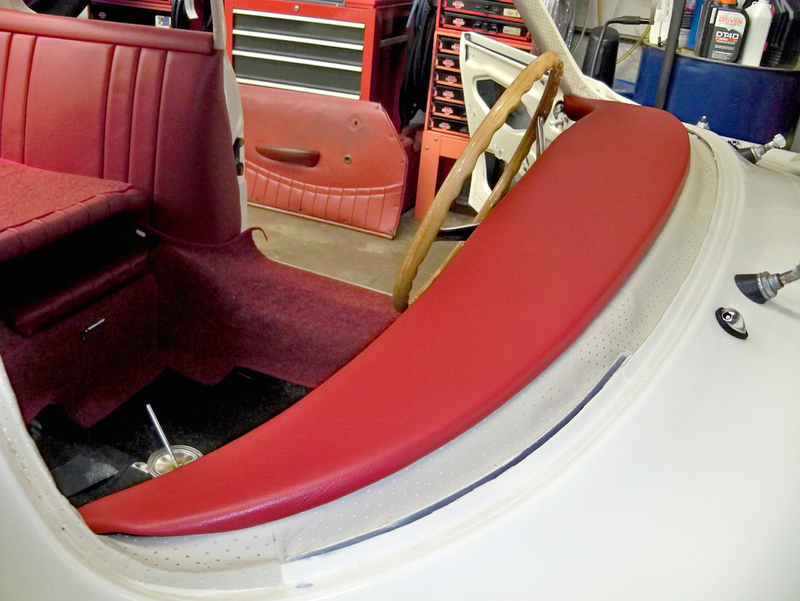 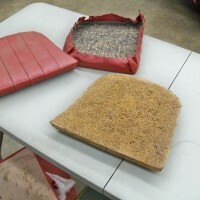 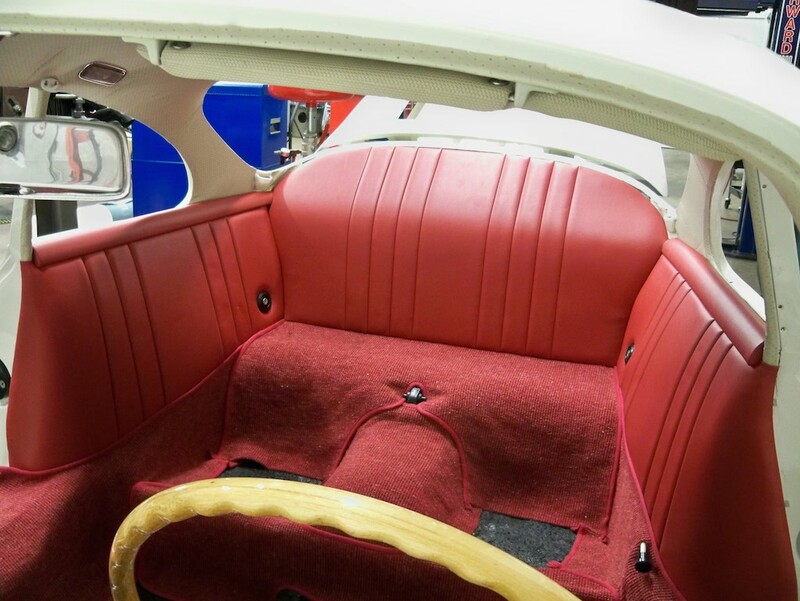 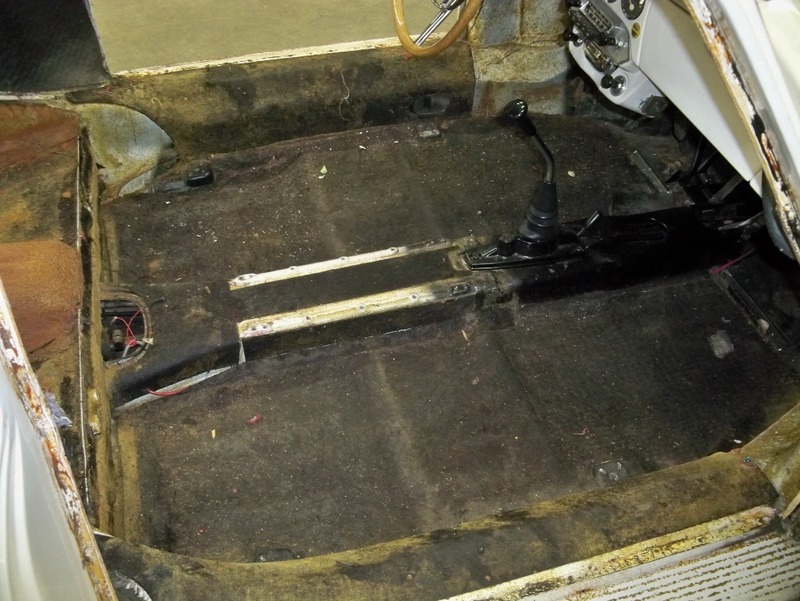 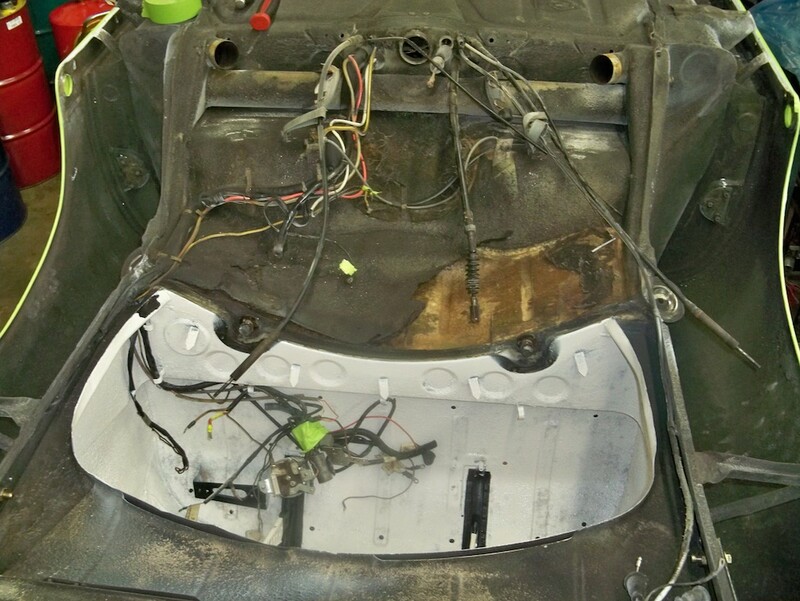 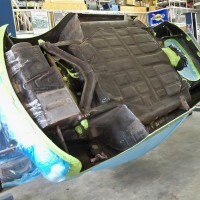 All of the original interior is being removed, and new upholstery will be installed after the car is painted. 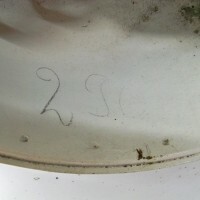 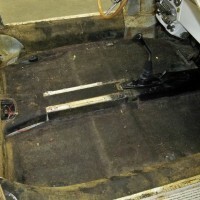 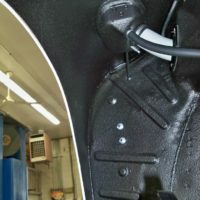 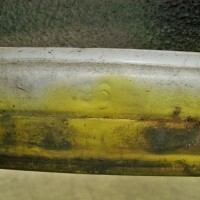 This photo shows the original crayon markings indicating the last 3 digits of the cars VIN number, still visible from when this car was being assembled back in 1964. 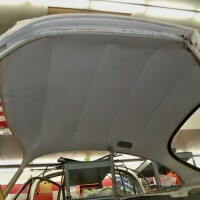 Original headliner will be replaced with new. 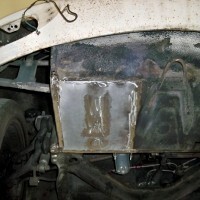 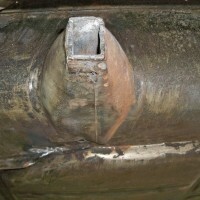 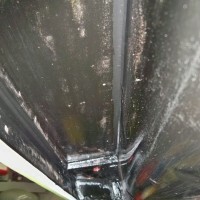 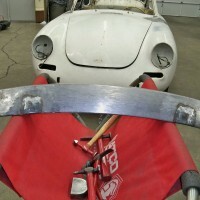 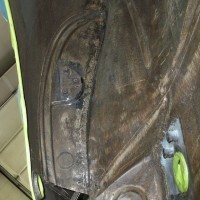 Prior metalwork in the front bumper is being corrected. 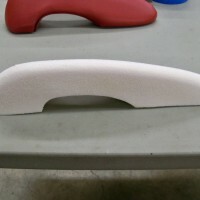 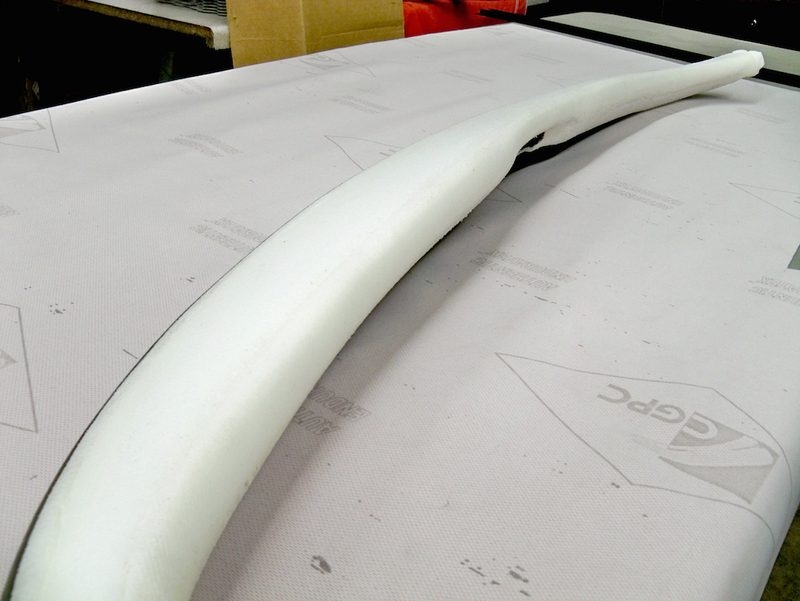 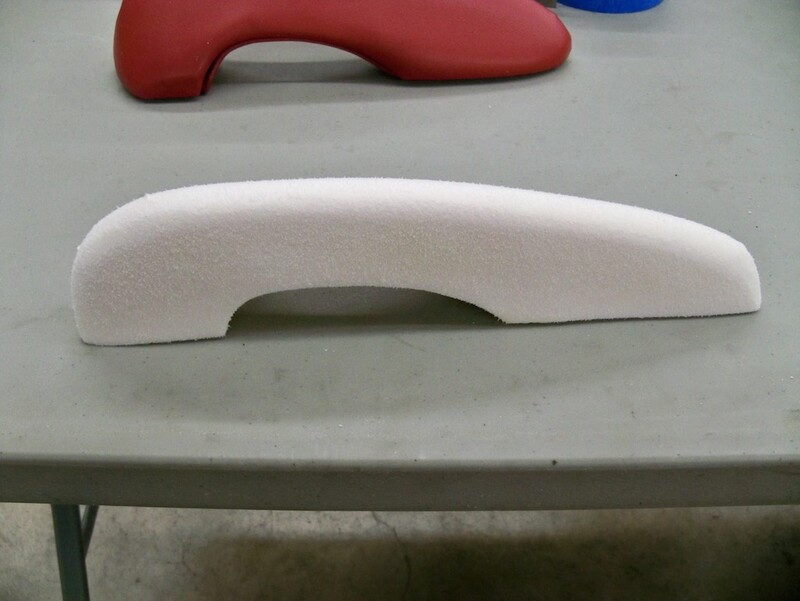 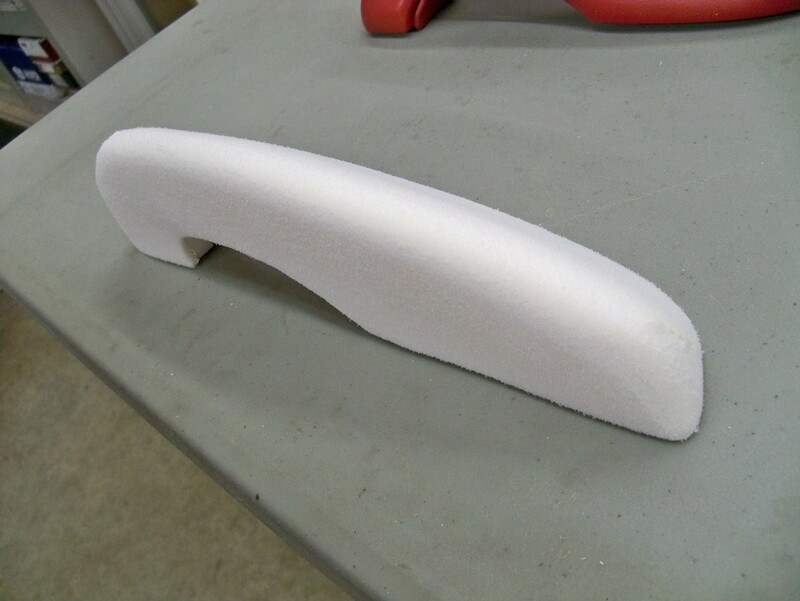 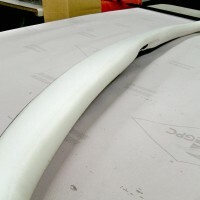 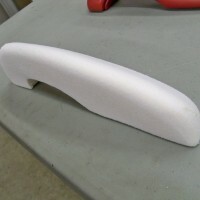 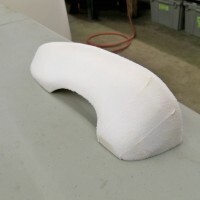 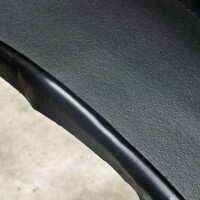 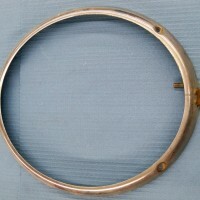 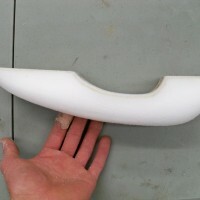 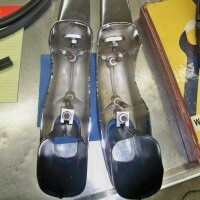 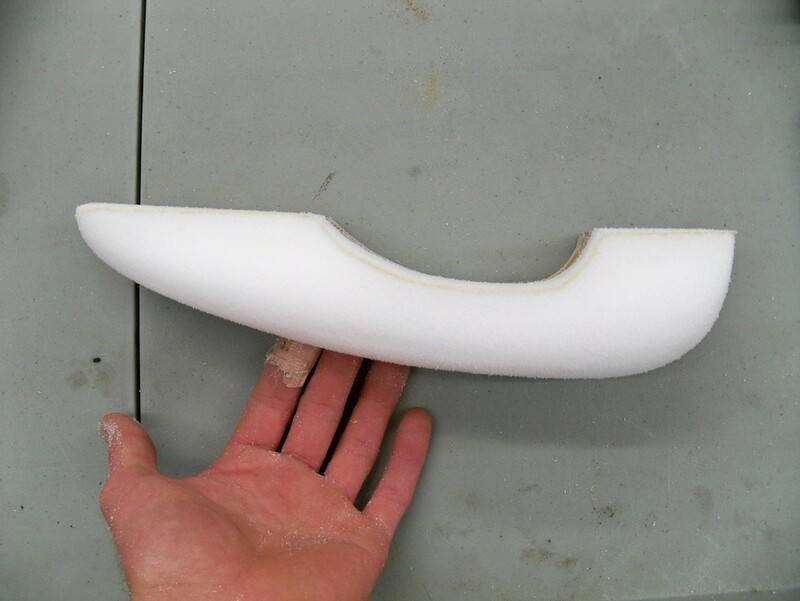 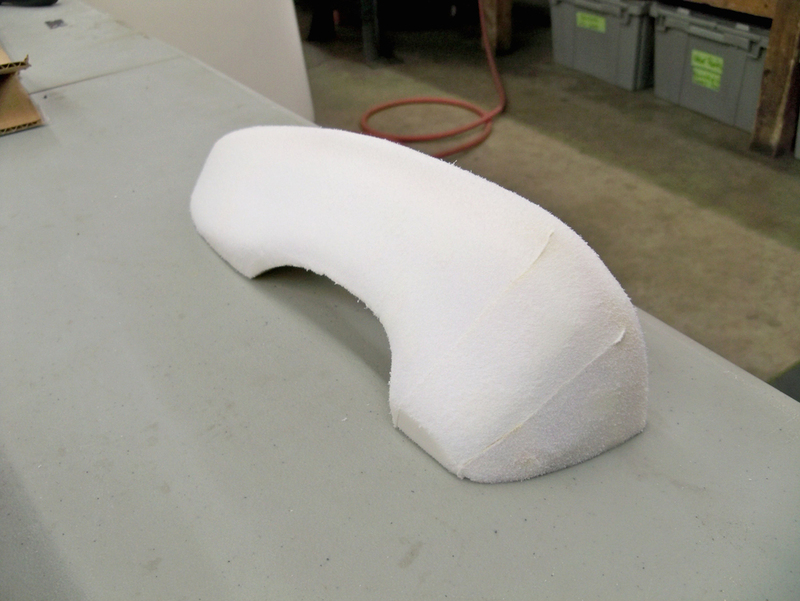 Here is the fender to body seam. 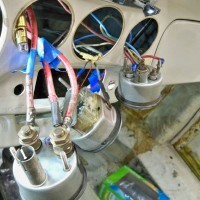 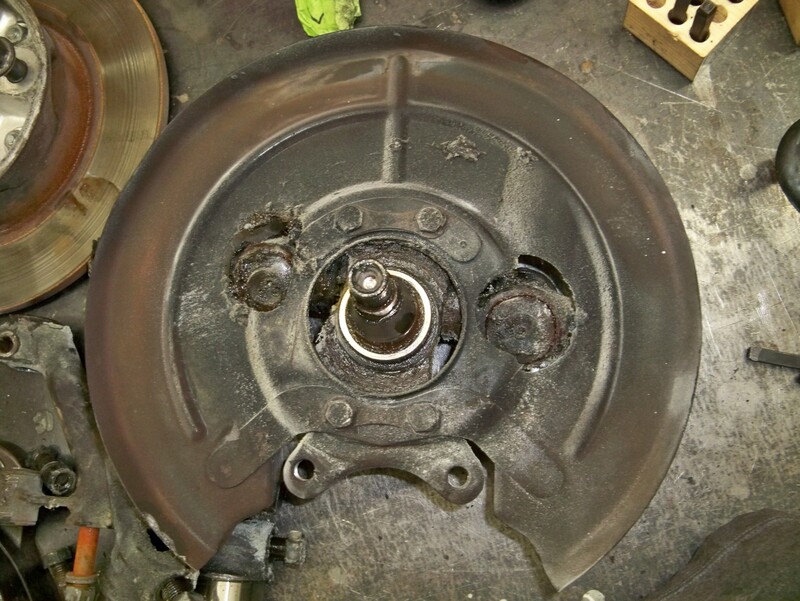 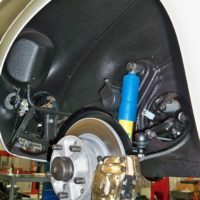 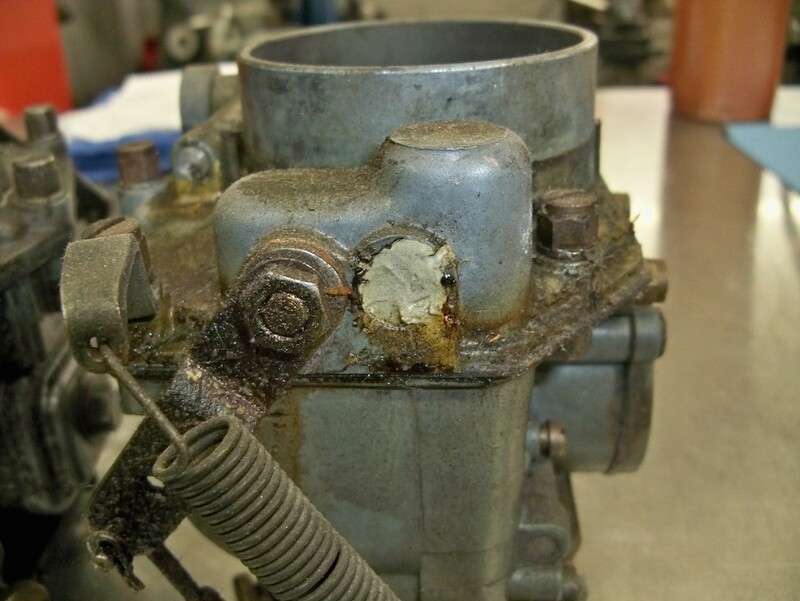 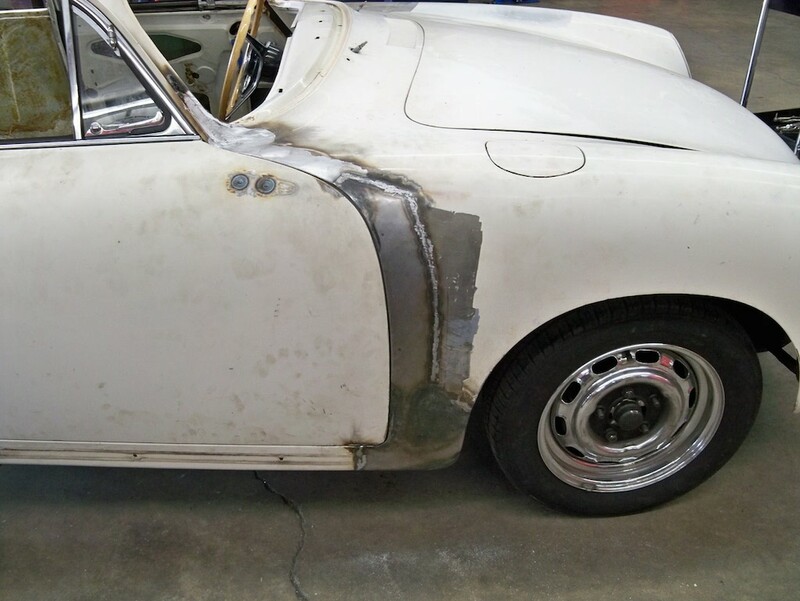 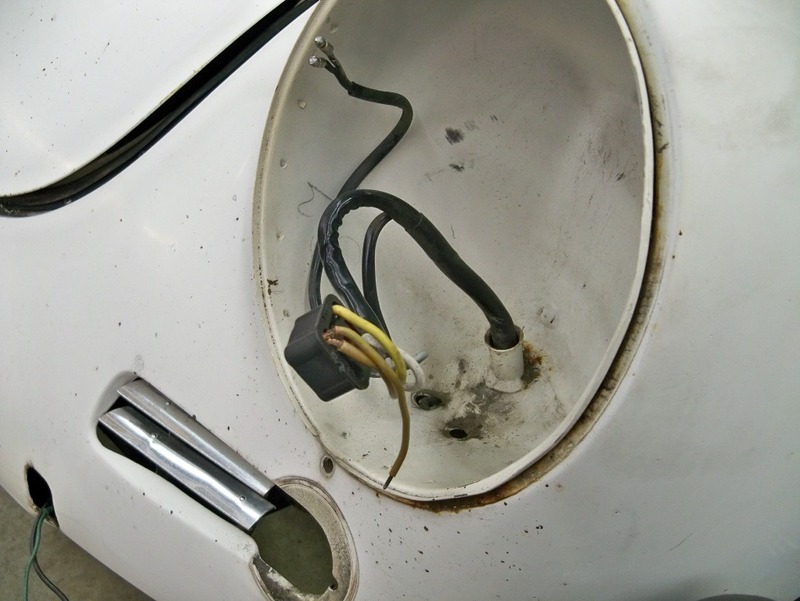 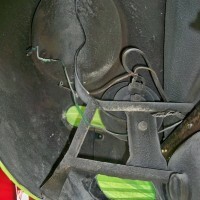 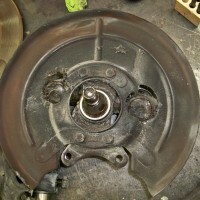 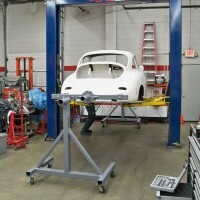 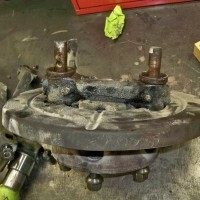 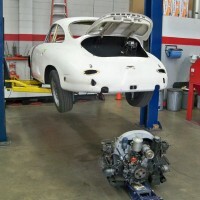 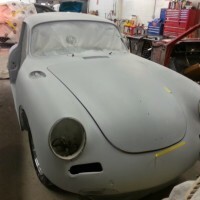 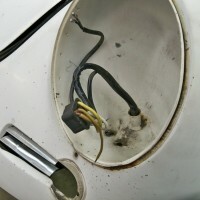 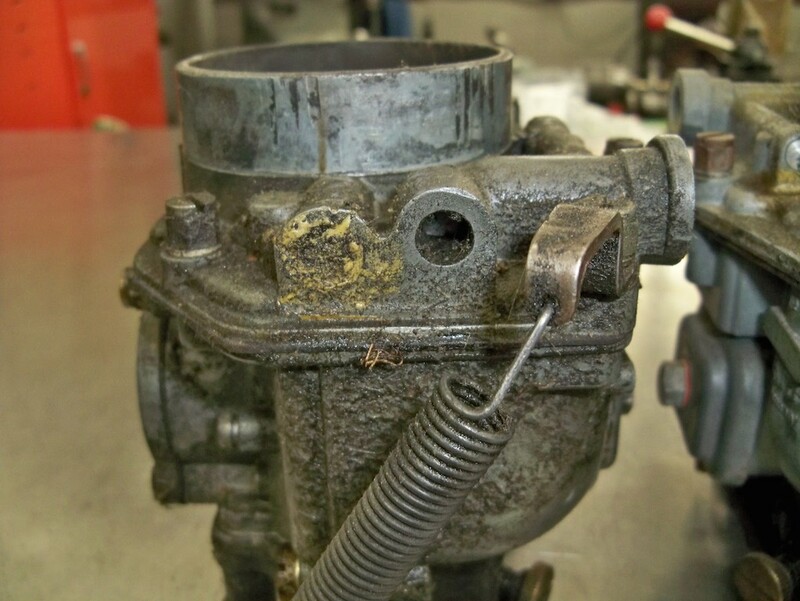 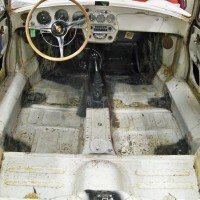 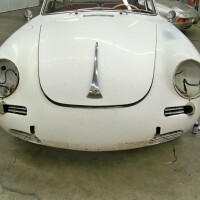 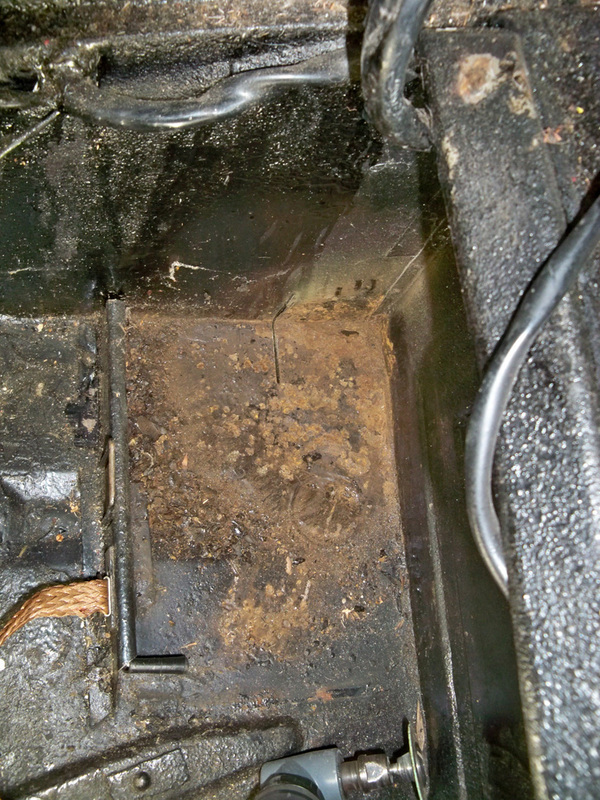 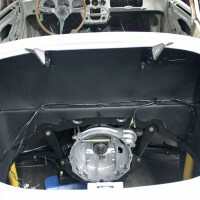 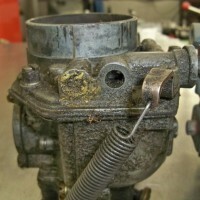 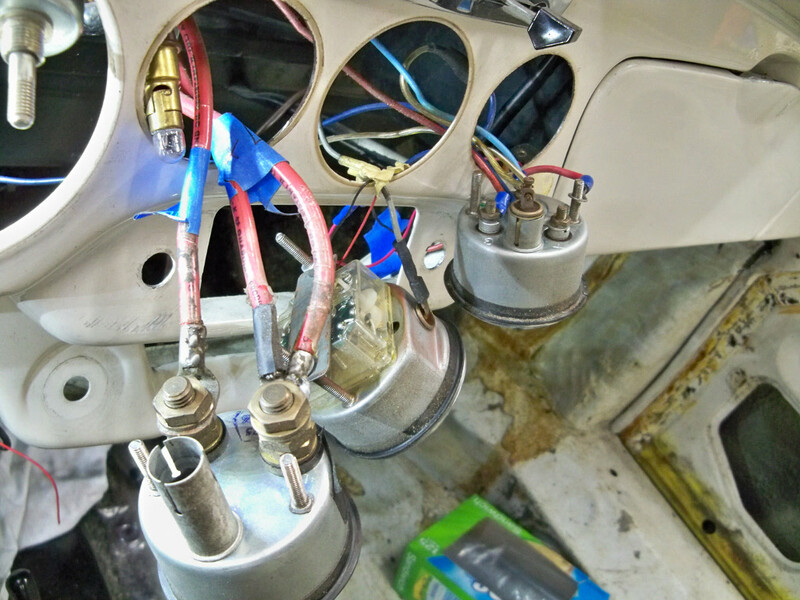 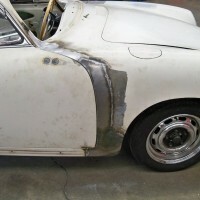 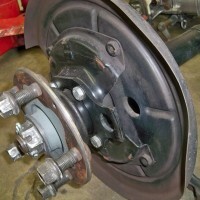 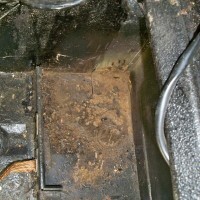 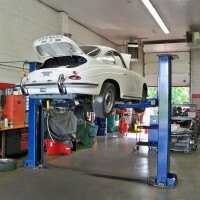 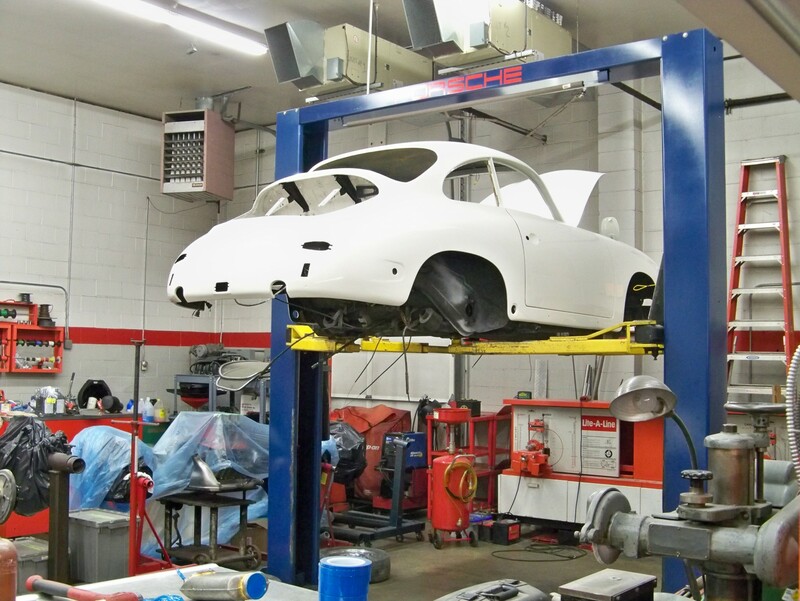 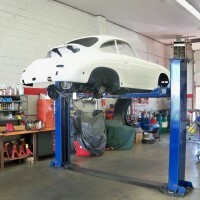 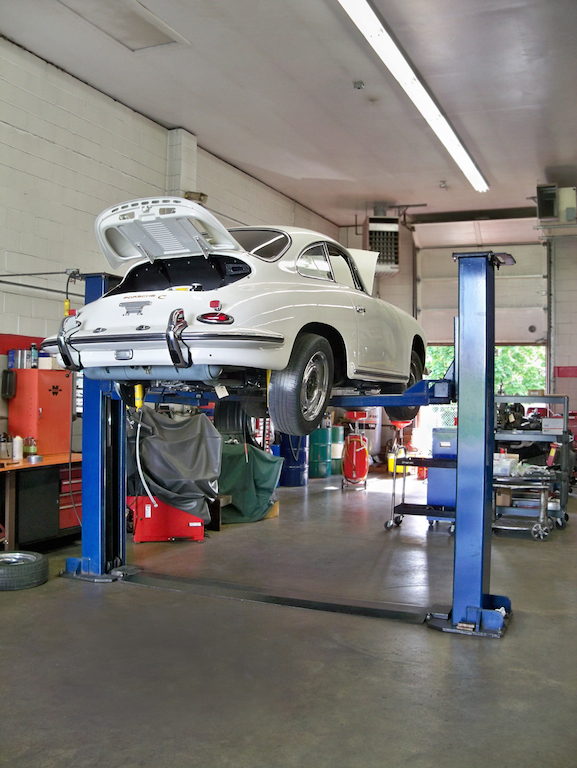 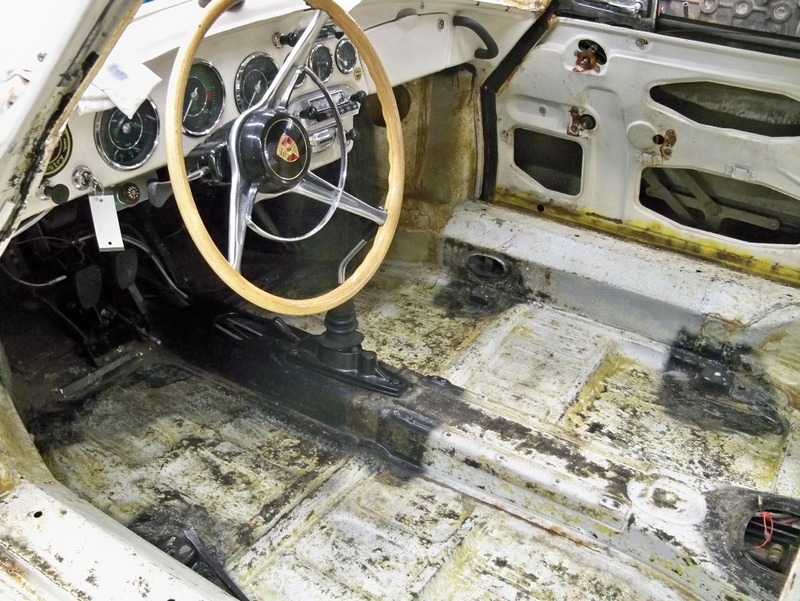 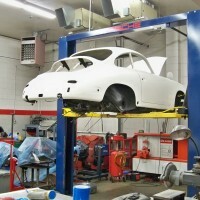 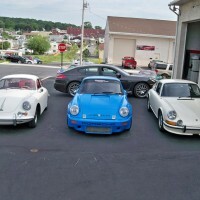 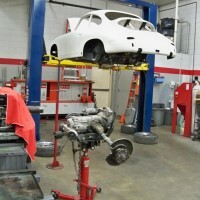 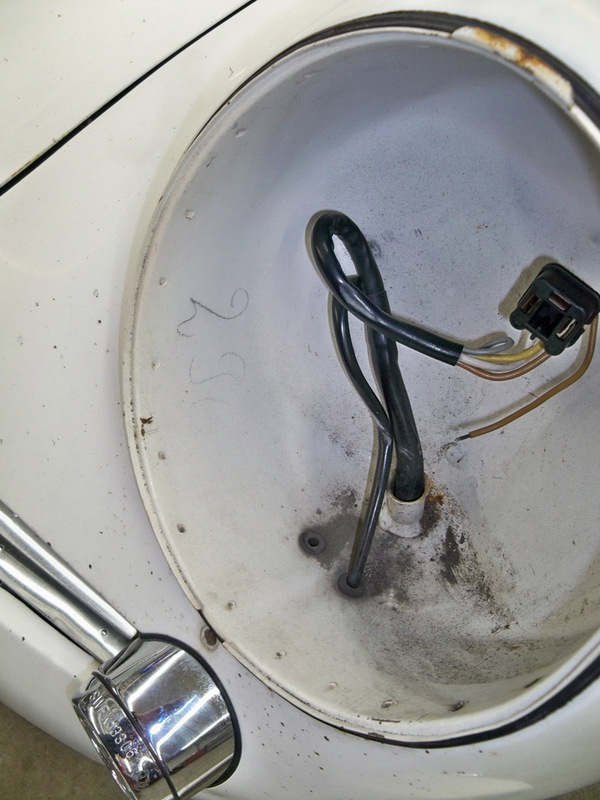 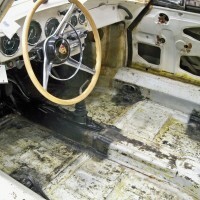 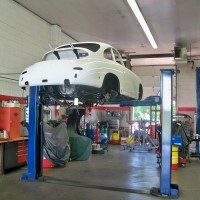 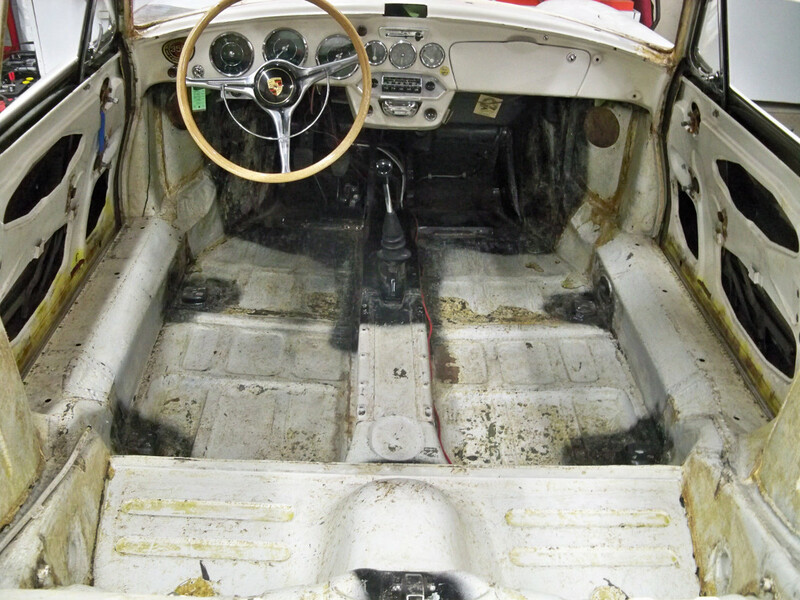 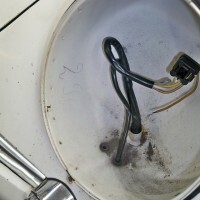 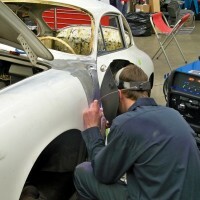 This is a common problem area for 356’s. 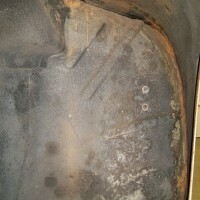 As you can see, some rust is already staring to show through; but what you can’t see is all the rust underneath. 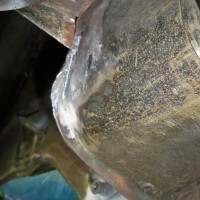 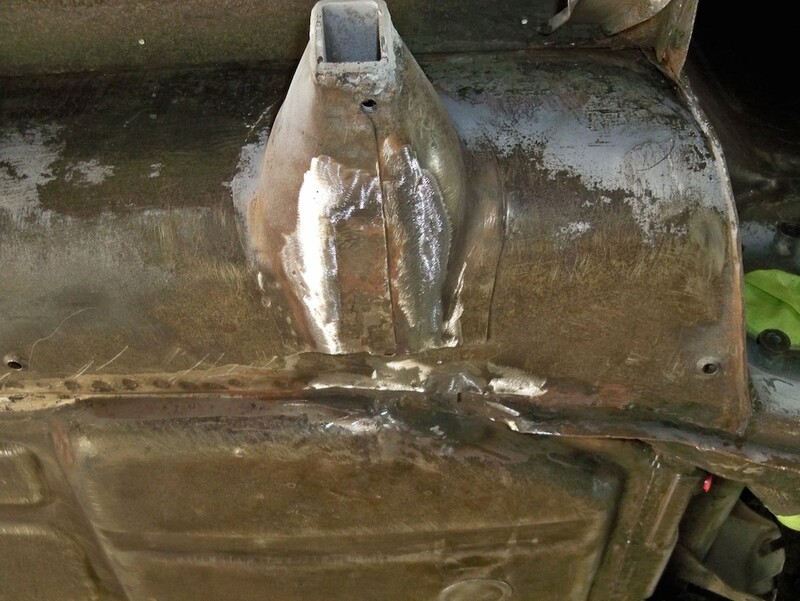 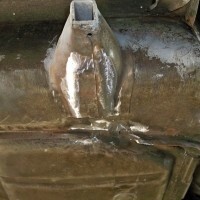 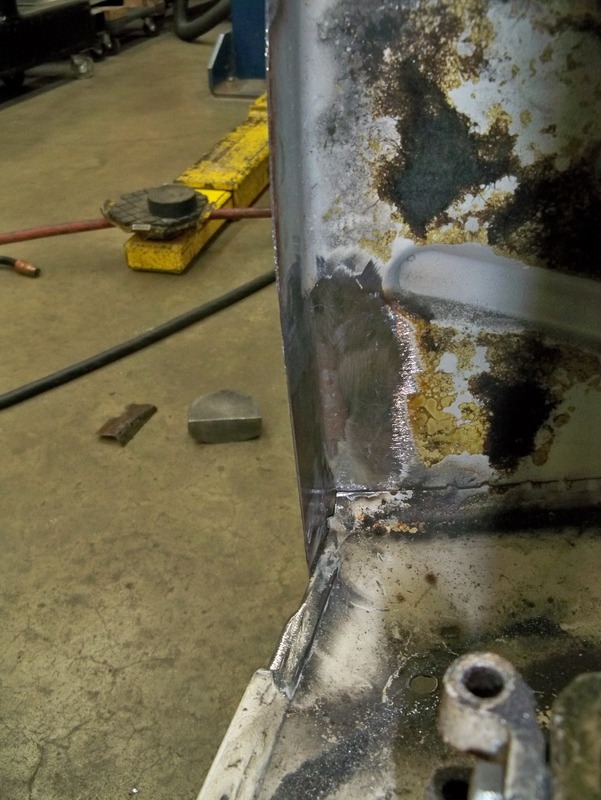 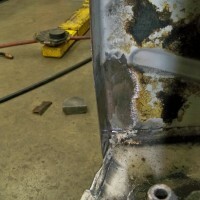 After cutting the fender away, you can see the amount of rust that was hidden. 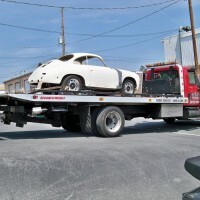 If not taken care of at this time, this problem would have shown up down the road. 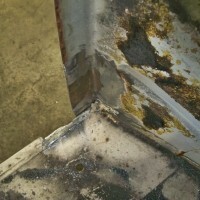 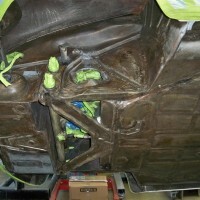 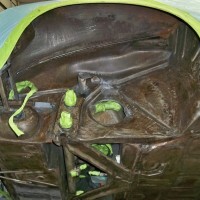 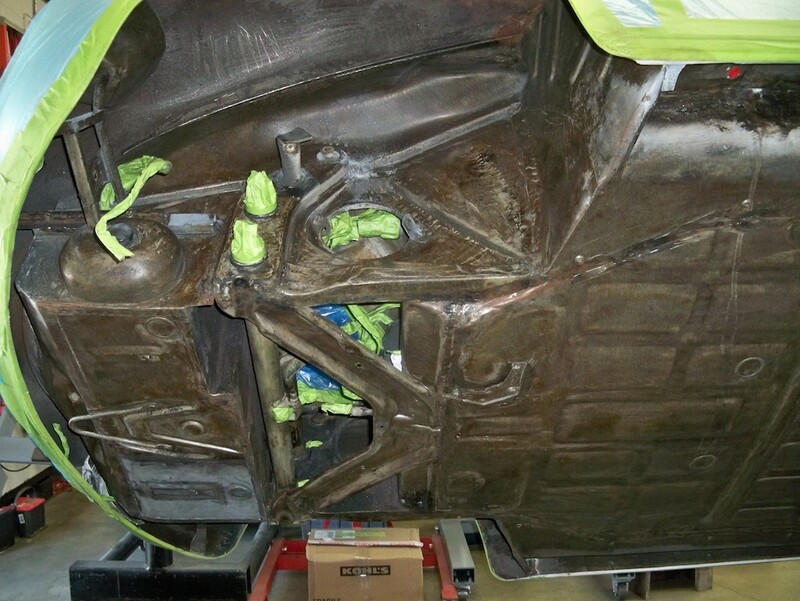 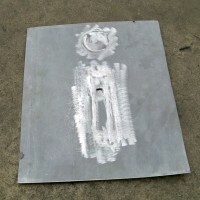 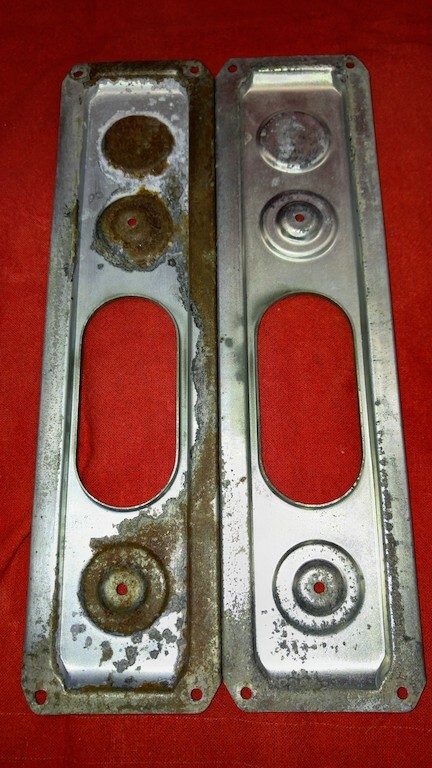 We treated the rust on the closing panel before installing our new fabricated panel. 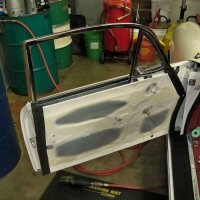 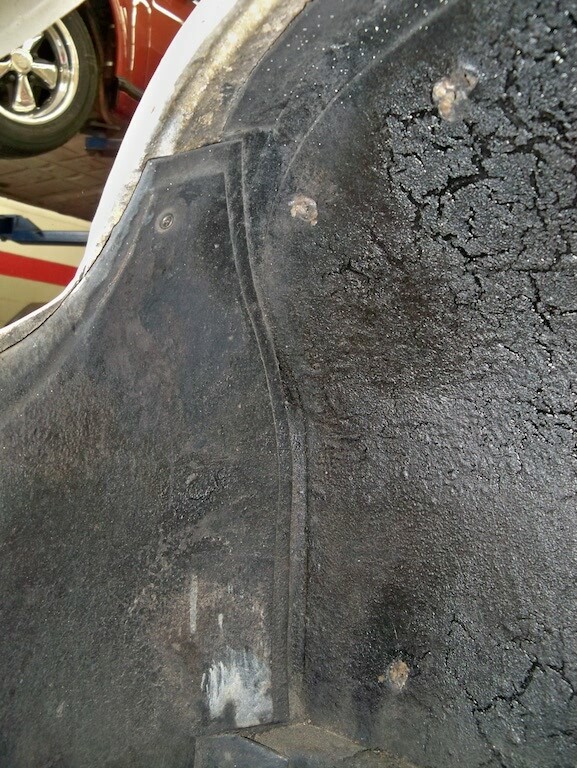 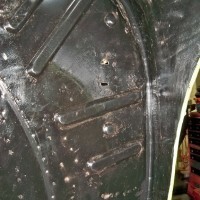 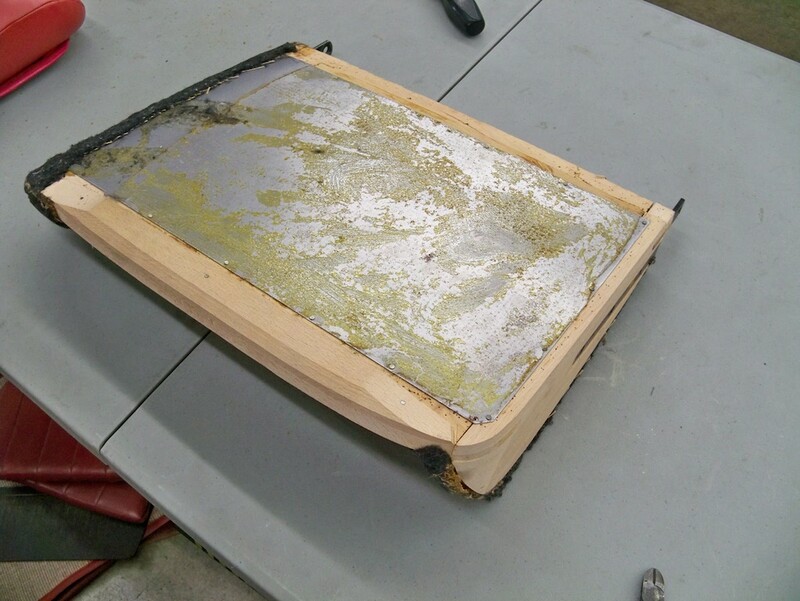 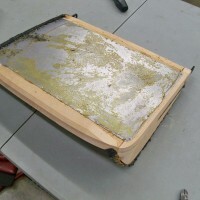 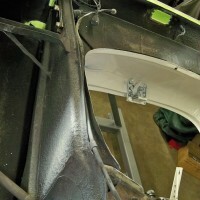 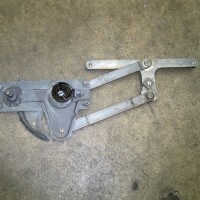 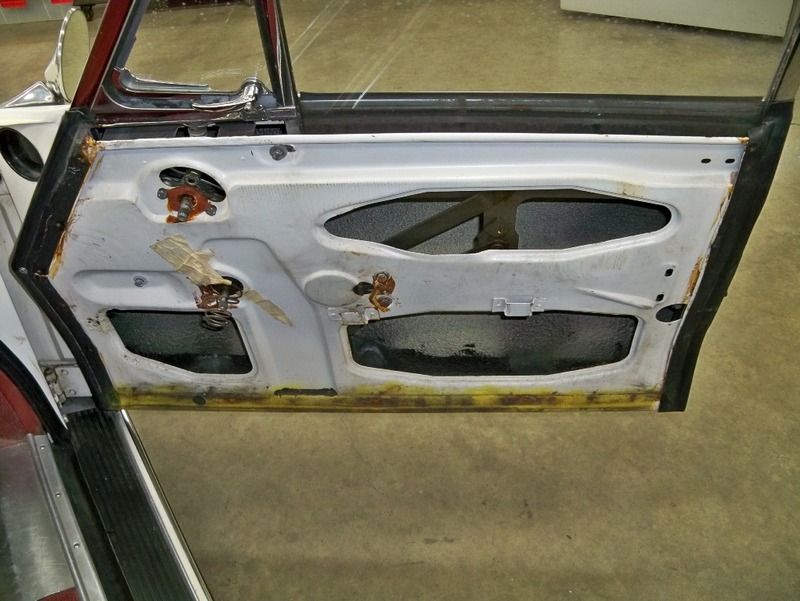 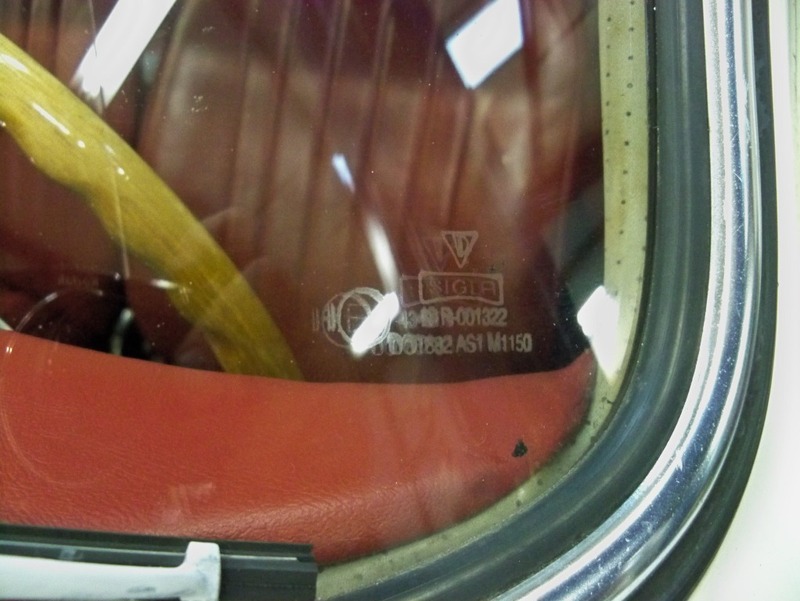 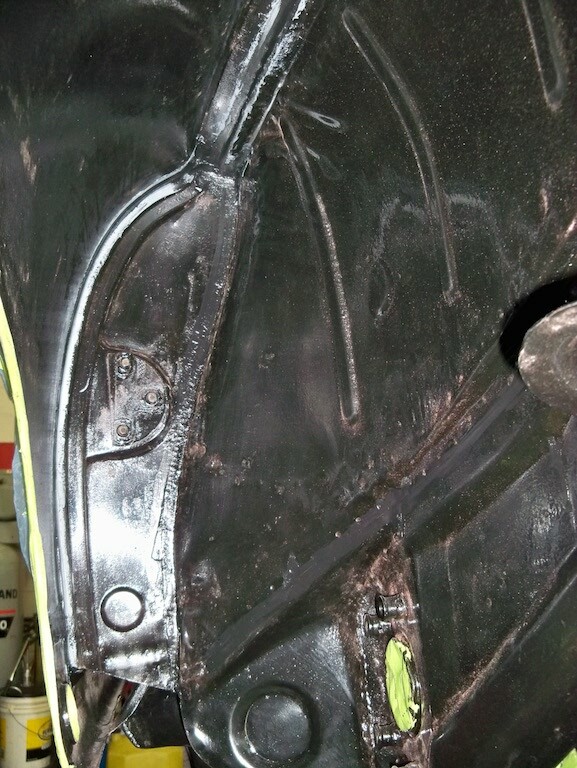 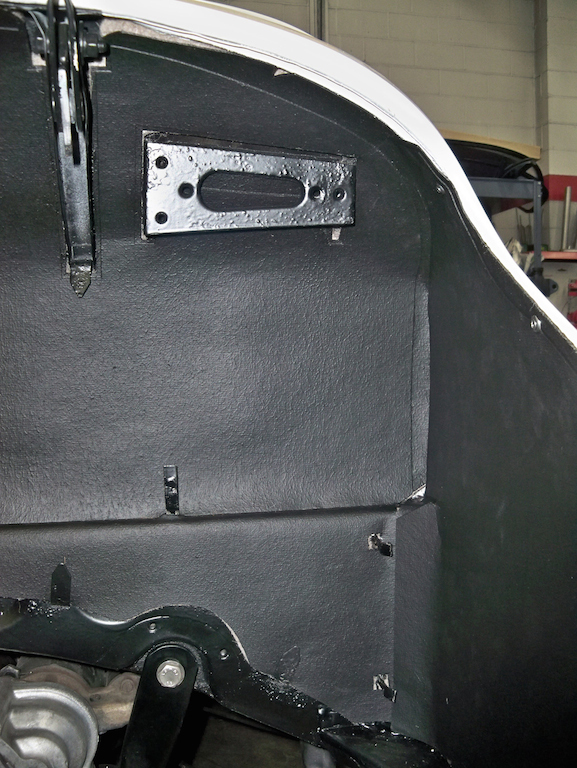 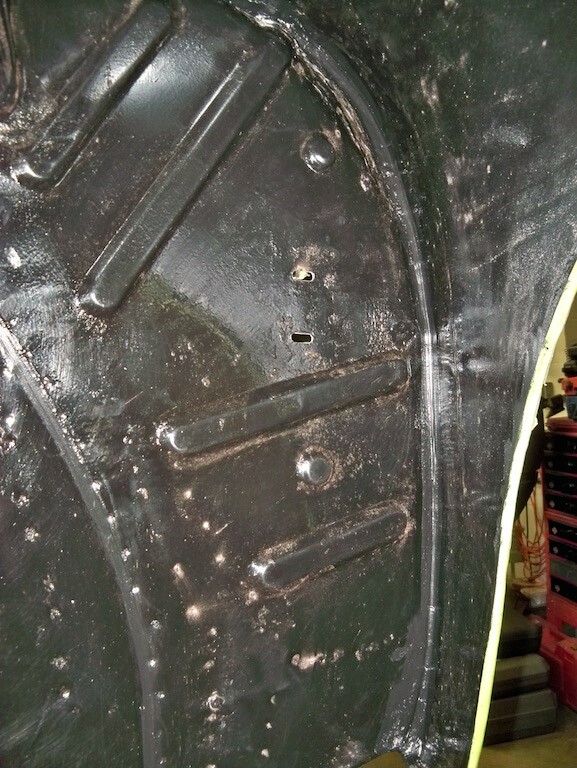 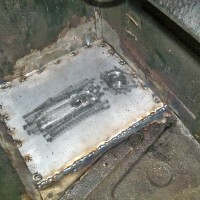 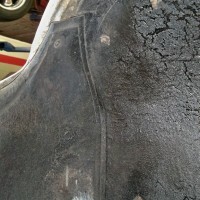 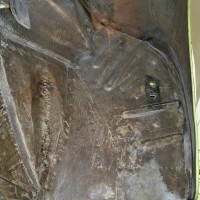 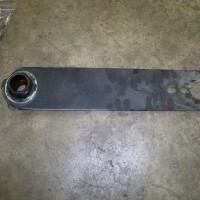 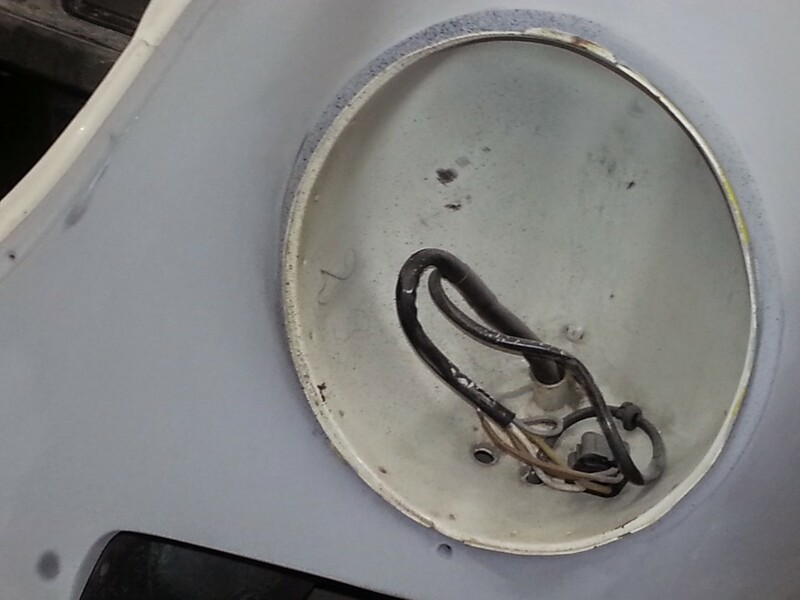 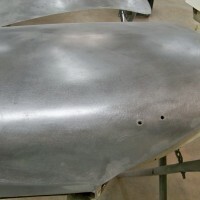 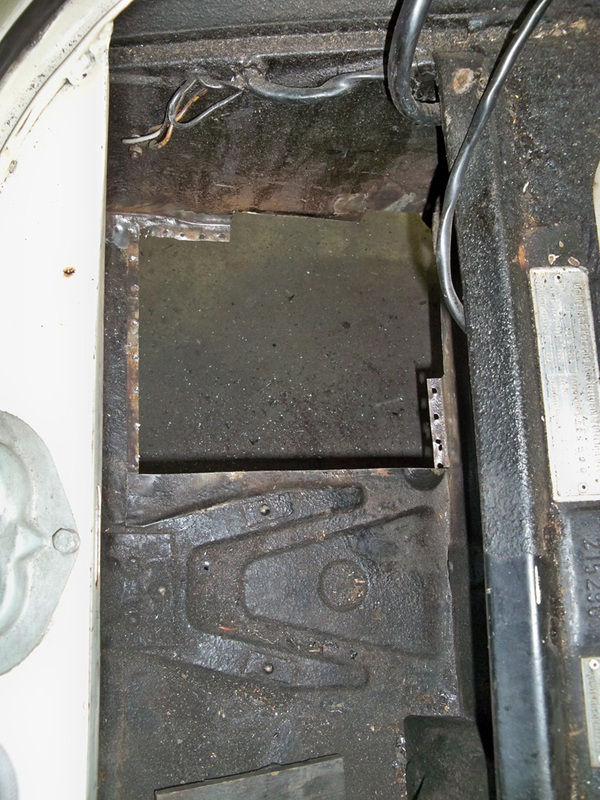 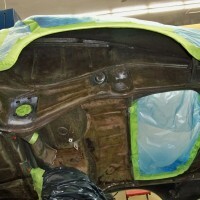 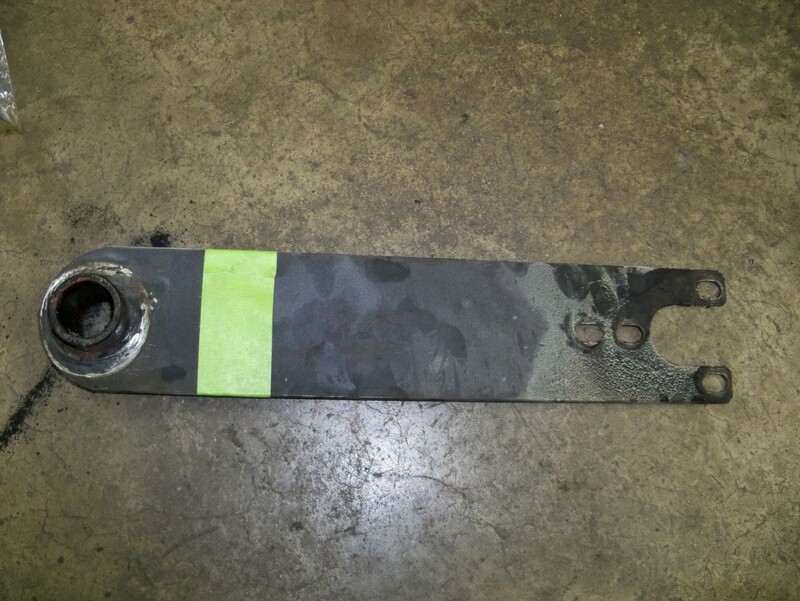 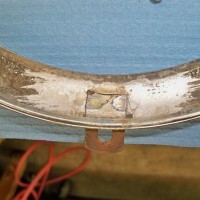 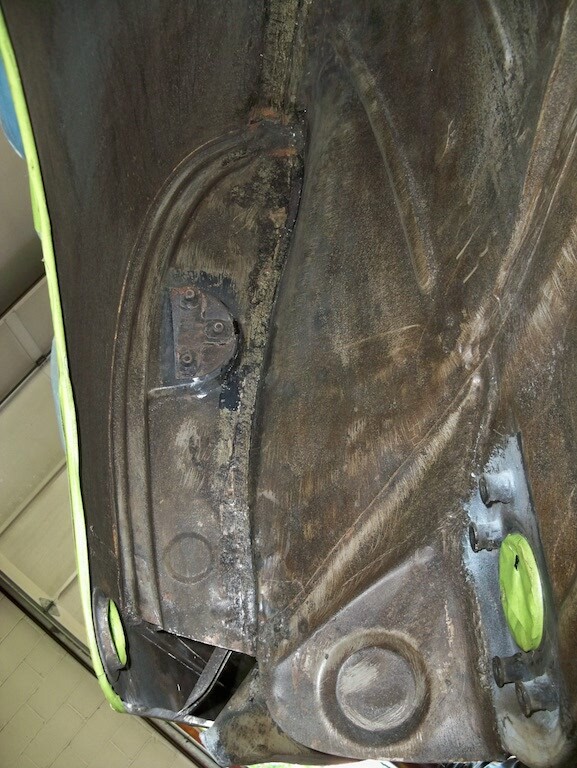 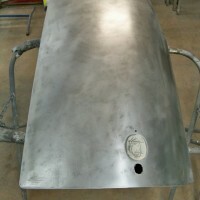 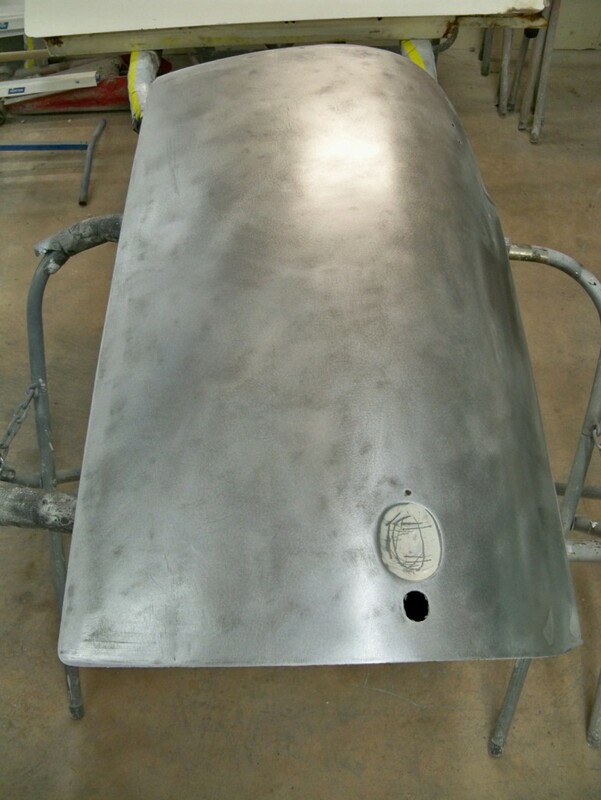 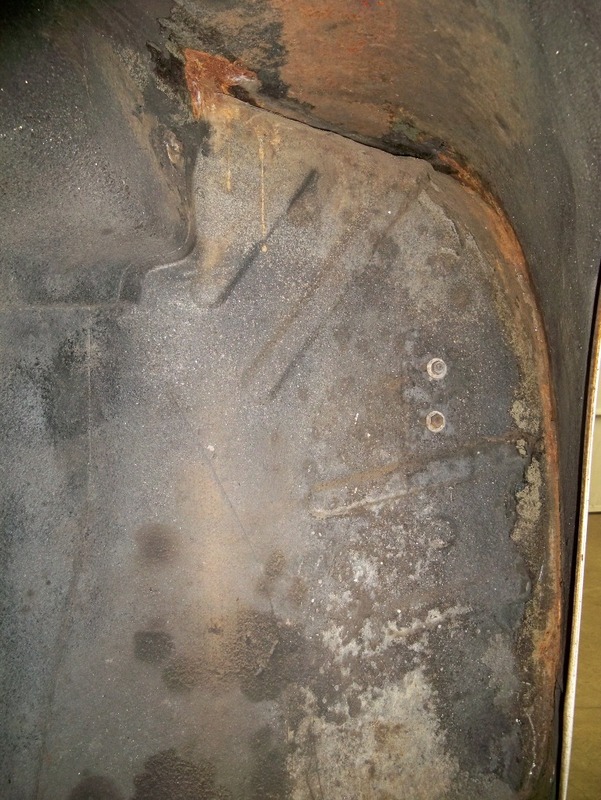 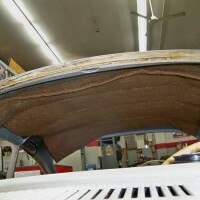 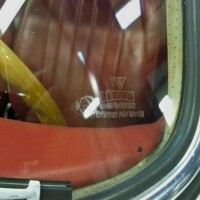 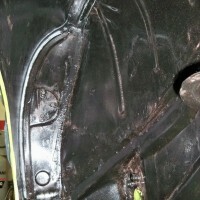 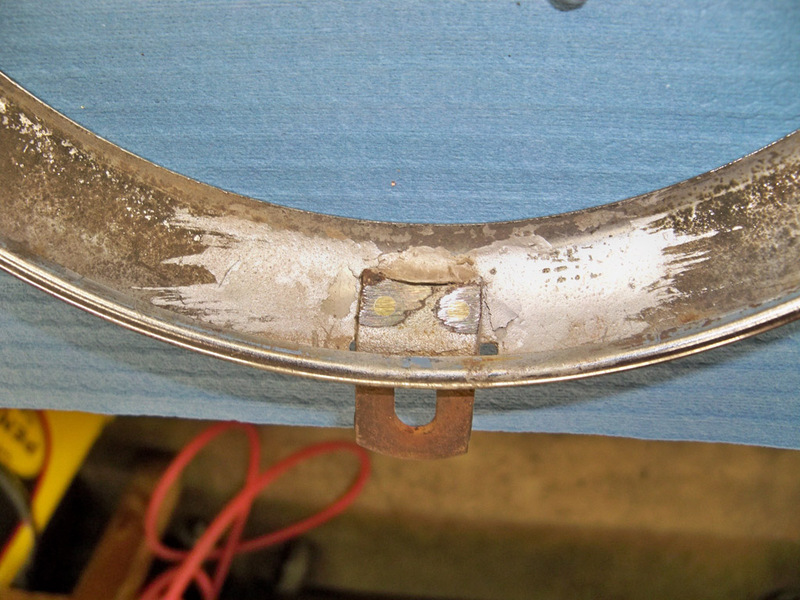 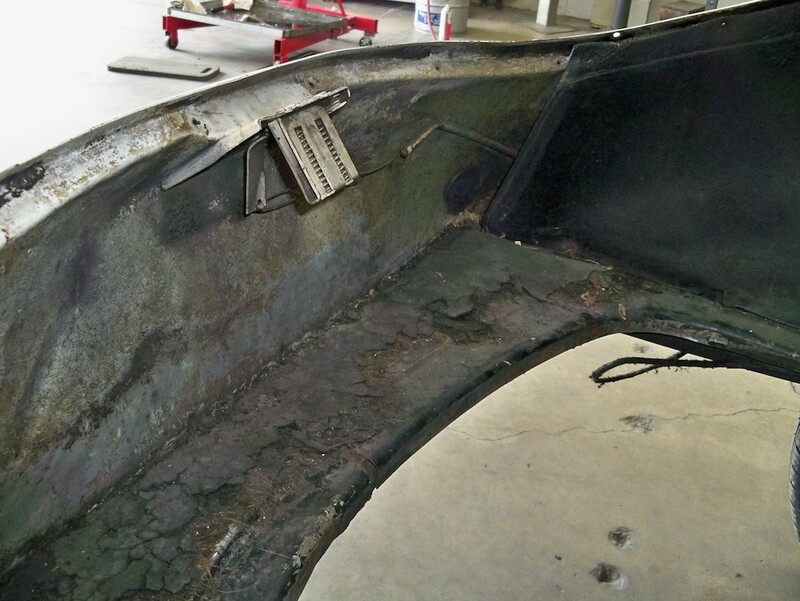 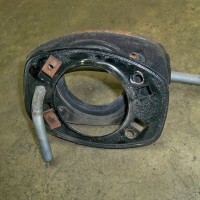 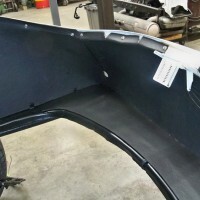 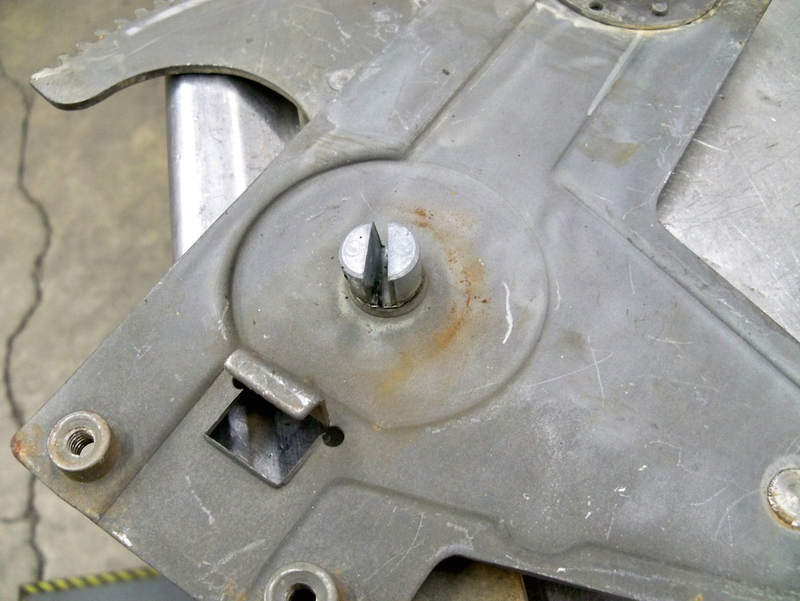 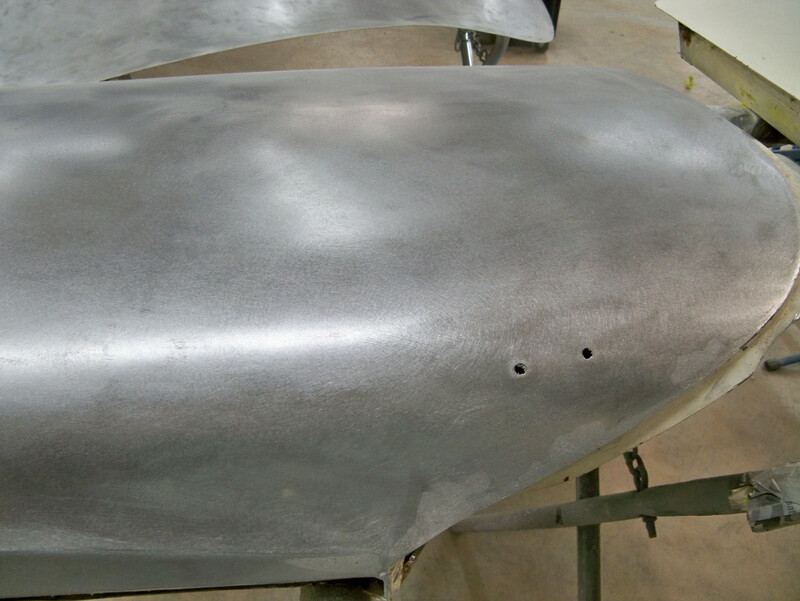 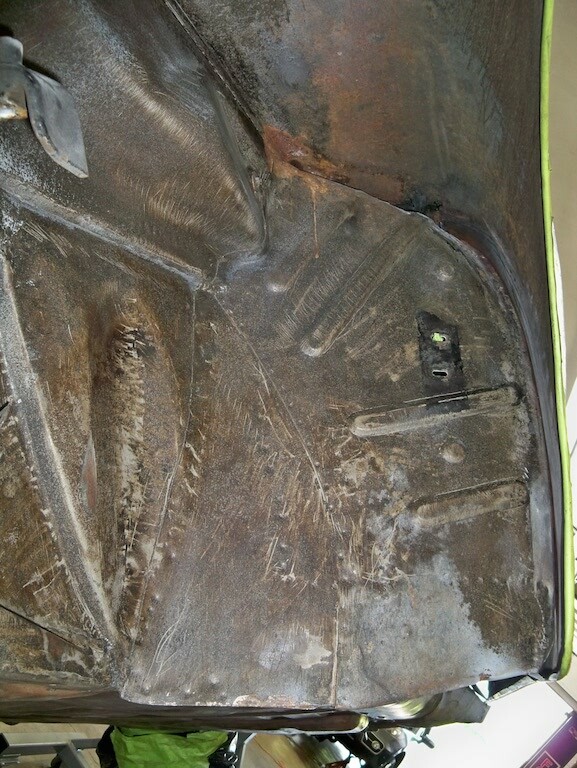 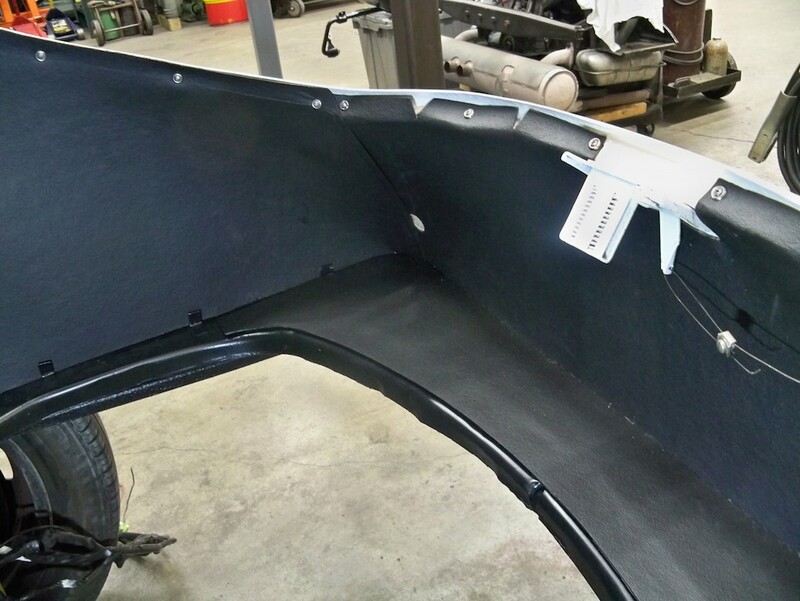 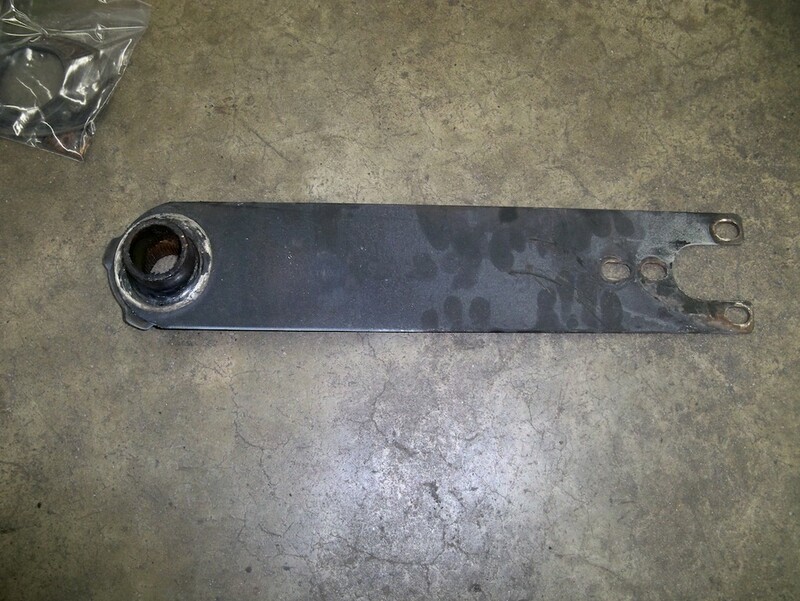 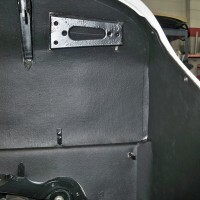 There is also a factory leaded lap joint (that joins the rocker to the fender) that we removed with making this panel. 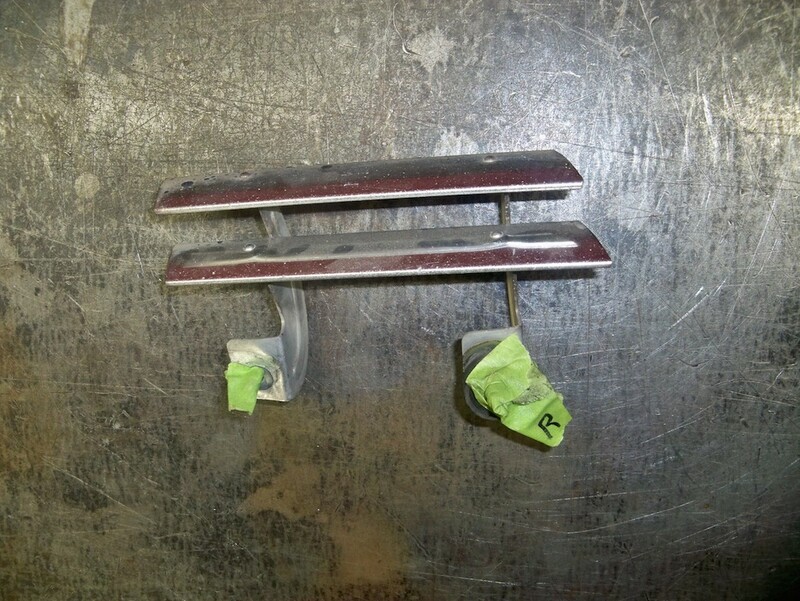 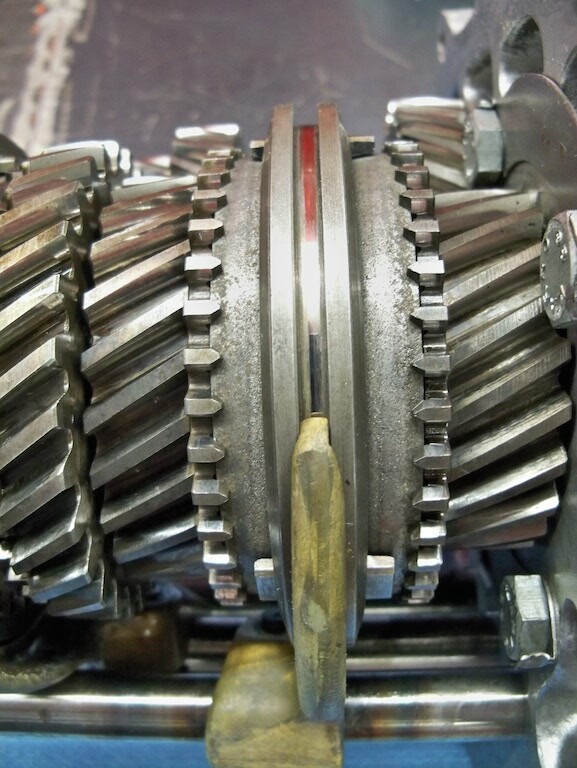 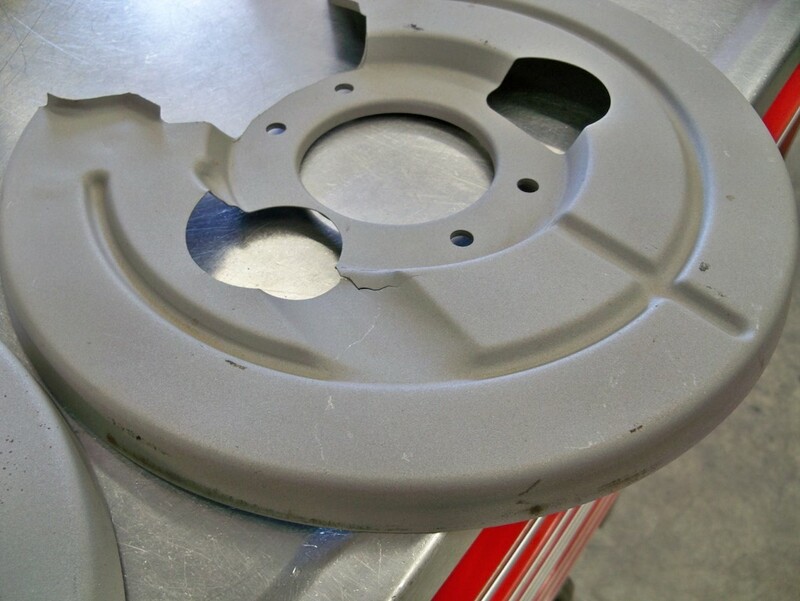 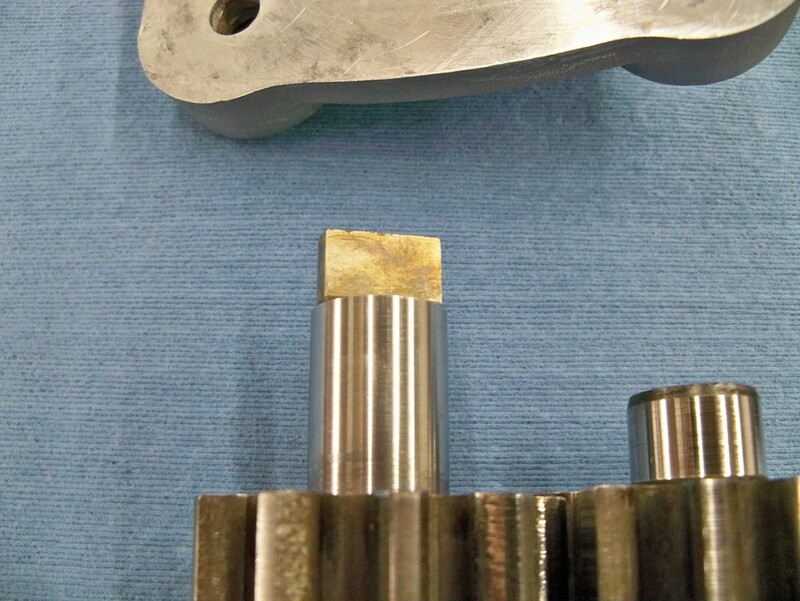 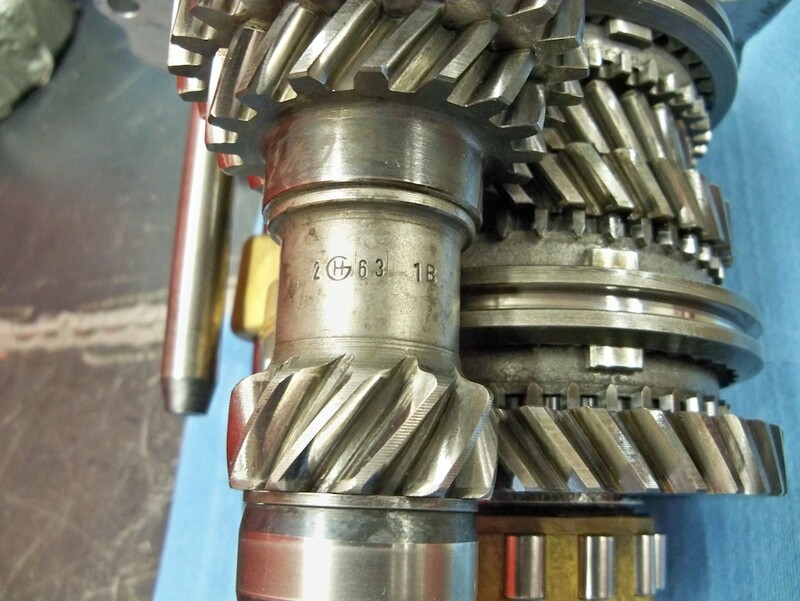 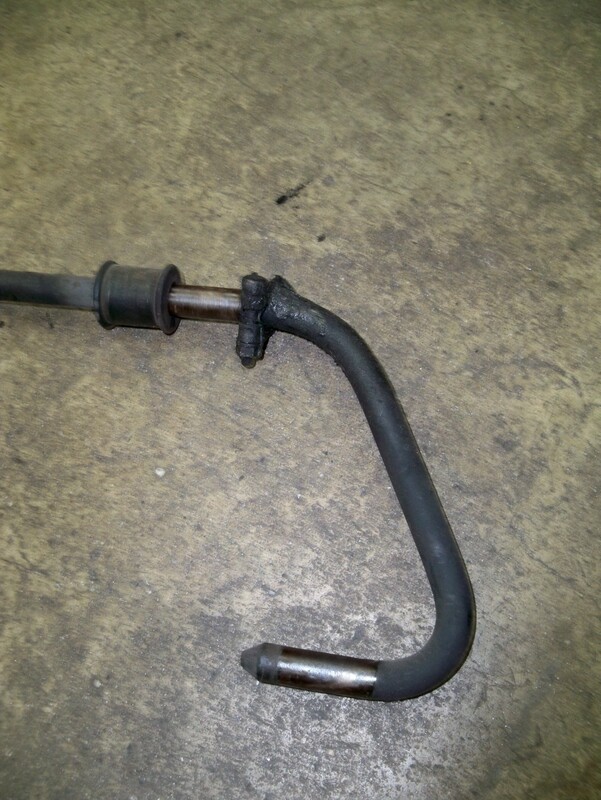 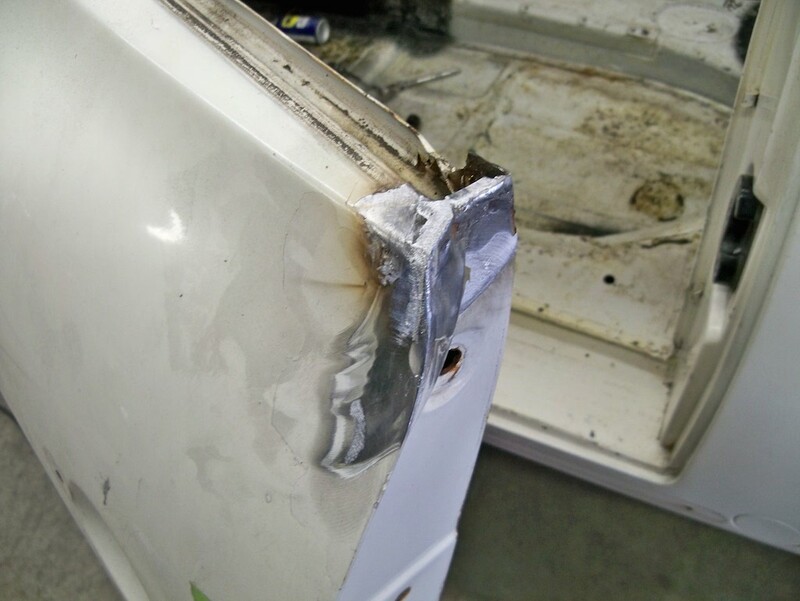 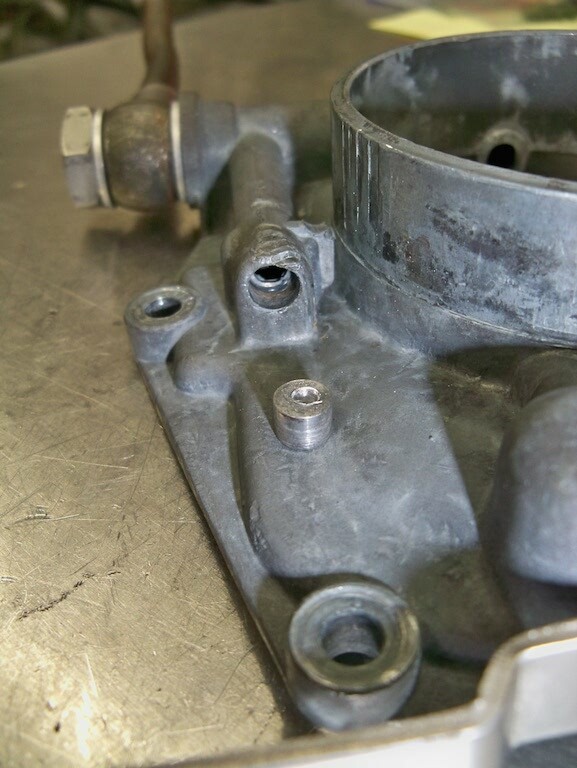 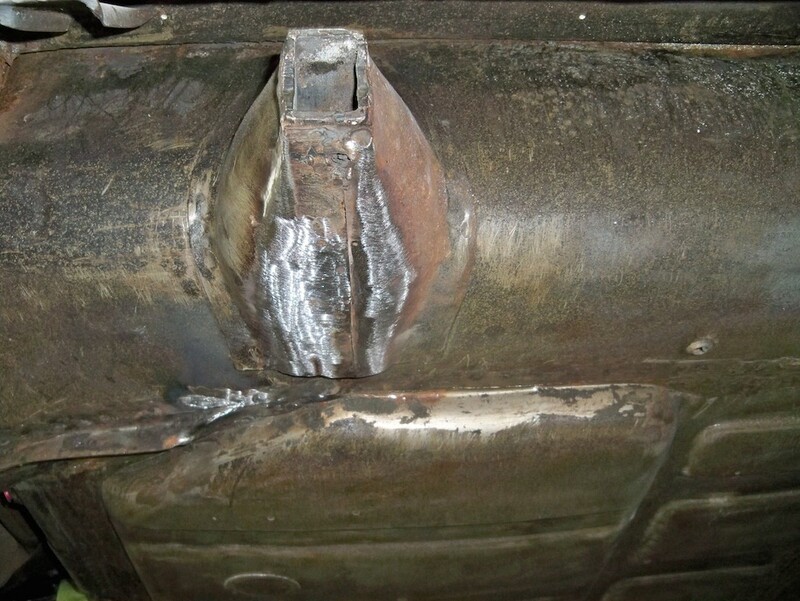 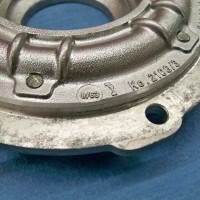 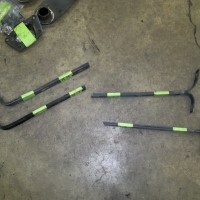 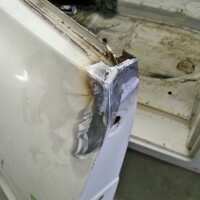 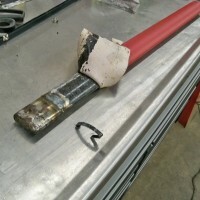 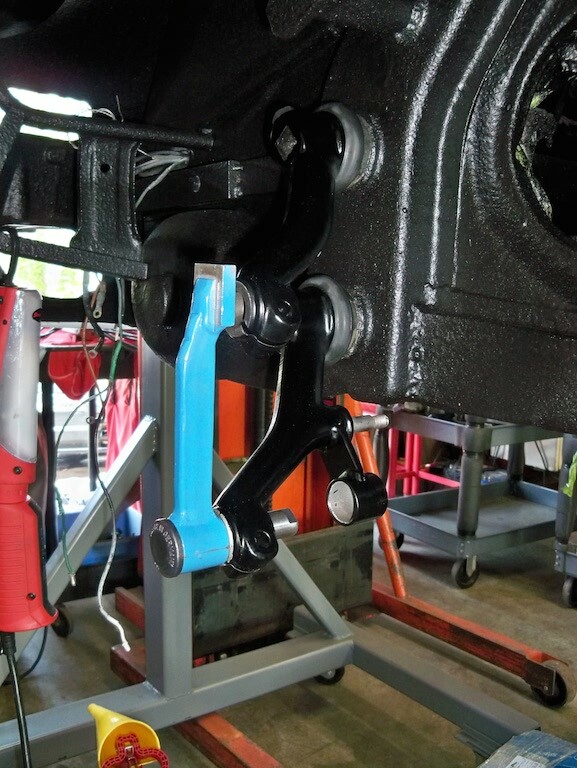 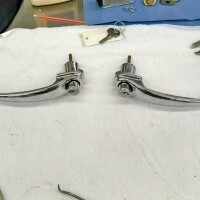 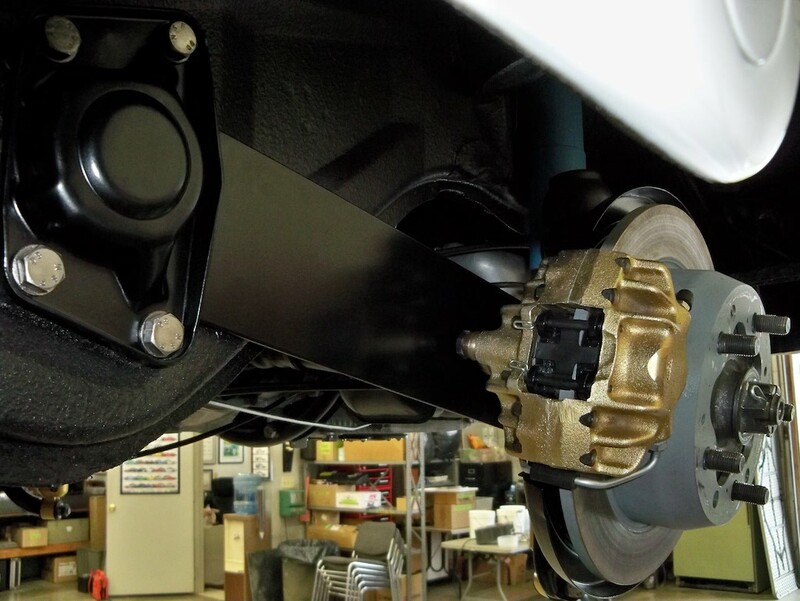 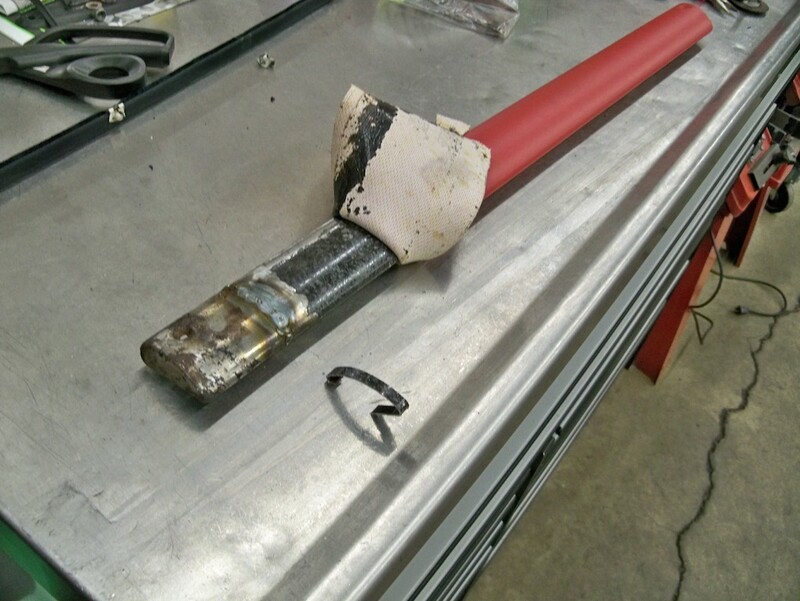 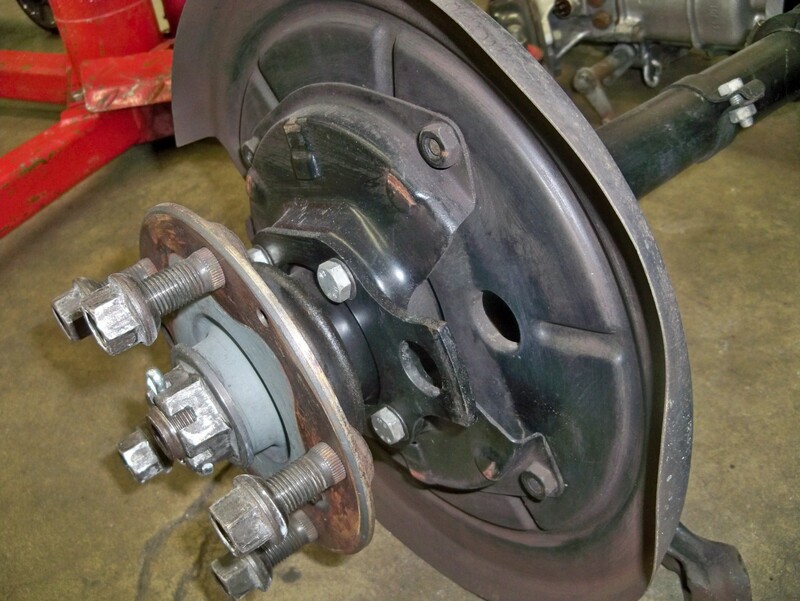 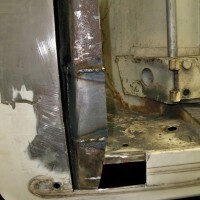 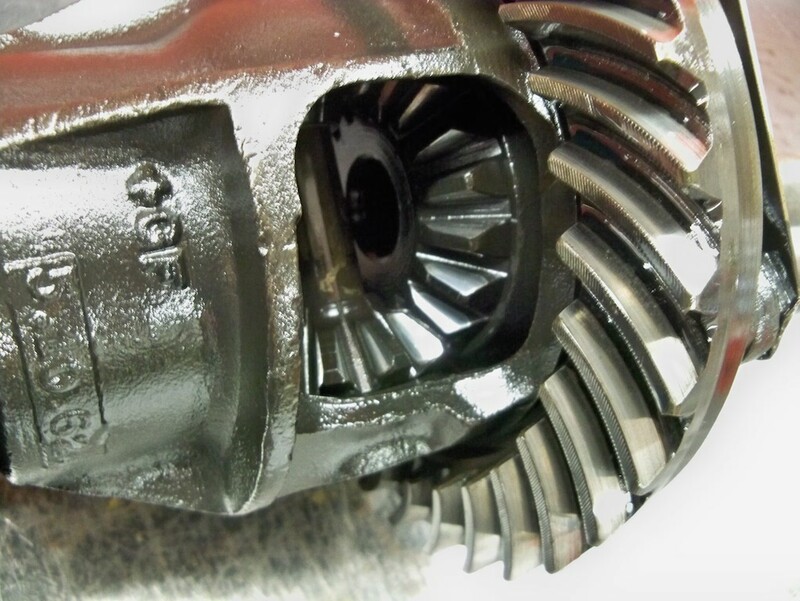 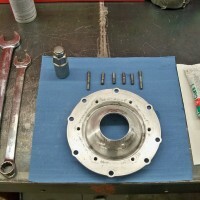 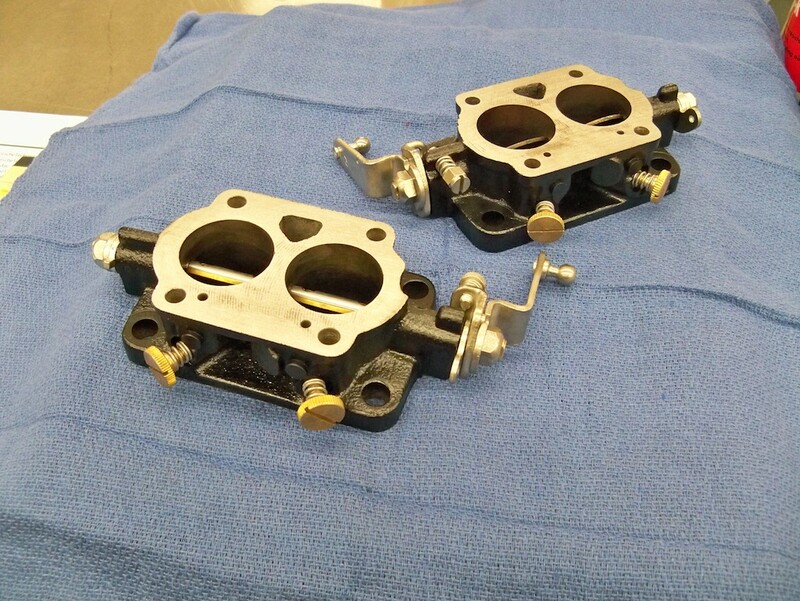 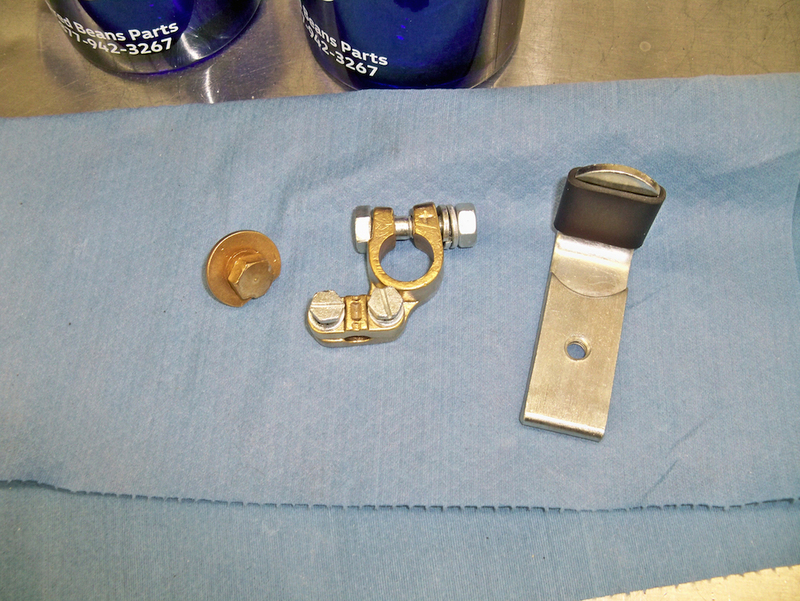 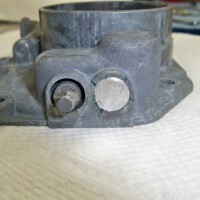 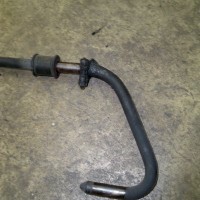 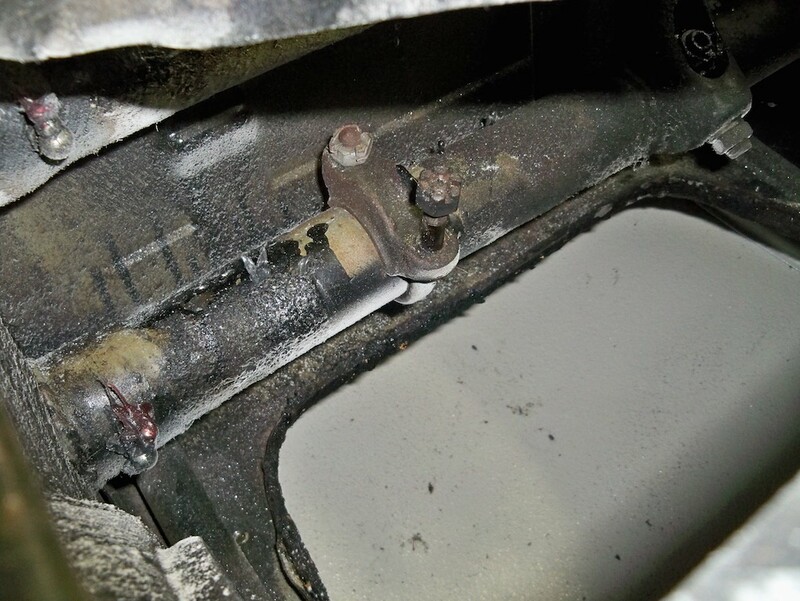 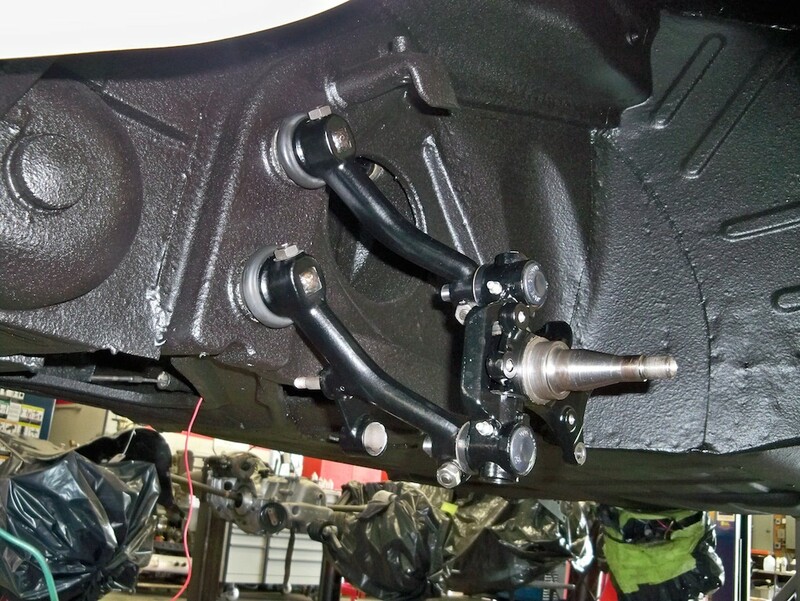 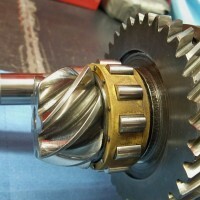 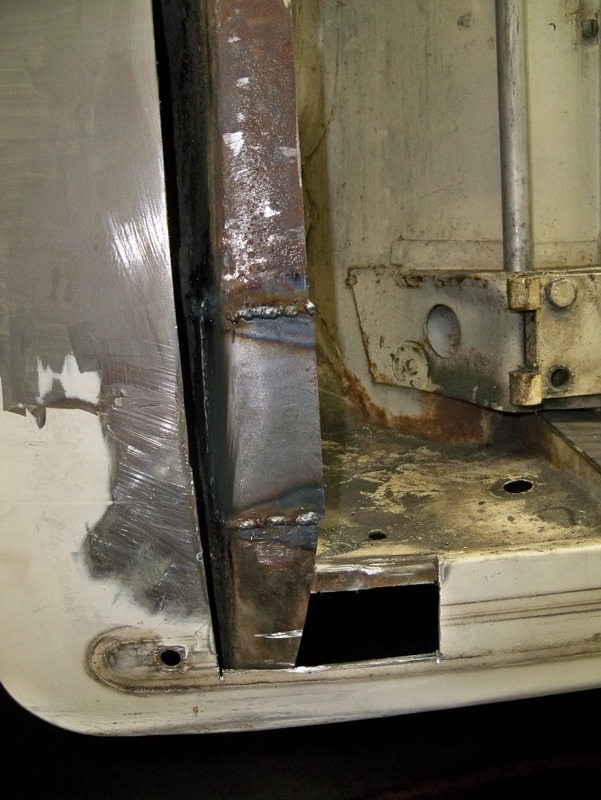 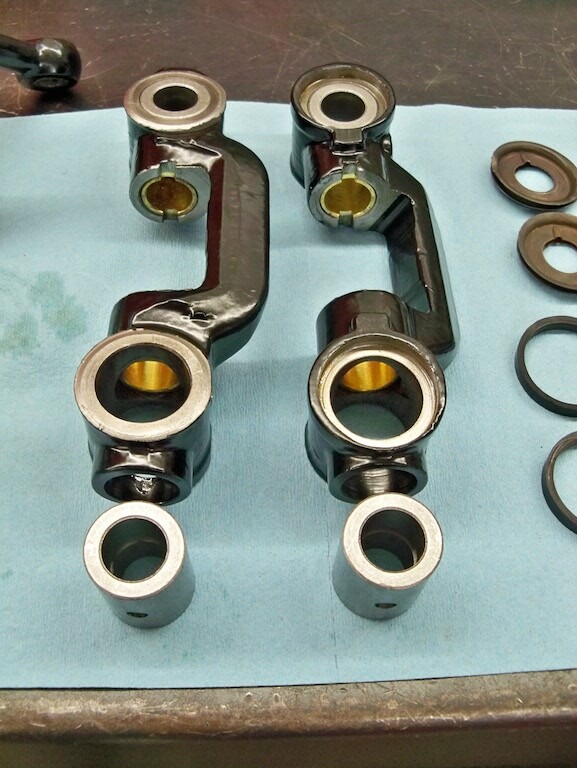 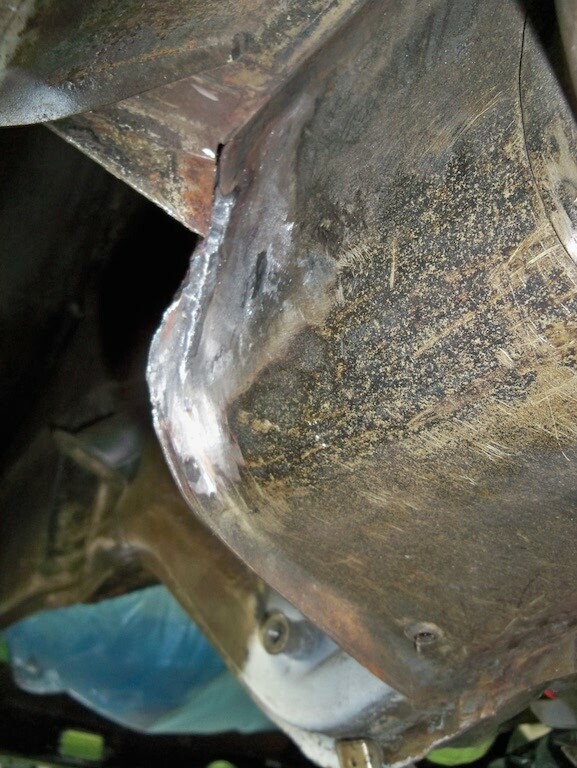 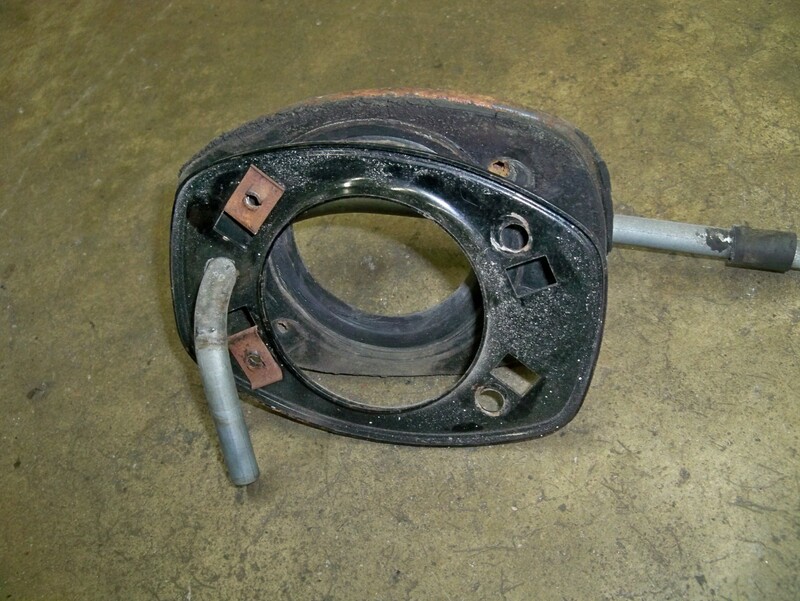 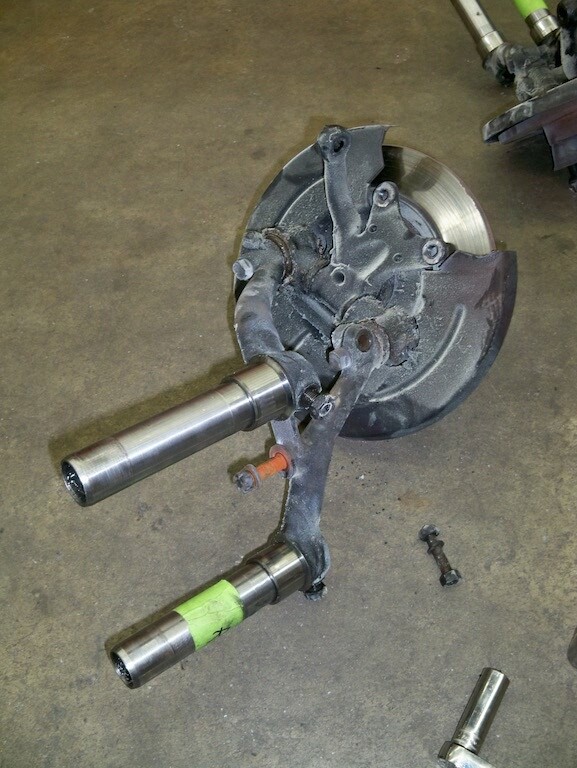 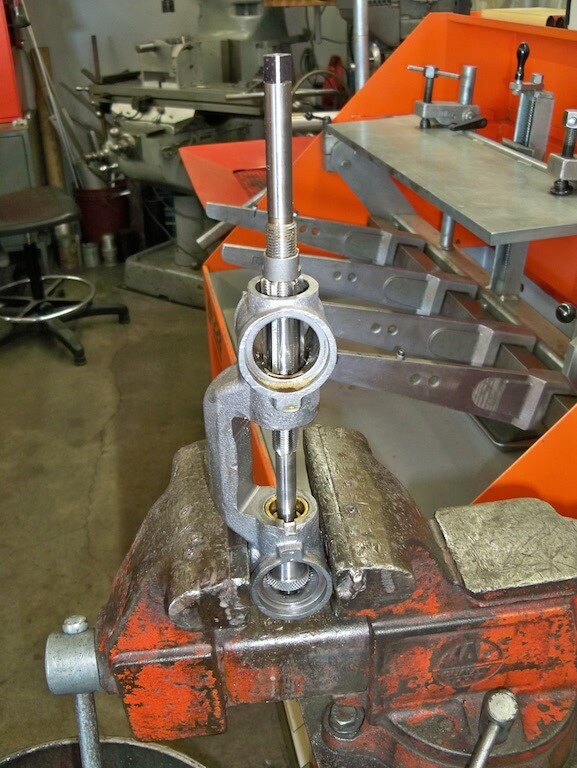 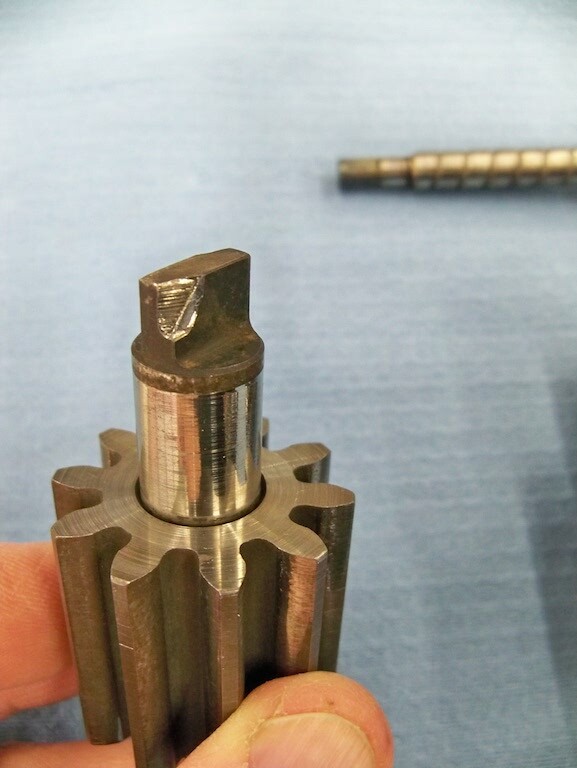 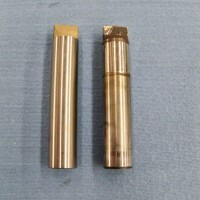 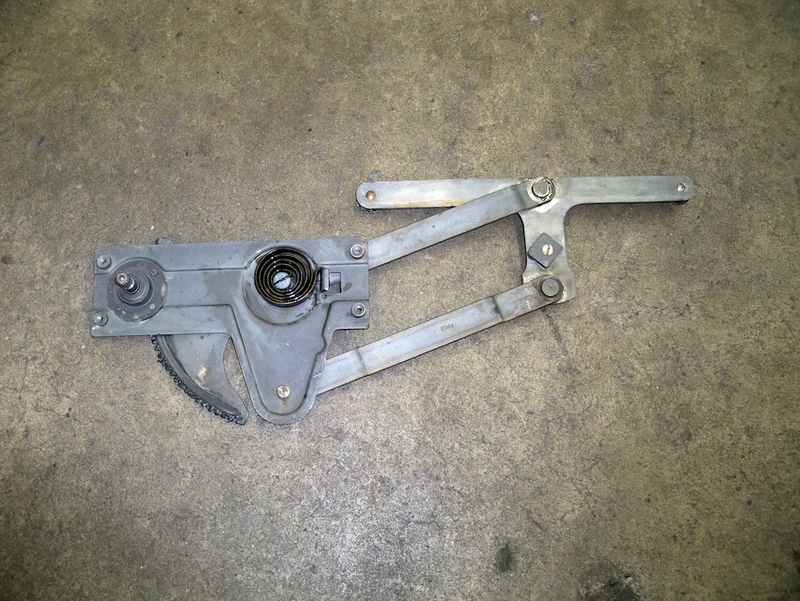 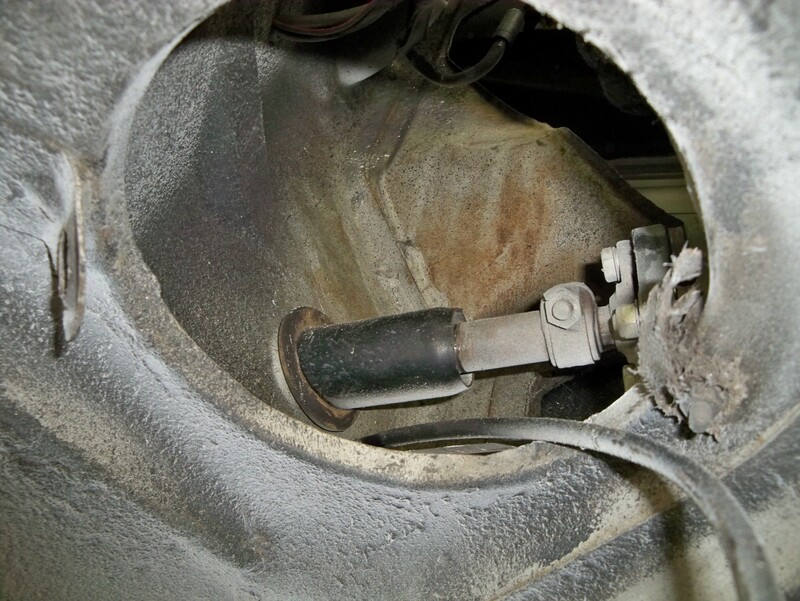 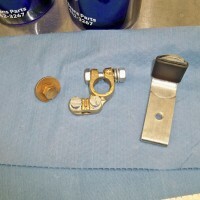 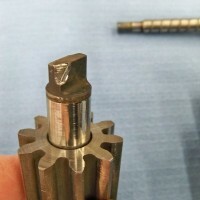 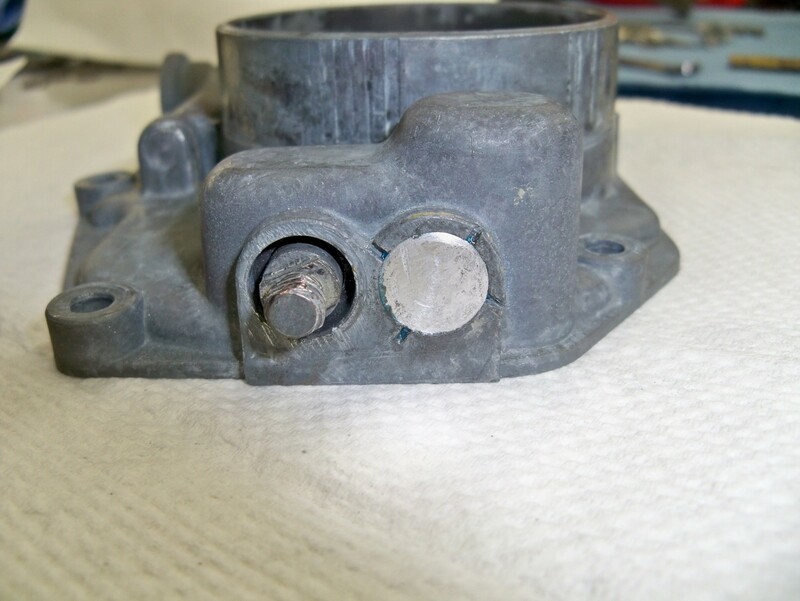 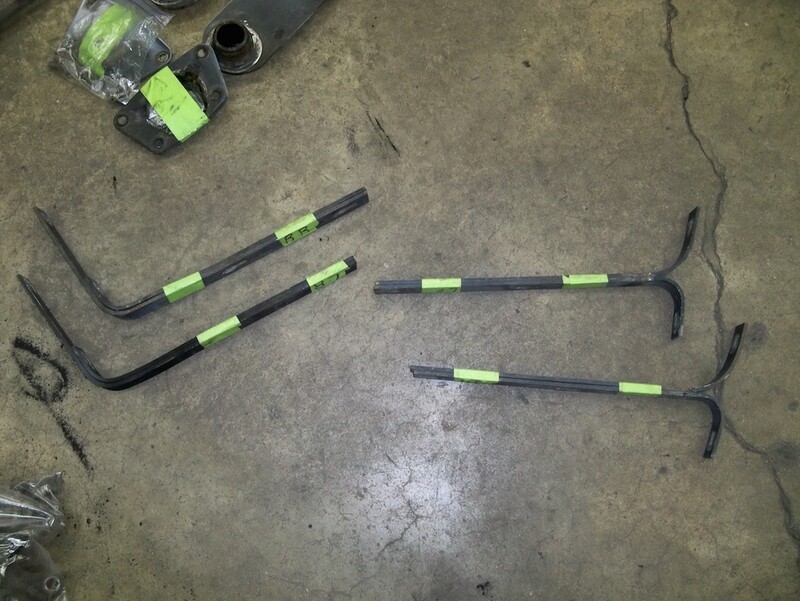 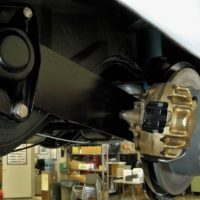 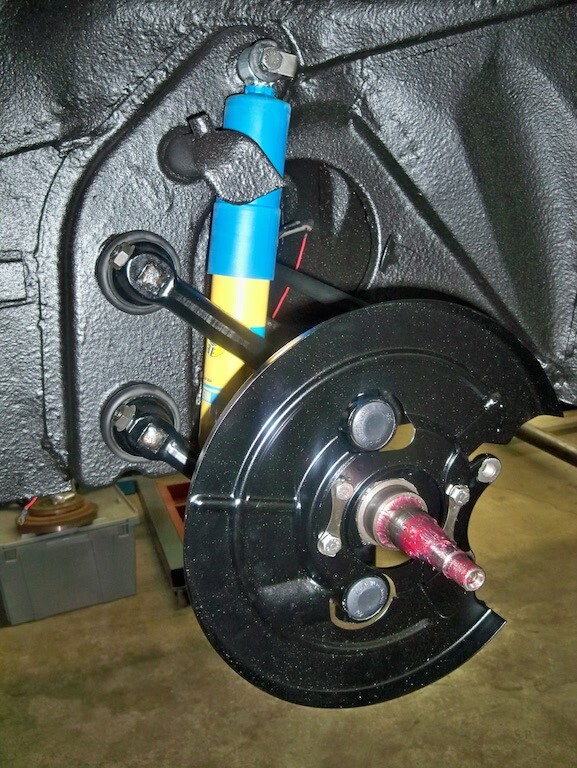 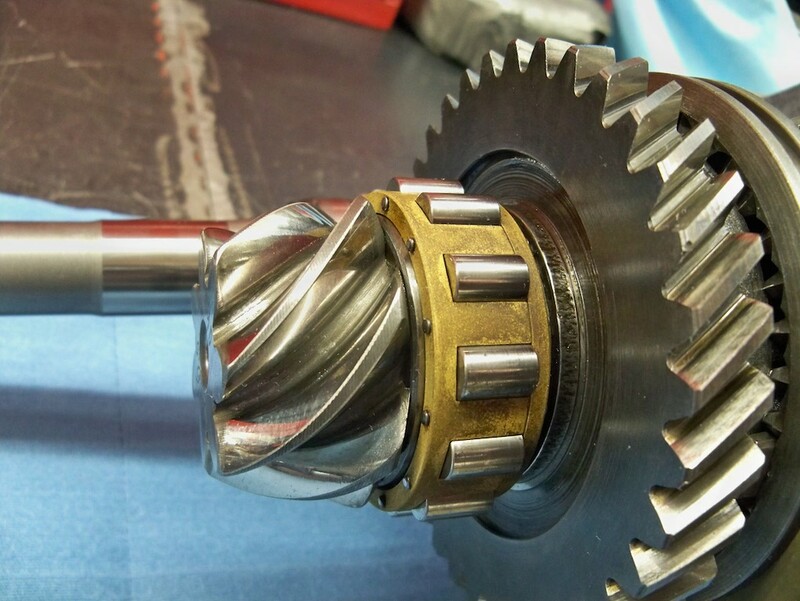 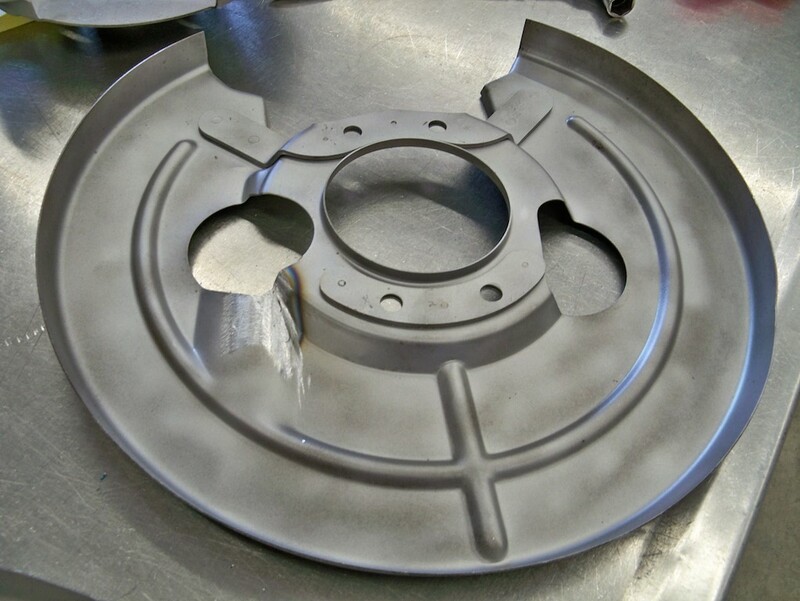 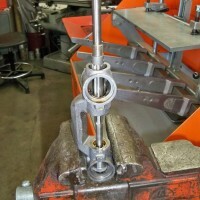 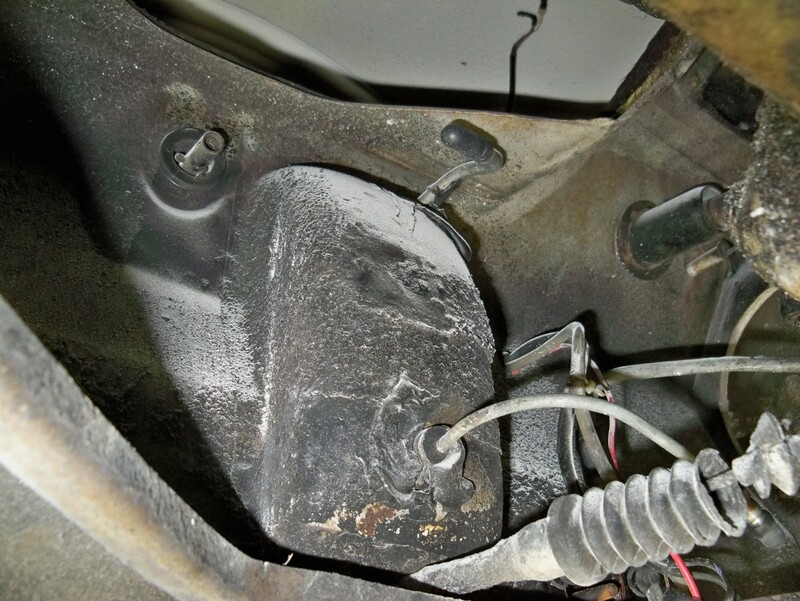 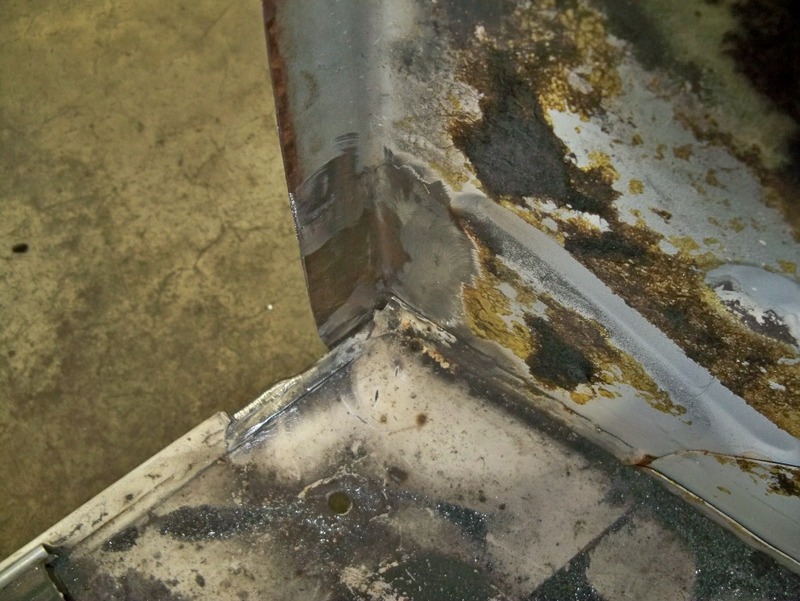 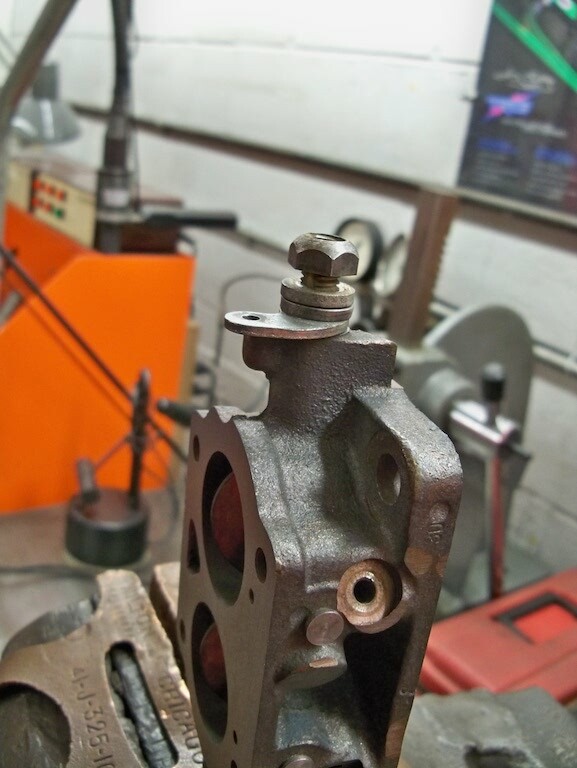 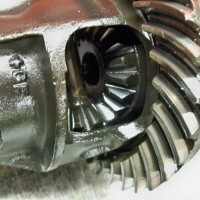 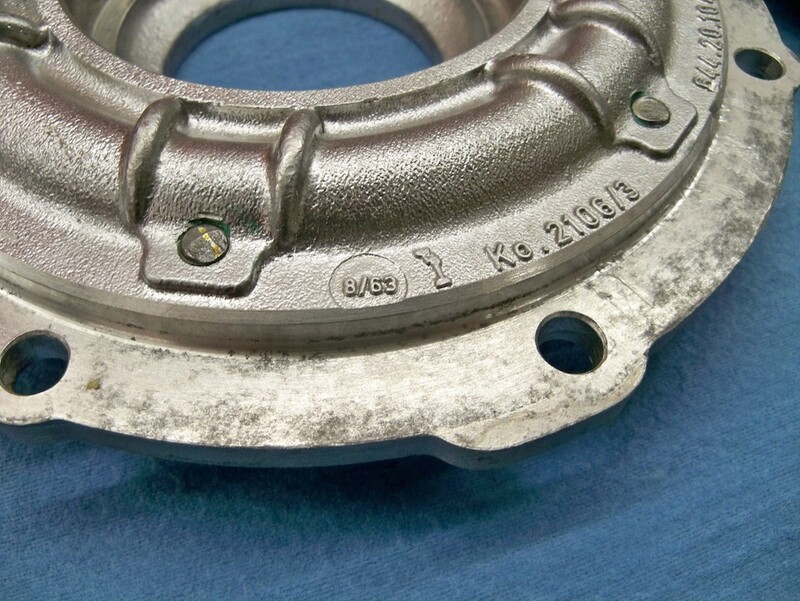 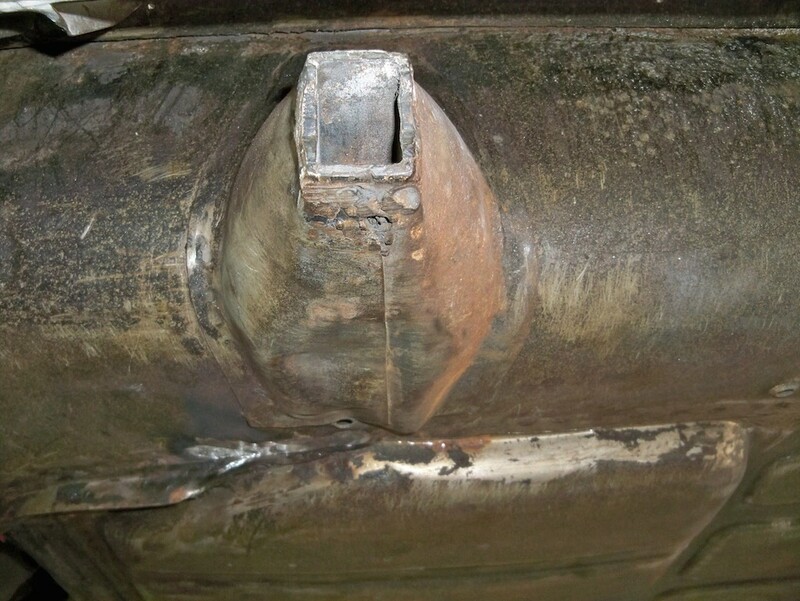 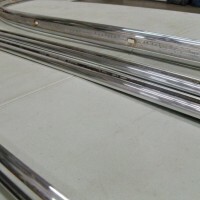 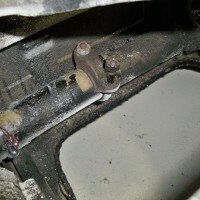 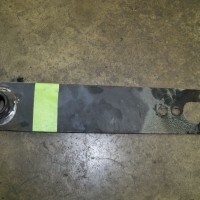 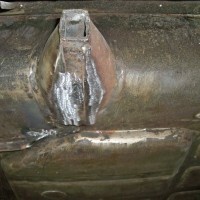 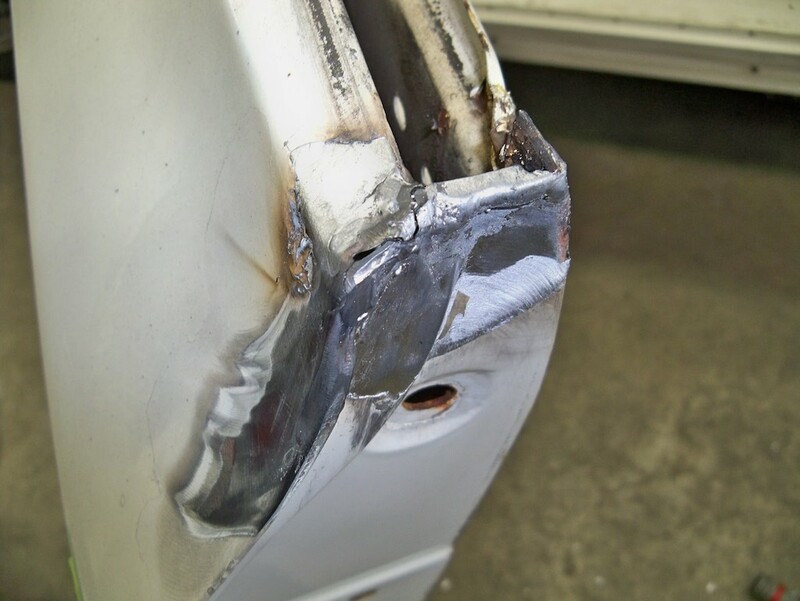 Any time you have a lap joint, you have the potential for future problems. 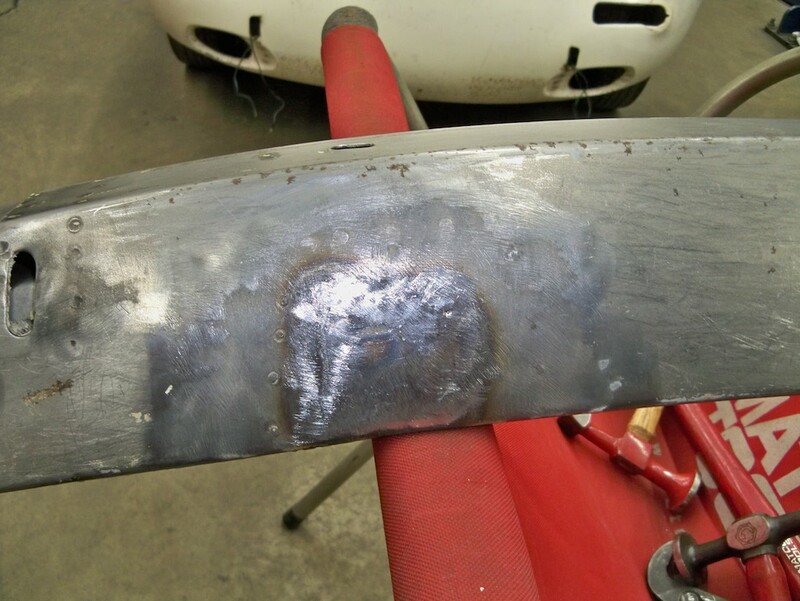 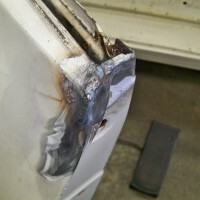 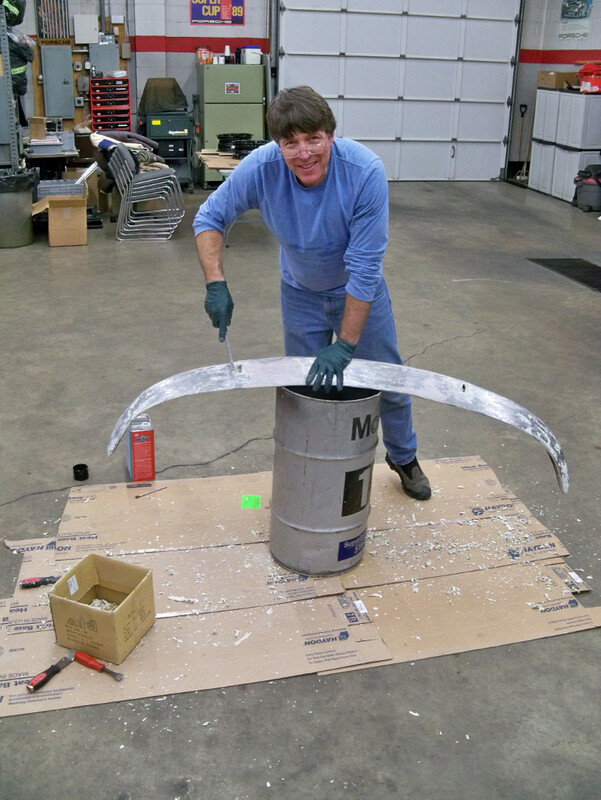 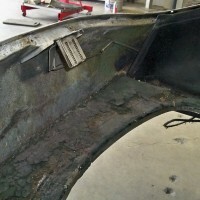 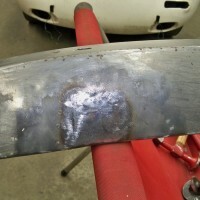 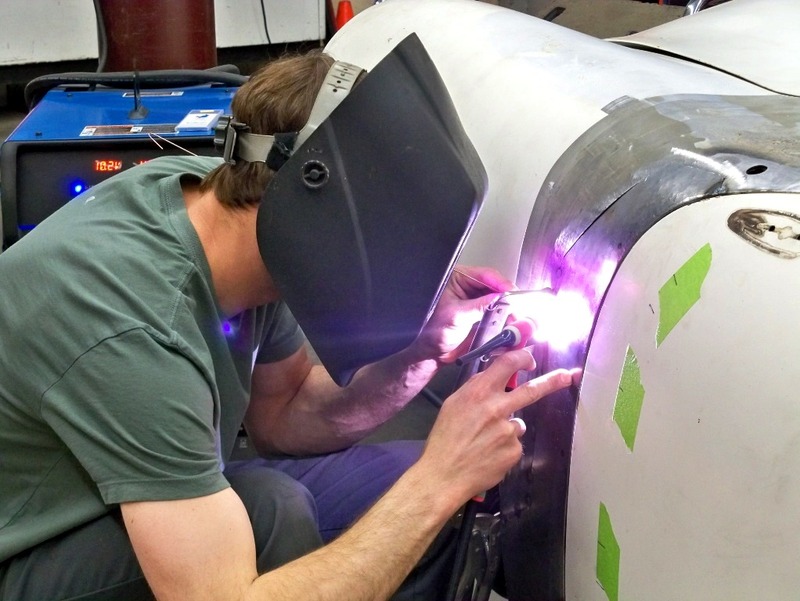 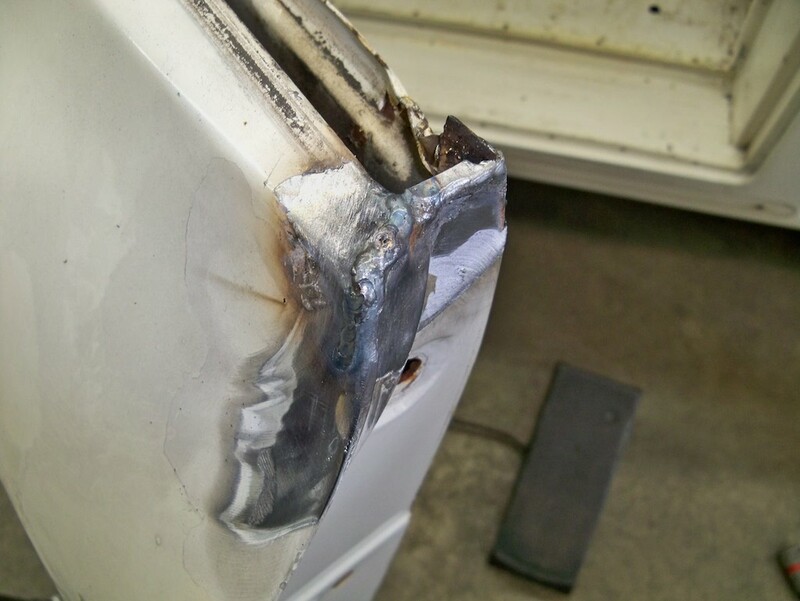 Welding in the new fabricated fender panel. 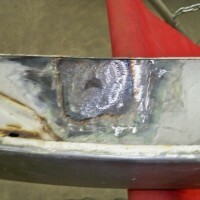 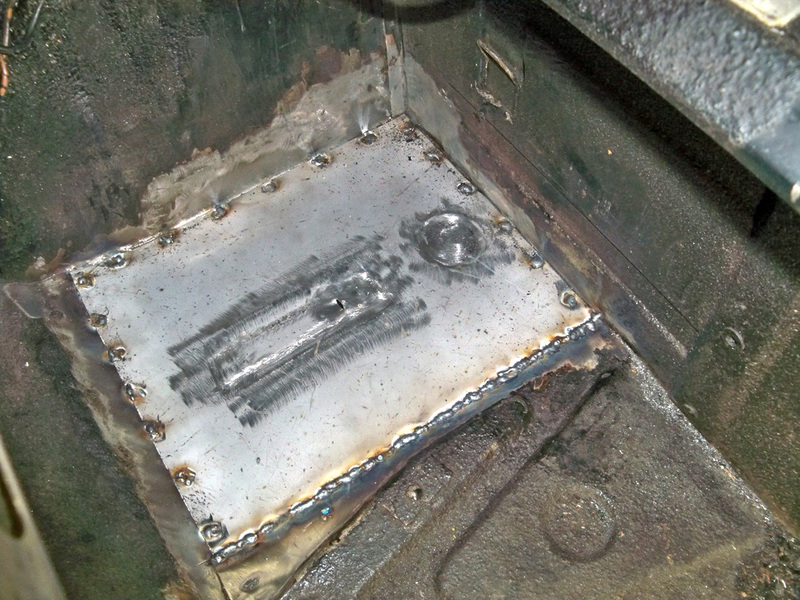 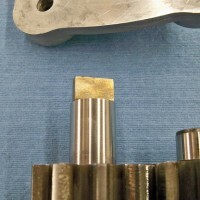 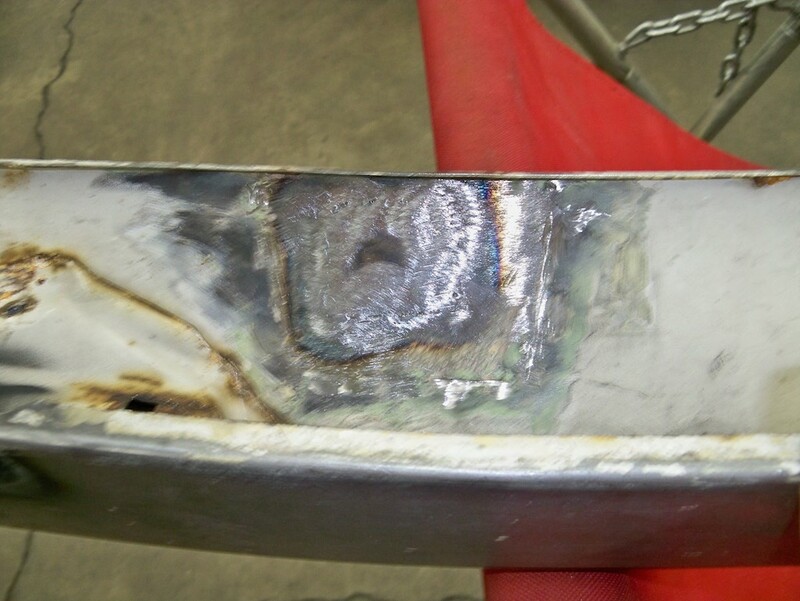 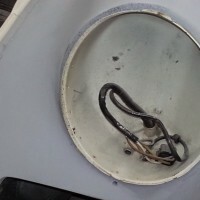 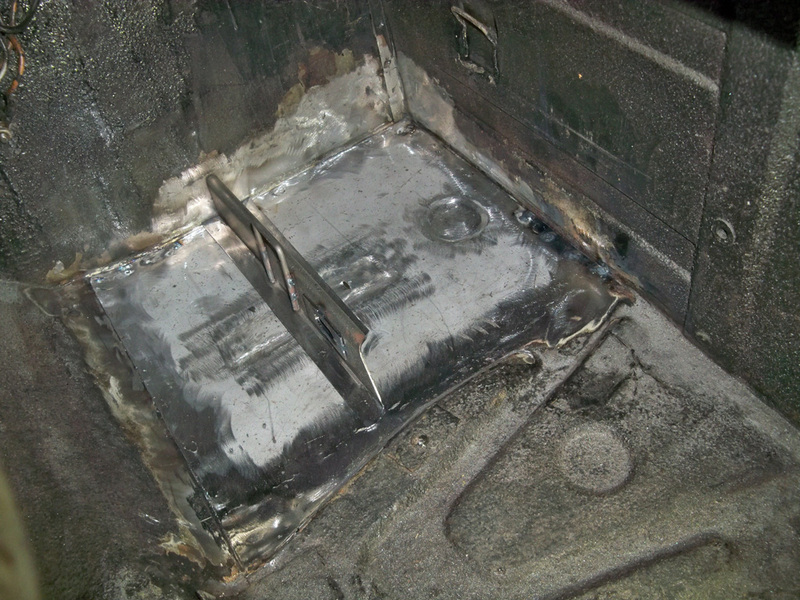 Tack welding into position with tig machine. 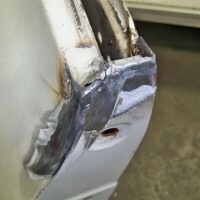 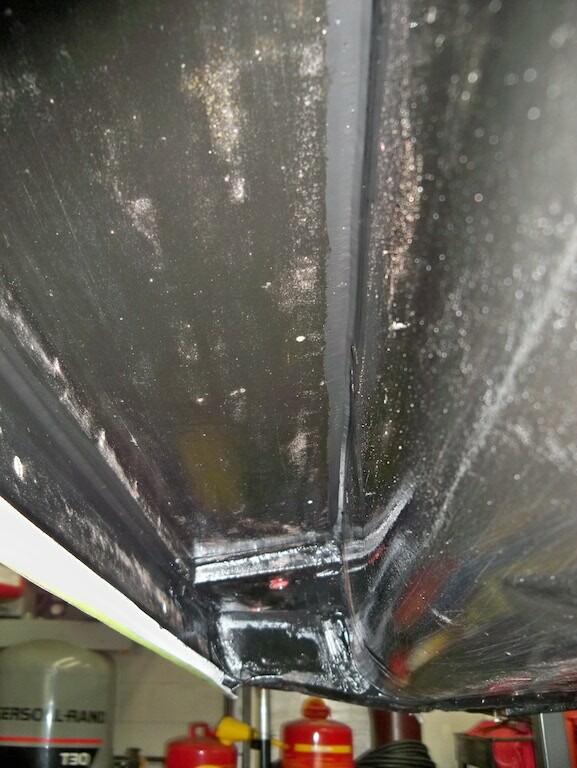 There was a crack in the driver side door that was addressed. 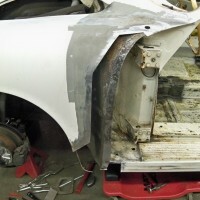 Starting the repair on the other side. 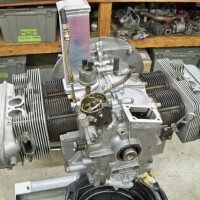 Engine has been removed and will be resealed and fully serviced. 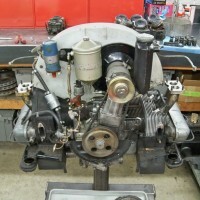 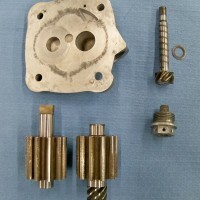 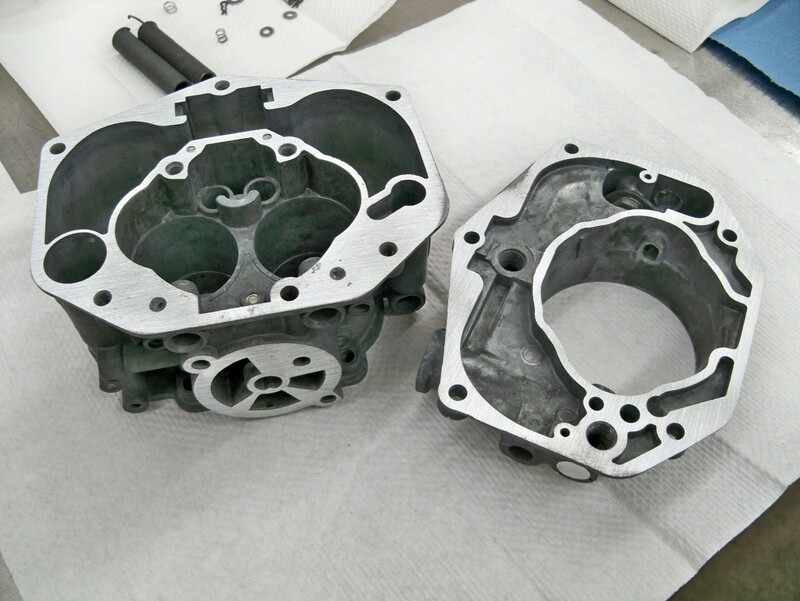 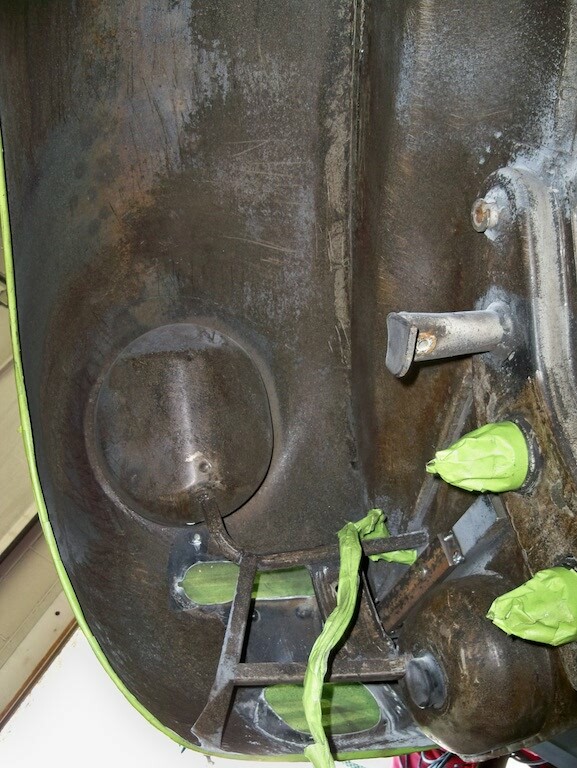 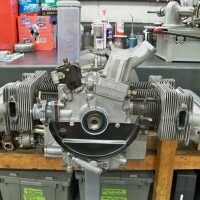 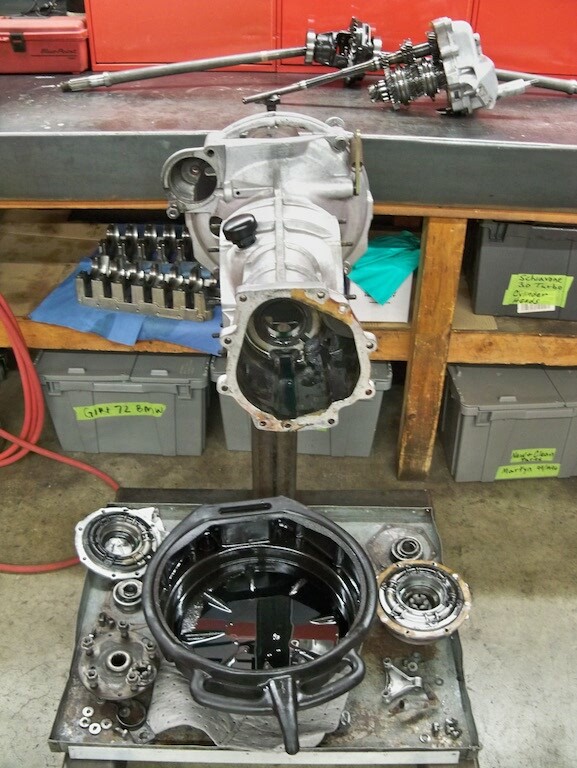 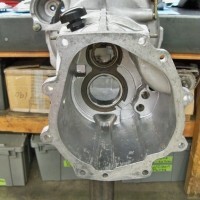 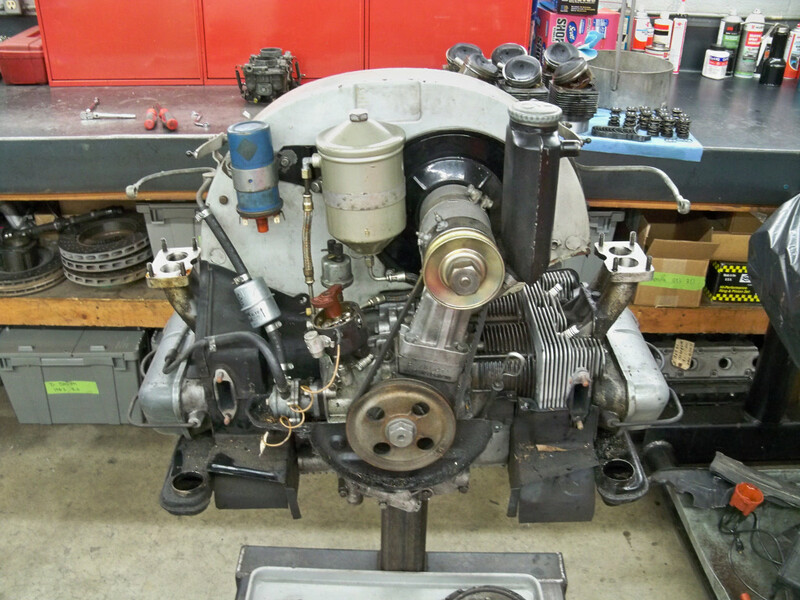 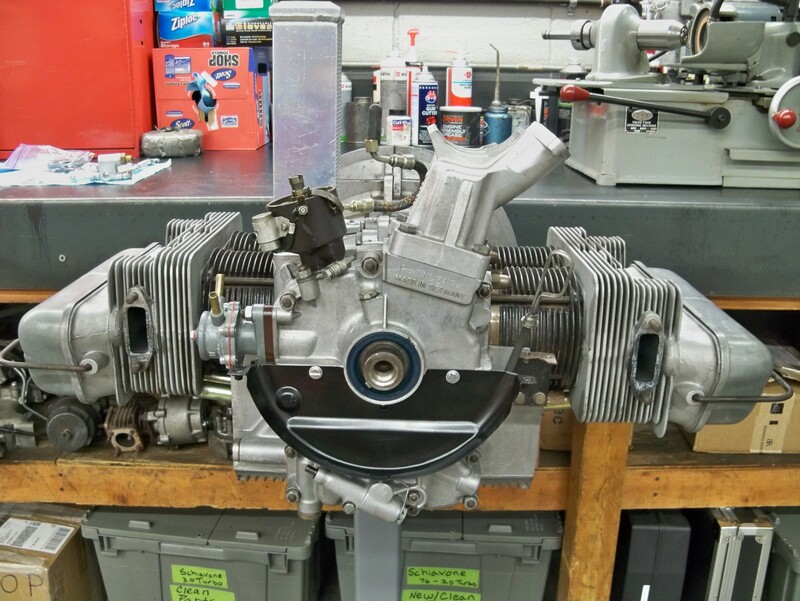 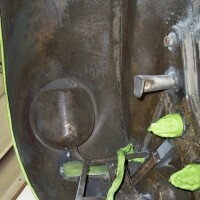 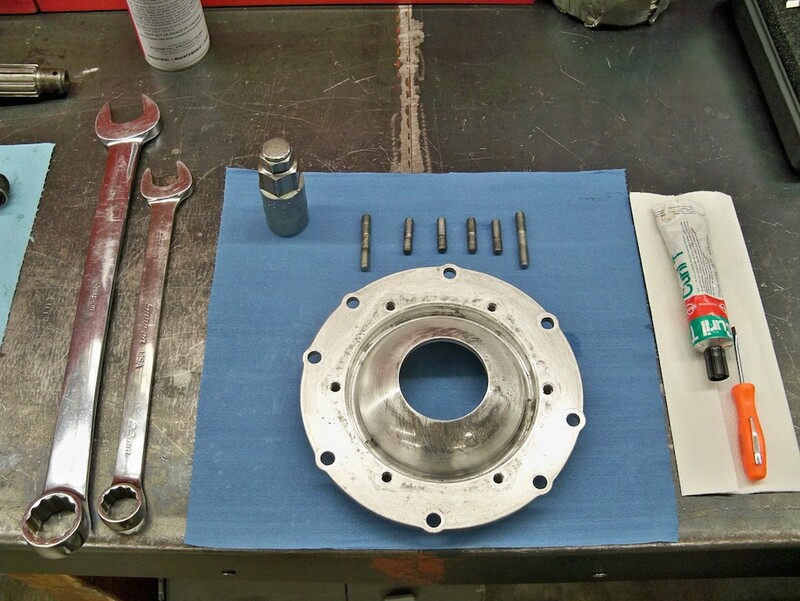 The beginning of engine disassembly for reseal. 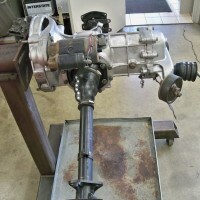 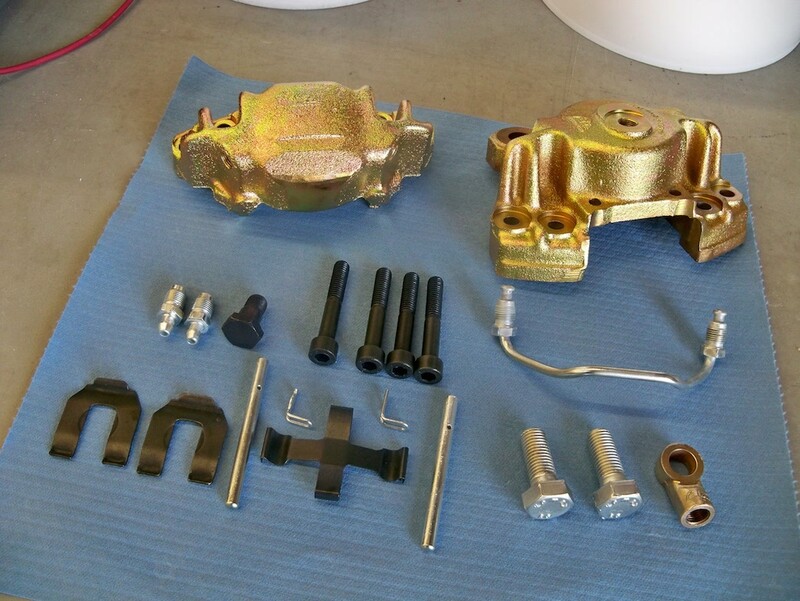 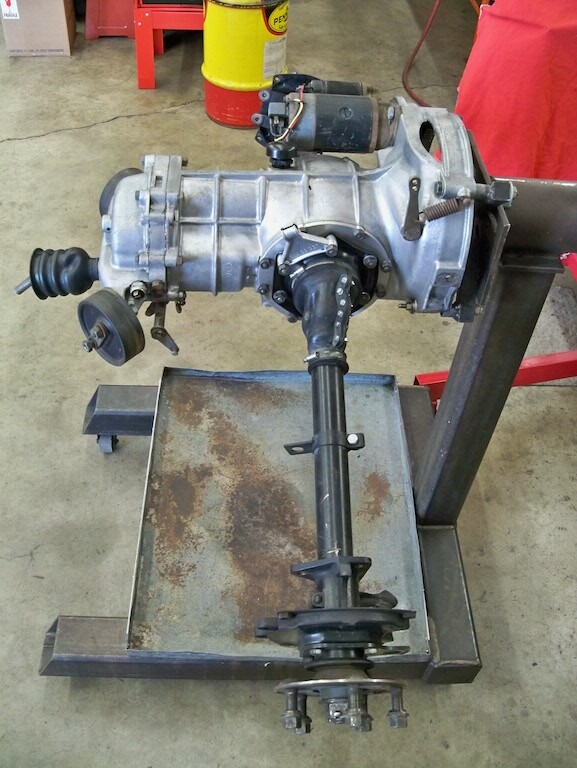 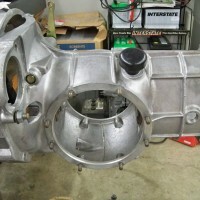 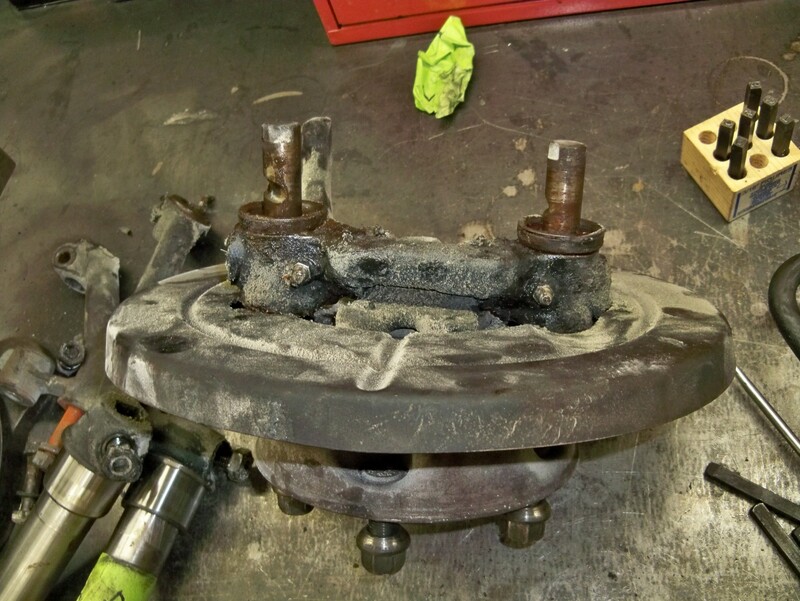 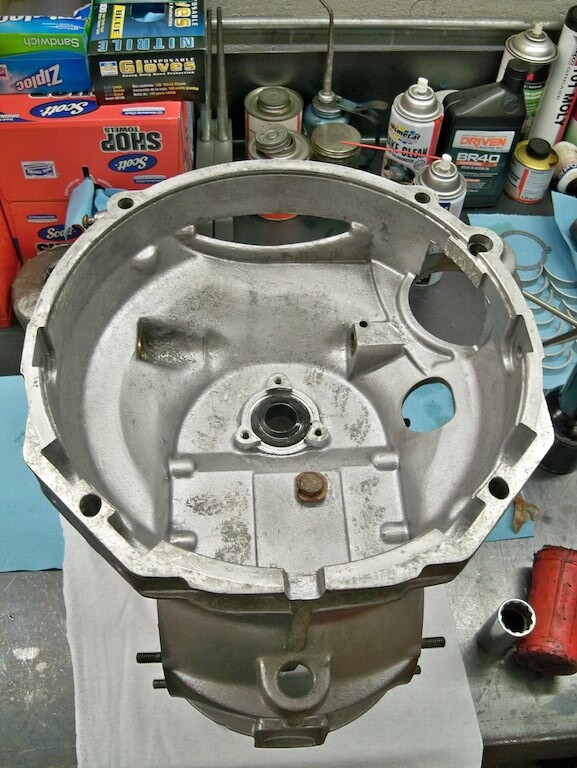 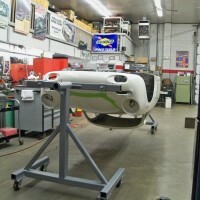 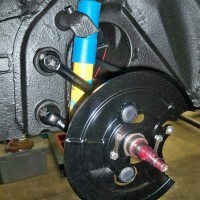 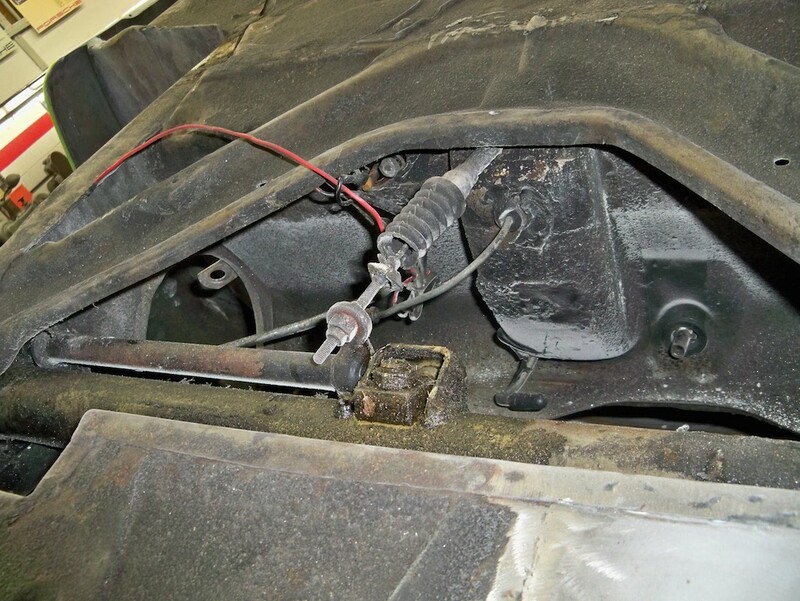 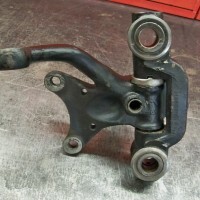 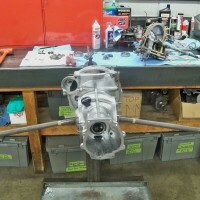 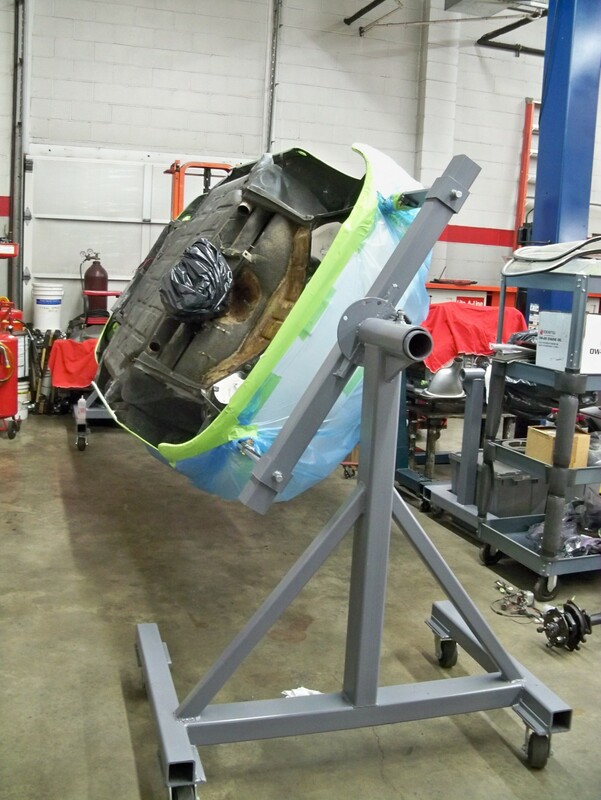 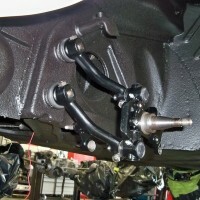 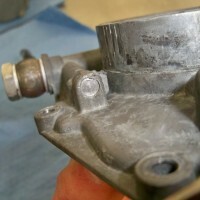 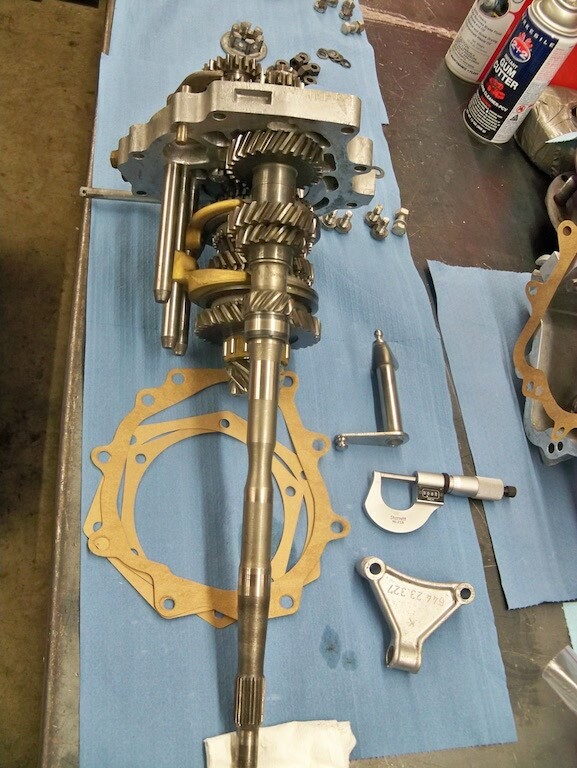 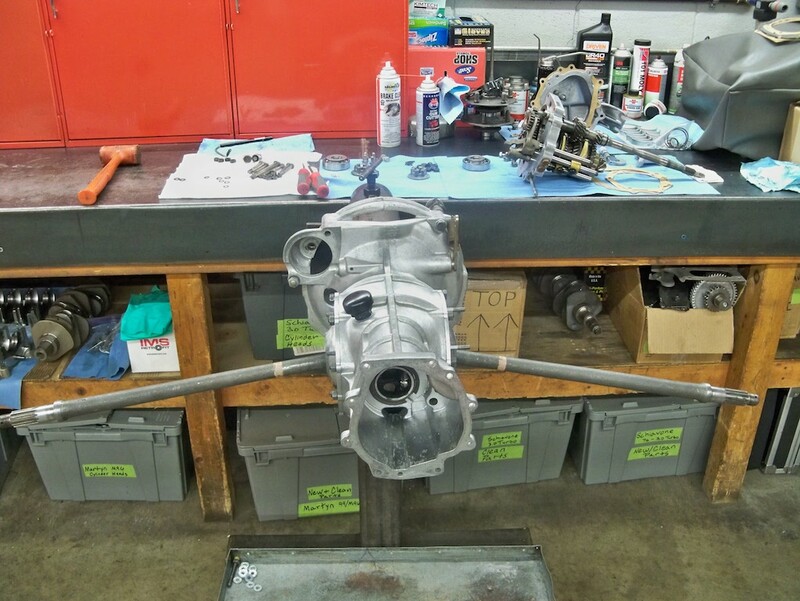 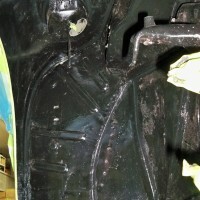 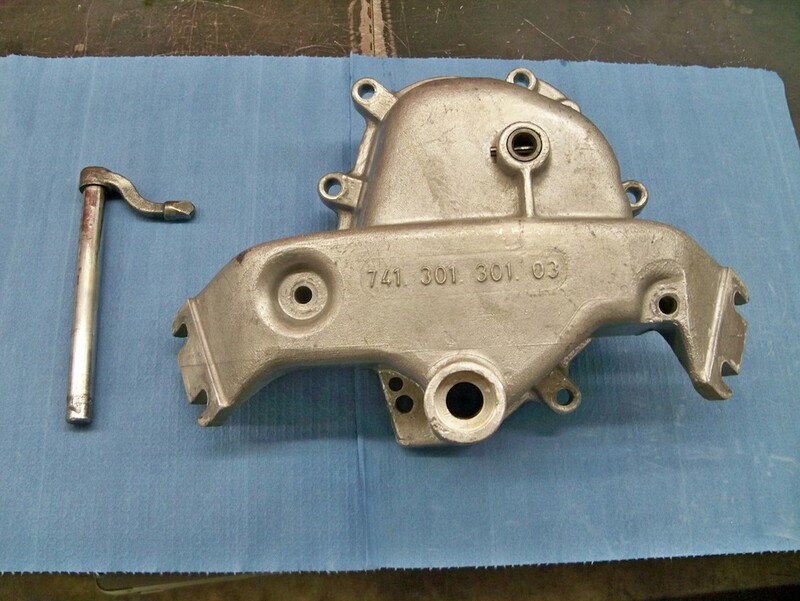 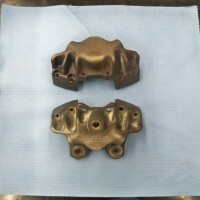 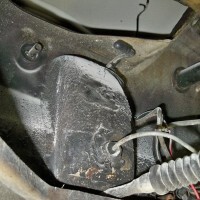 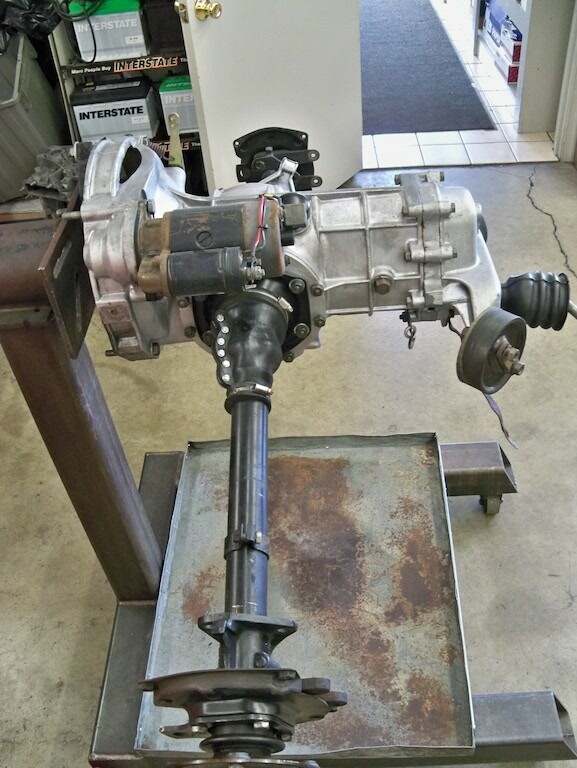 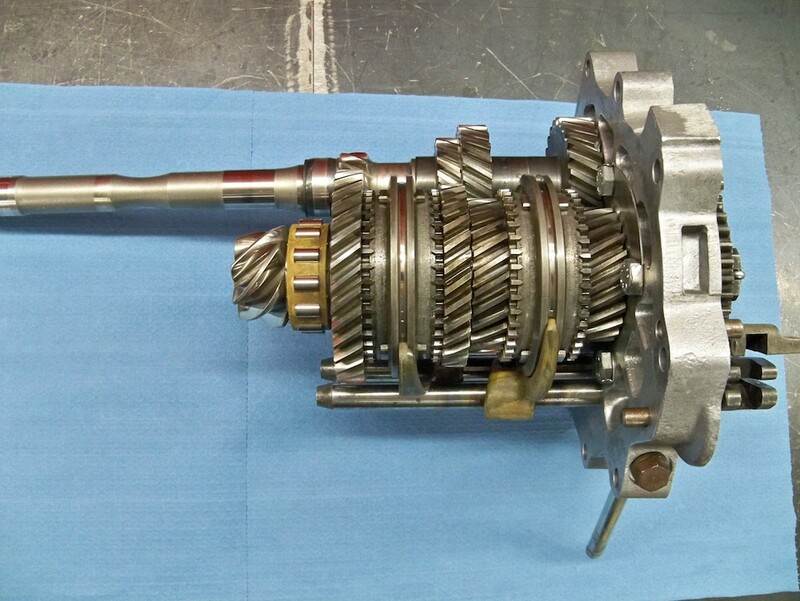 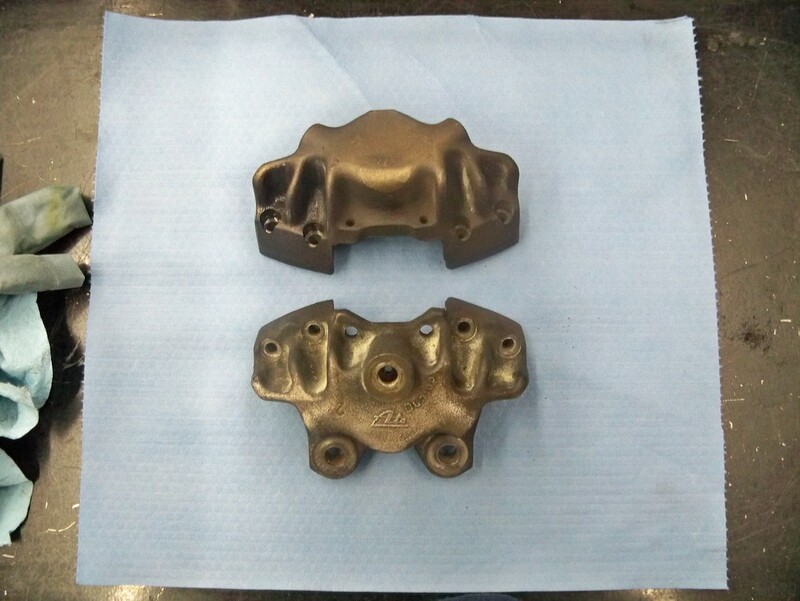 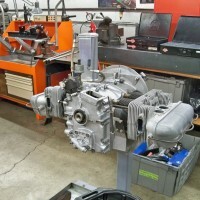 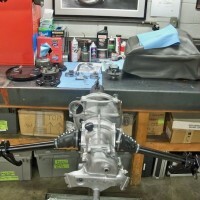 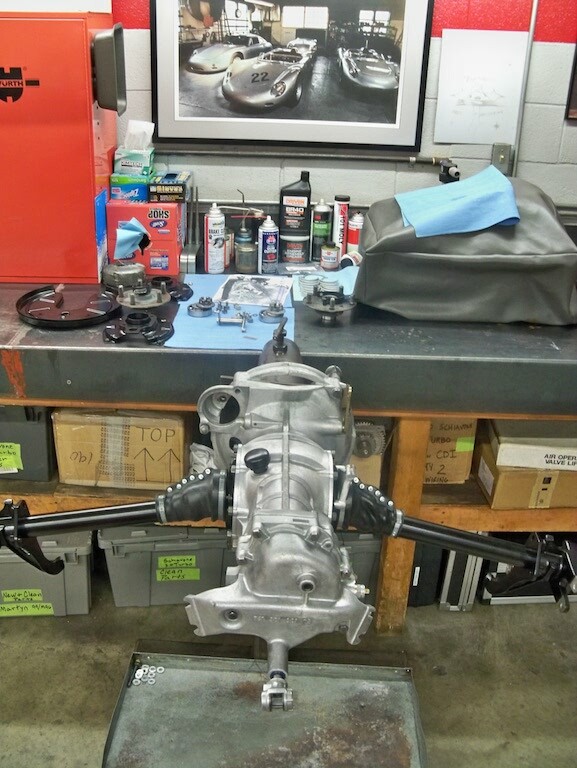 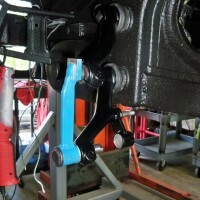 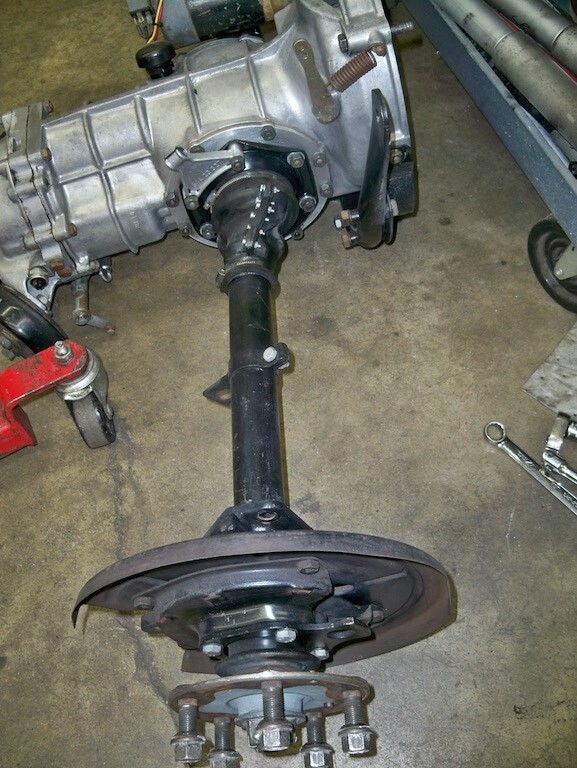 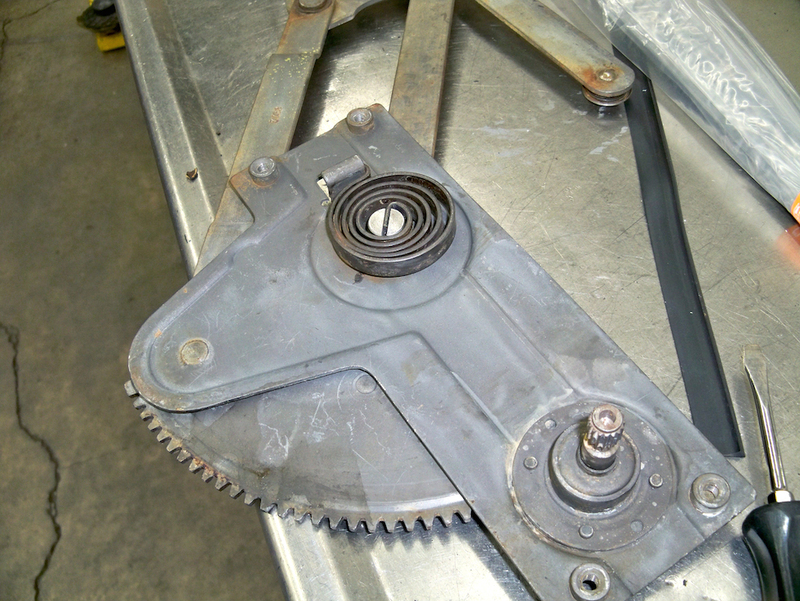 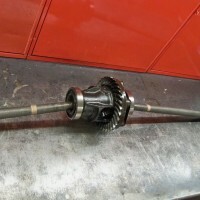 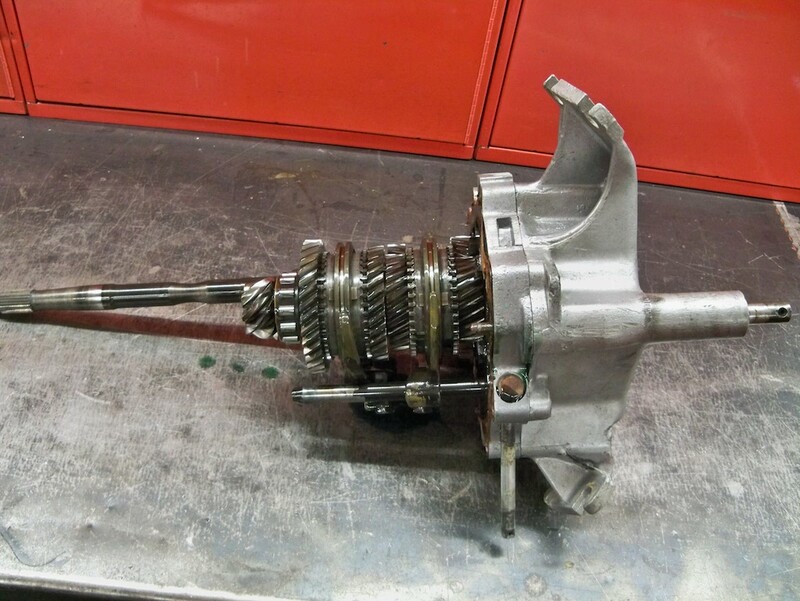 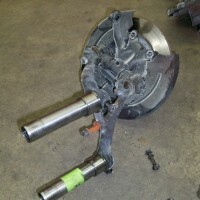 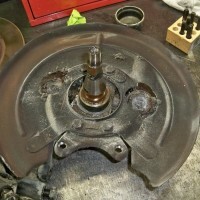 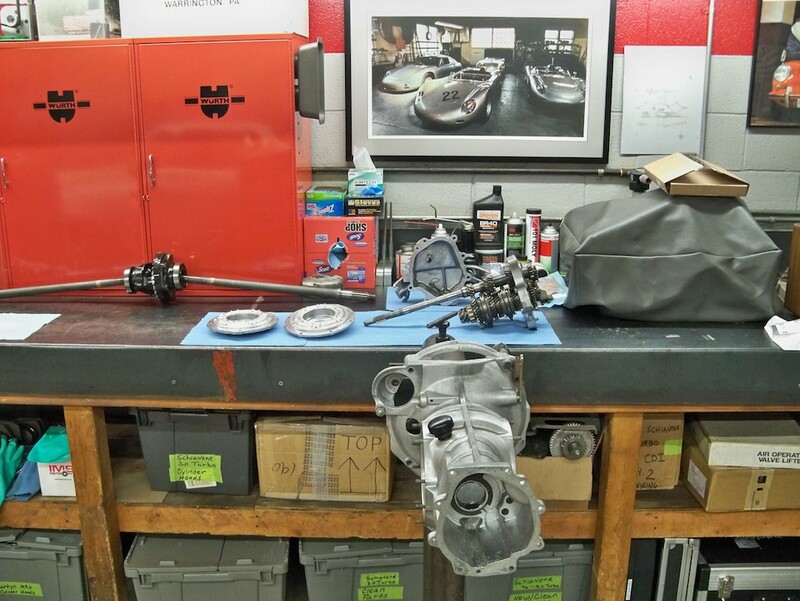 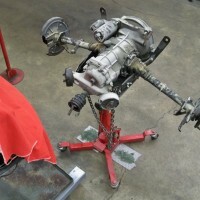 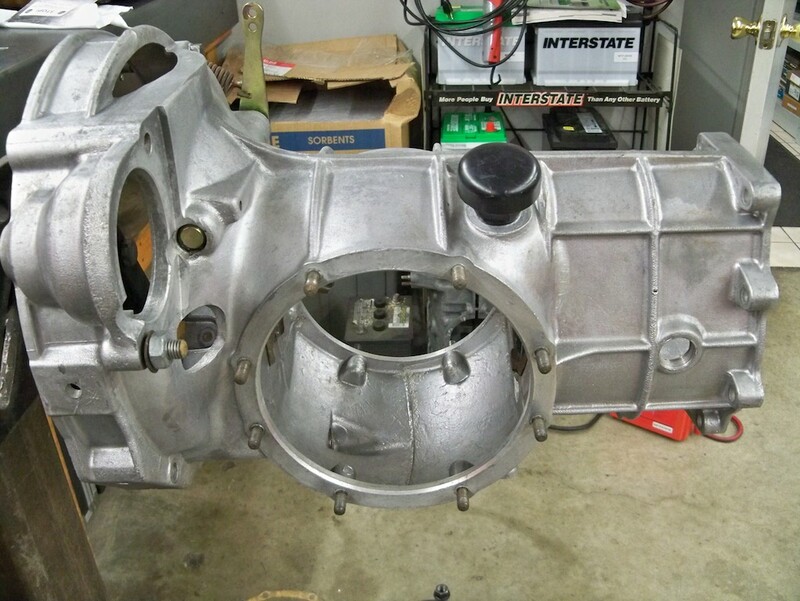 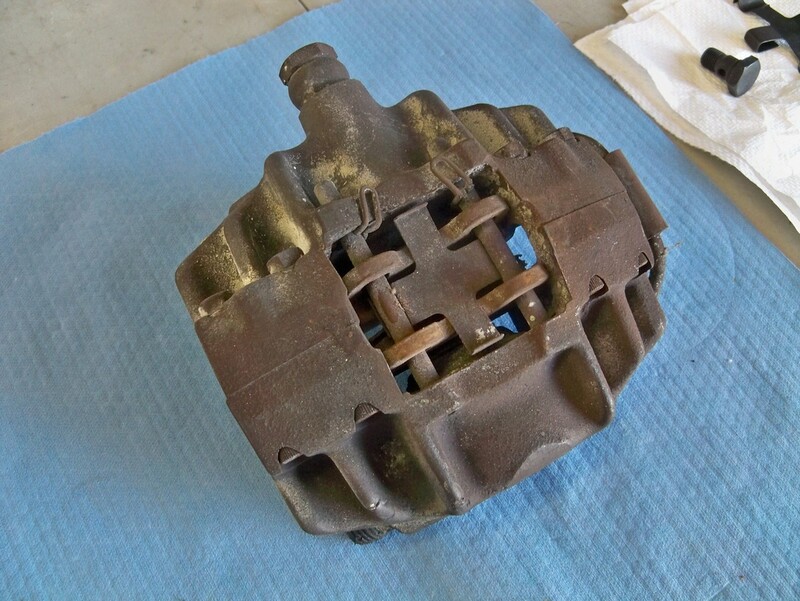 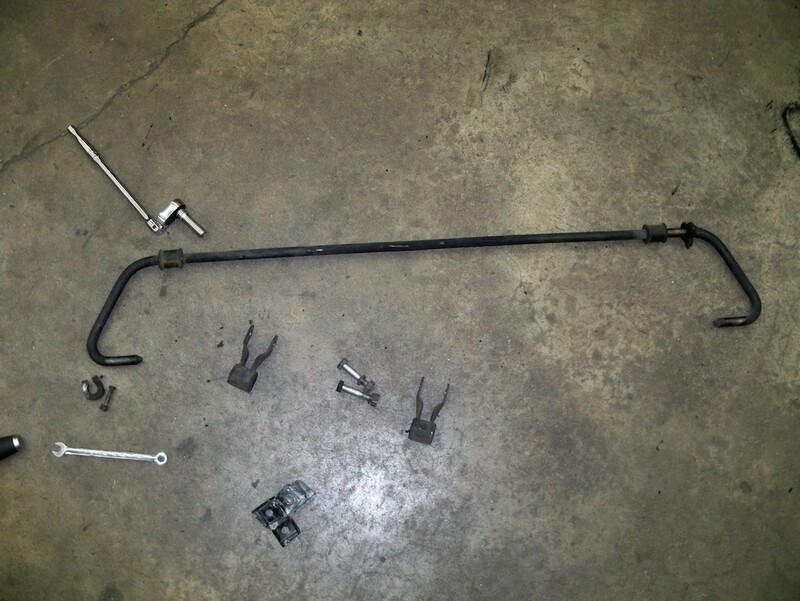 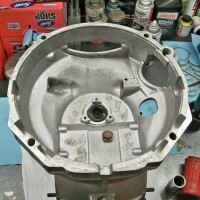 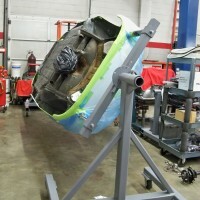 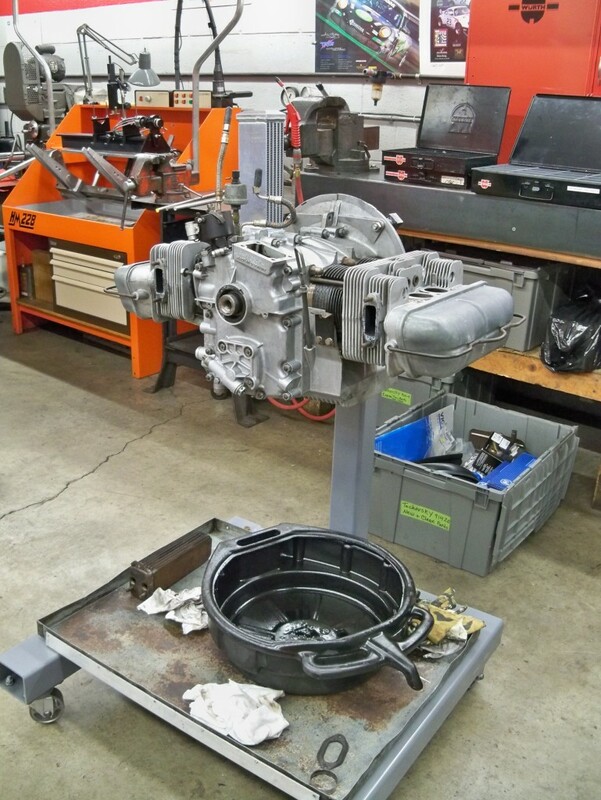 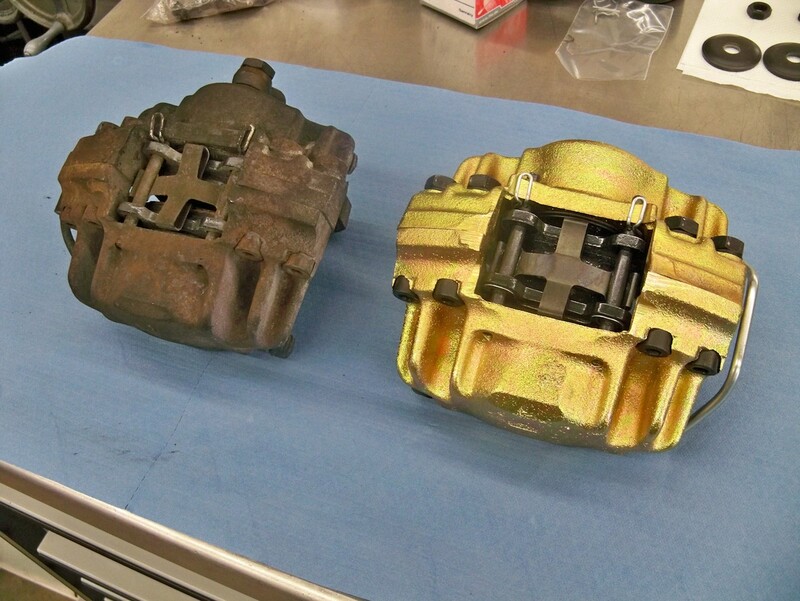 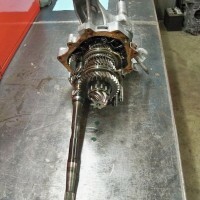 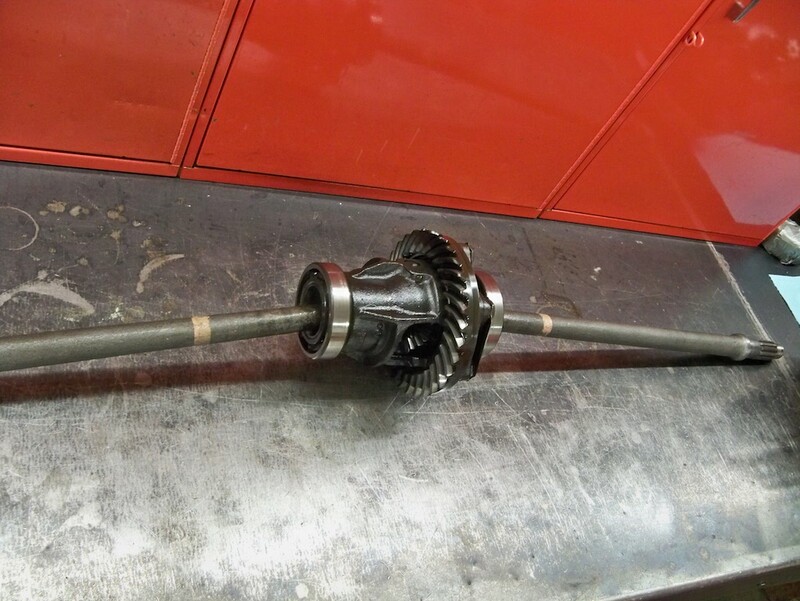 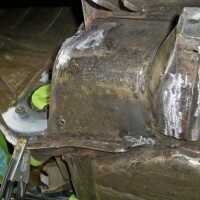 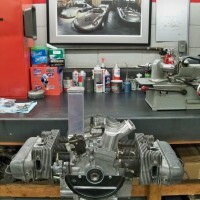 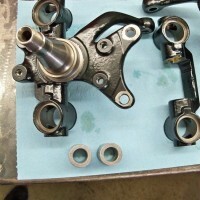 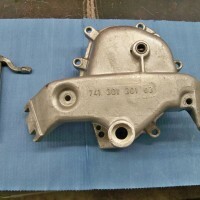 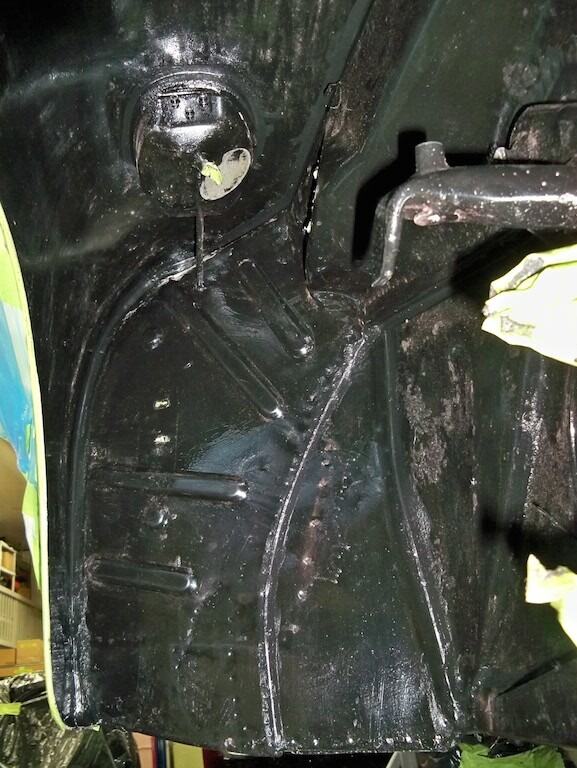 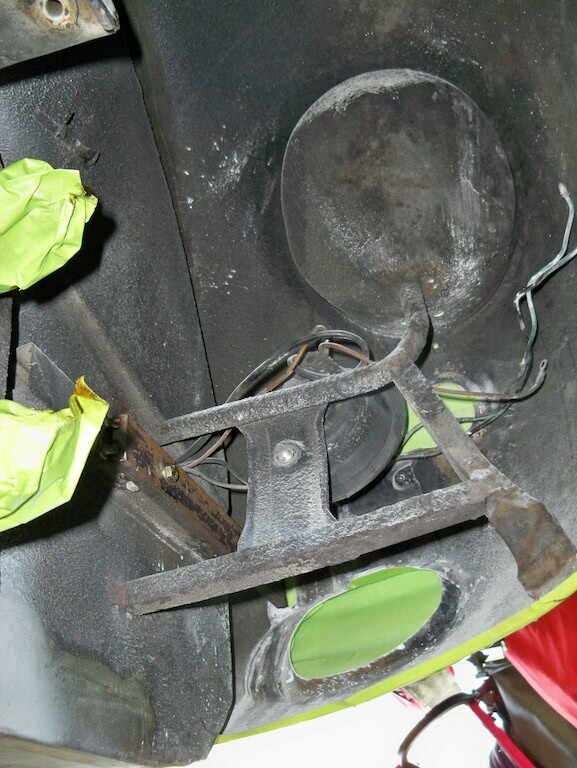 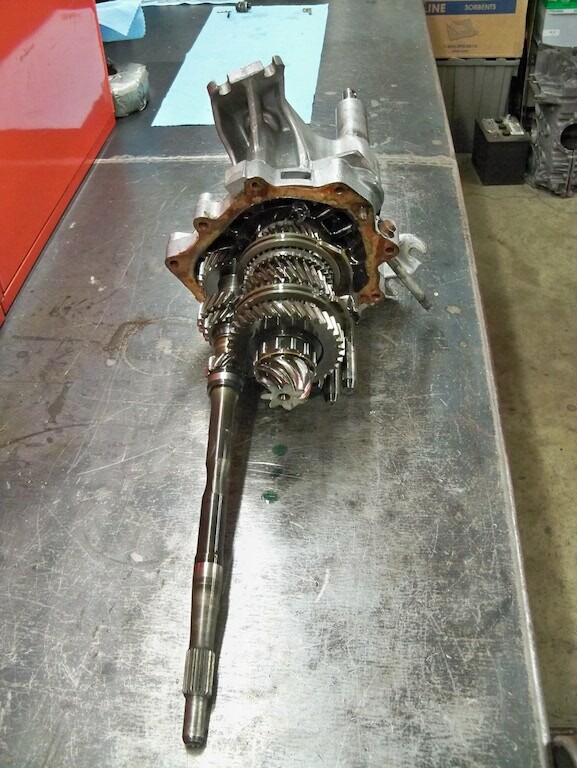 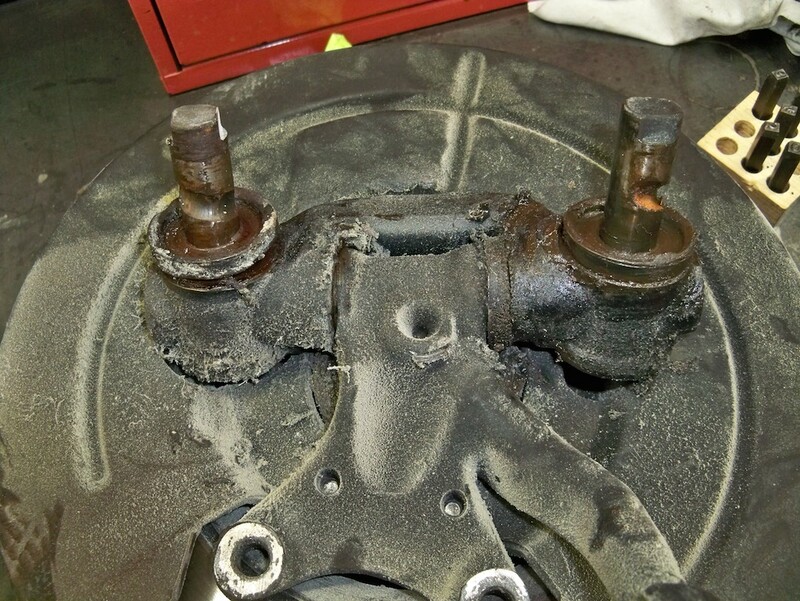 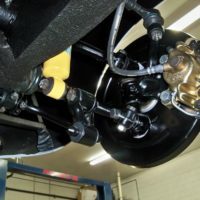 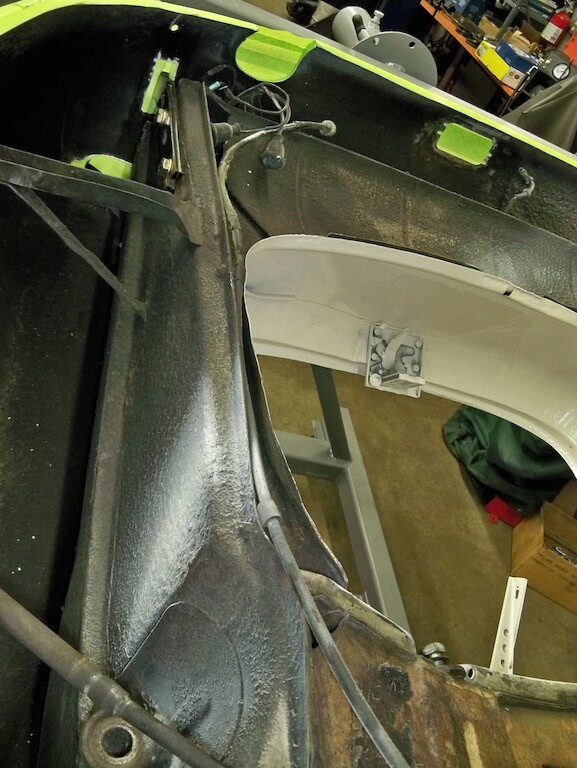 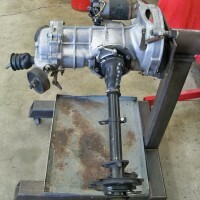 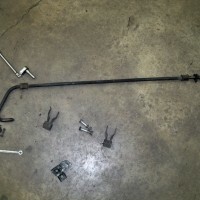 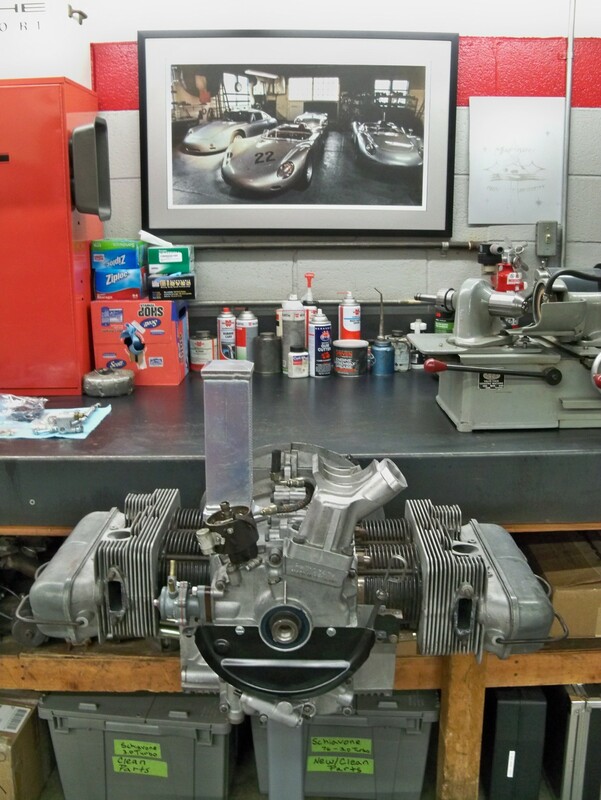 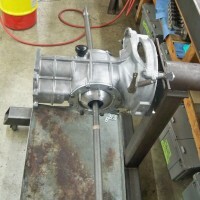 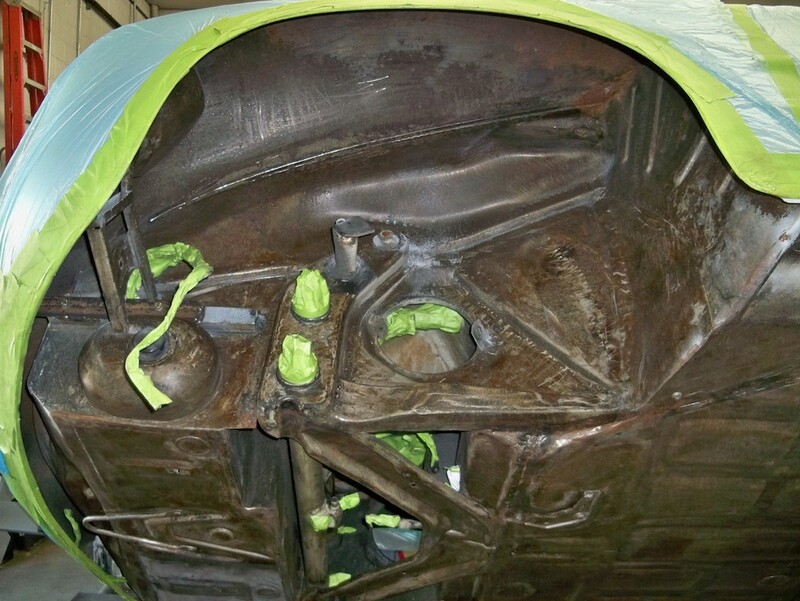 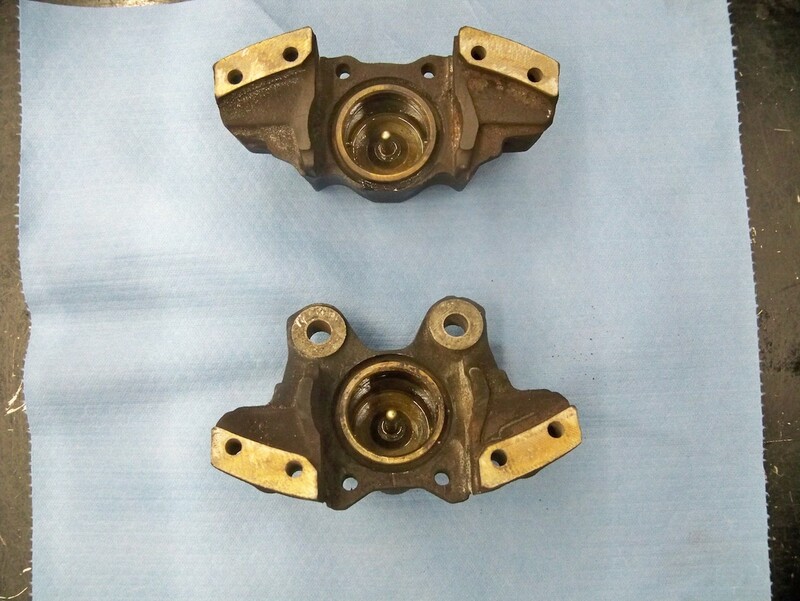 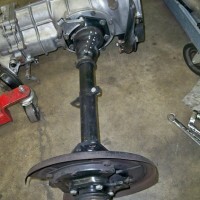 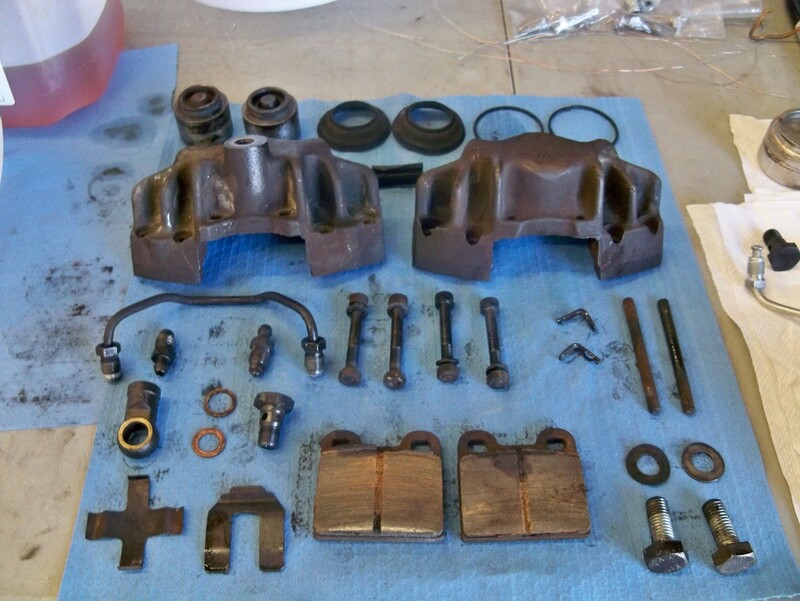 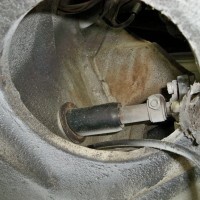 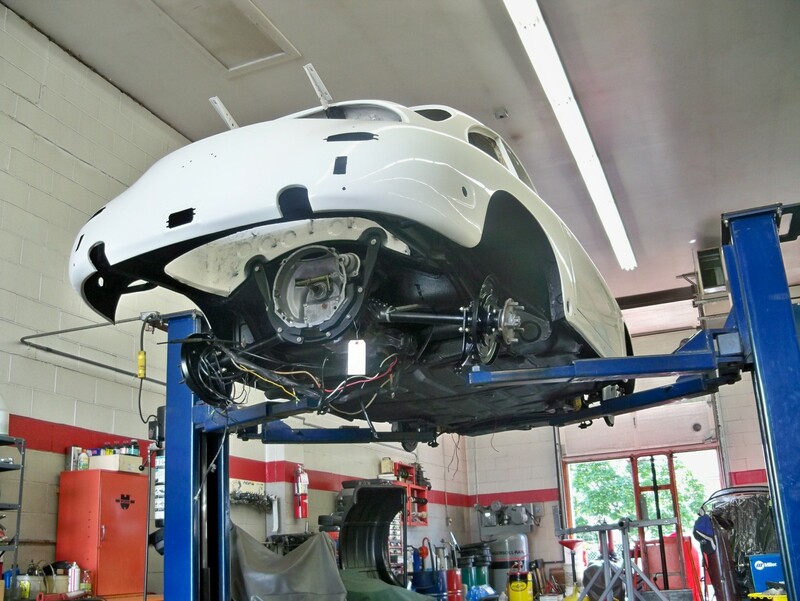 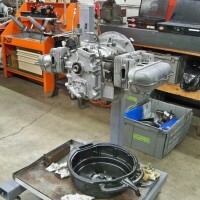 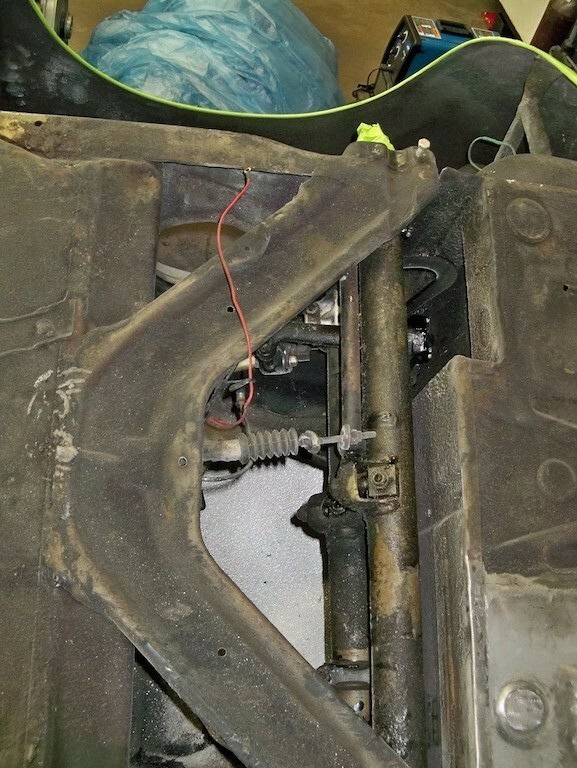 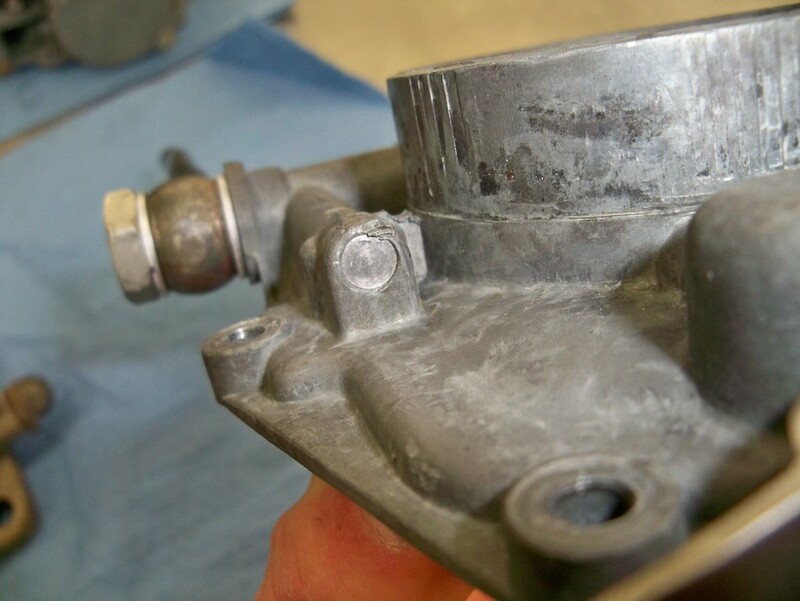 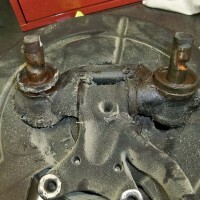 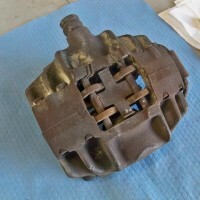 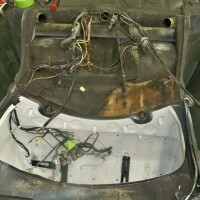 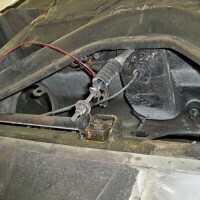 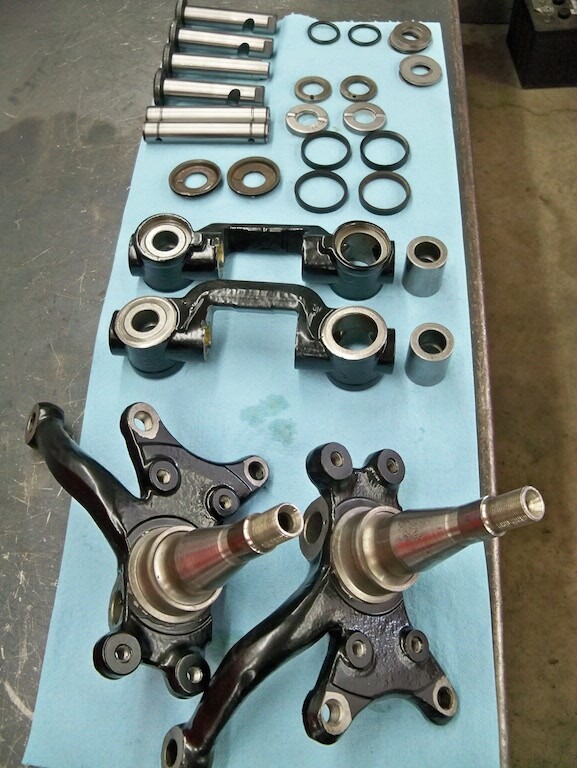 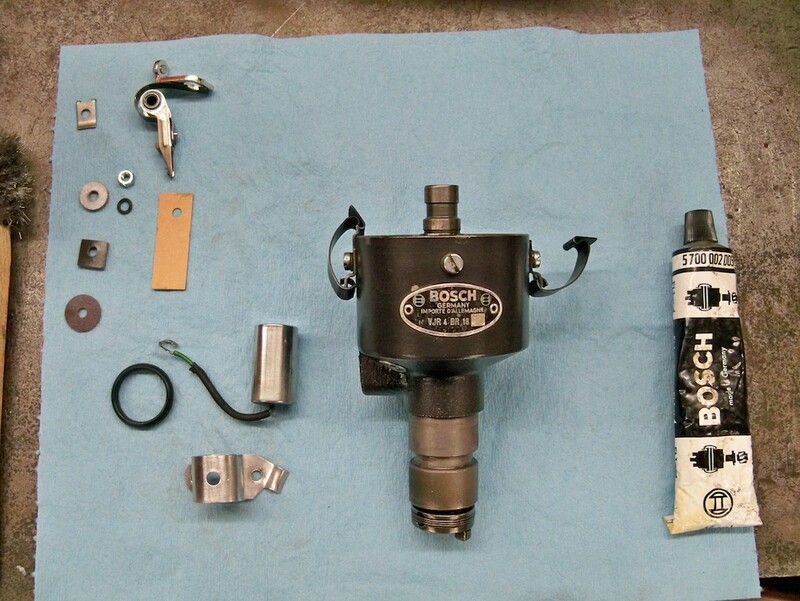 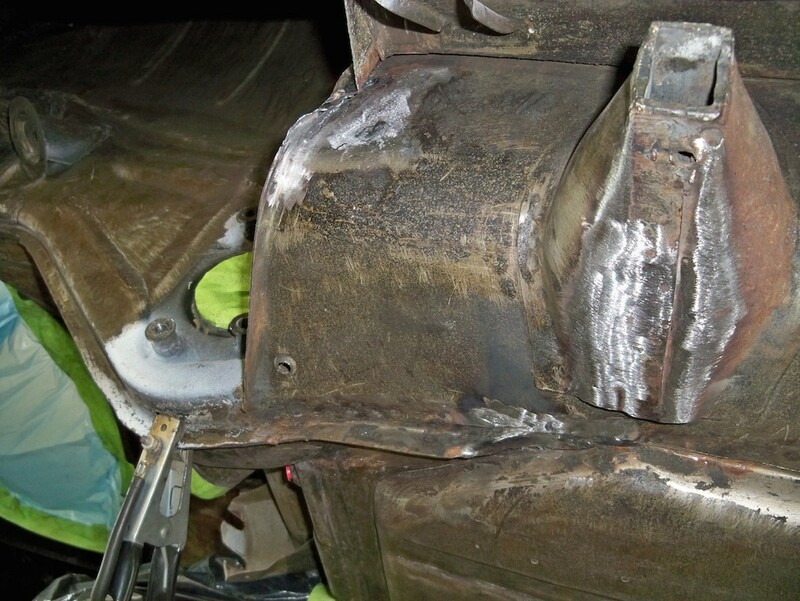 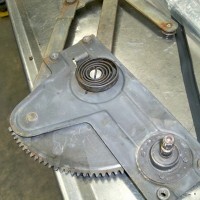 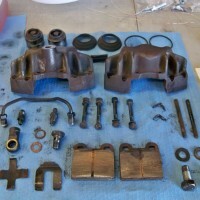 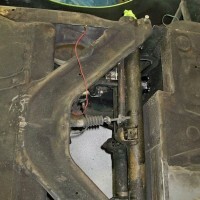 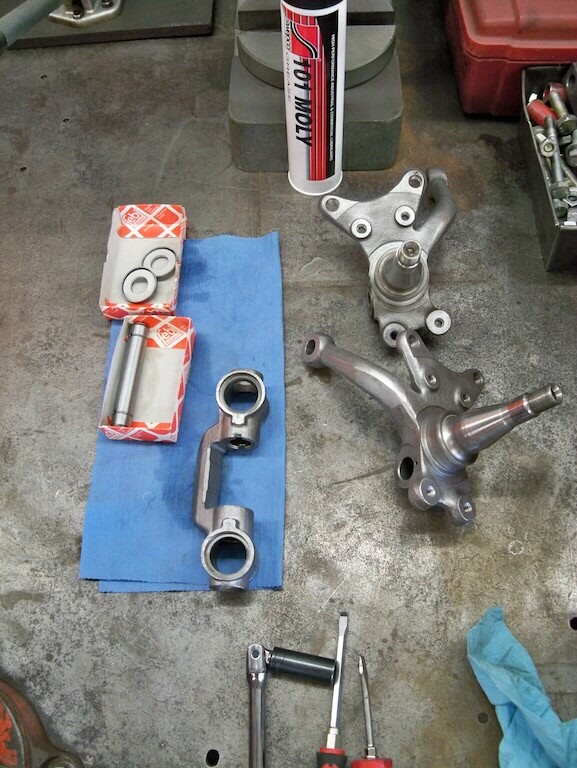 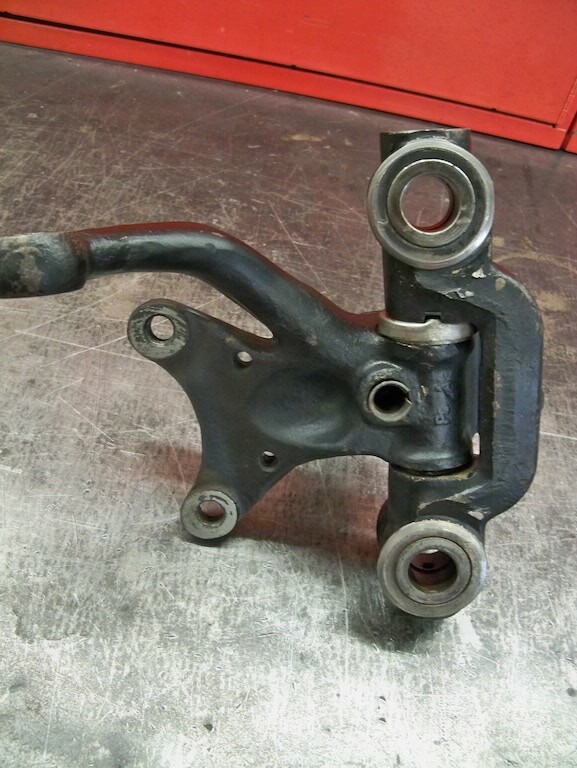 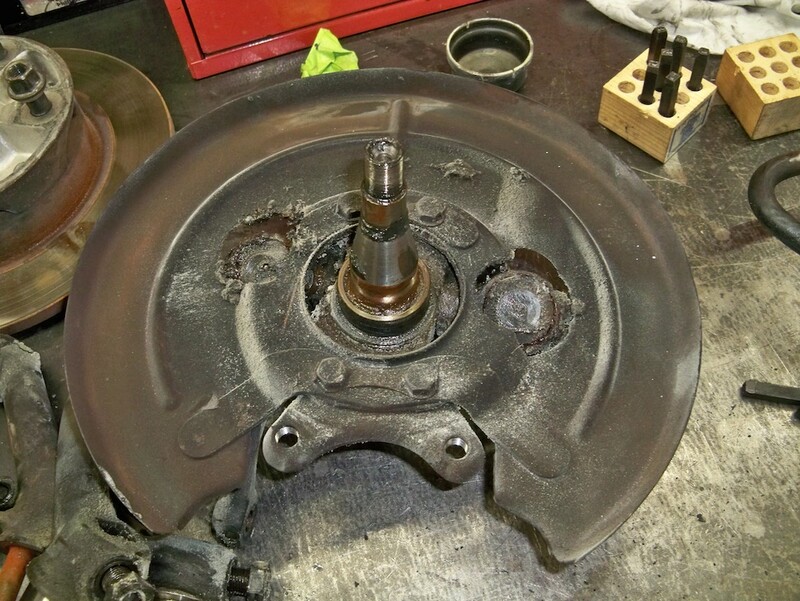 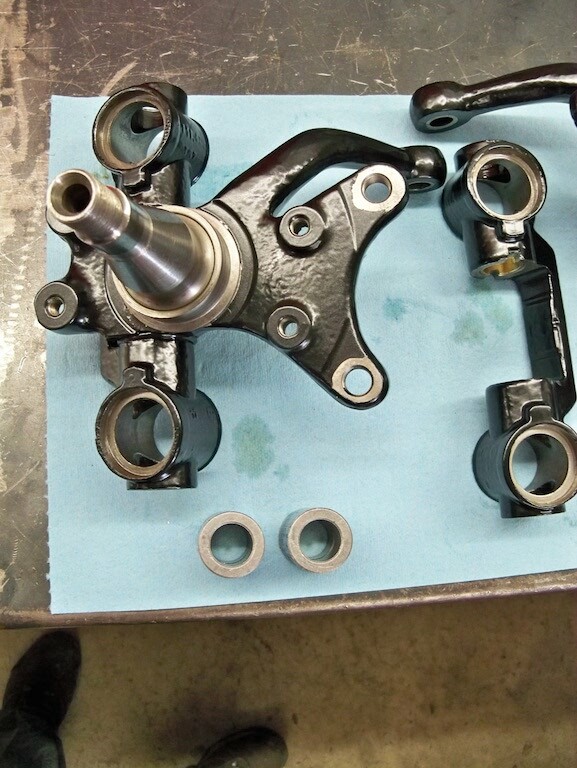 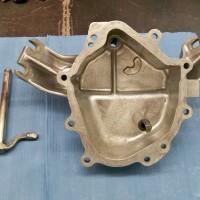 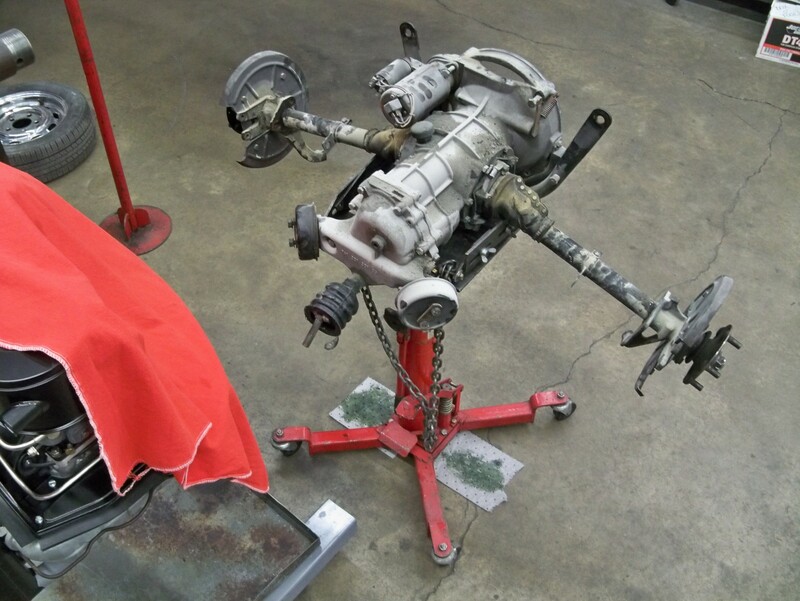 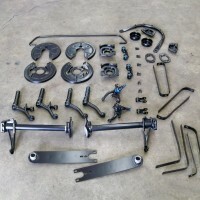 The transmission and suspension have been removed in preparation for stripping the original undercoating. 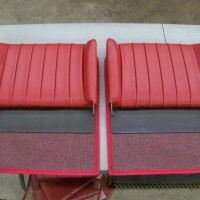 The seats have been recovered. 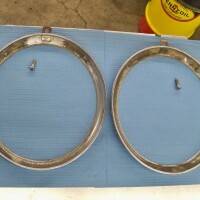 These will be sent out to be rechromed. 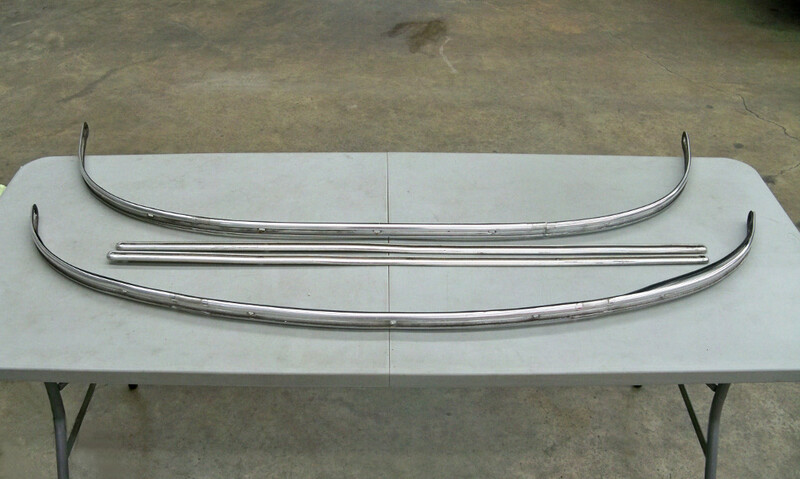 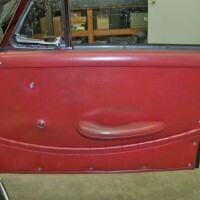 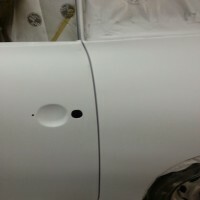 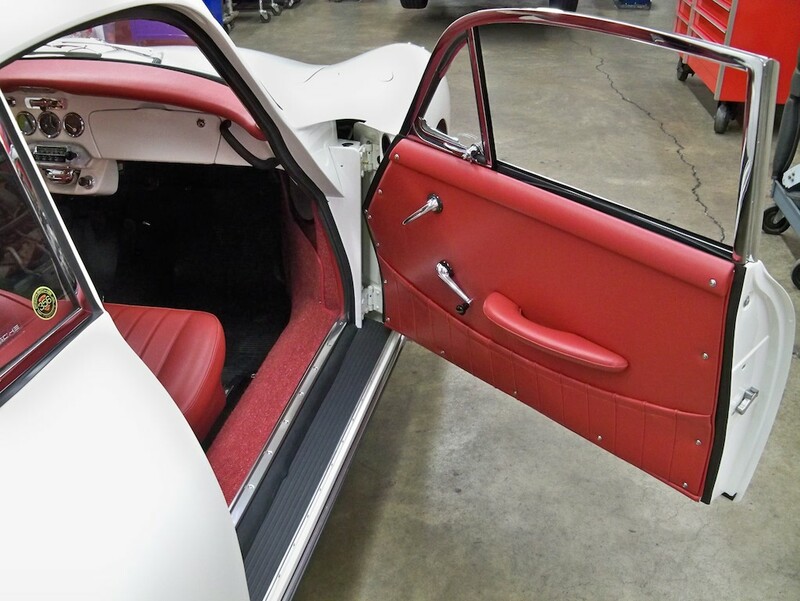 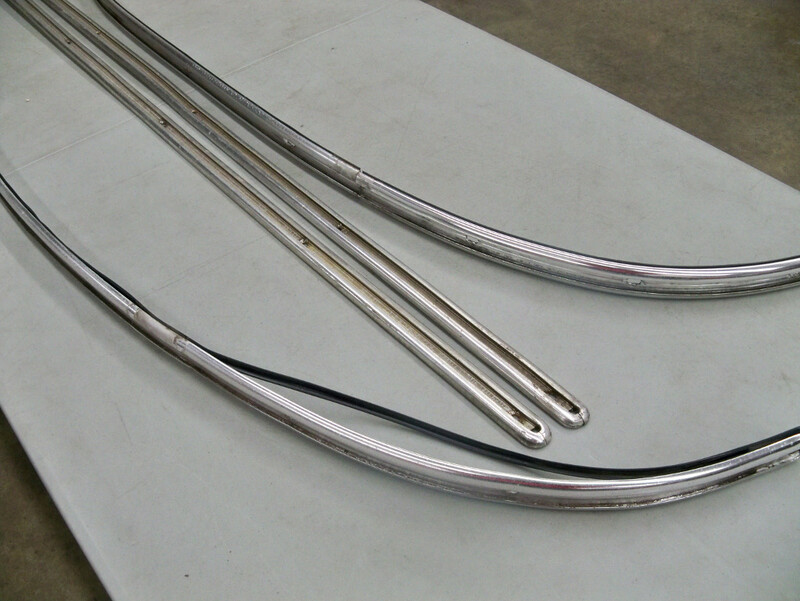 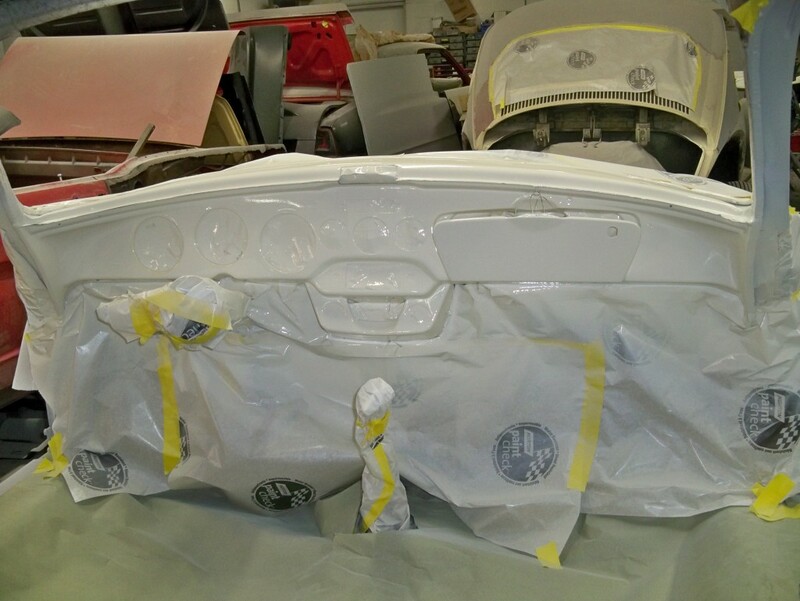 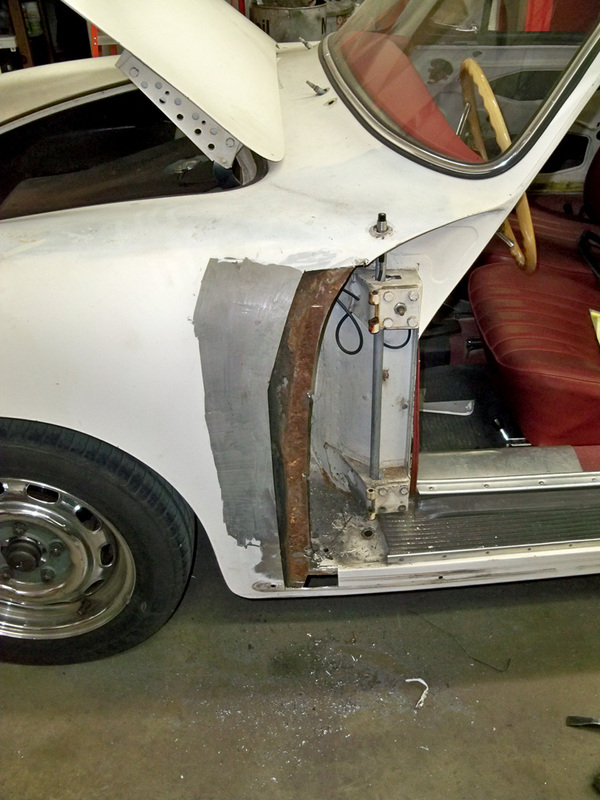 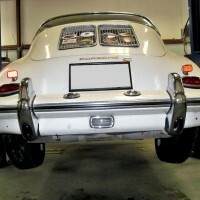 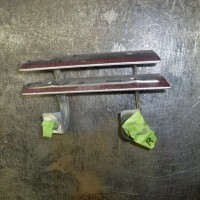 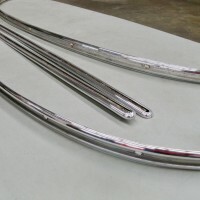 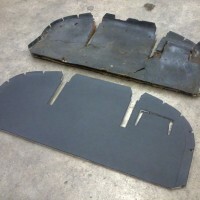 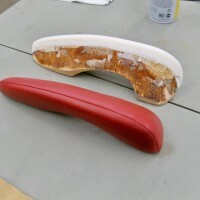 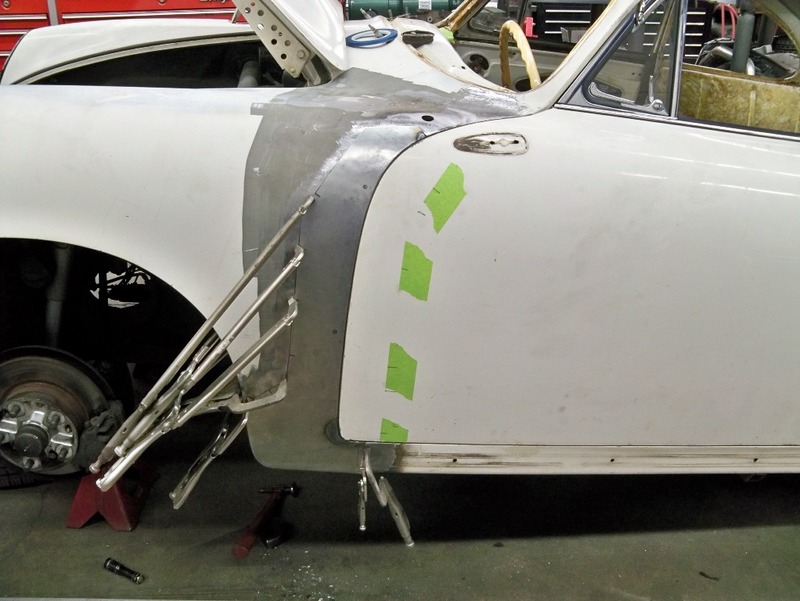 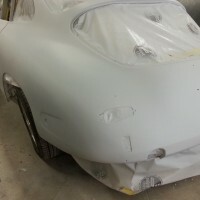 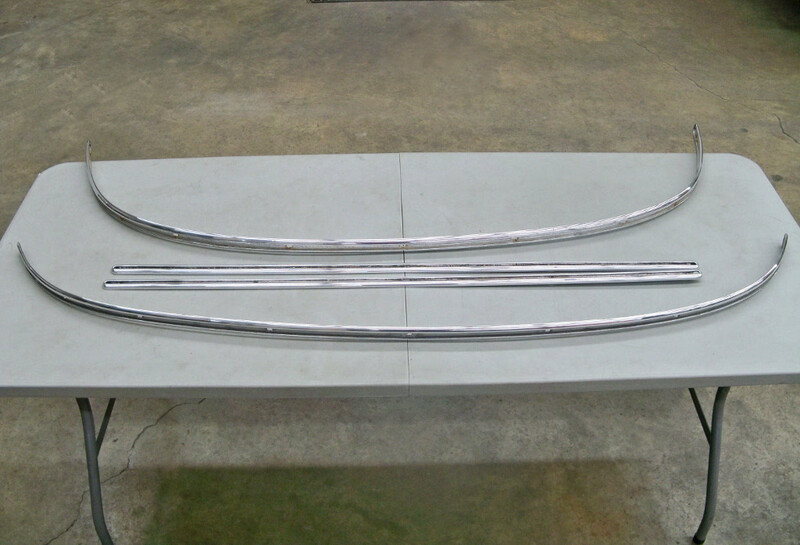 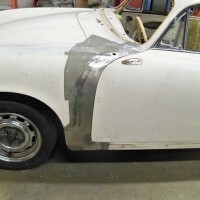 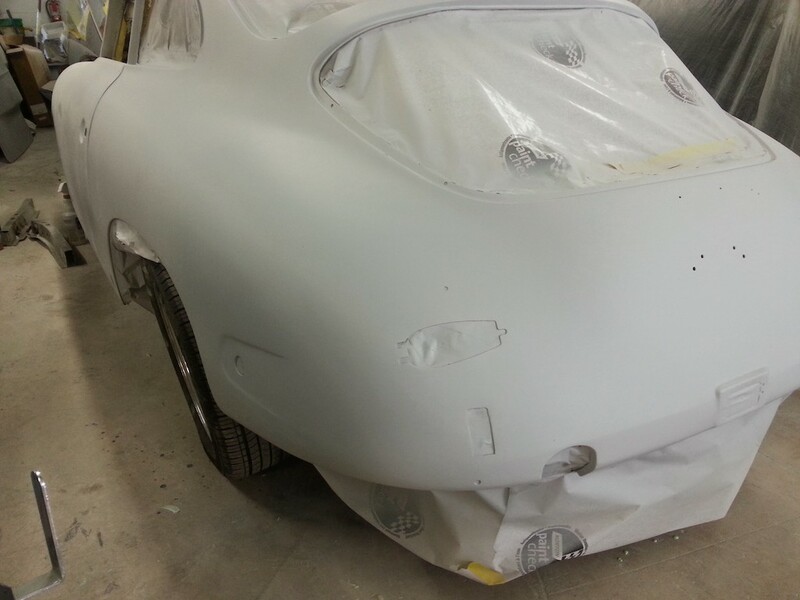 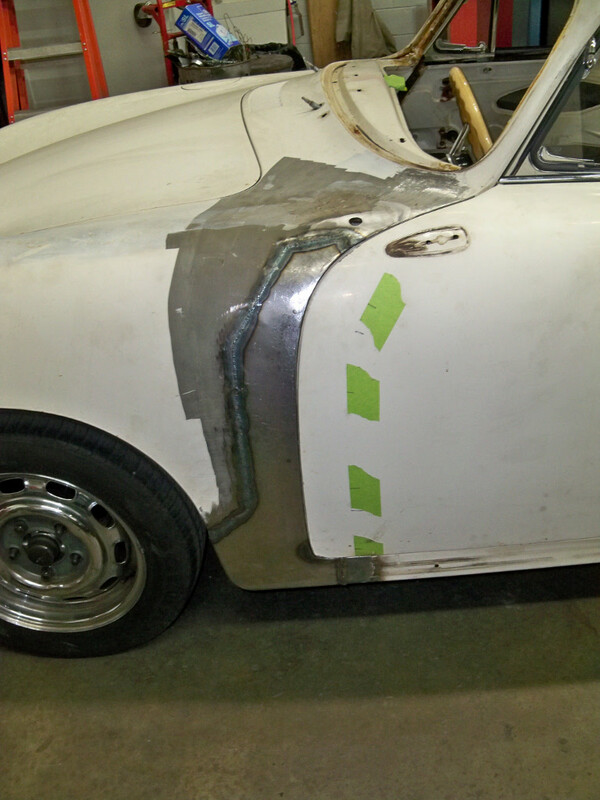 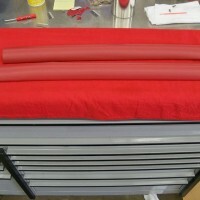 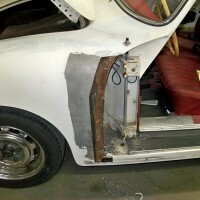 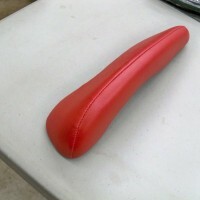 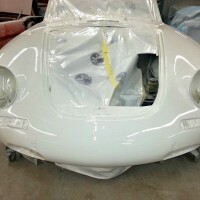 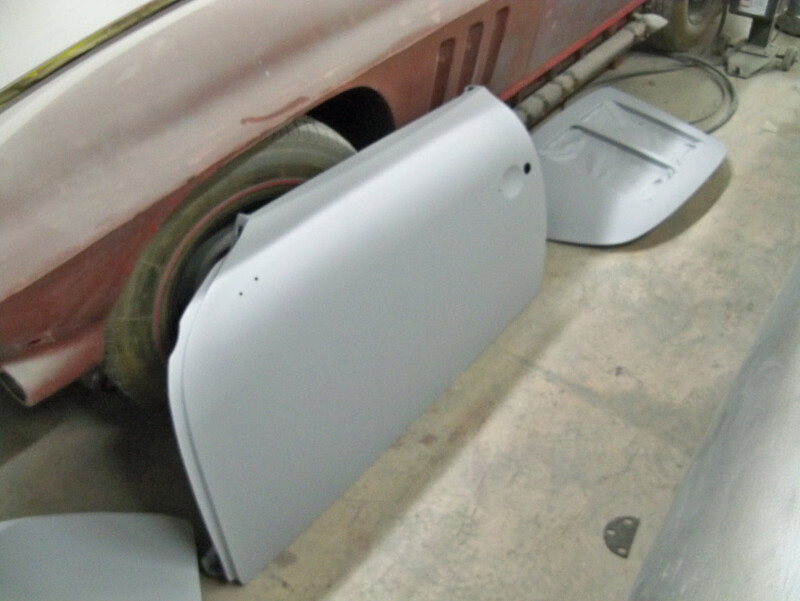 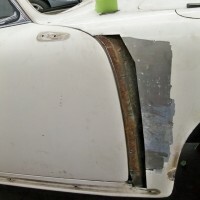 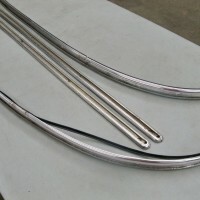 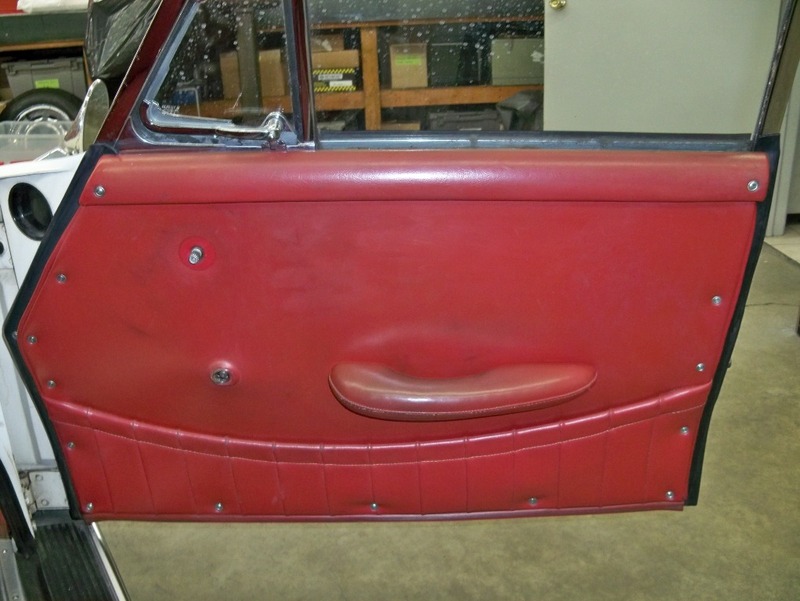 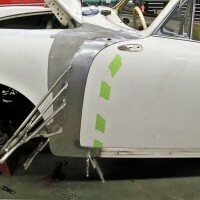 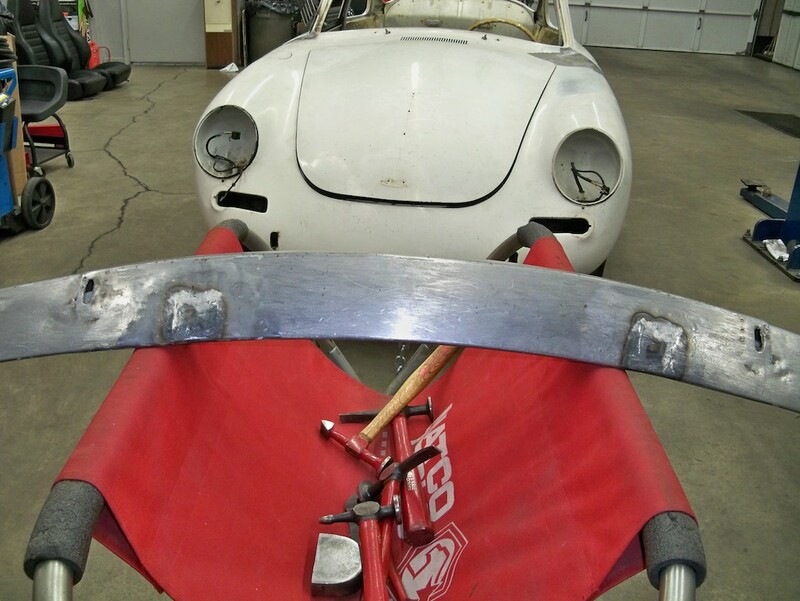 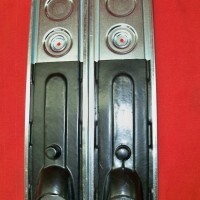 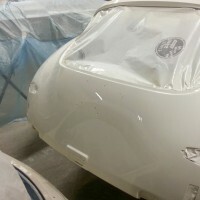 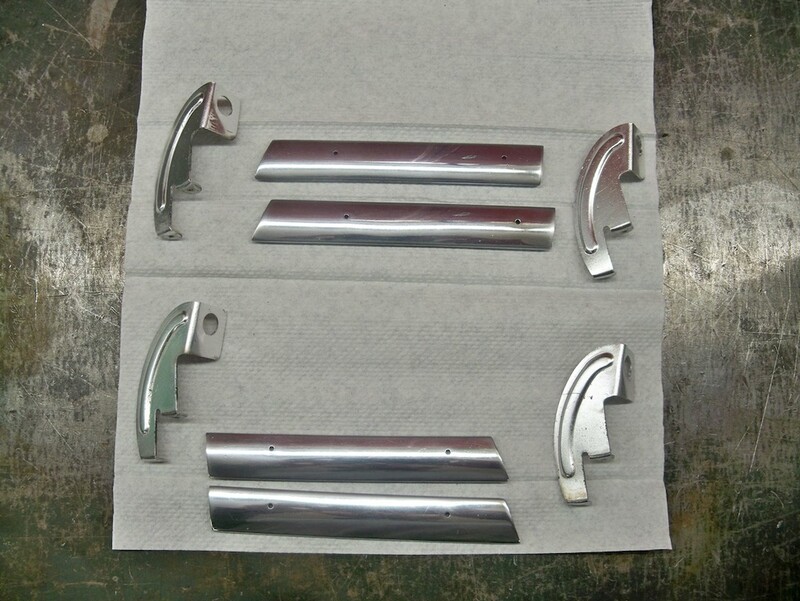 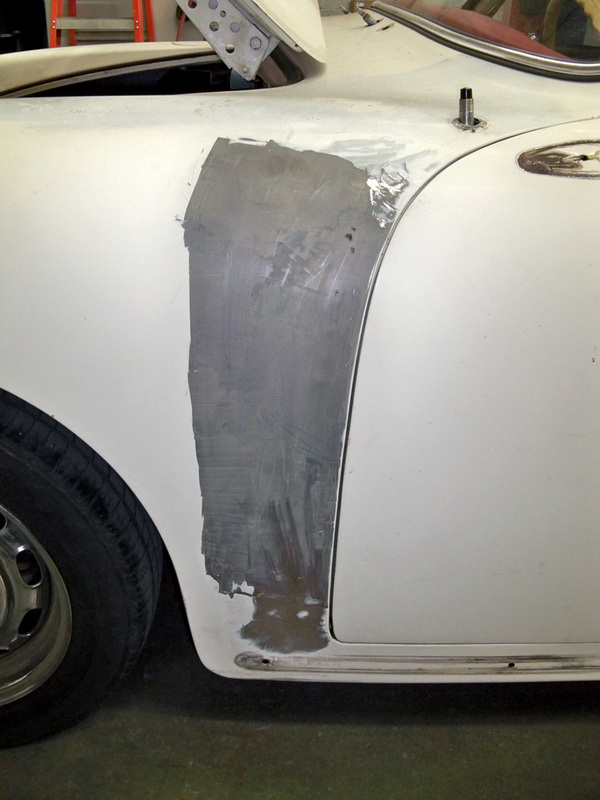 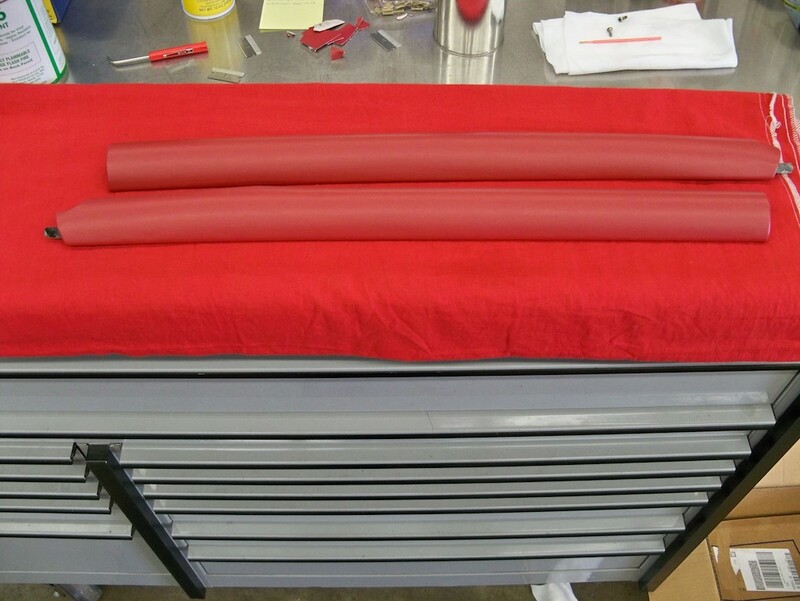 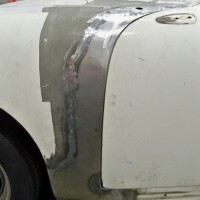 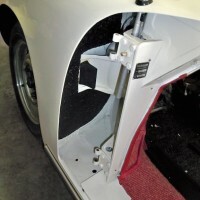 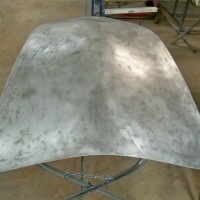 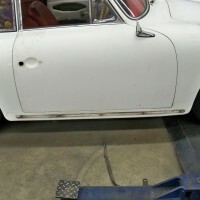 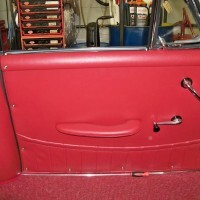 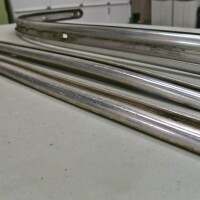 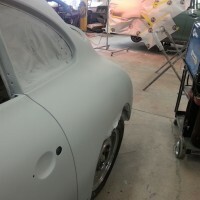 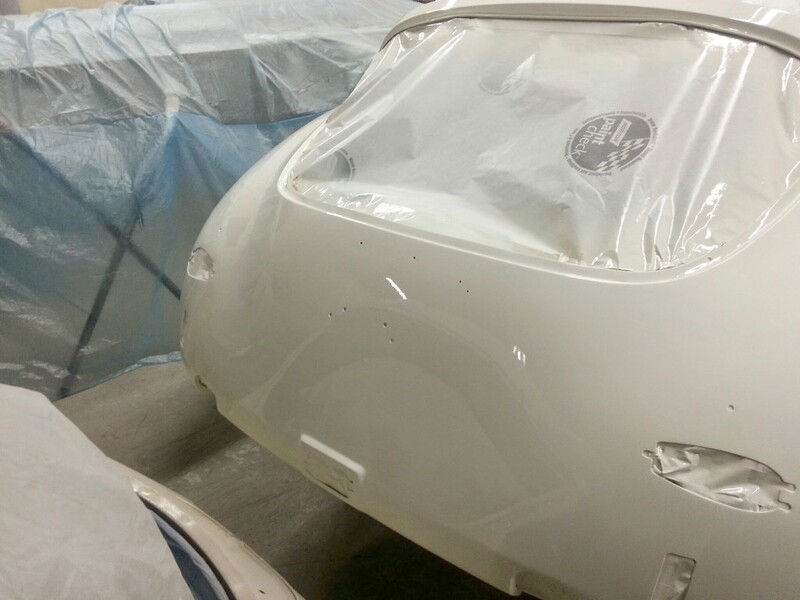 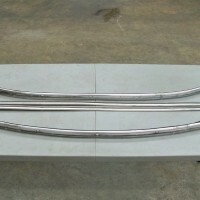 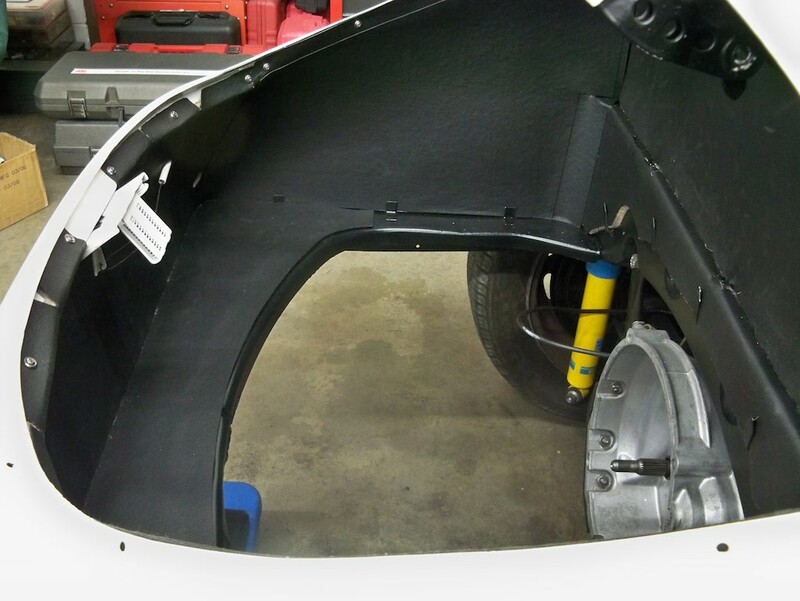 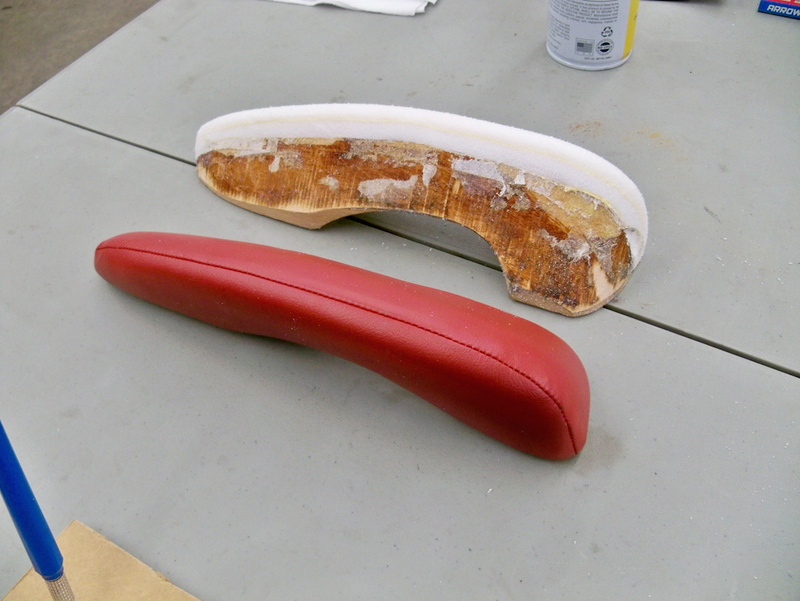 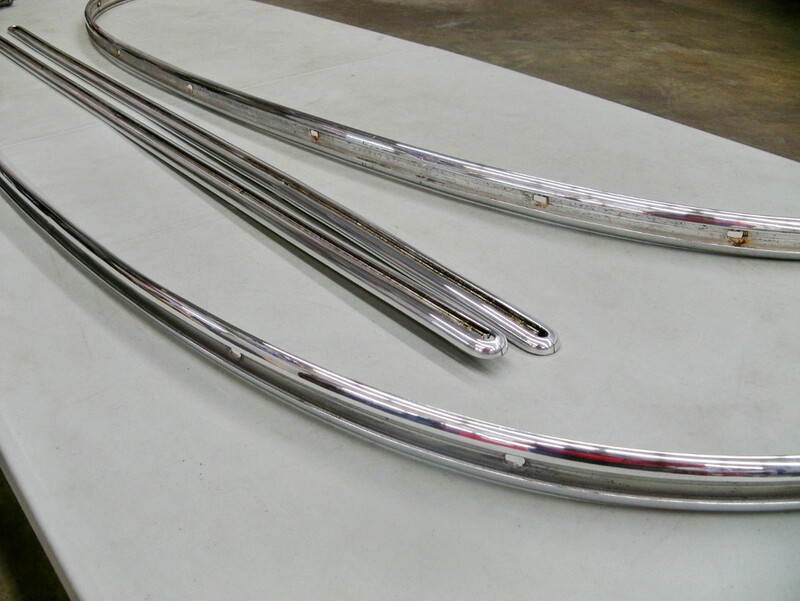 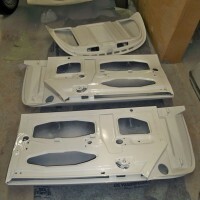 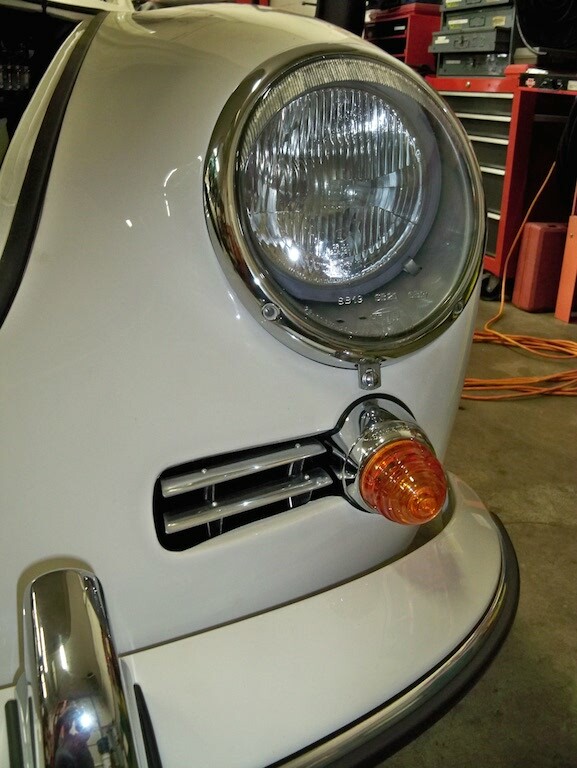 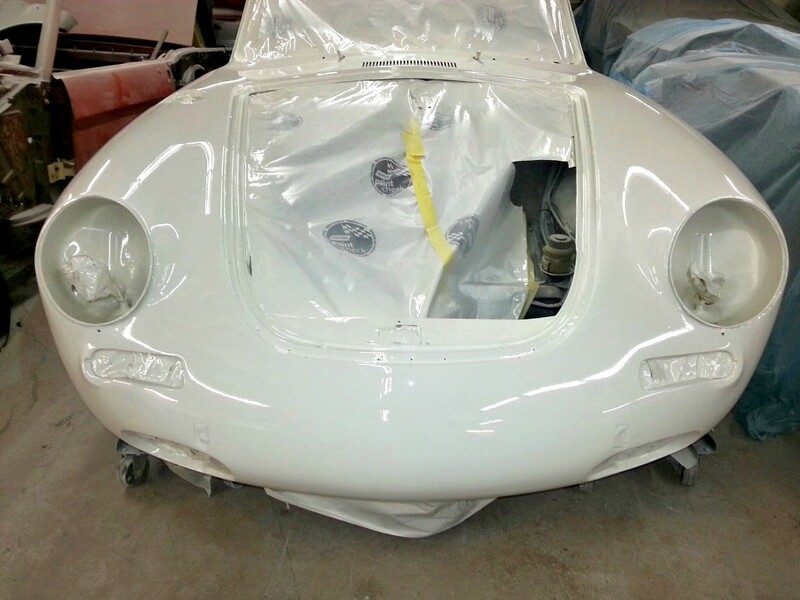 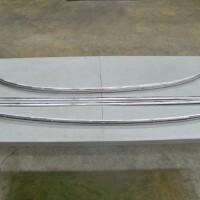 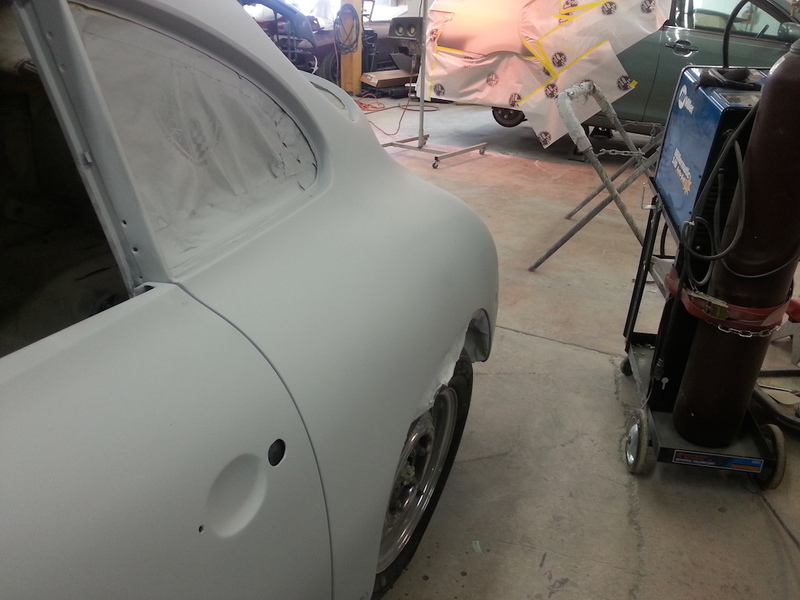 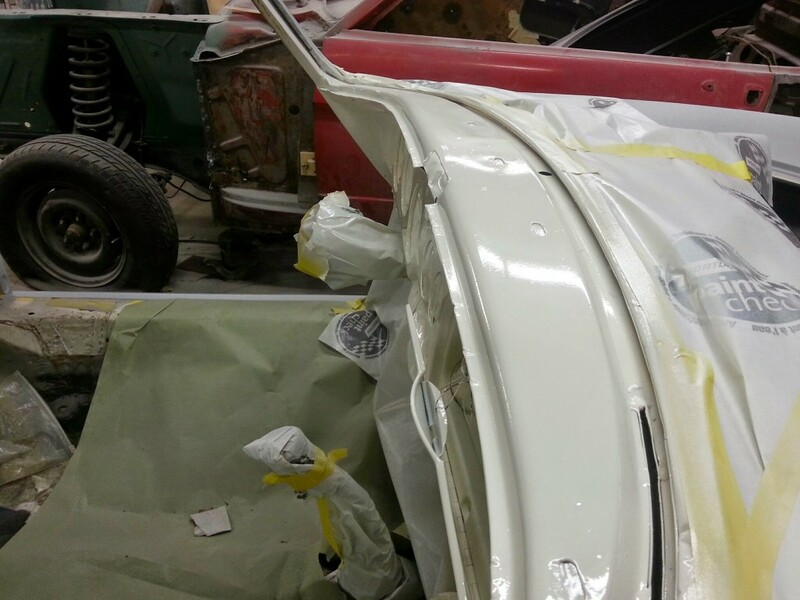 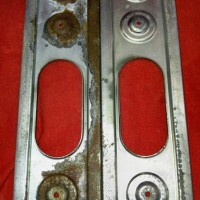 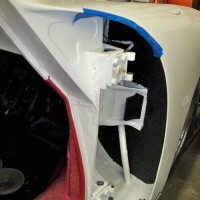 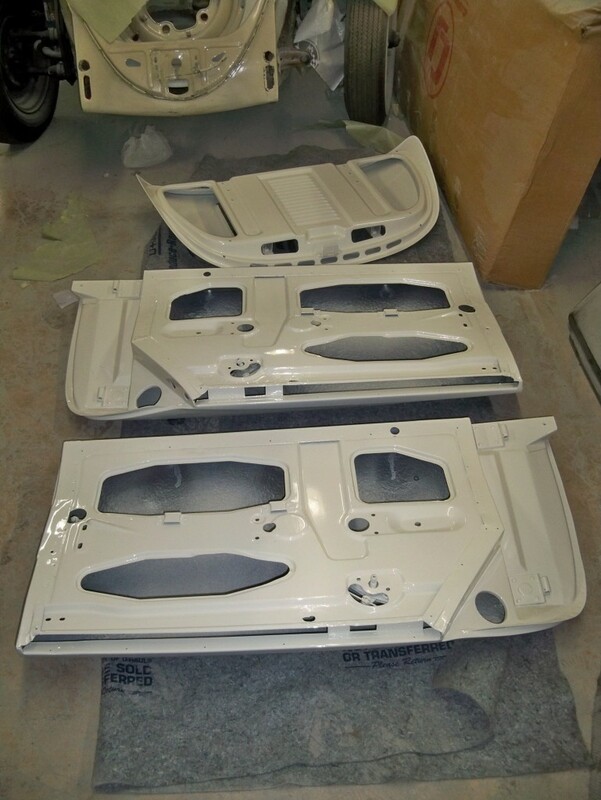 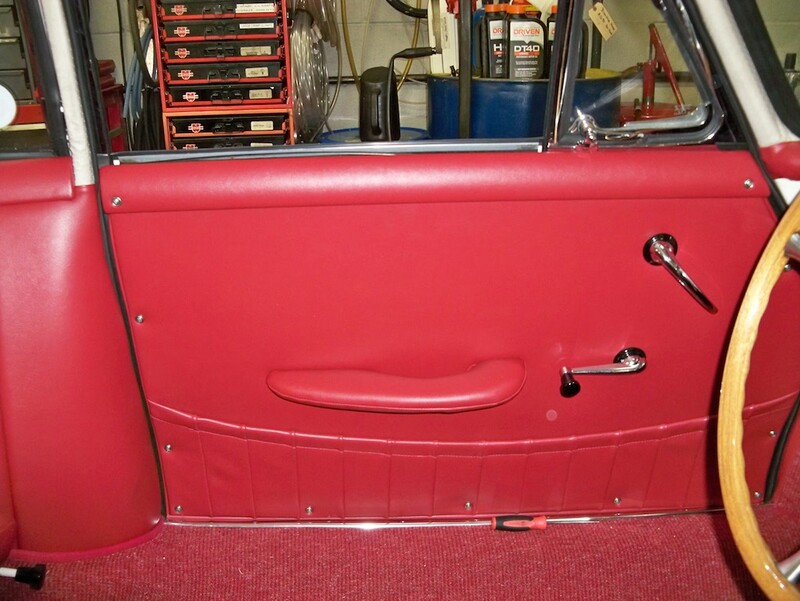 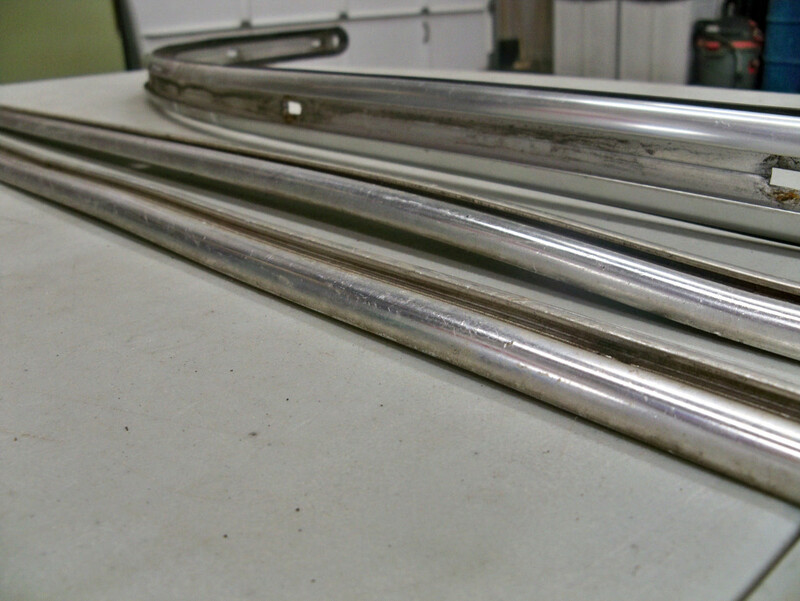 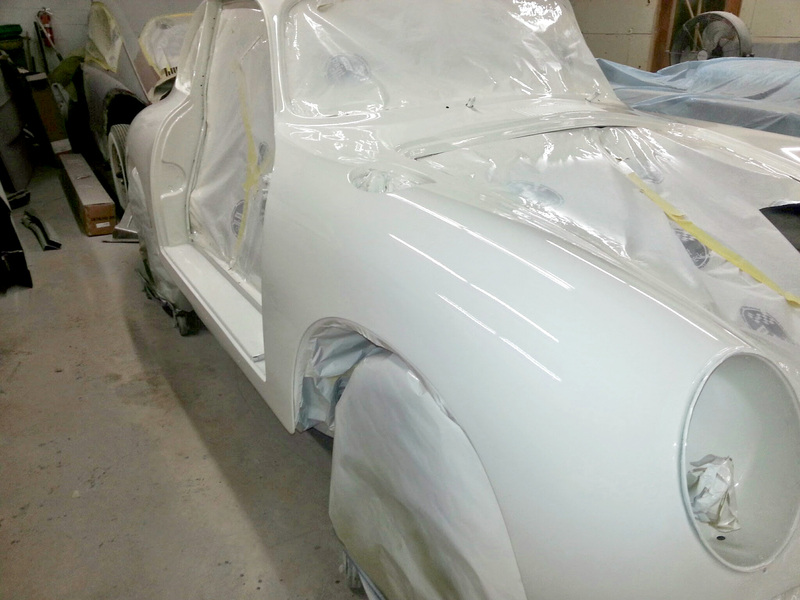 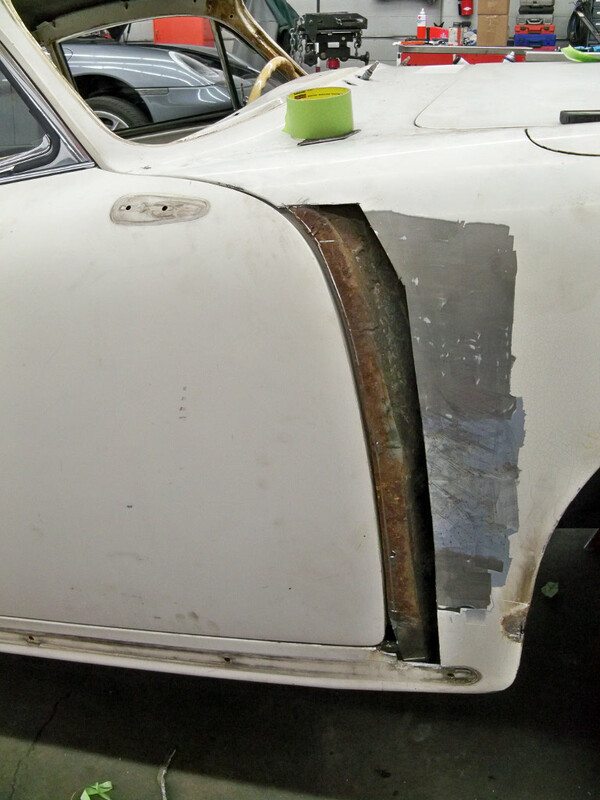 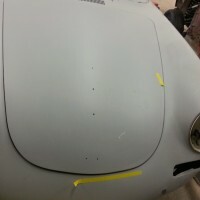 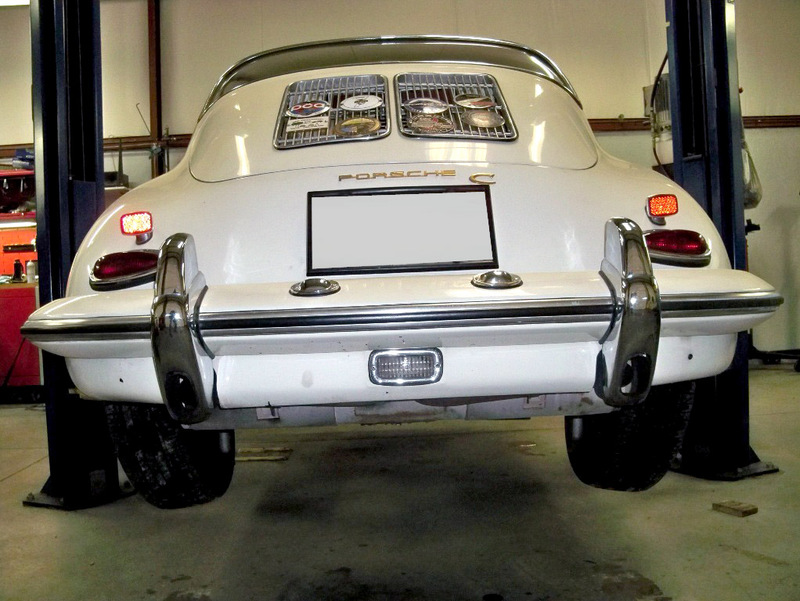 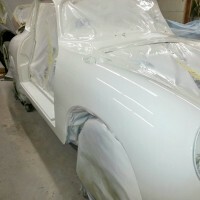 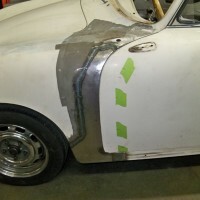 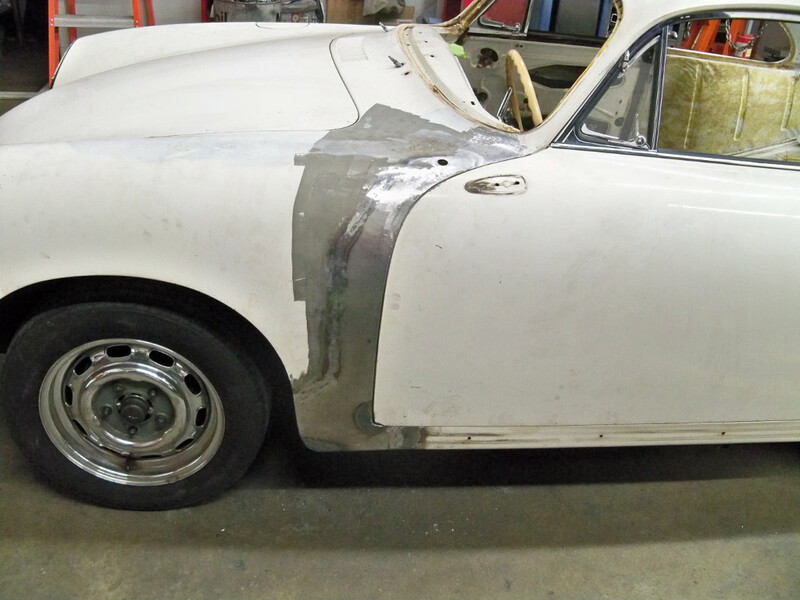 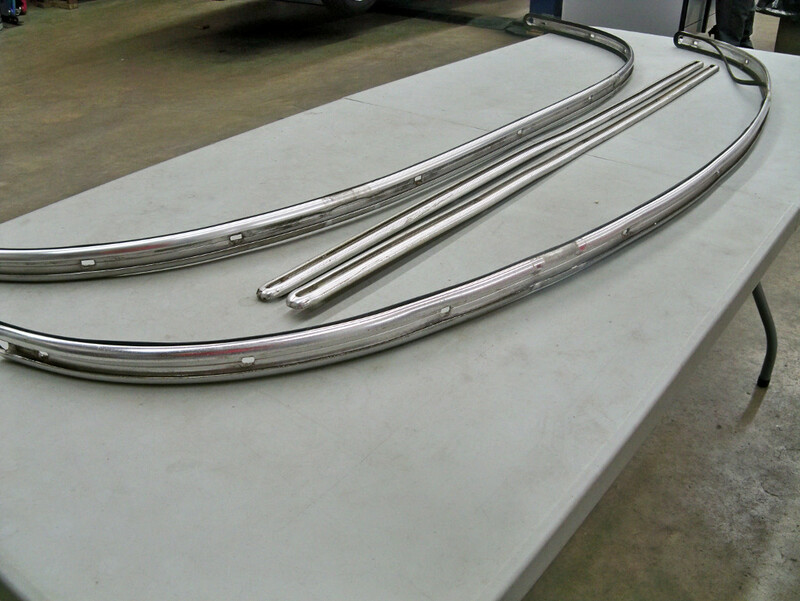 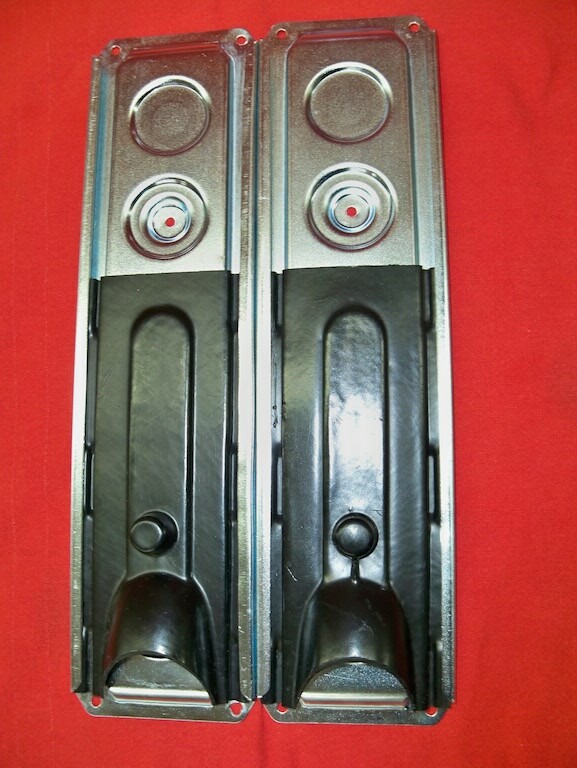 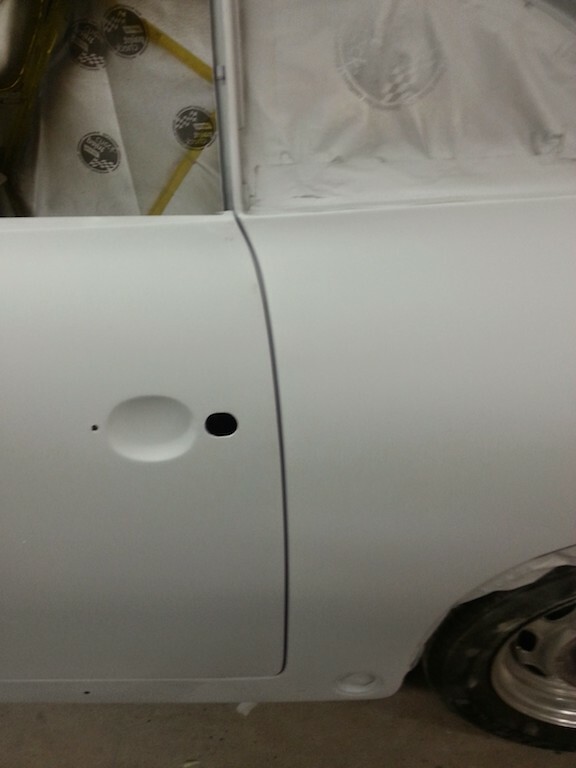 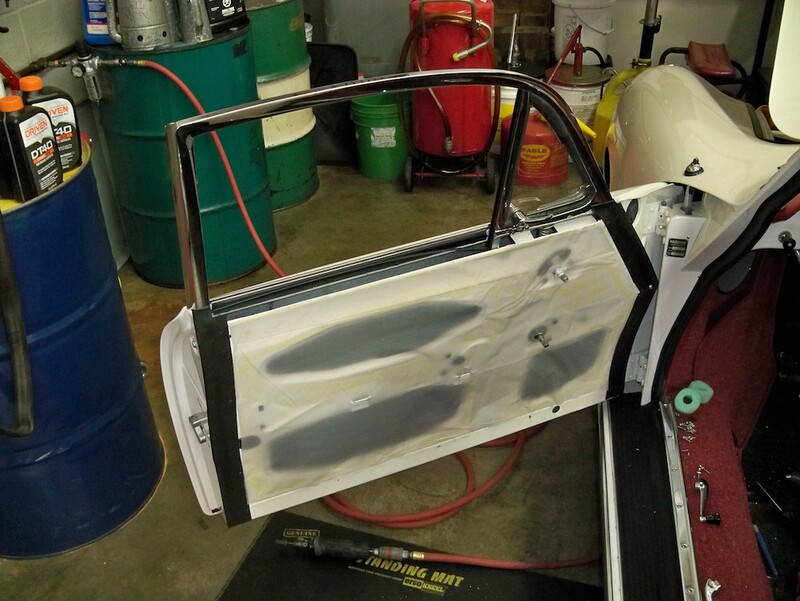 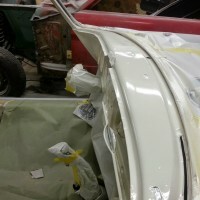 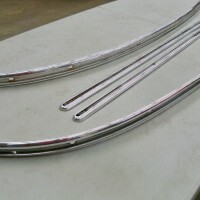 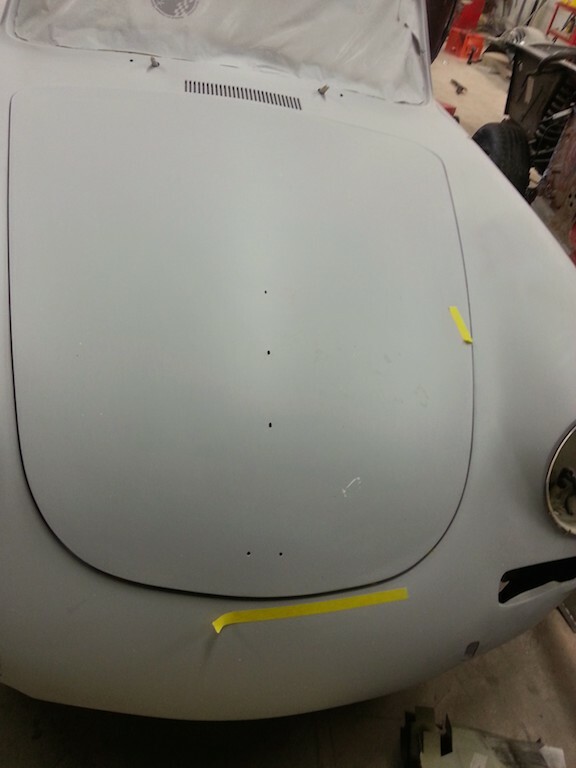 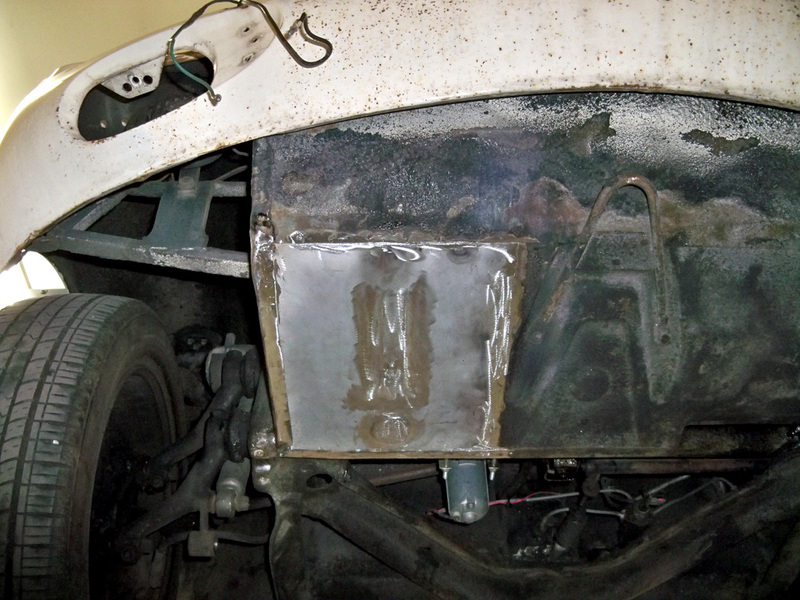 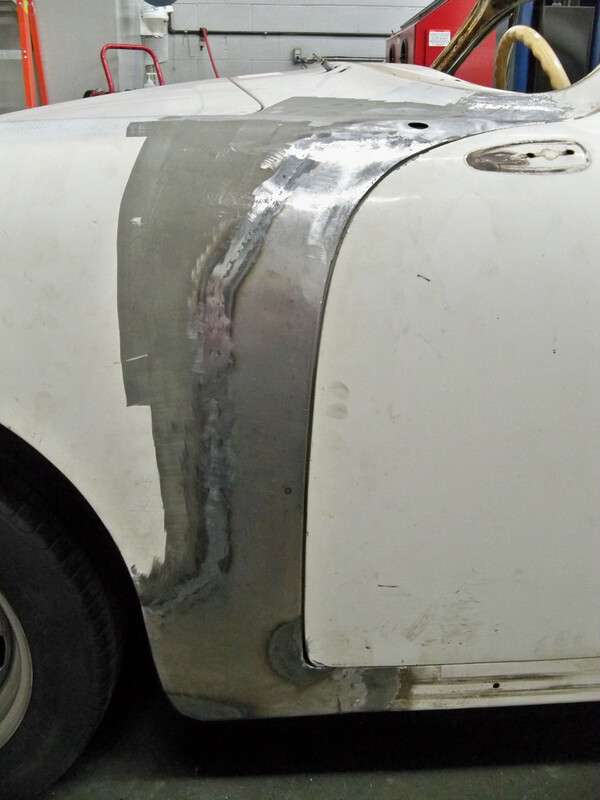 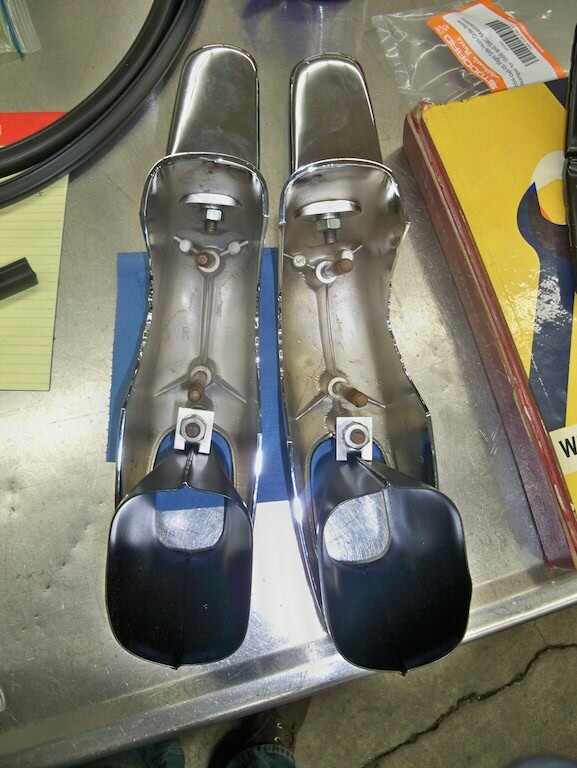 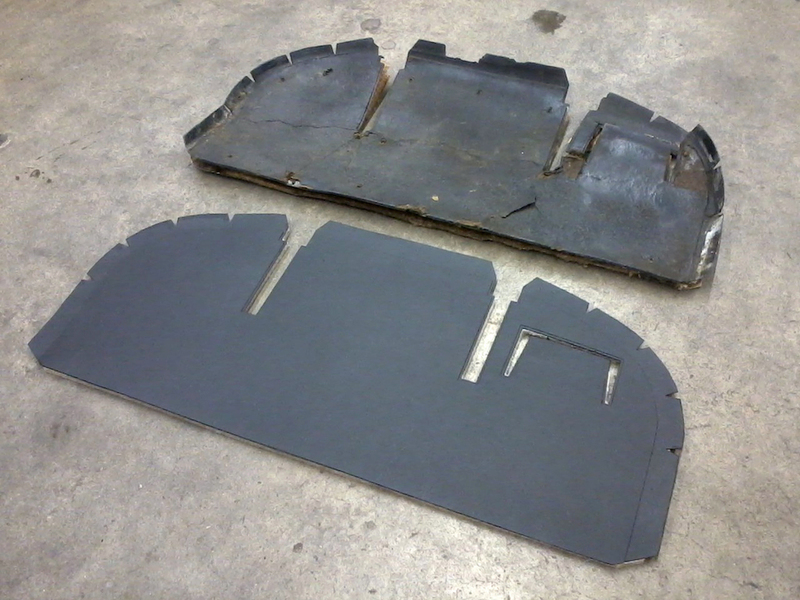 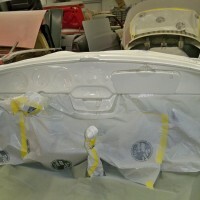 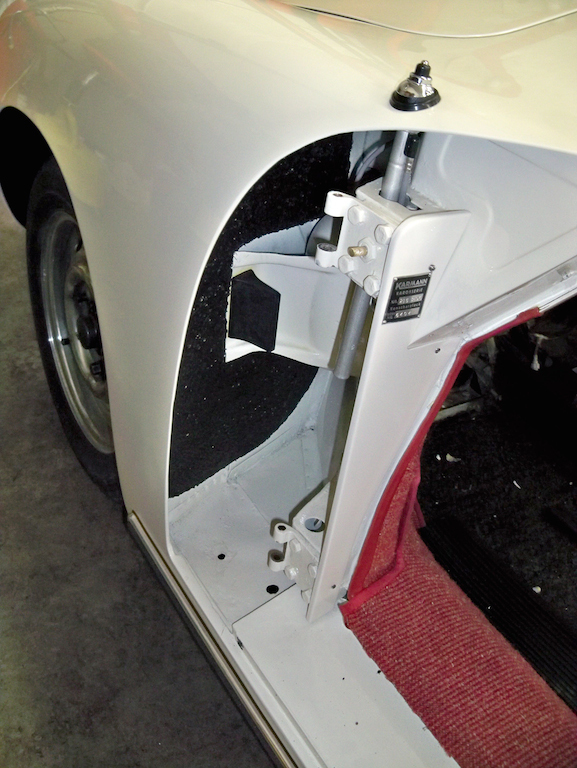 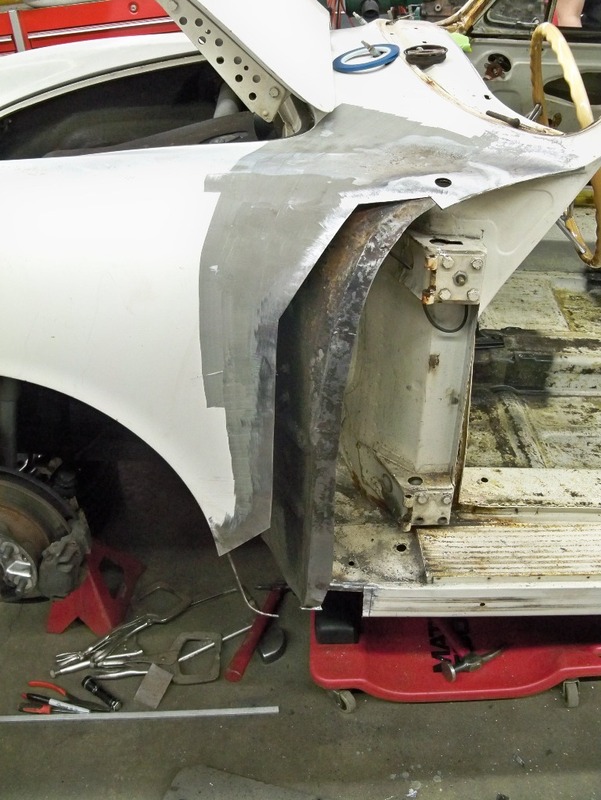 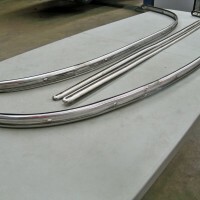 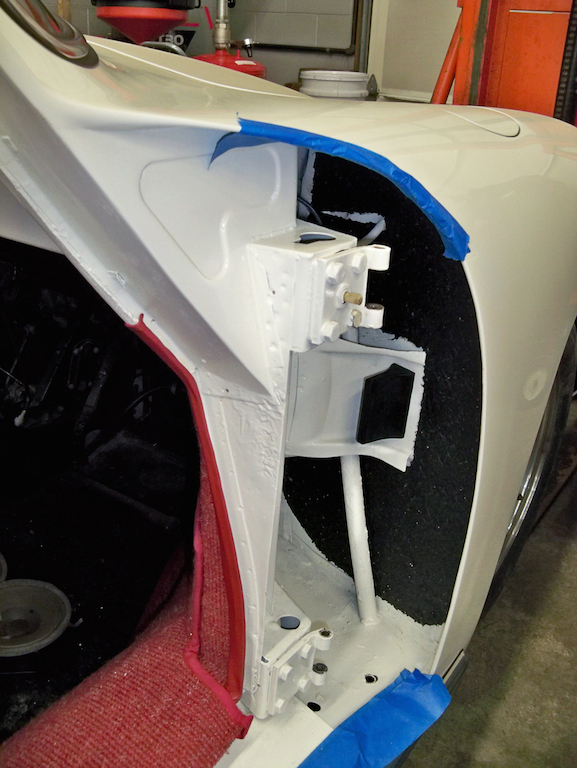 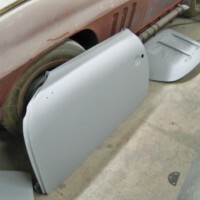 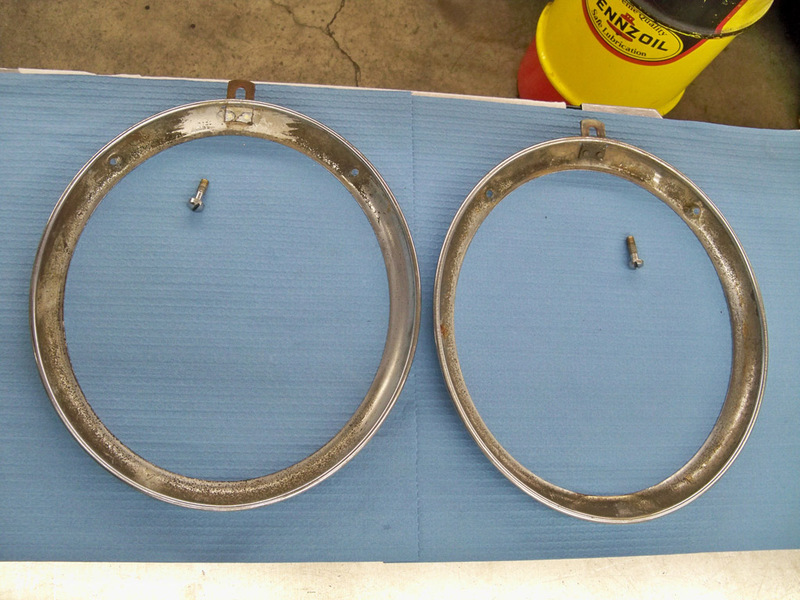 The original front & rear bumper and side deco trim was straighted, repaired and restored. 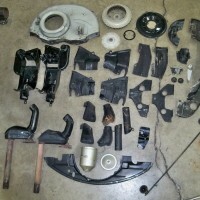 This is a “before” photo. 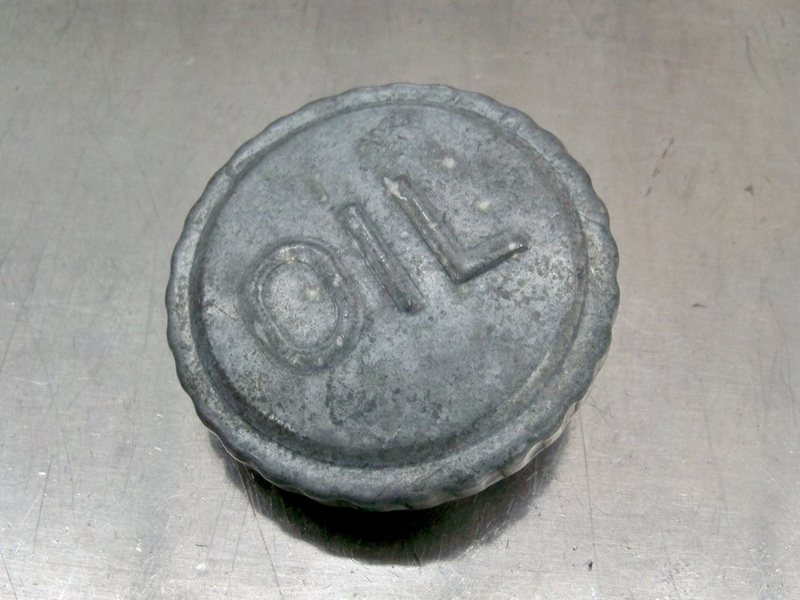 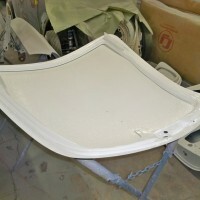 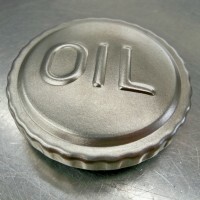 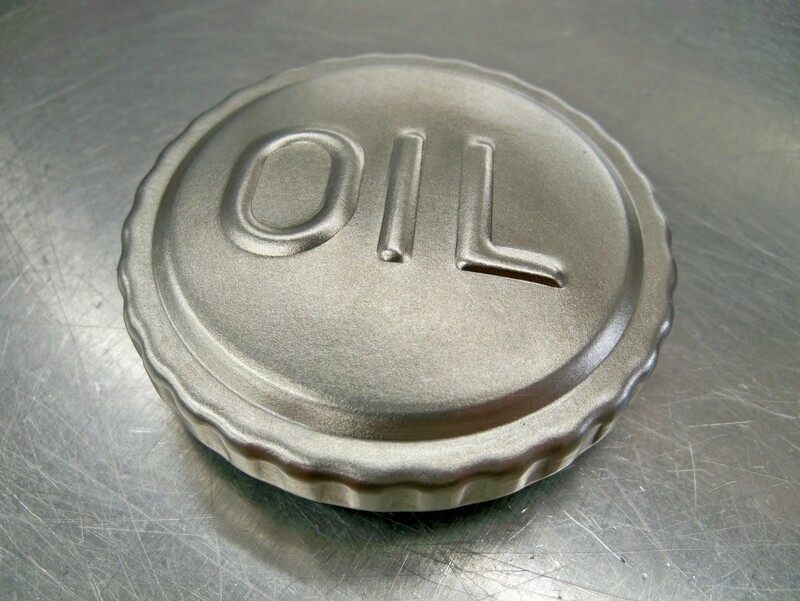 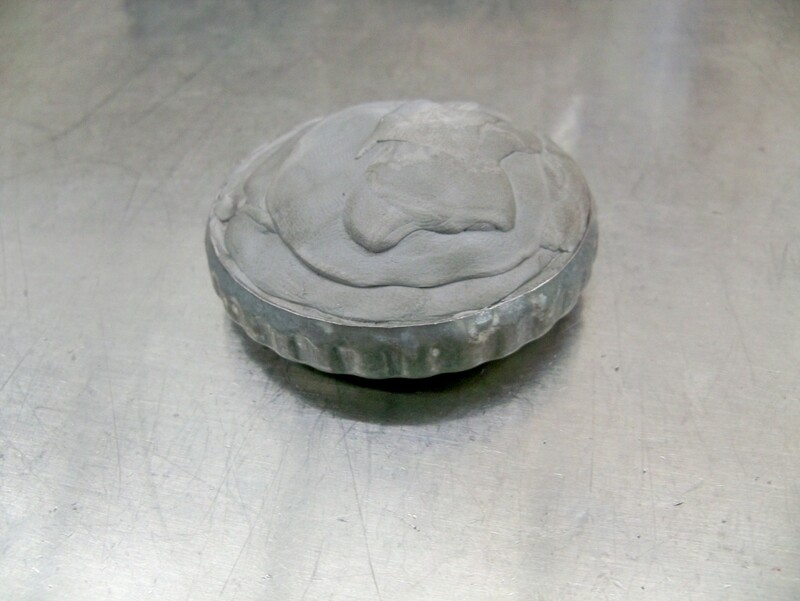 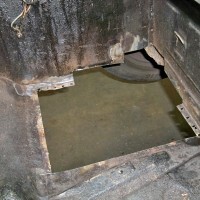 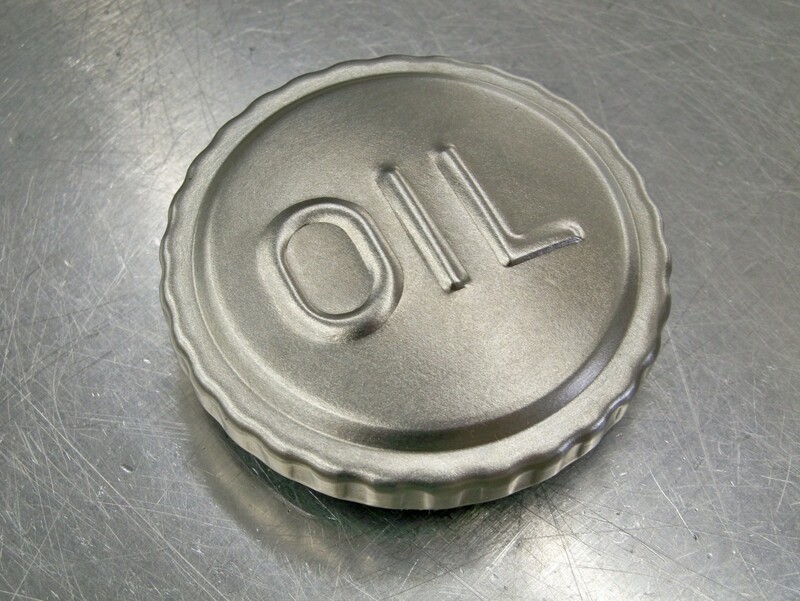 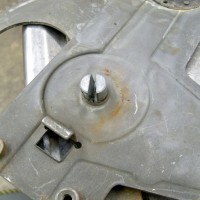 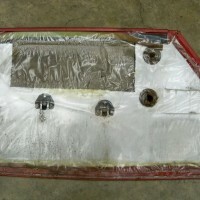 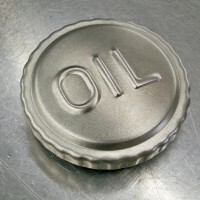 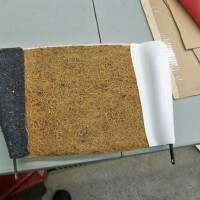 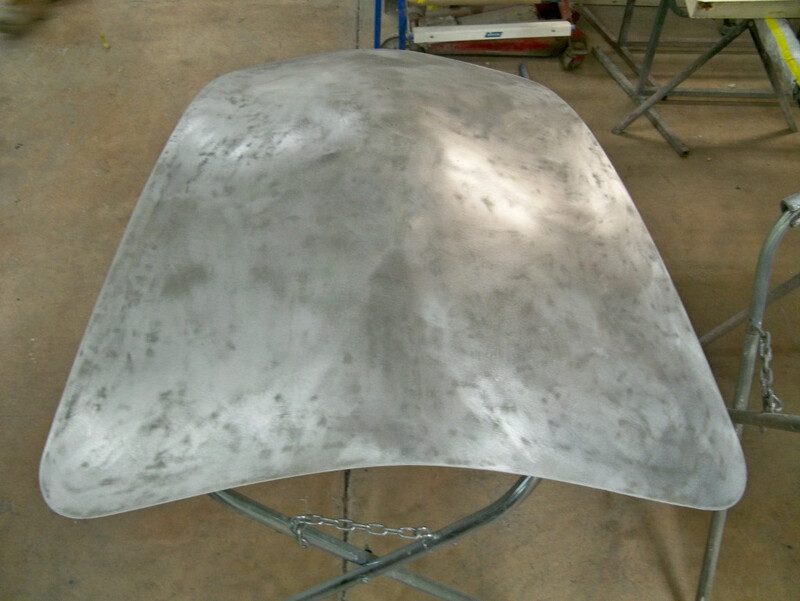 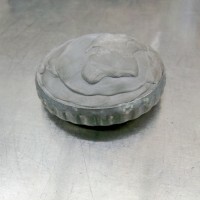 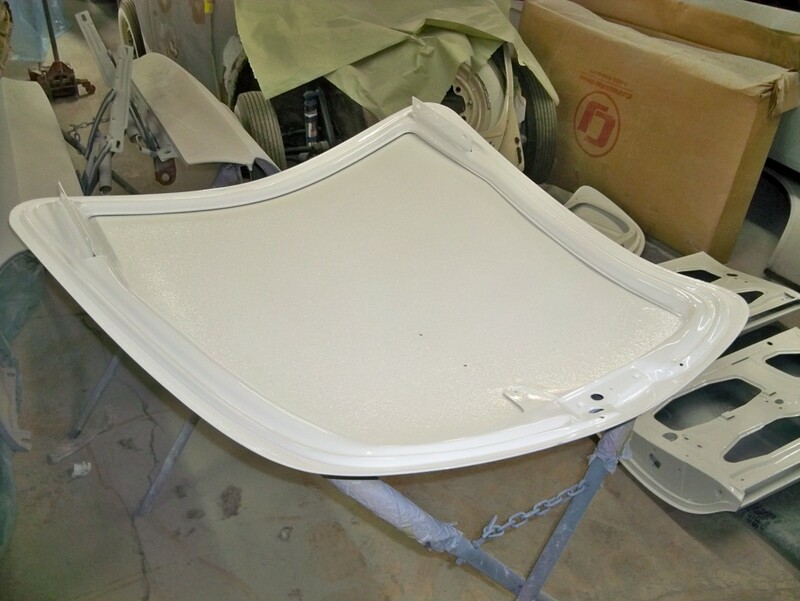 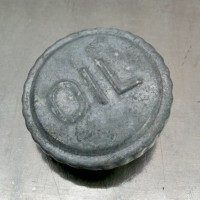 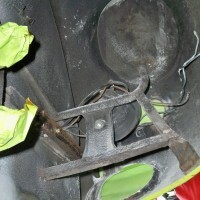 Underside of cap sealed and protected from any contaminants that could get into the cap during the refinishing process. 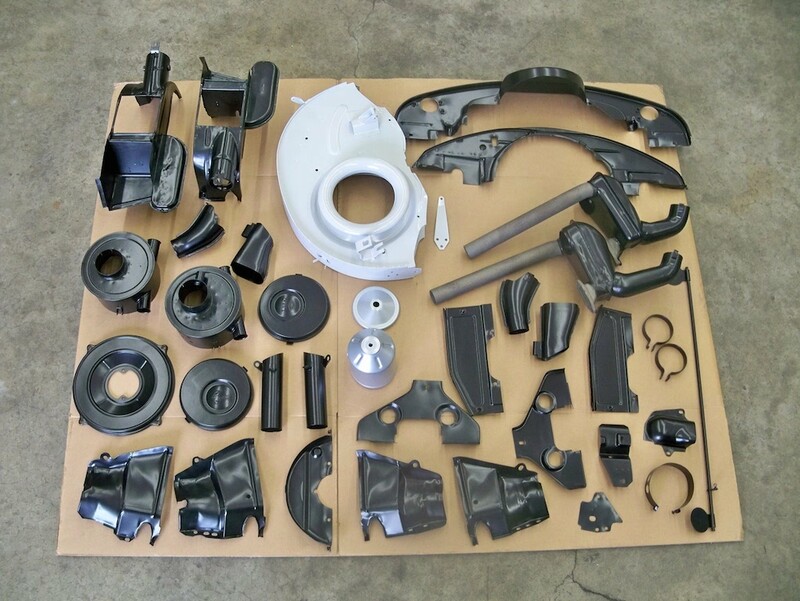 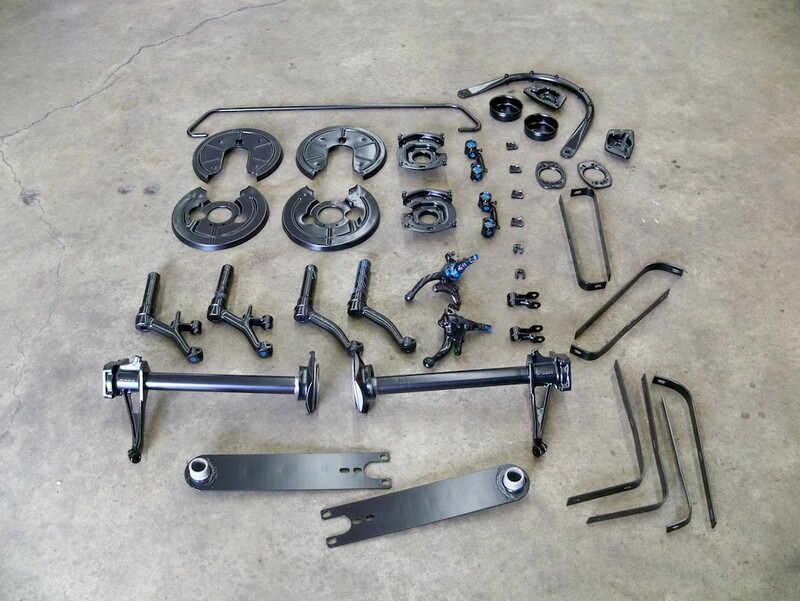 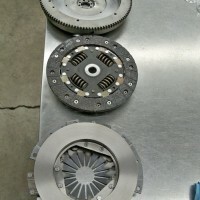 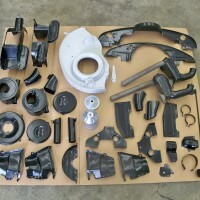 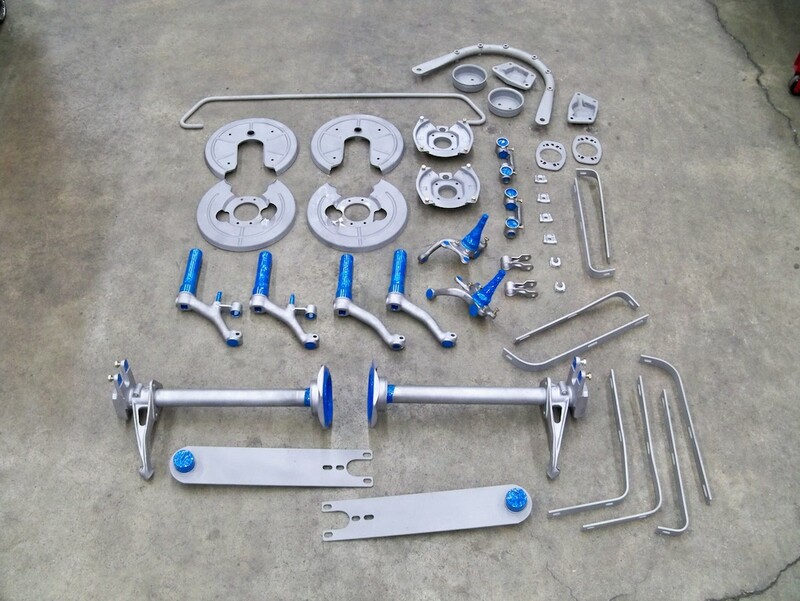 Parts have been prepped for powder coating. 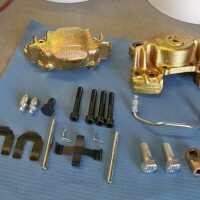 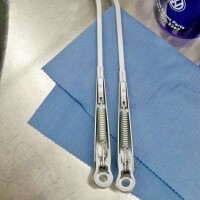 Parts have been powder coated. 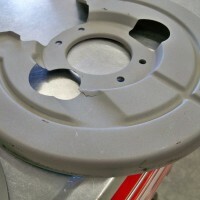 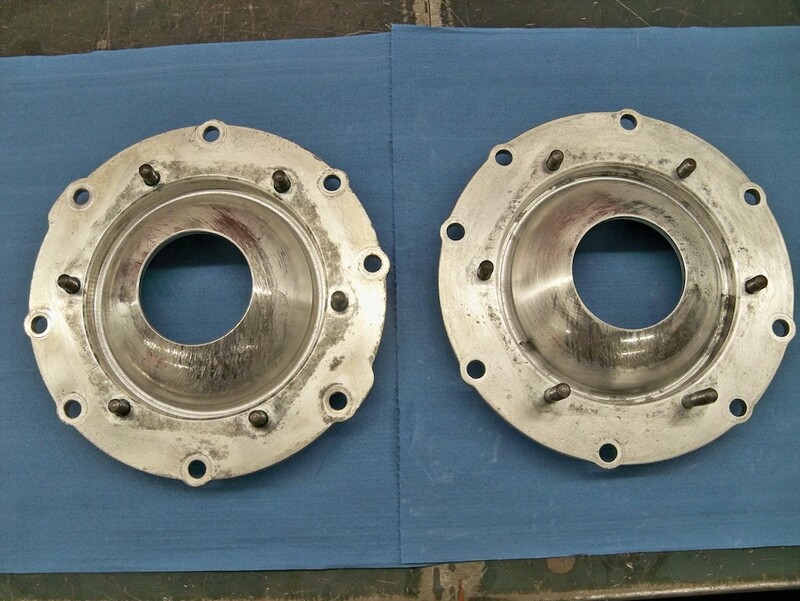 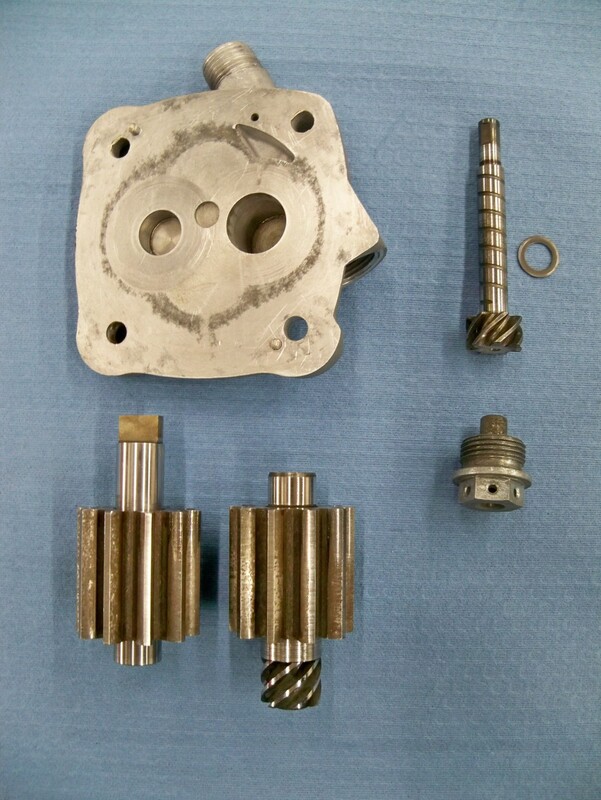 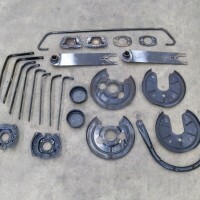 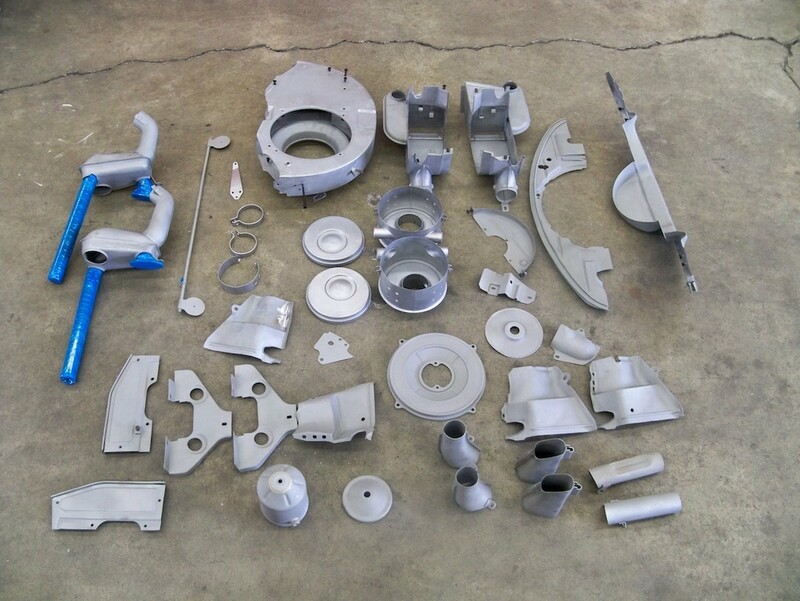 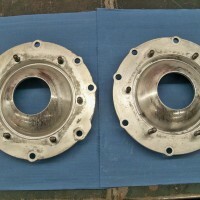 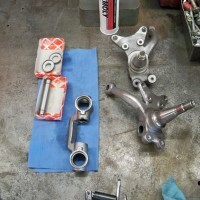 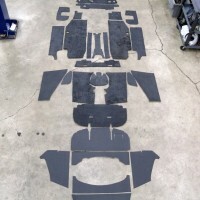 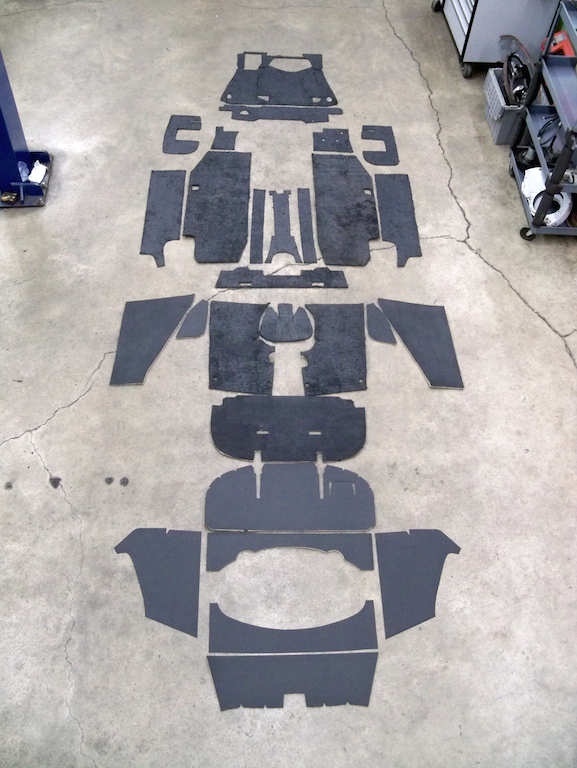 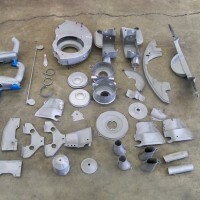 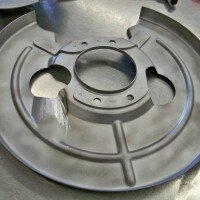 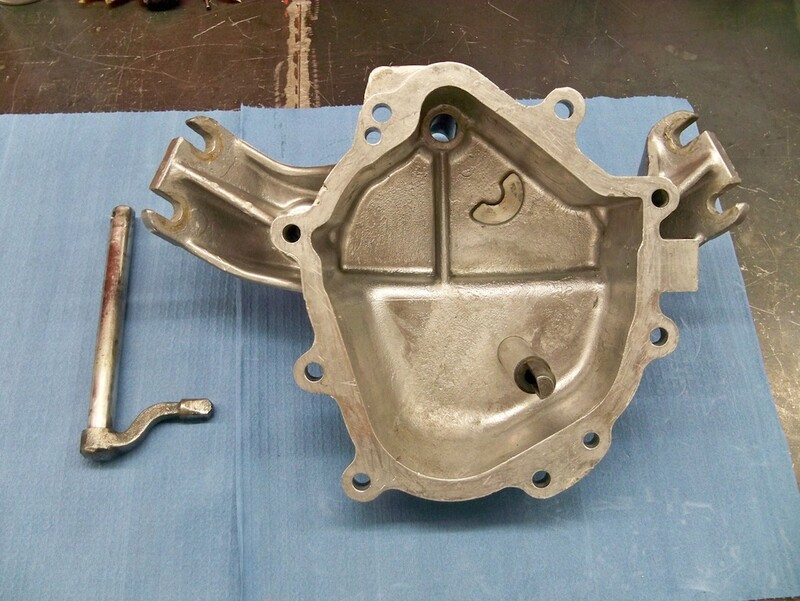 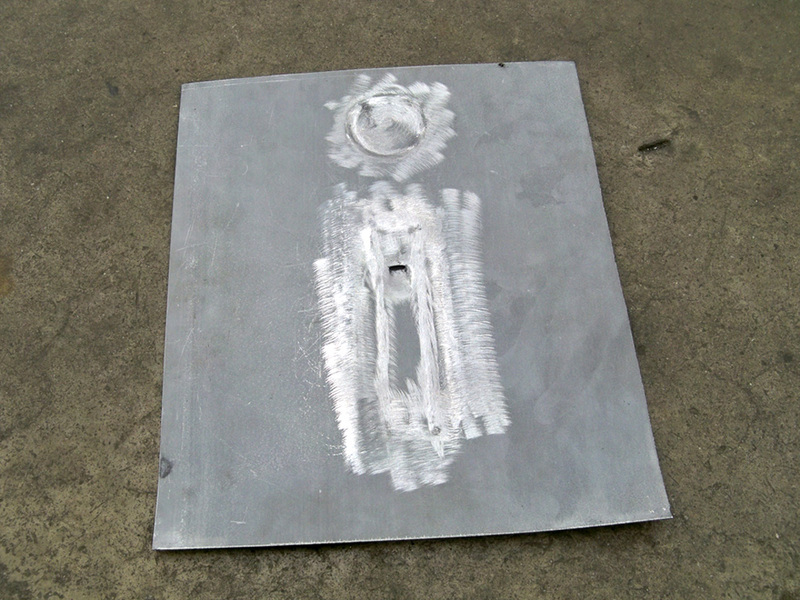 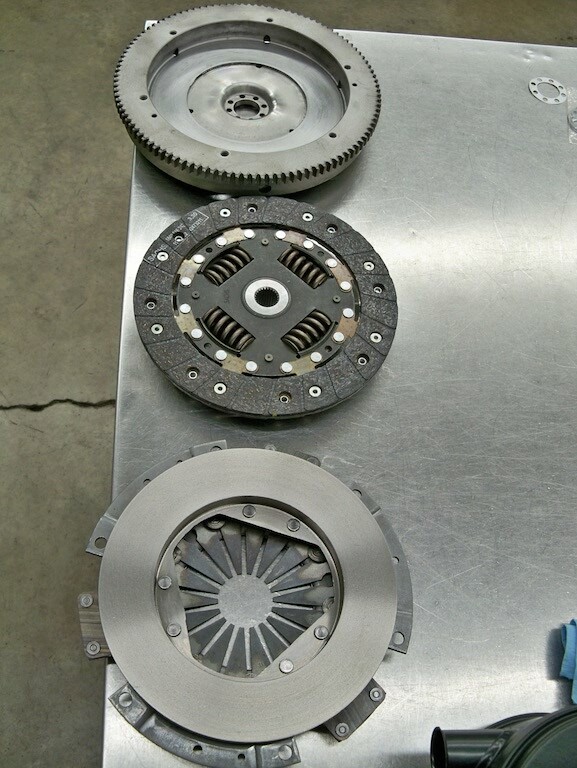 Parts ready for sand blasting. 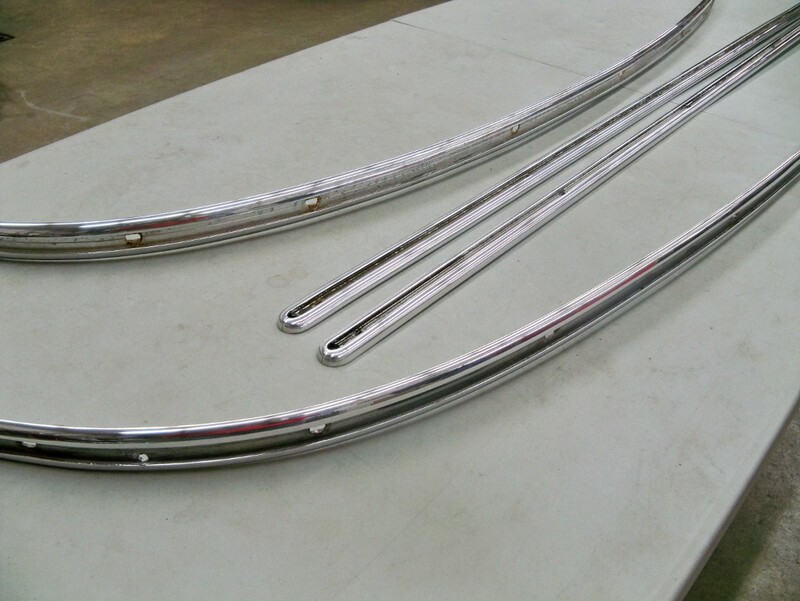 Part ready for powder coating. 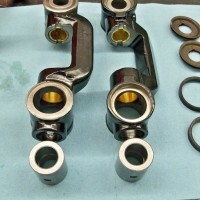 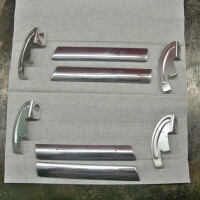 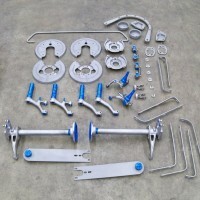 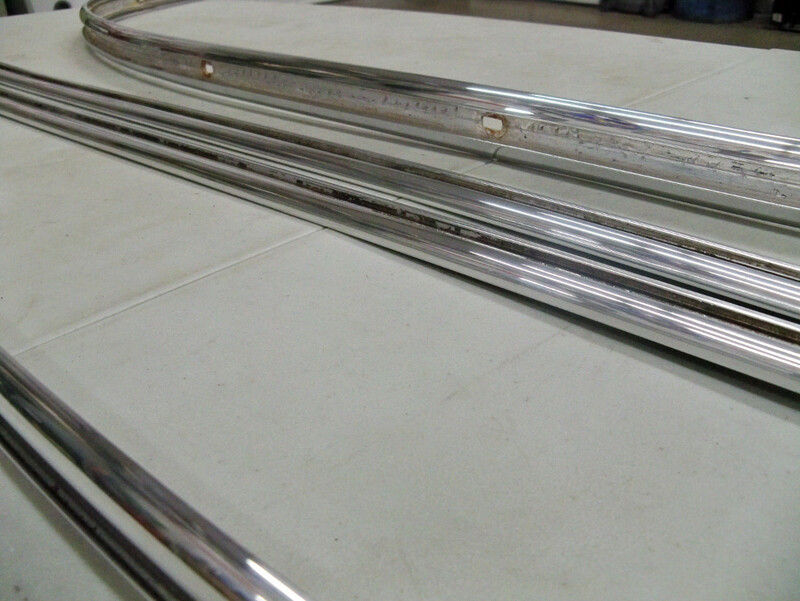 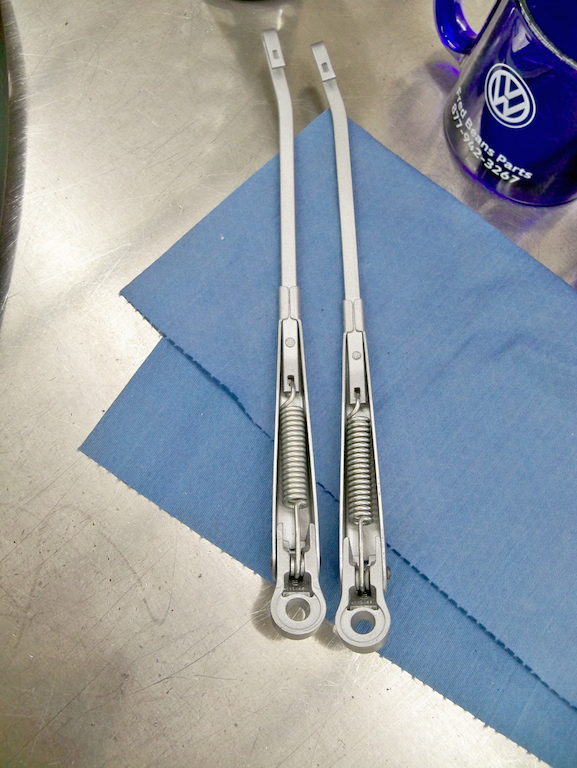 Parts back from powder coating. 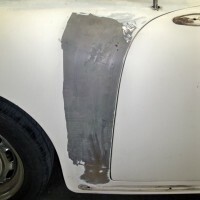 Off to the body shop. 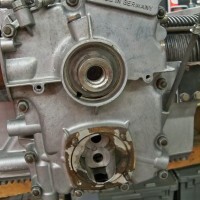 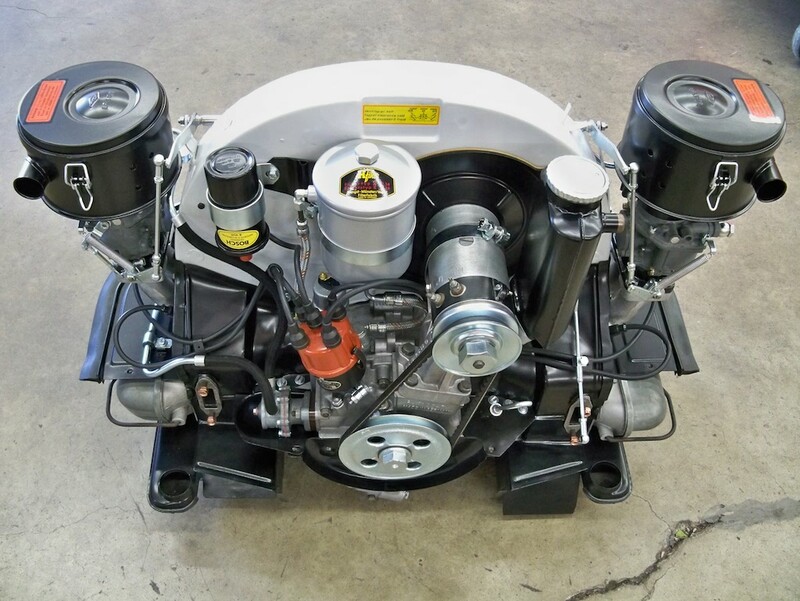 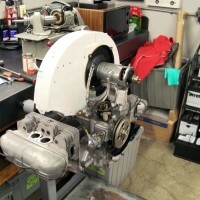 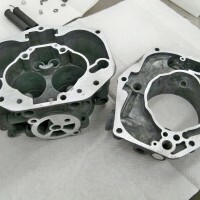 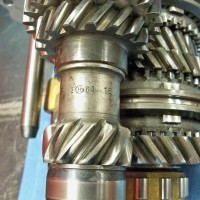 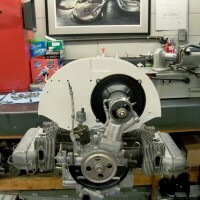 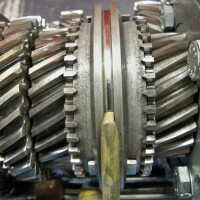 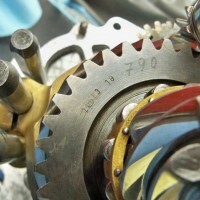 The engine is undergoing a full reseal and service. 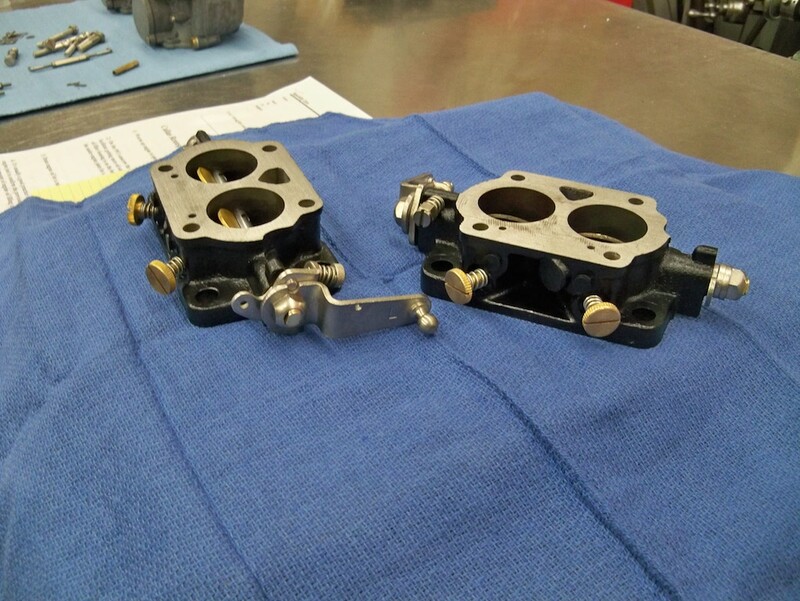 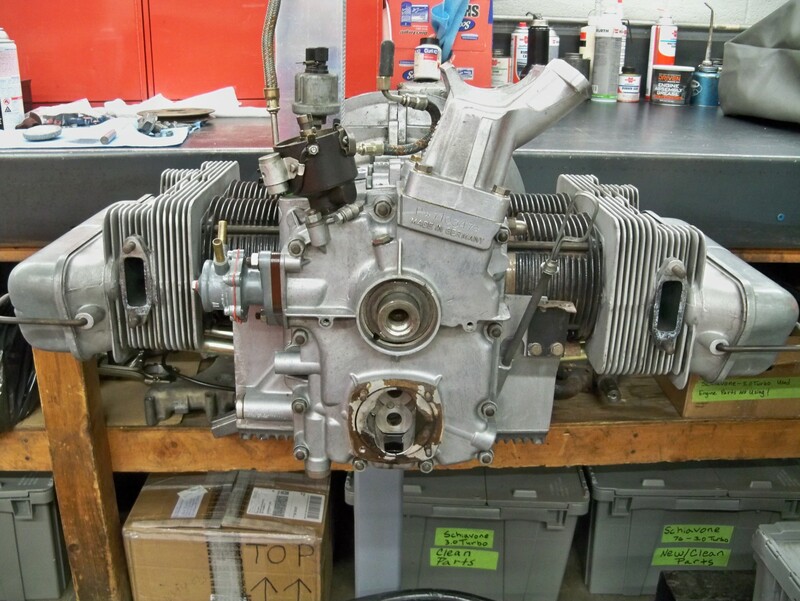 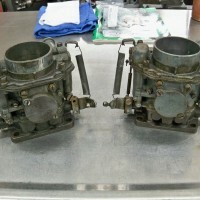 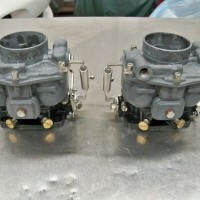 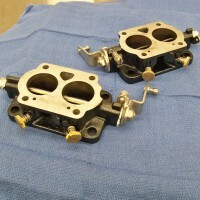 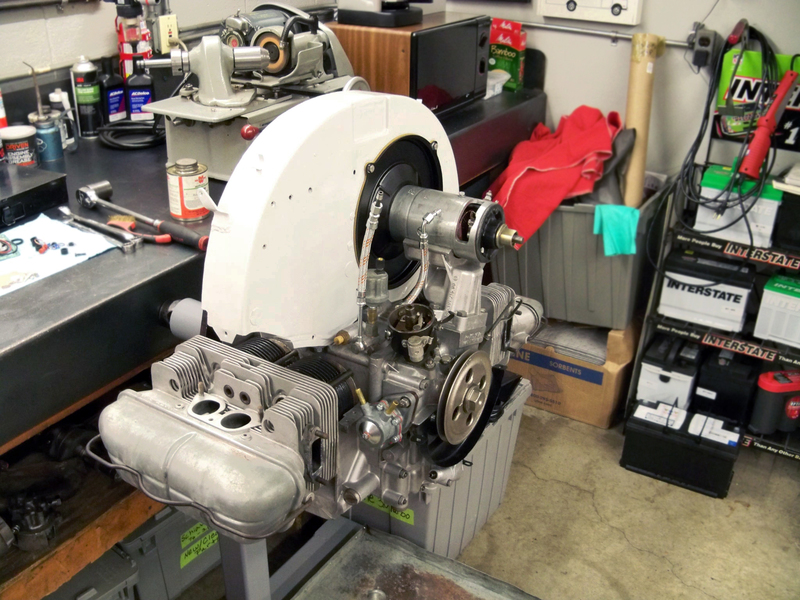 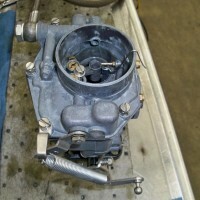 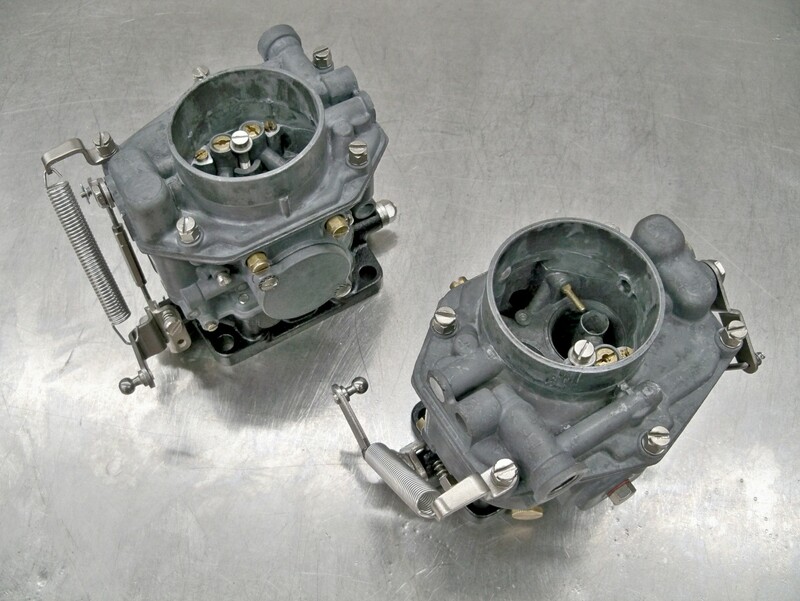 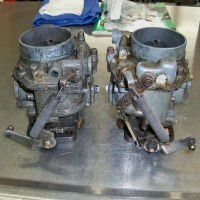 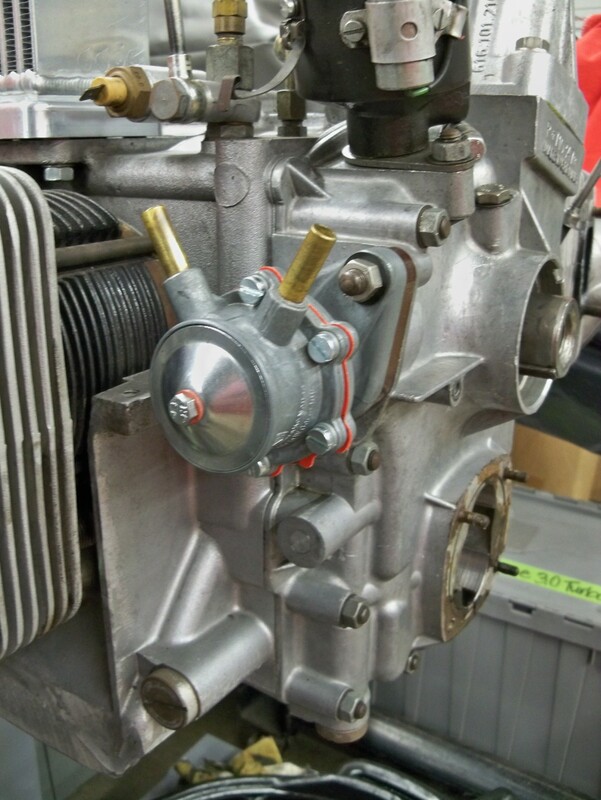 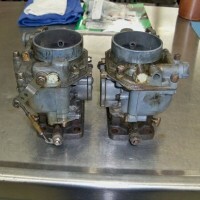 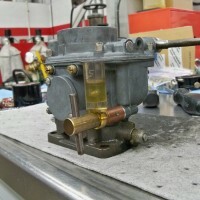 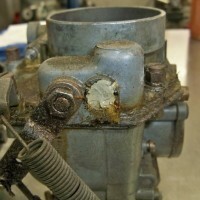 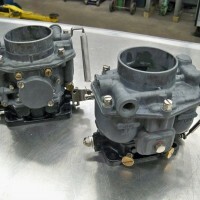 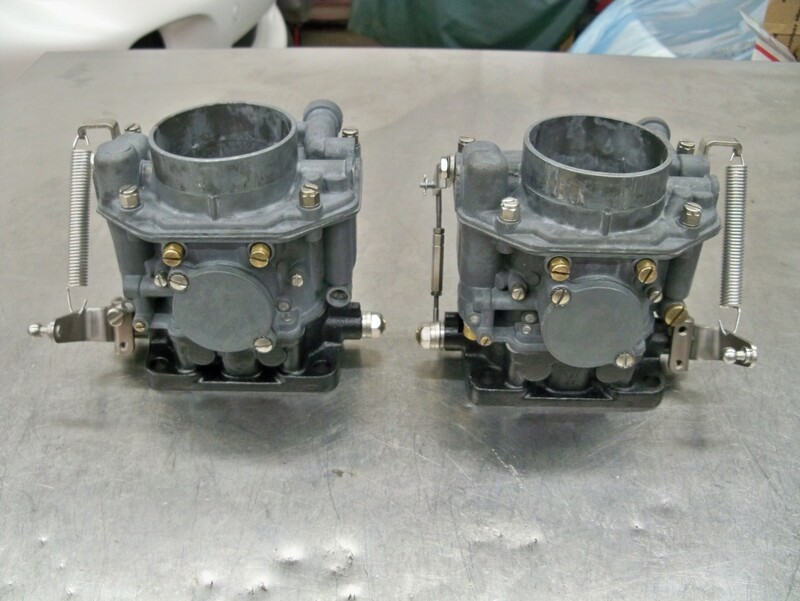 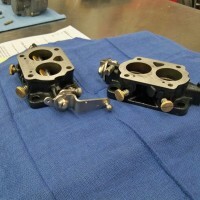 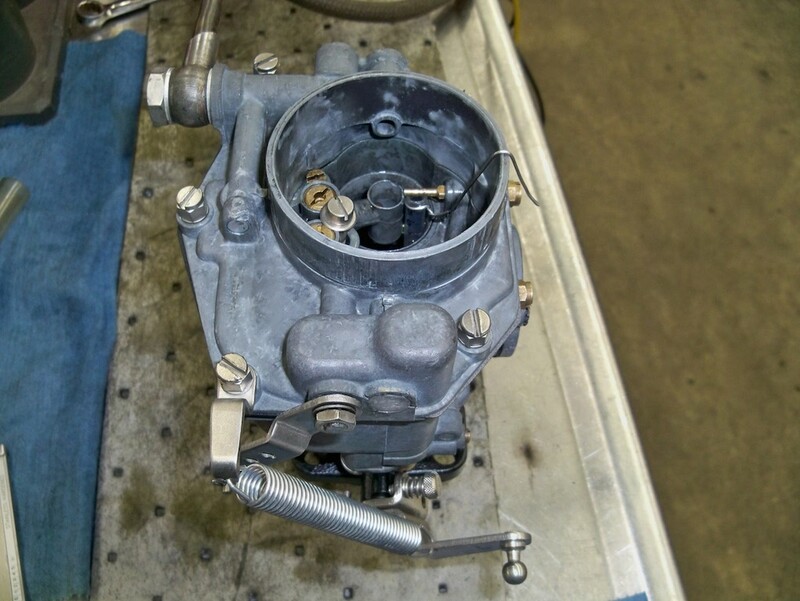 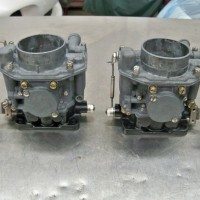 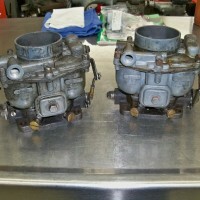 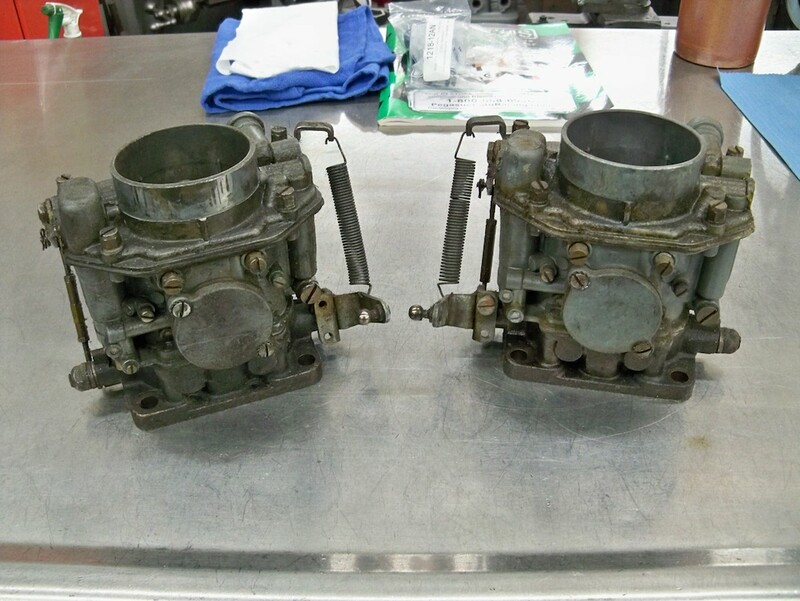 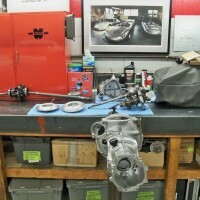 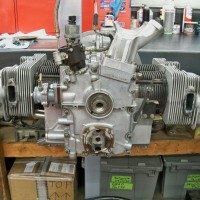 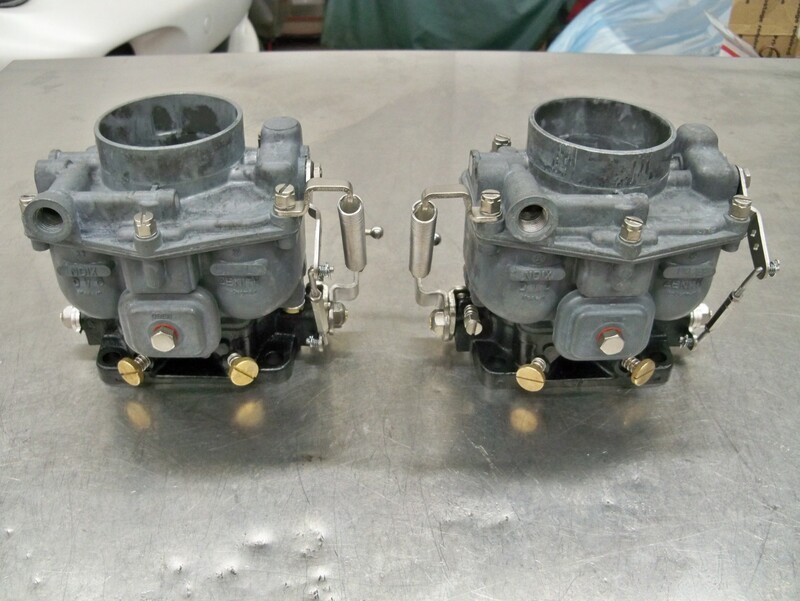 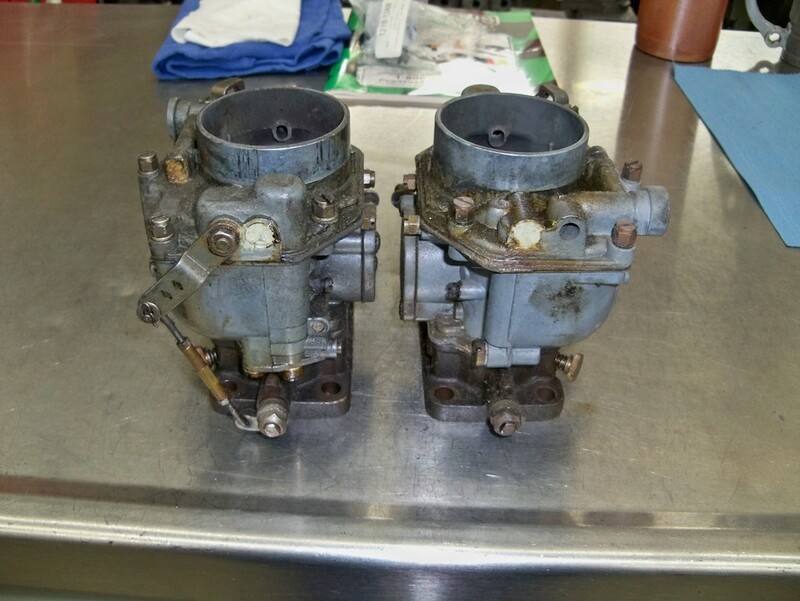 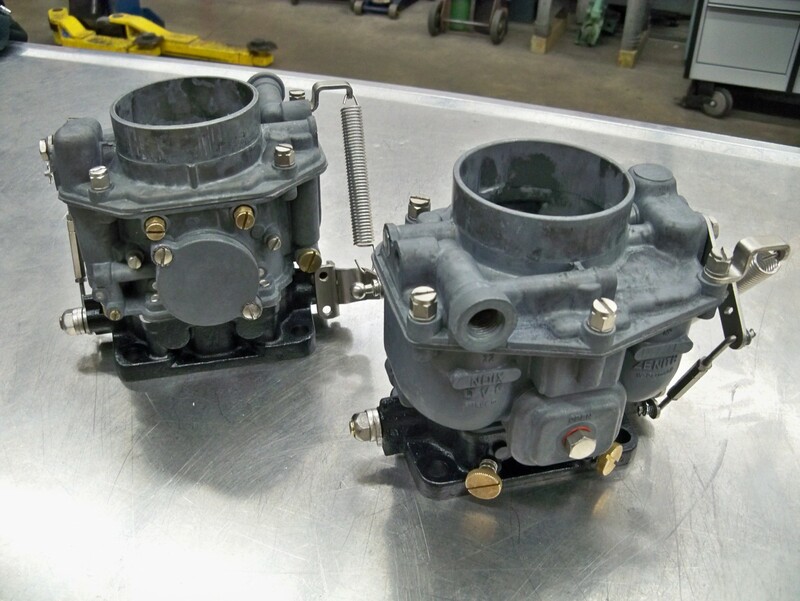 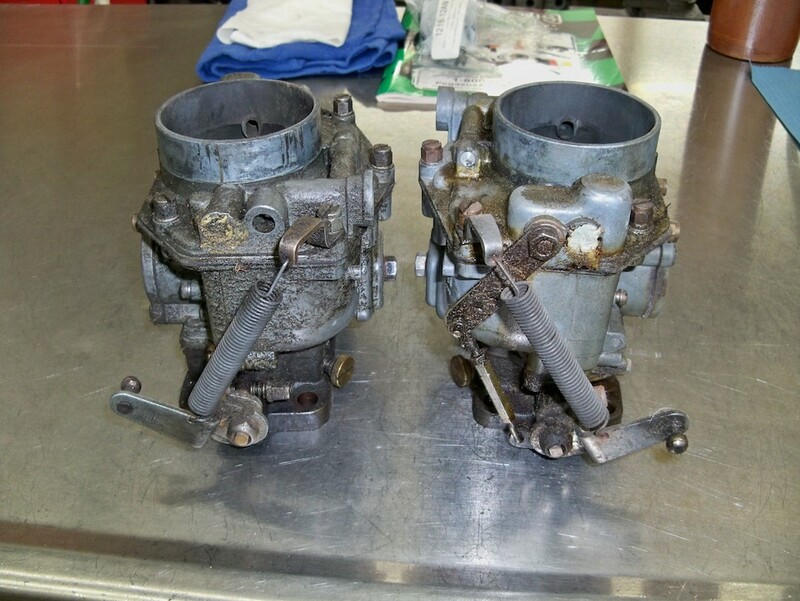 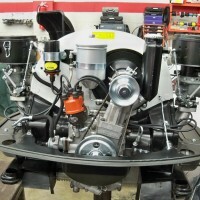 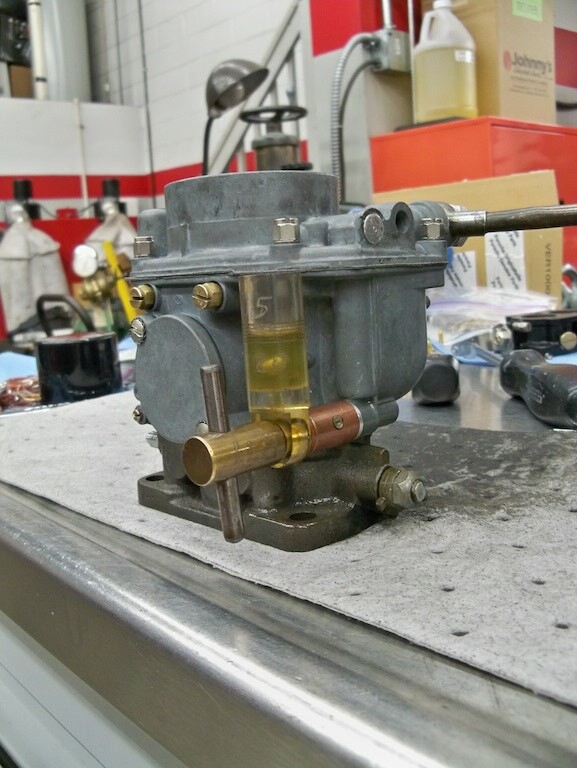 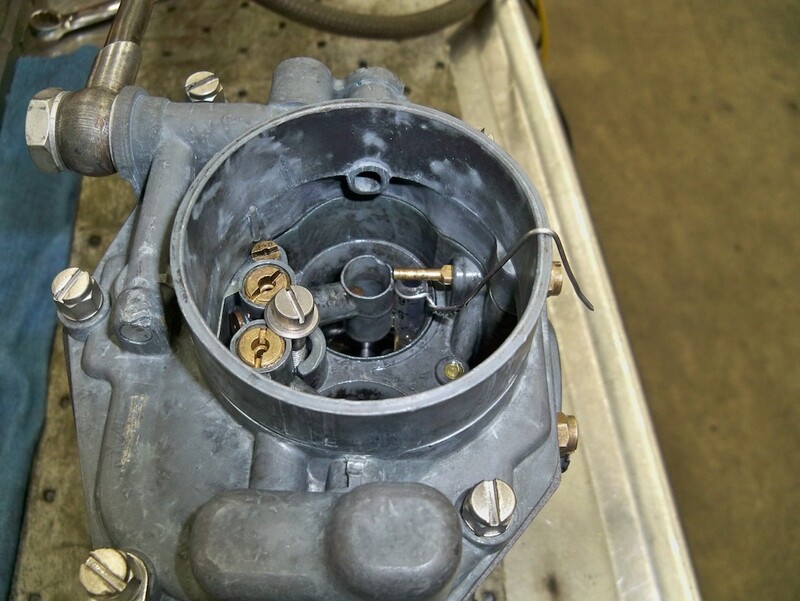 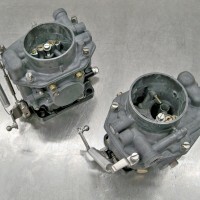 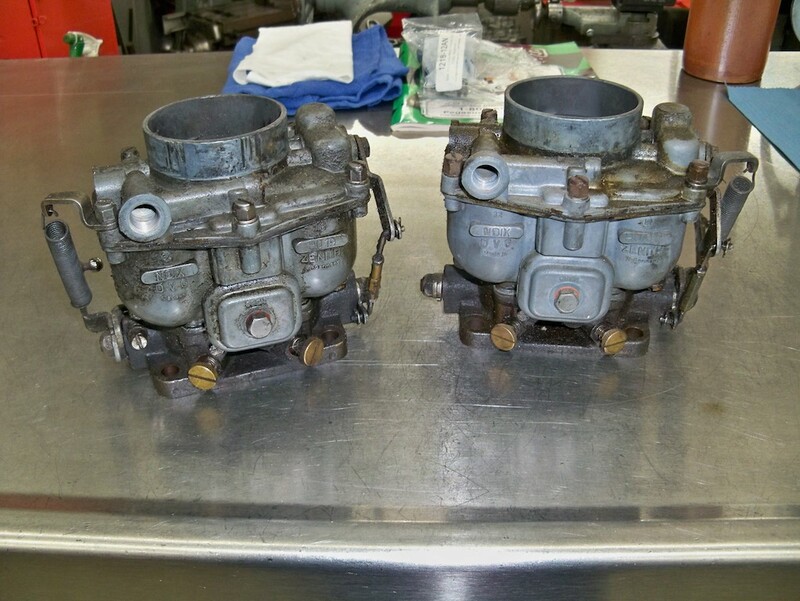 The carburetor rebuild is just about finished. 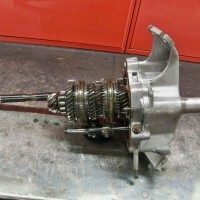 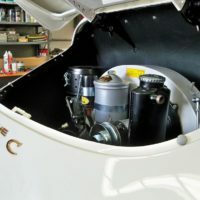 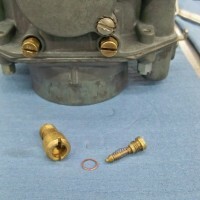 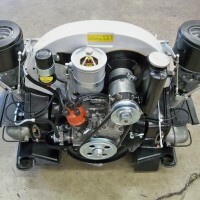 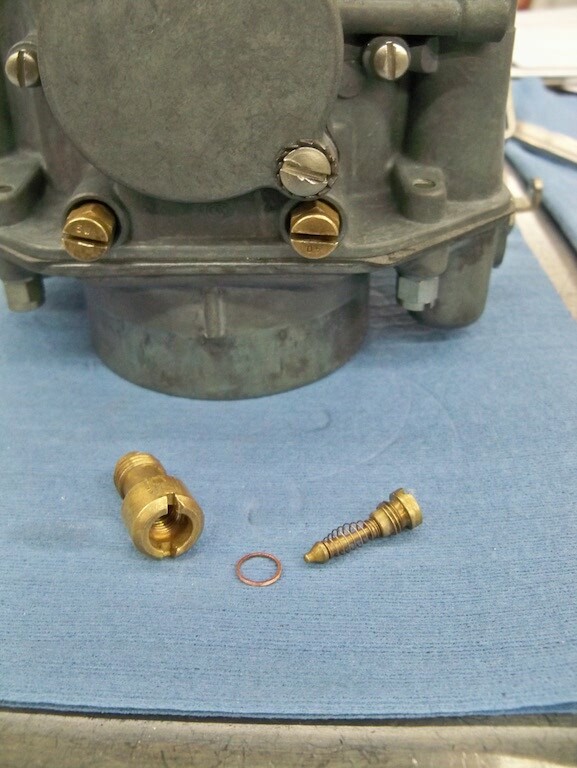 The fuel pump rebuild is finished and the pump has been reinstalled. 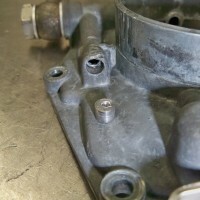 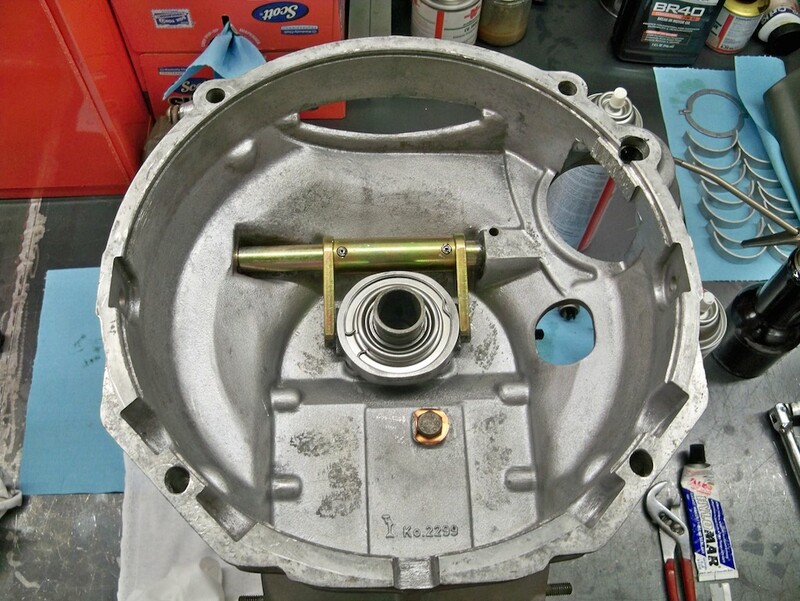 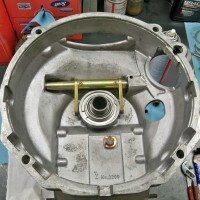 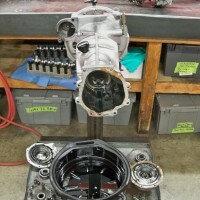 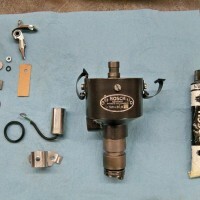 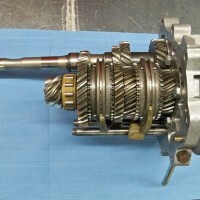 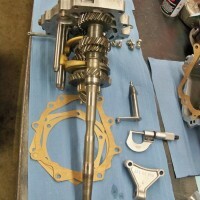 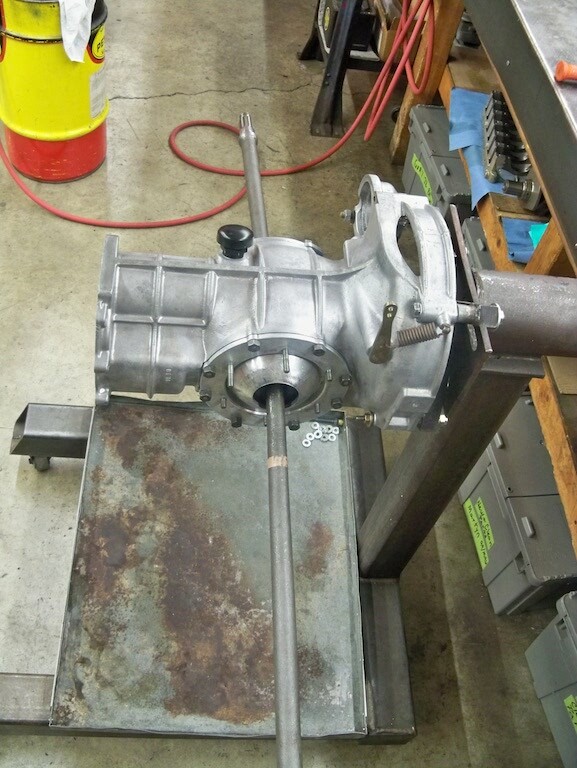 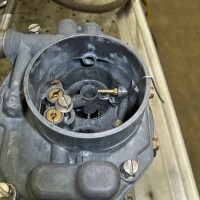 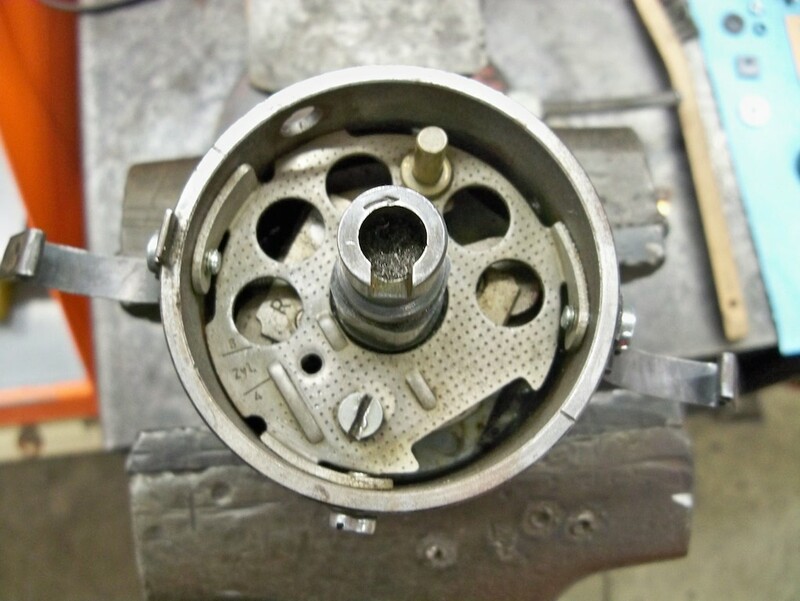 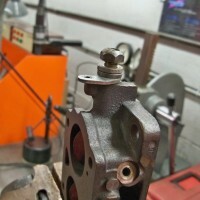 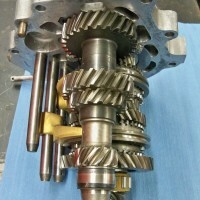 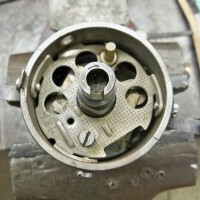 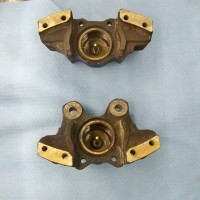 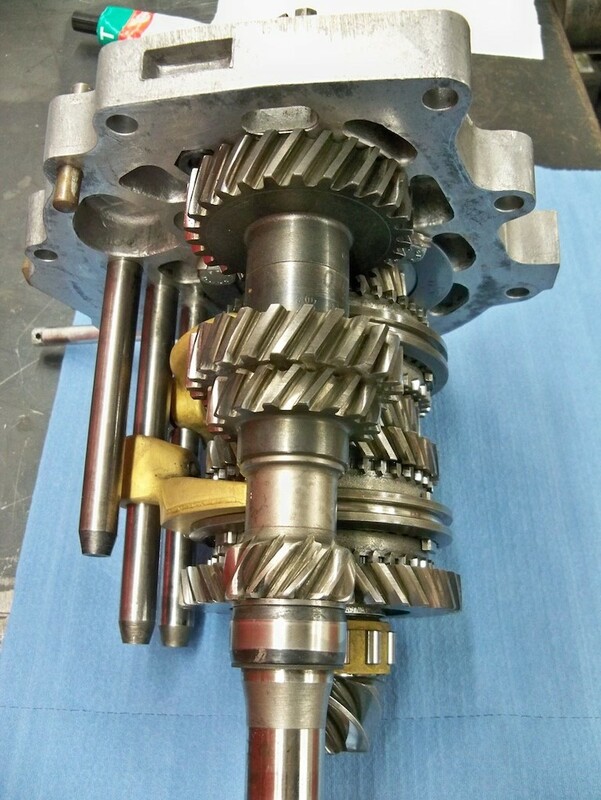 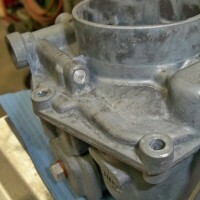 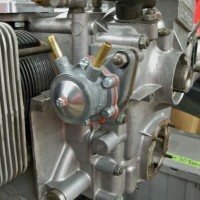 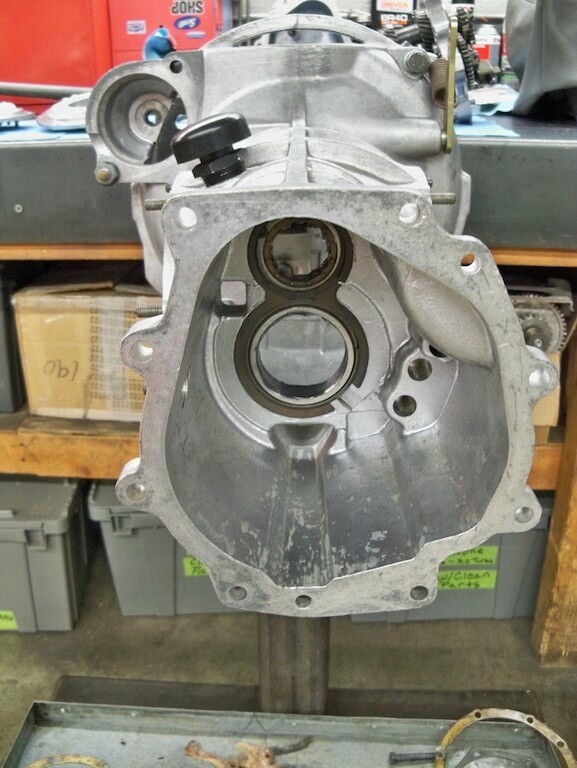 Oil pump reinstalled after rebuild. 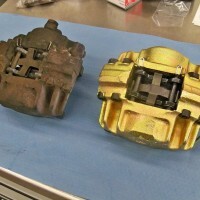 Brake caliper replateing has begun. 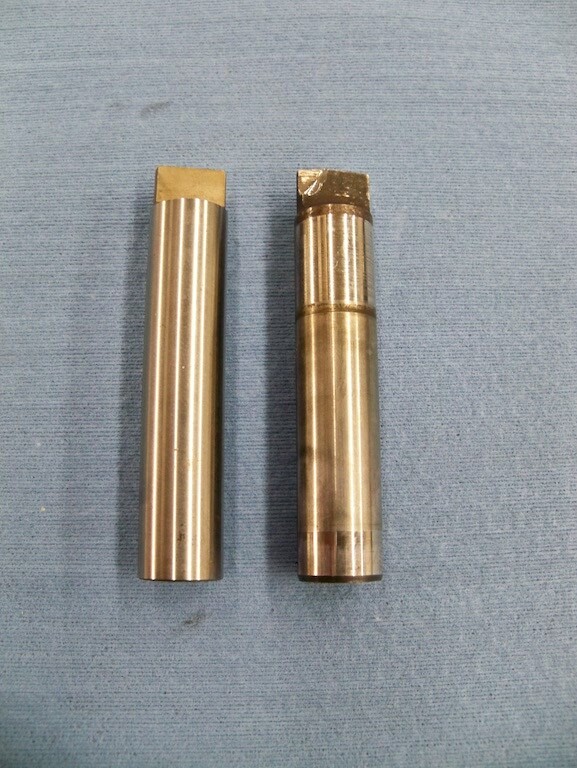 A side by side of the original next to the replated finished product. 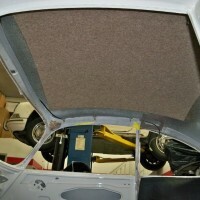 Specialty Cars newly developed sound deadening installed. 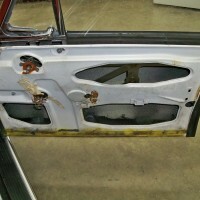 Interior quarter window trim recovered. 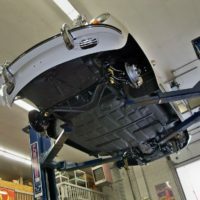 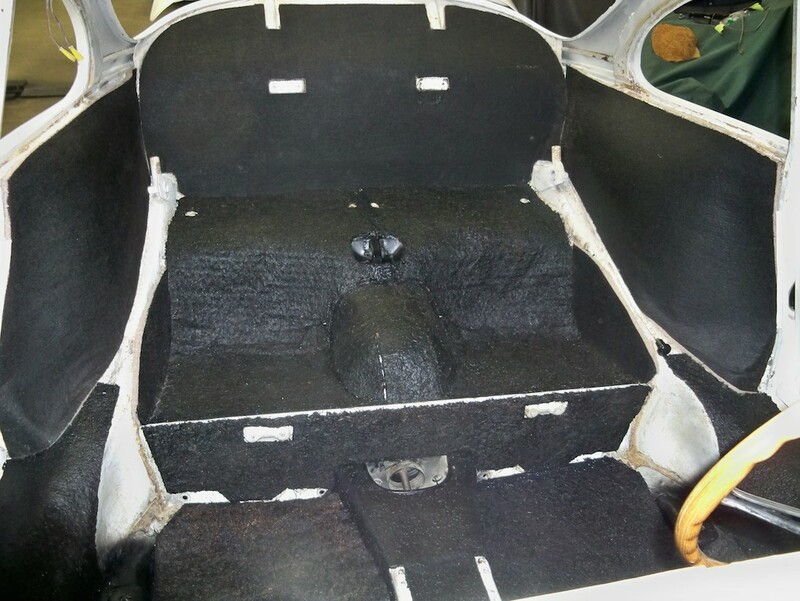 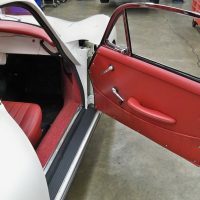 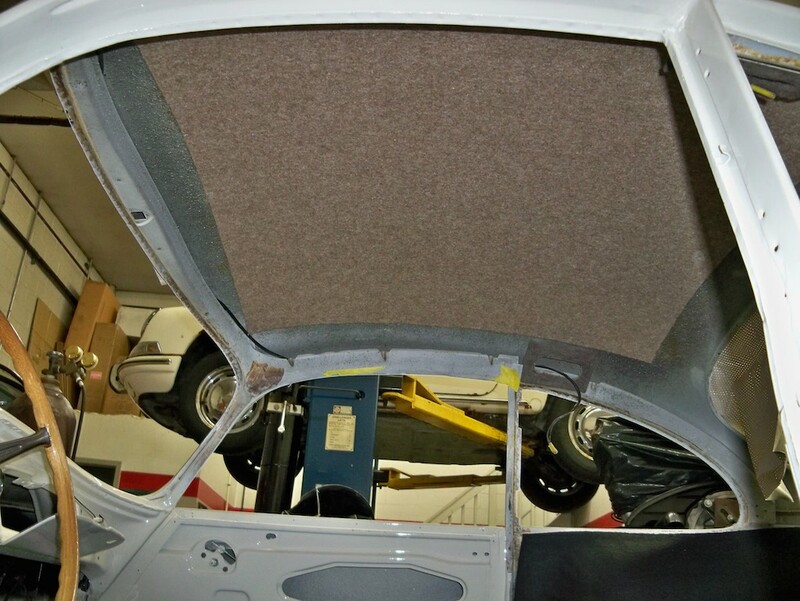 Below are some great side by side photos of the original sound deadening next to Specialty Cars’ sound deadening; developed and produced in house. 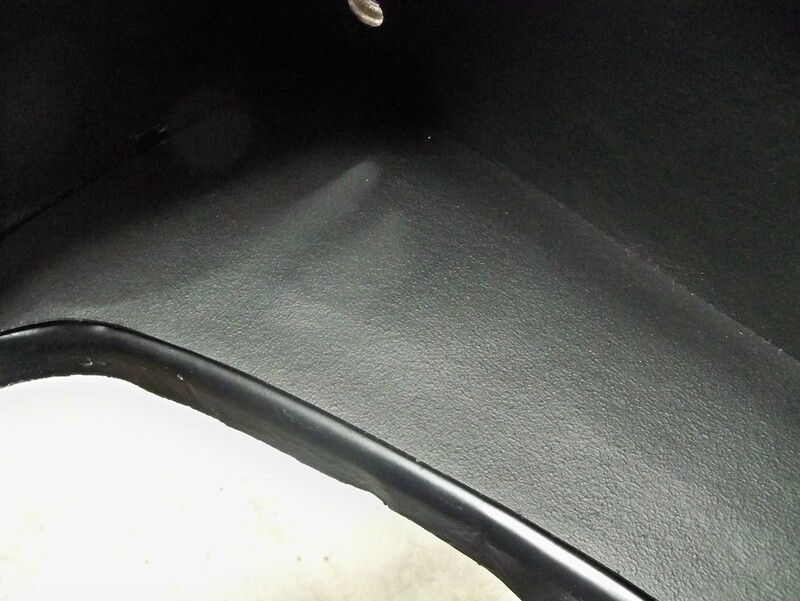 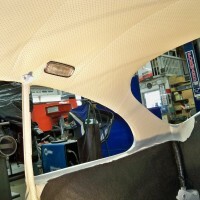 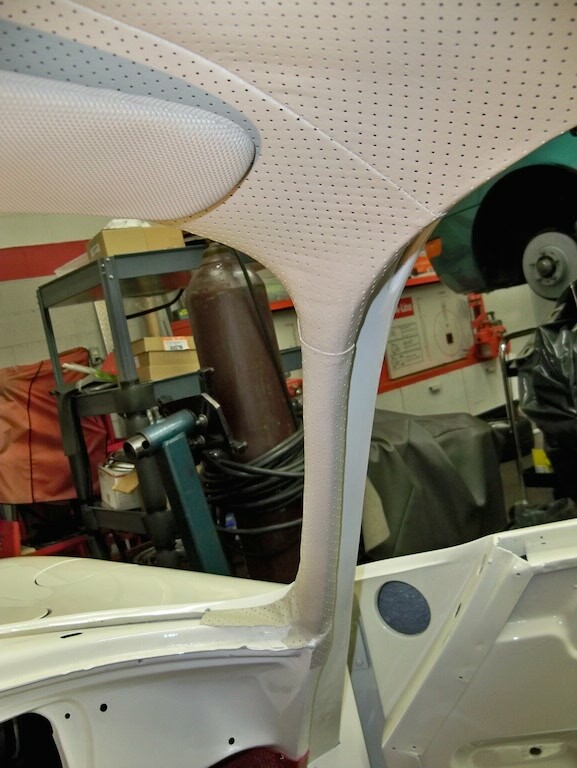 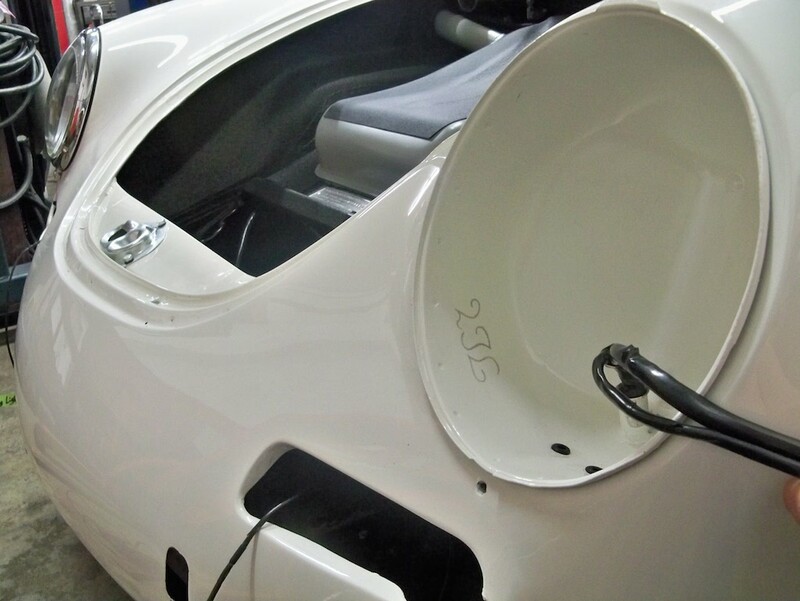 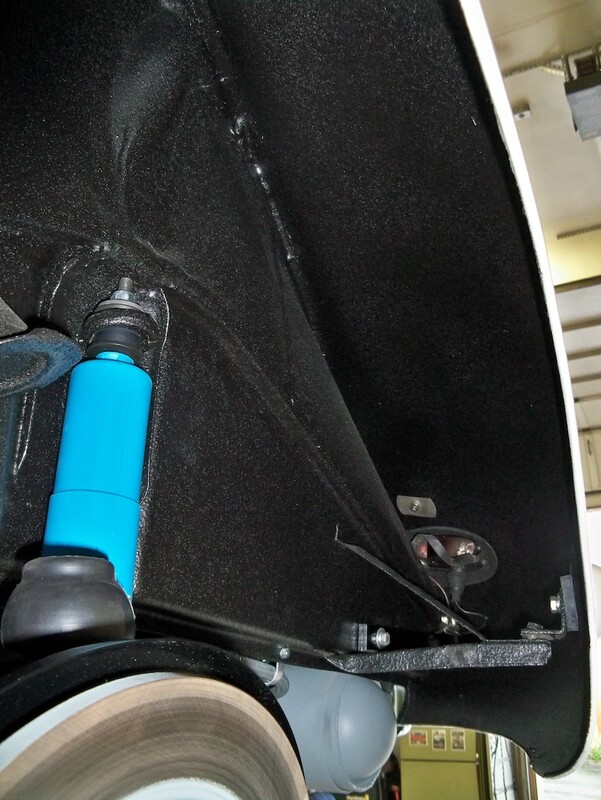 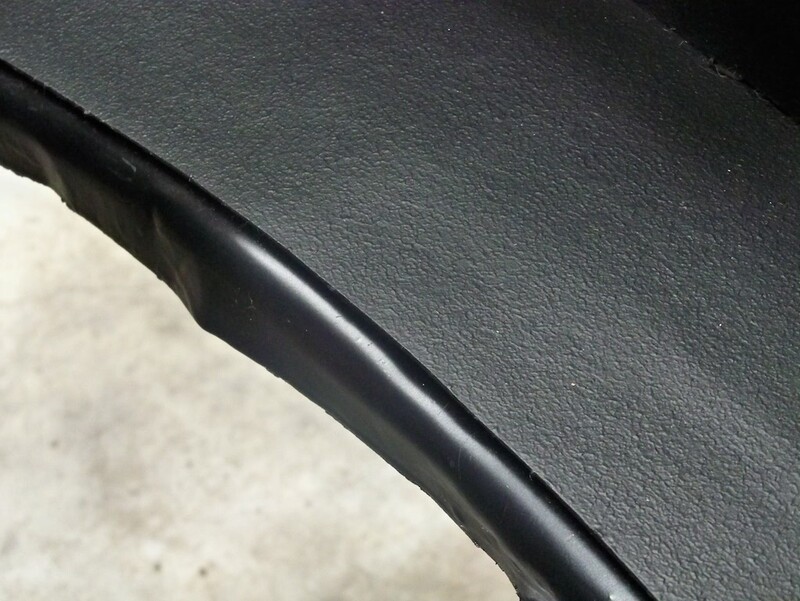 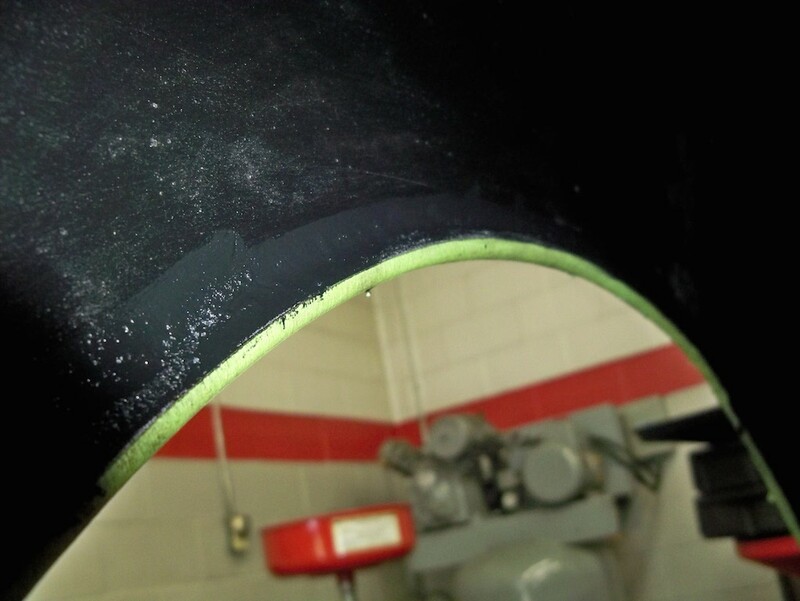 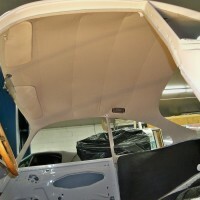 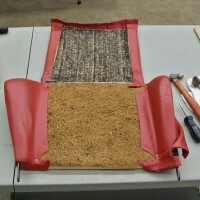 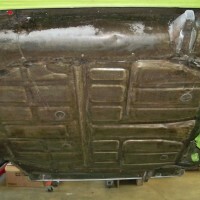 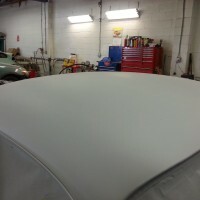 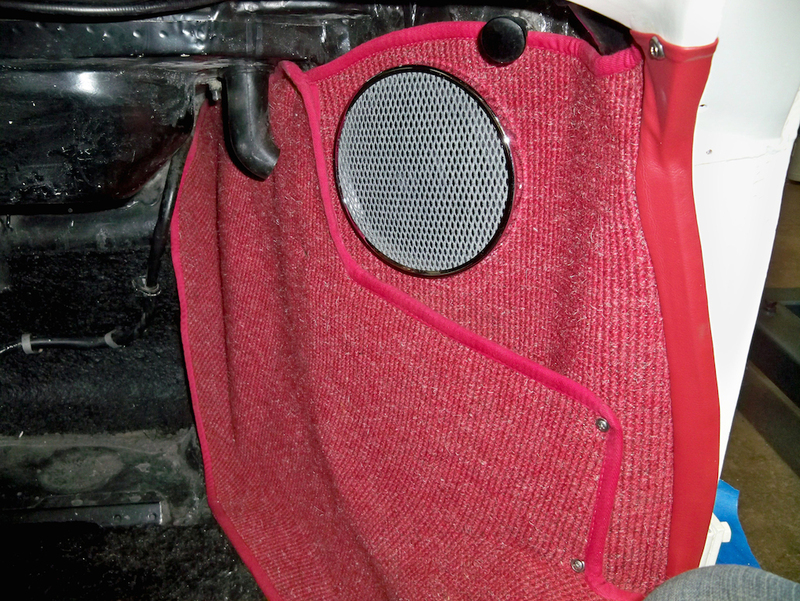 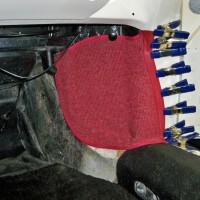 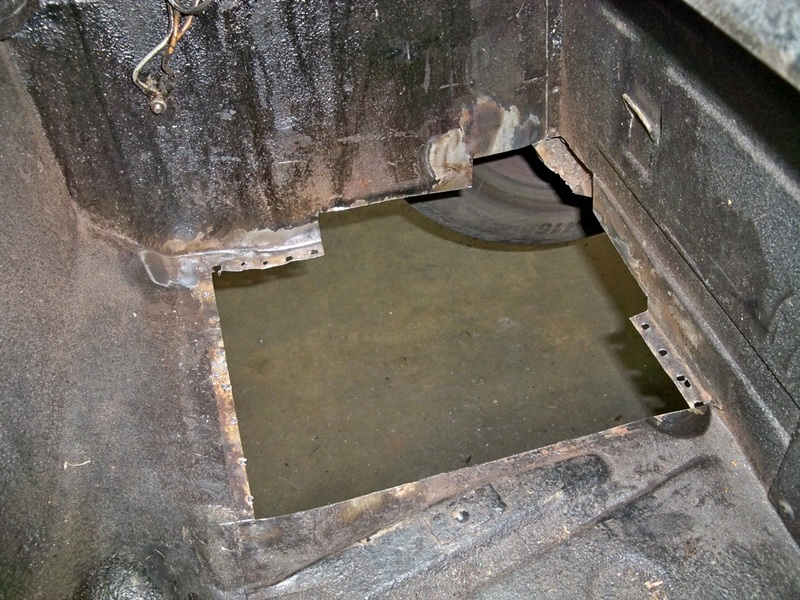 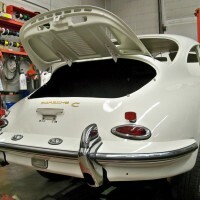 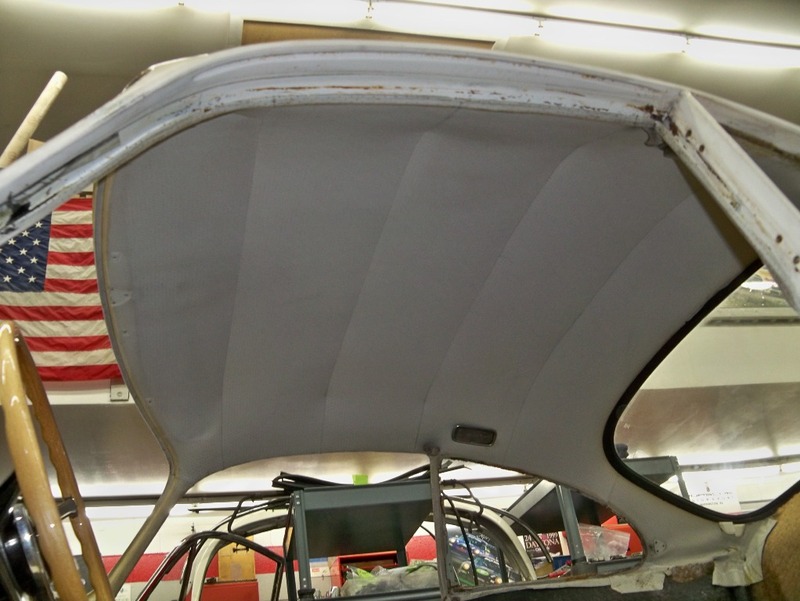 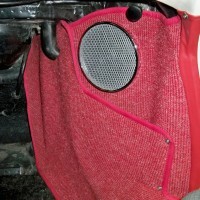 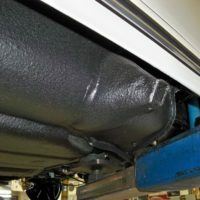 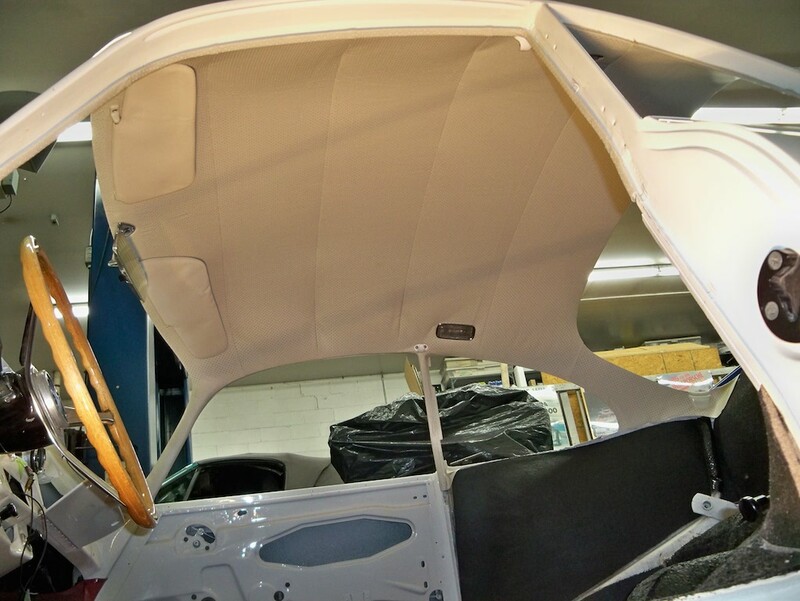 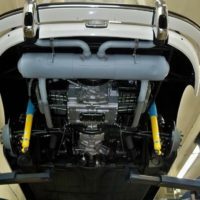 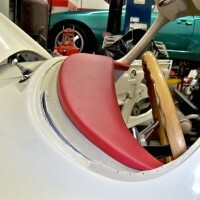 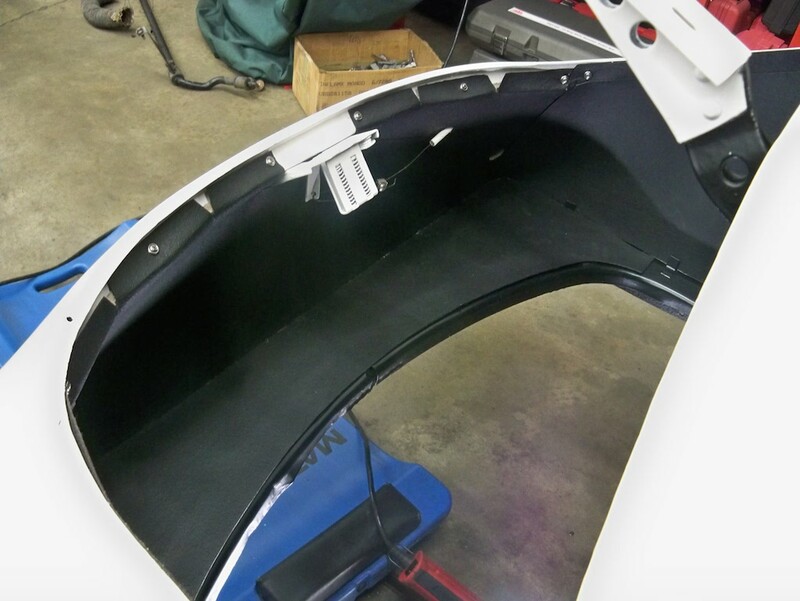 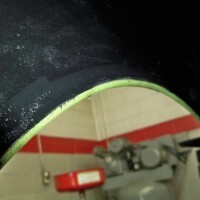 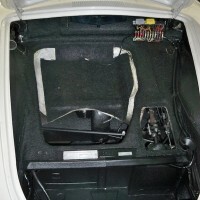 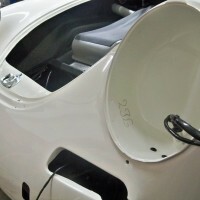 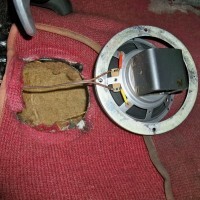 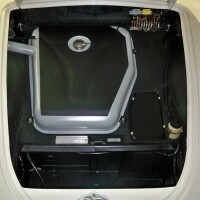 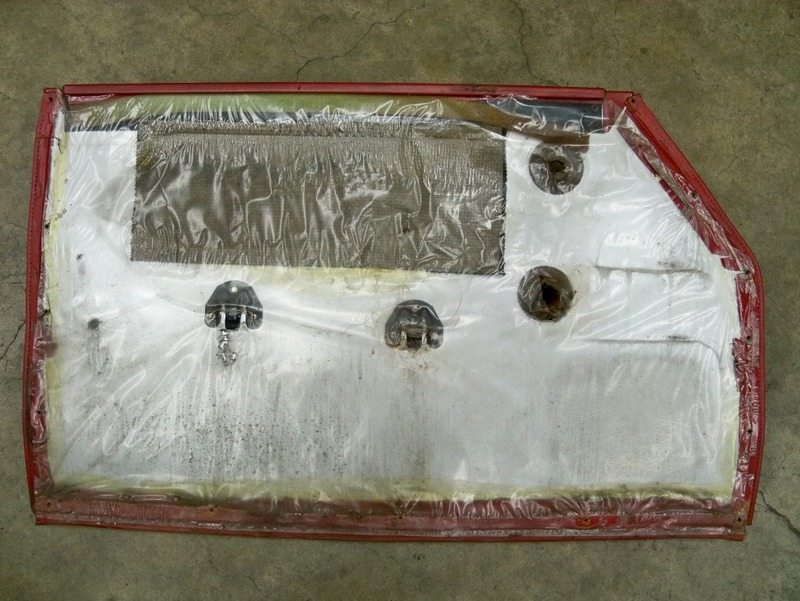 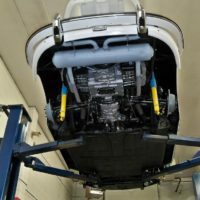 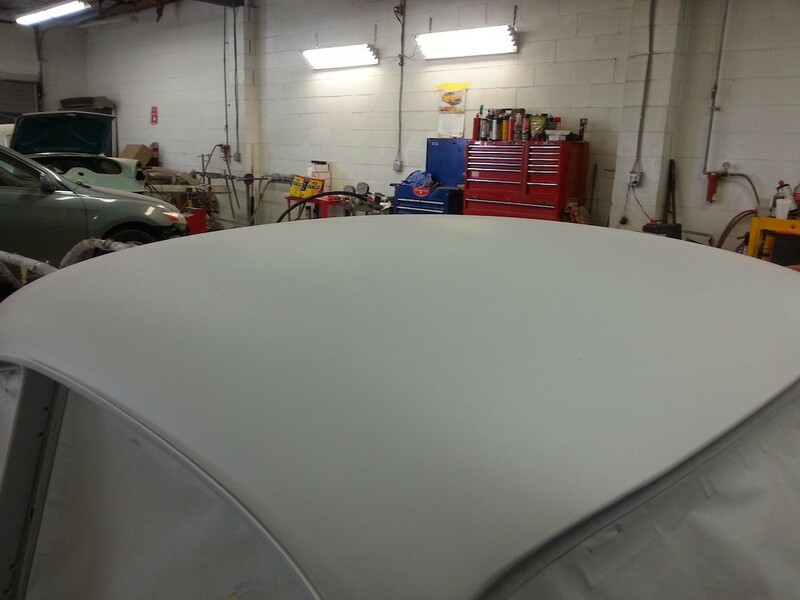 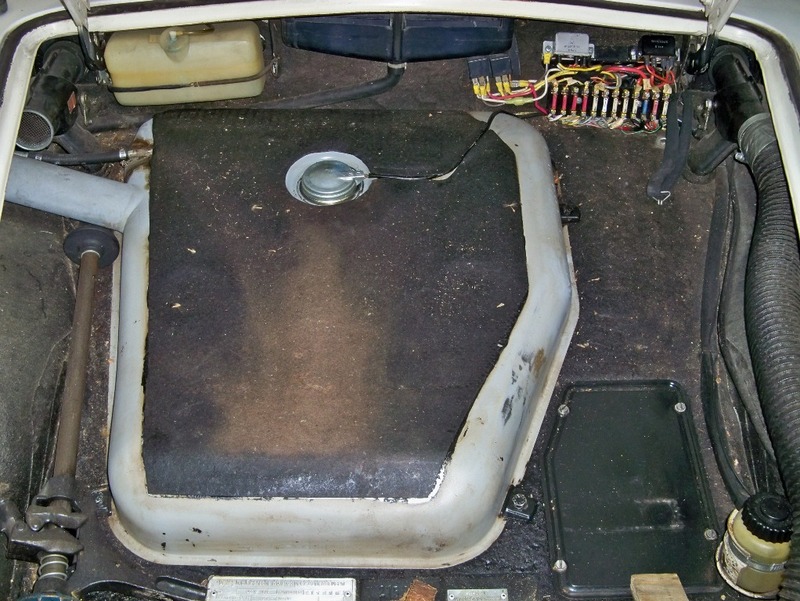 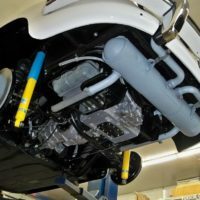 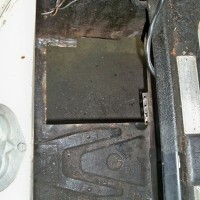 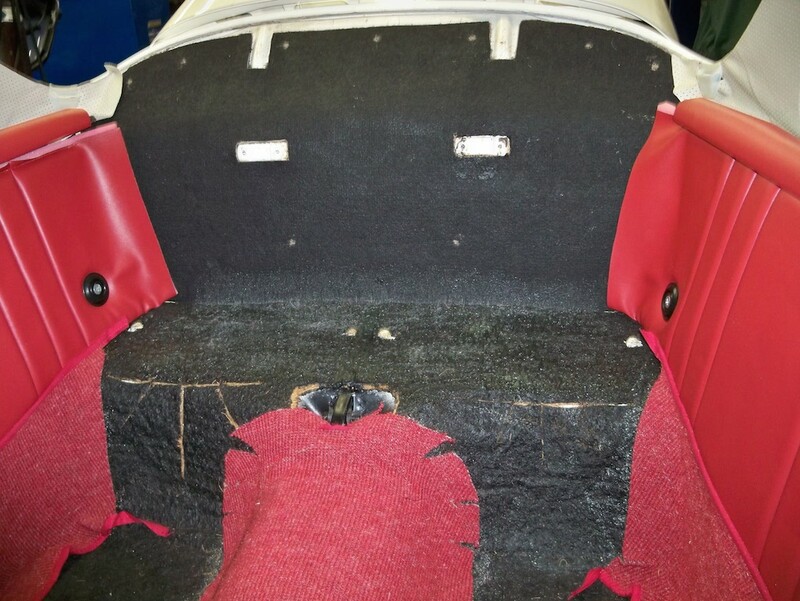 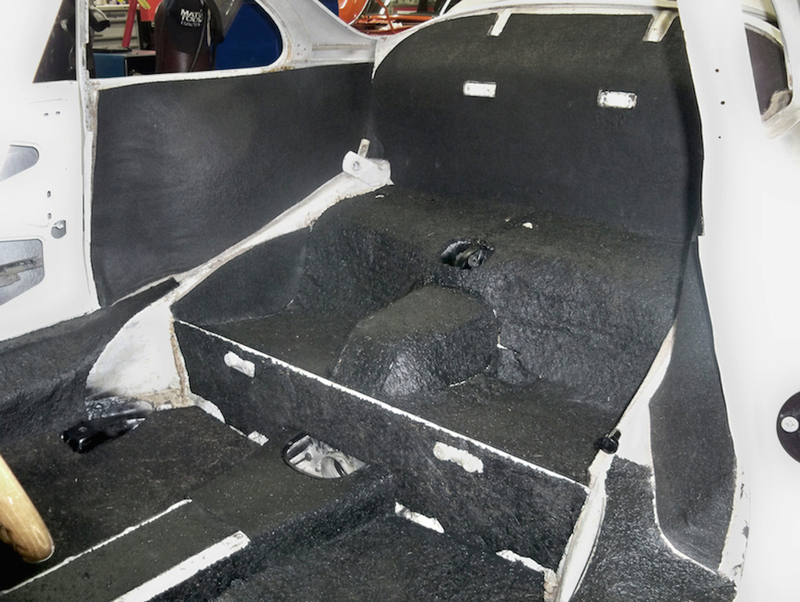 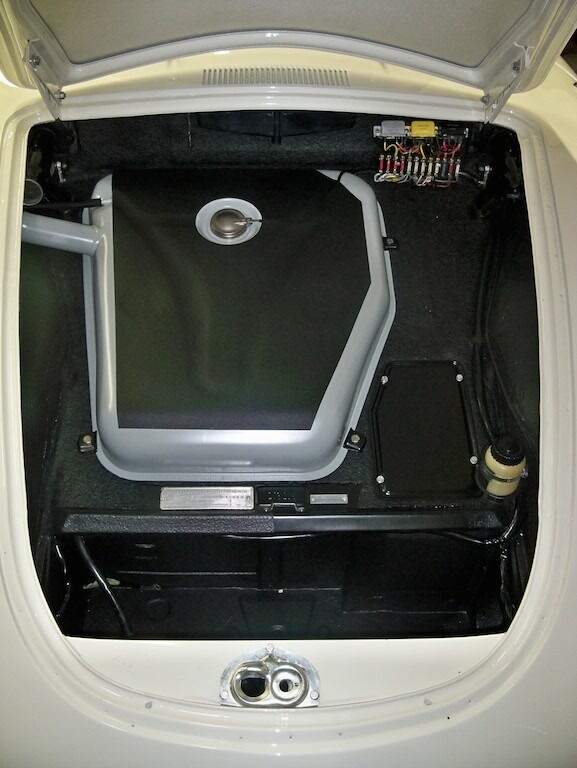 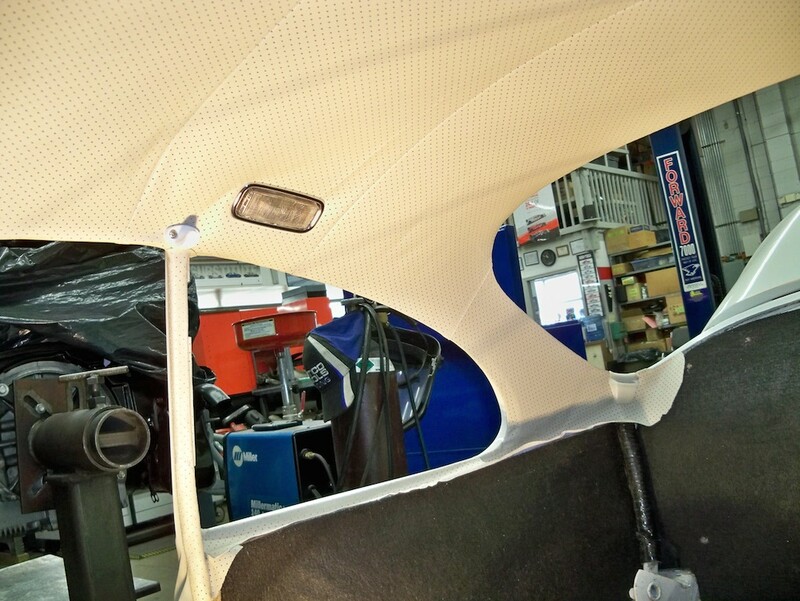 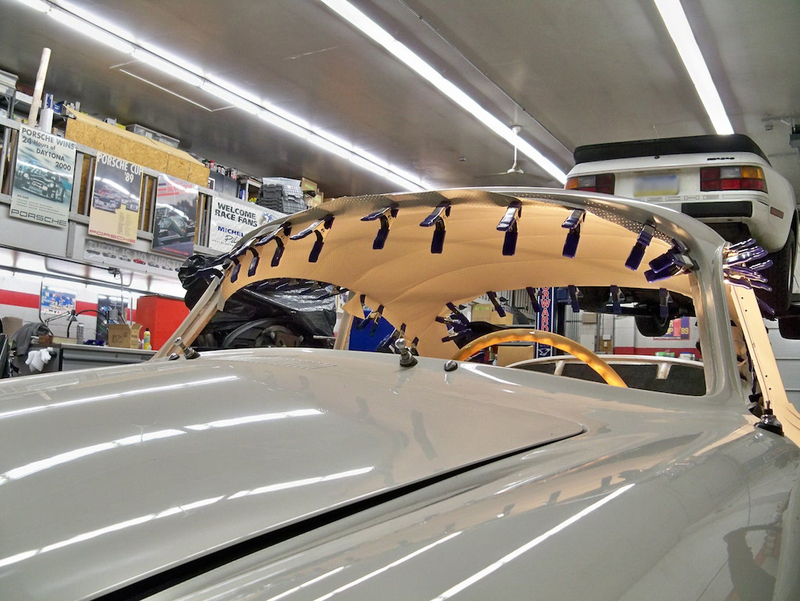 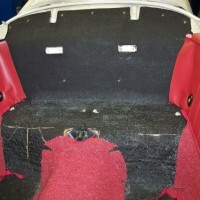 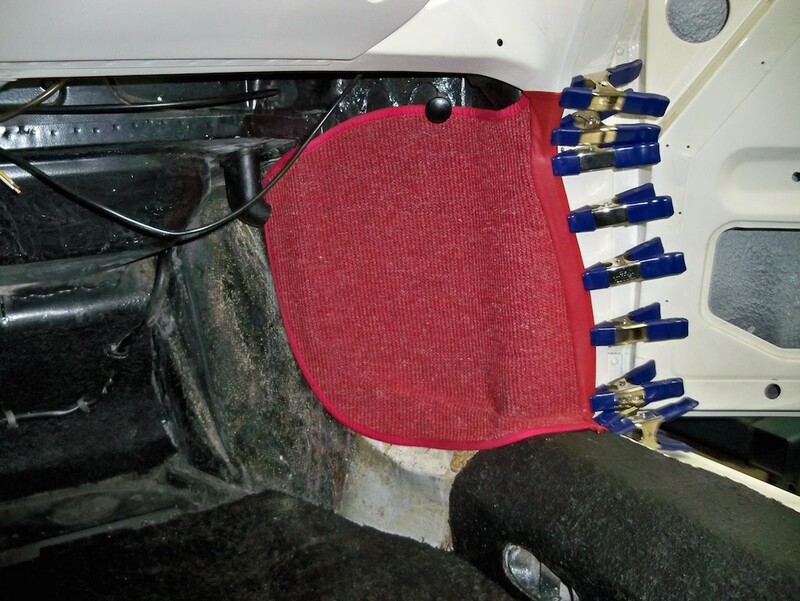 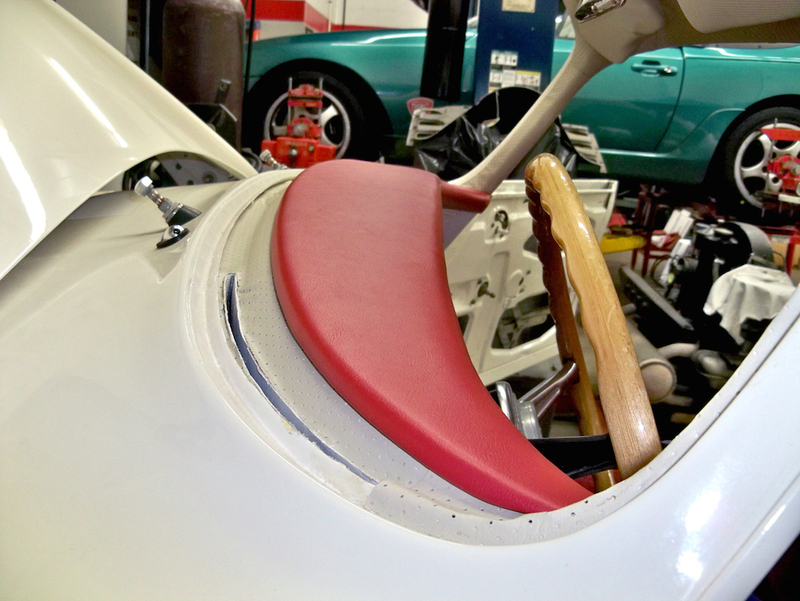 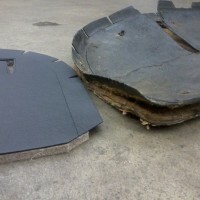 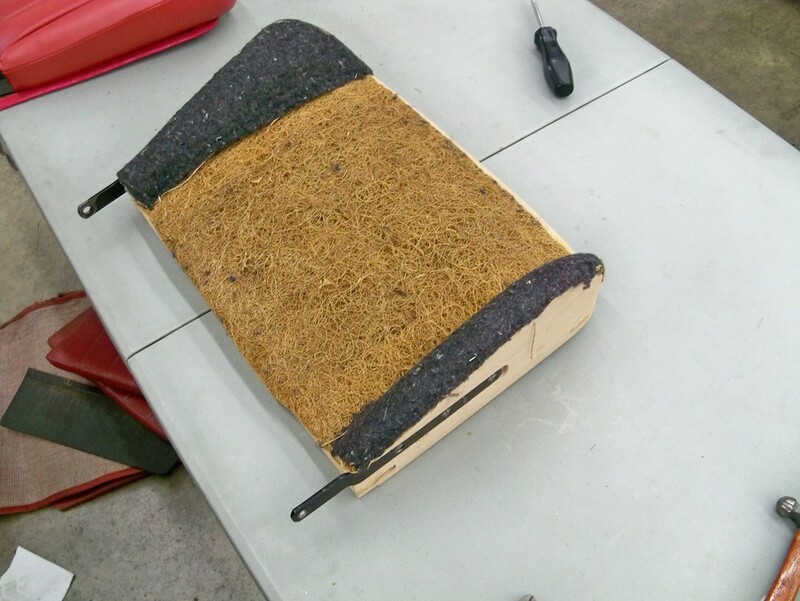 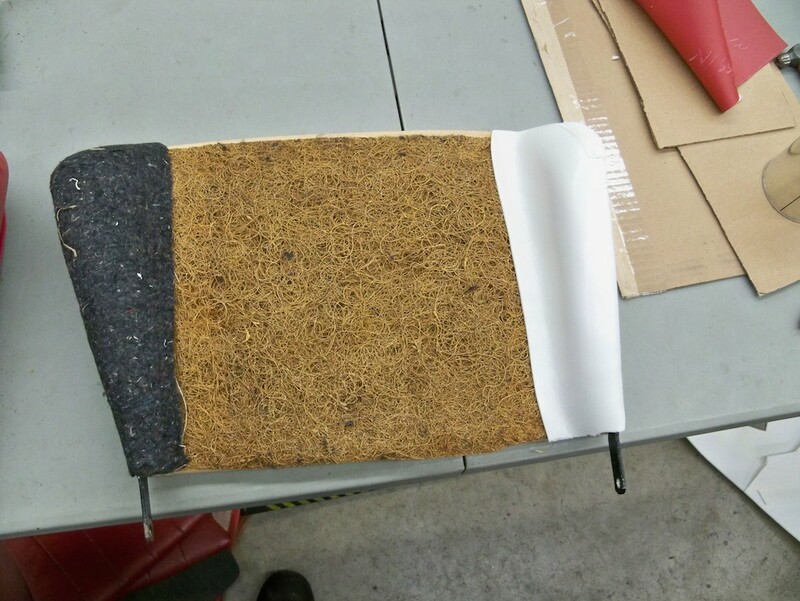 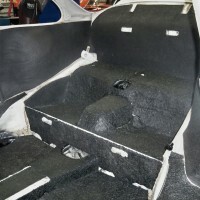 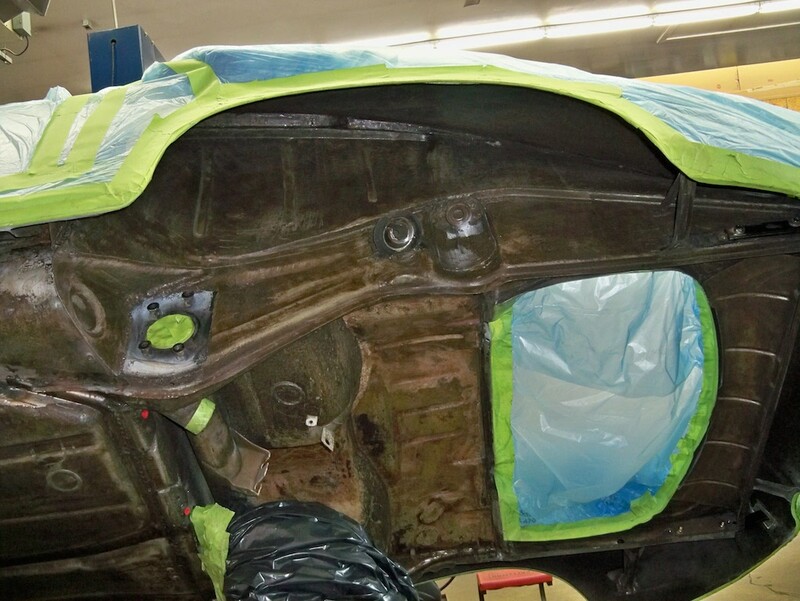 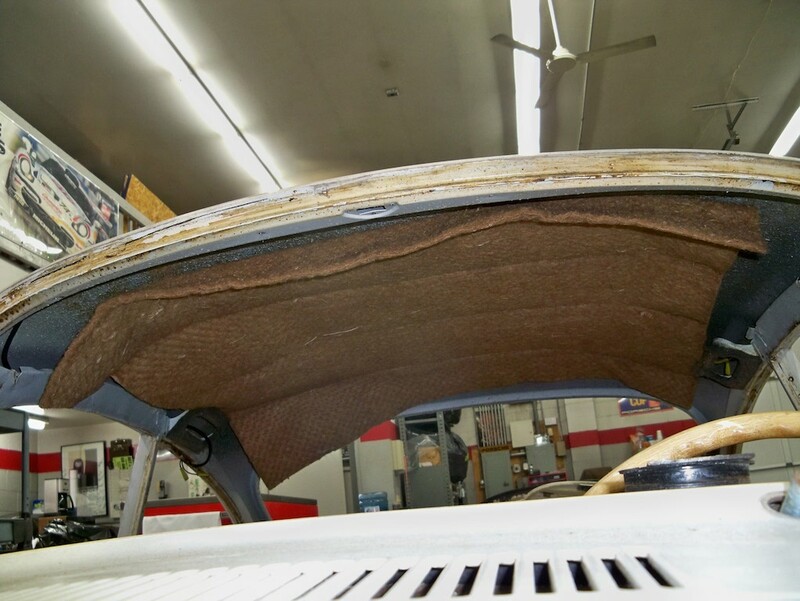 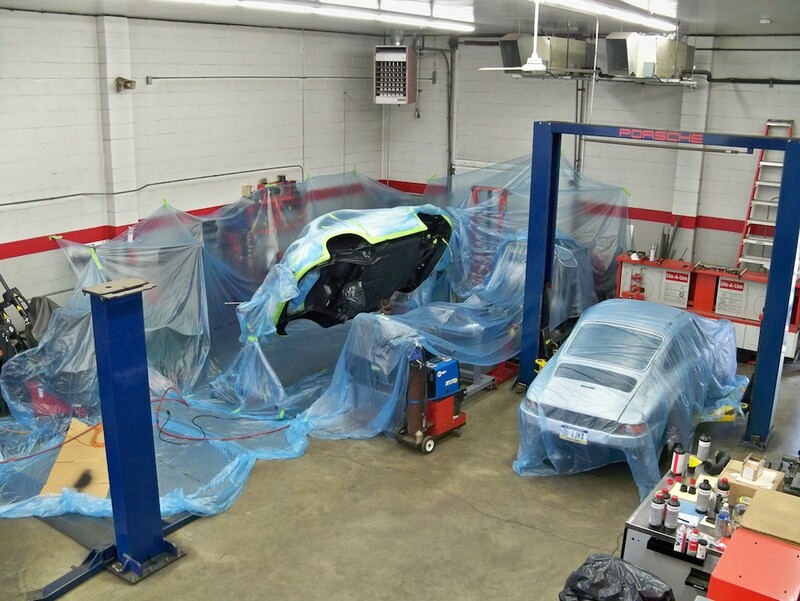 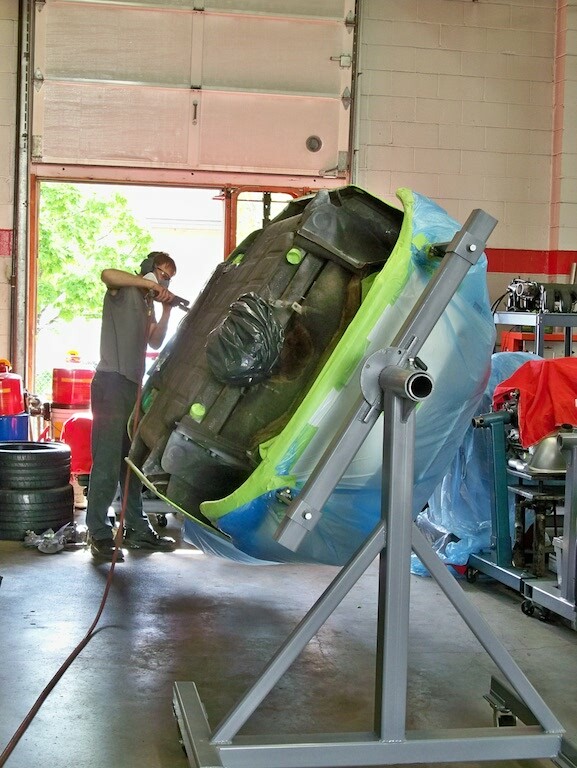 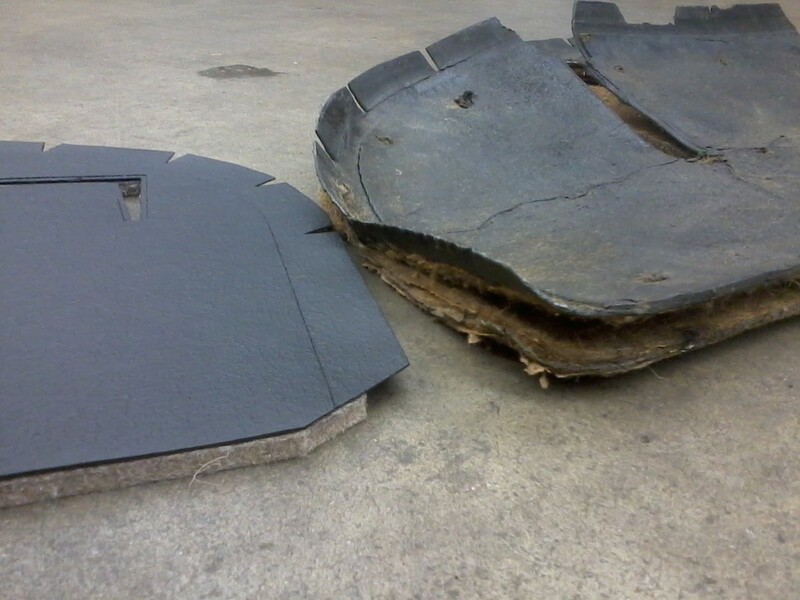 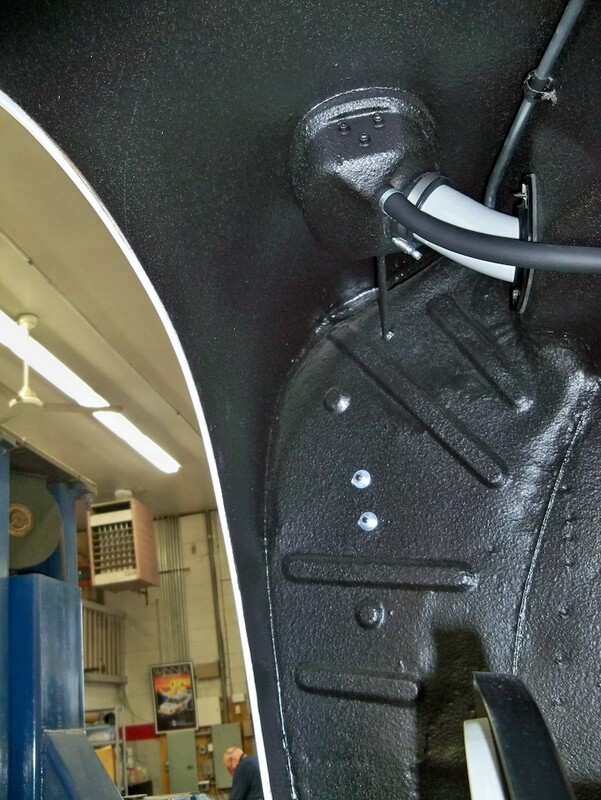 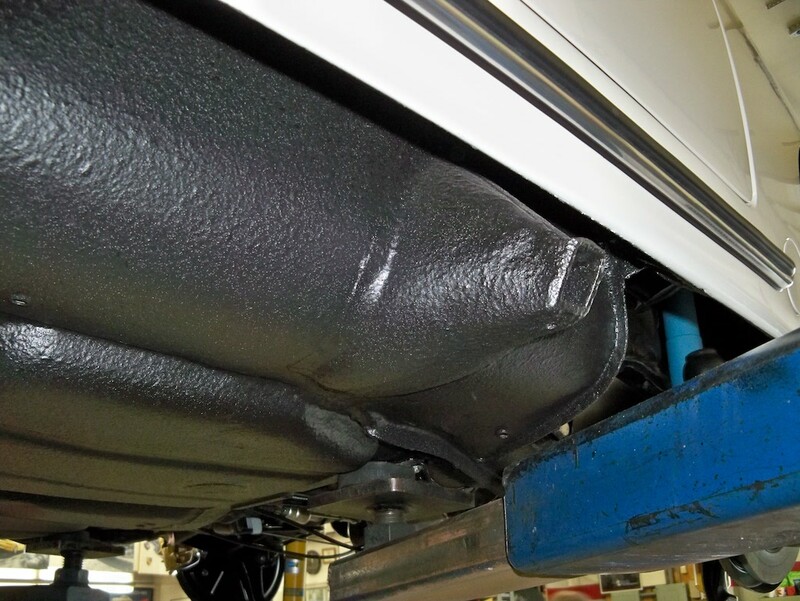 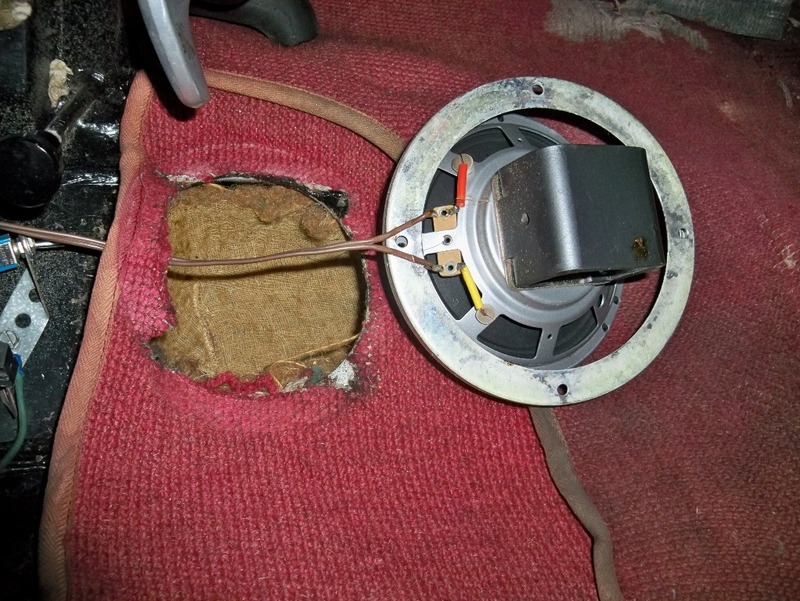 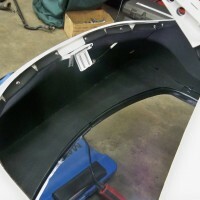 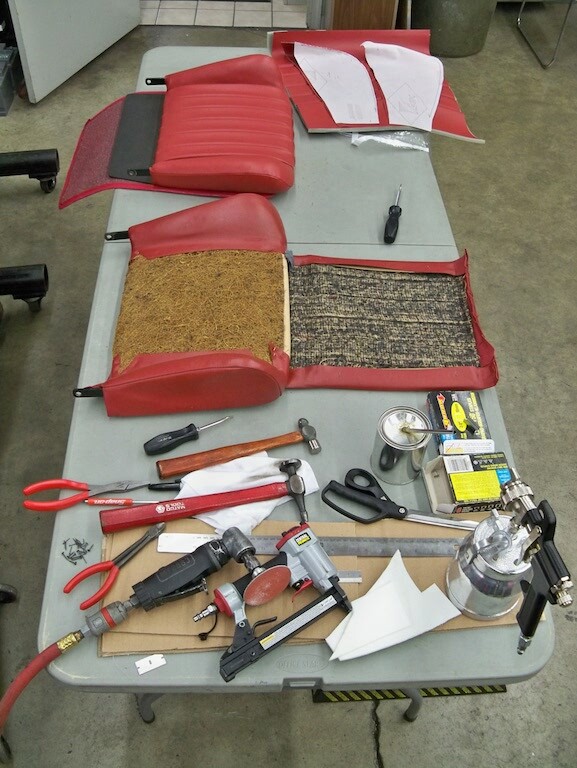 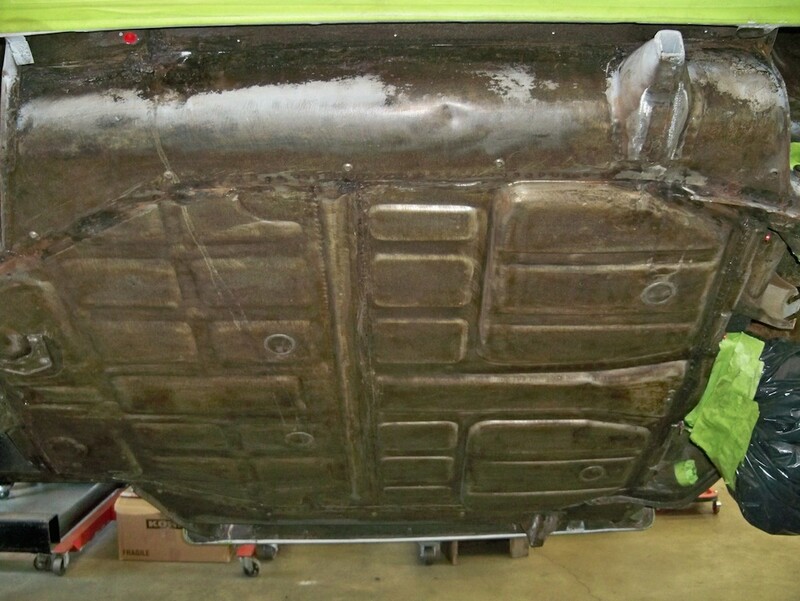 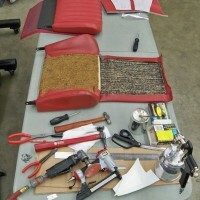 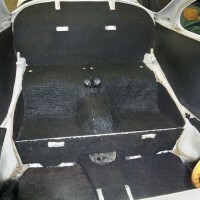 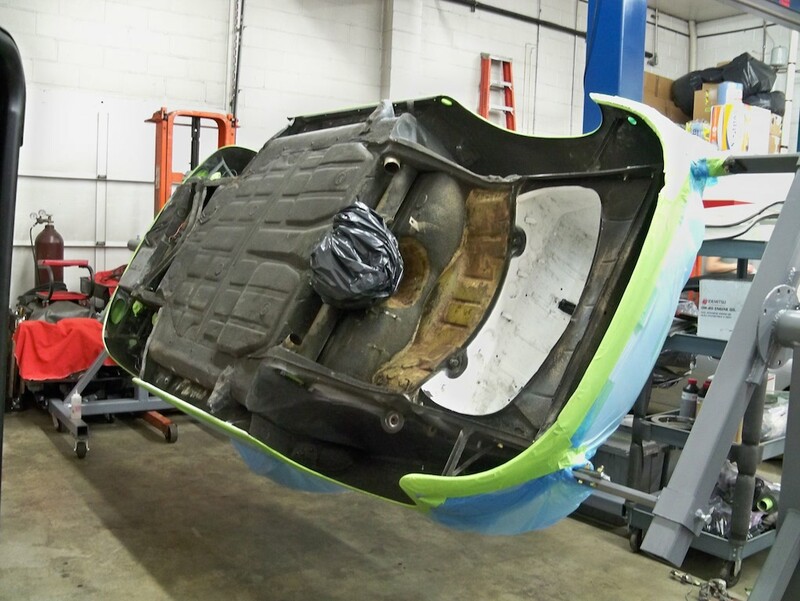 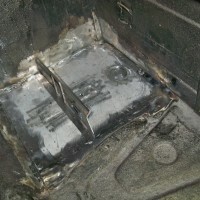 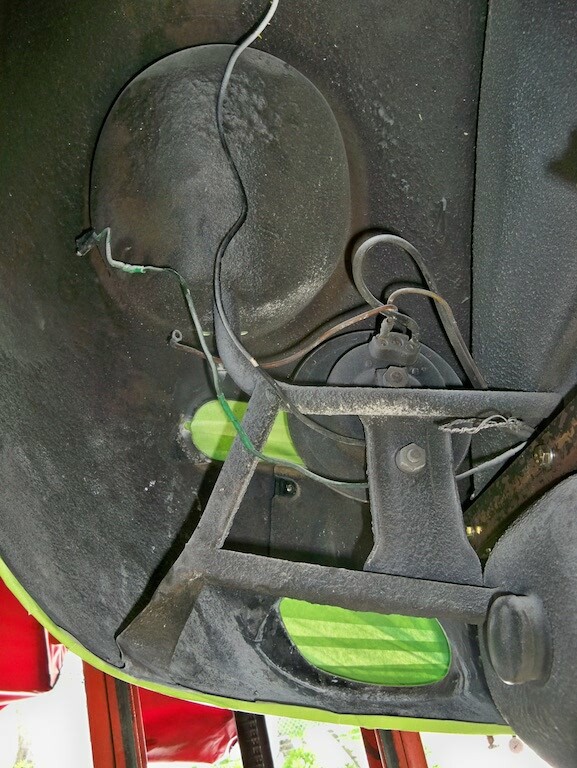 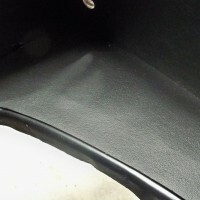 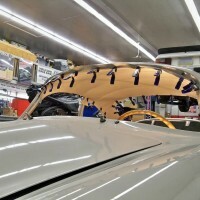 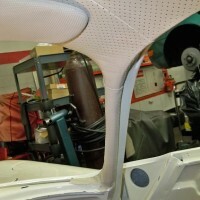 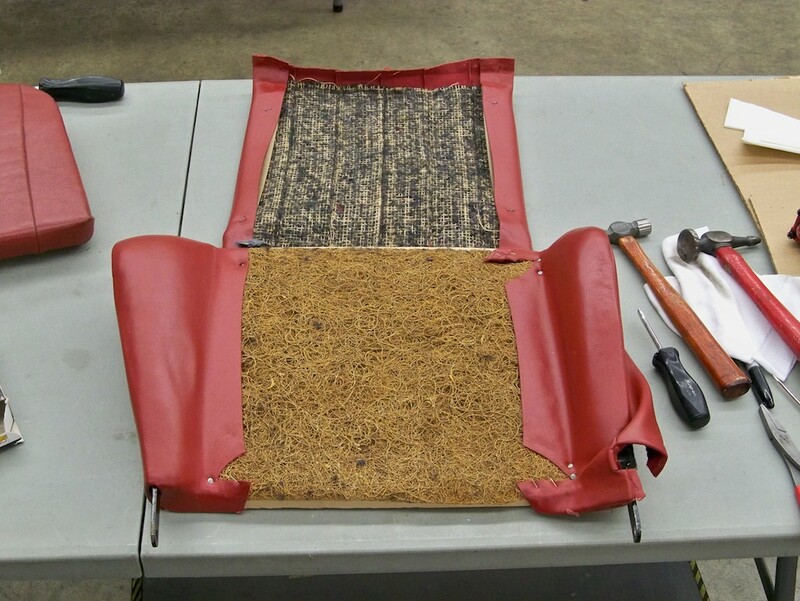 For more information on Specialty Cars sound deadening, please click here. 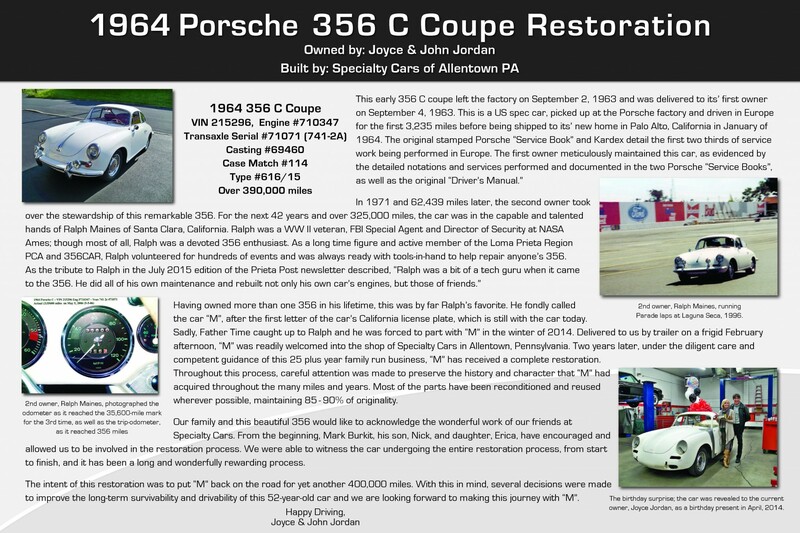 Poster displaying the unique history and detailed information about the car. 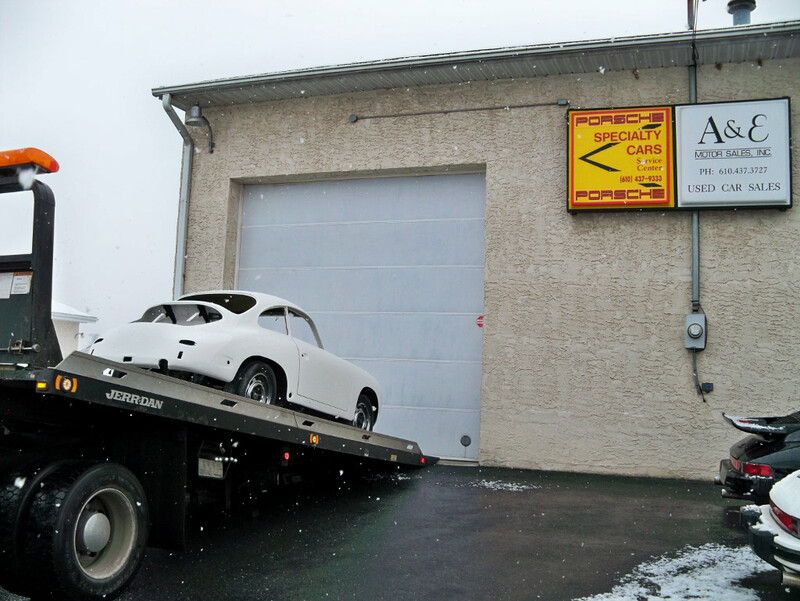 “M” has made it home.